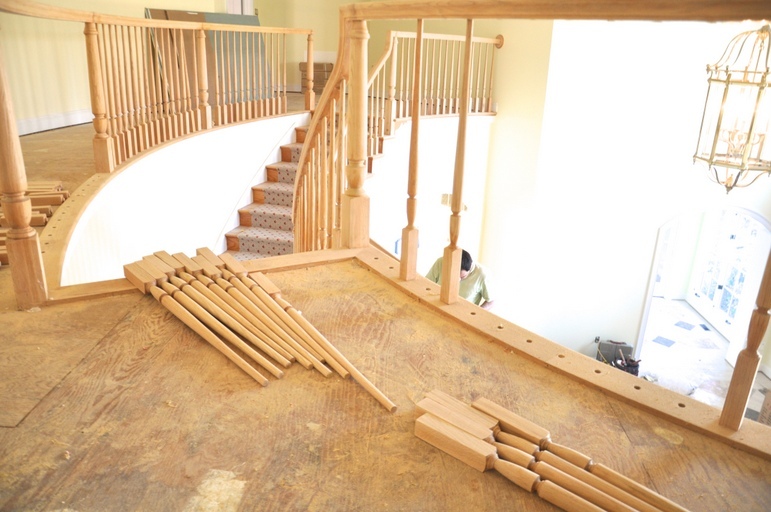 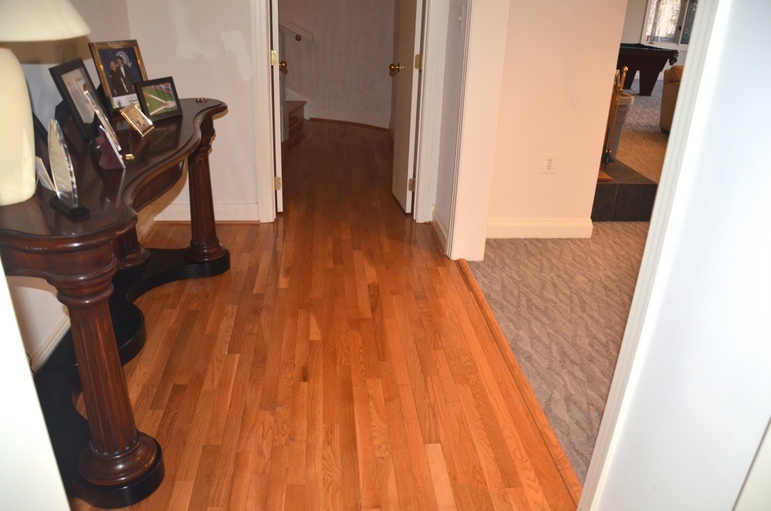 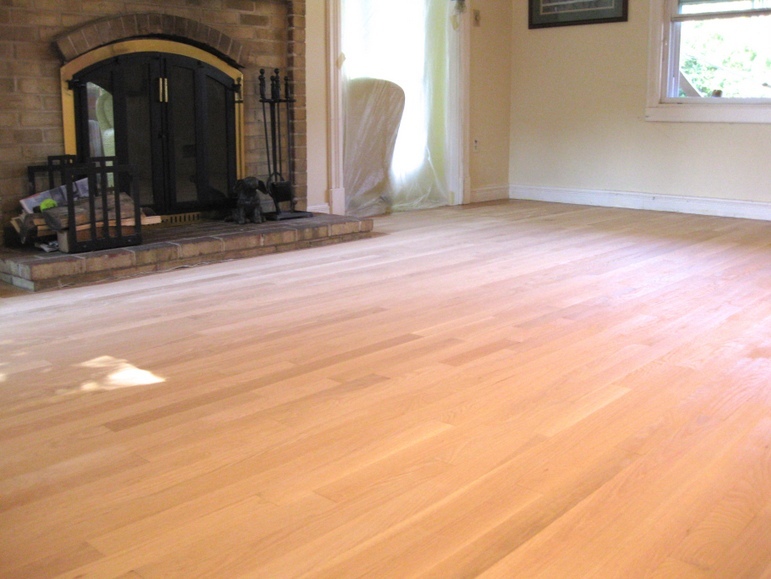 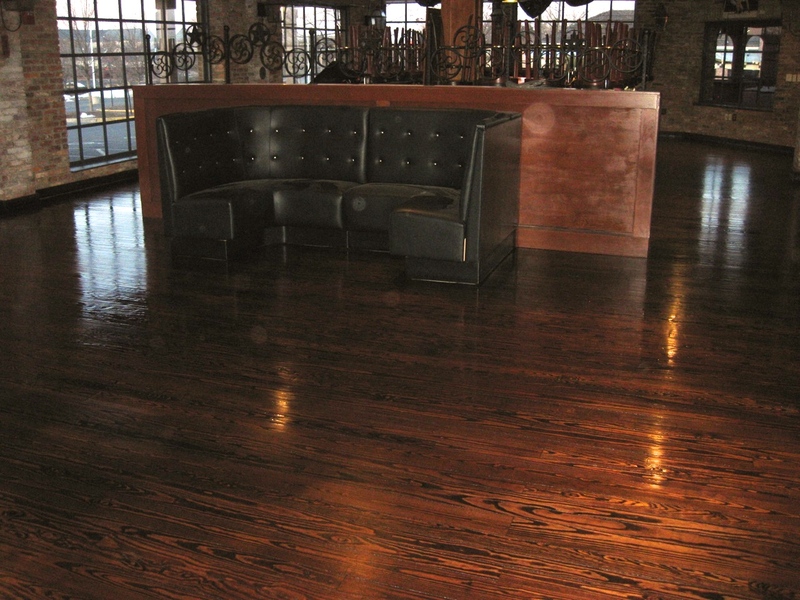 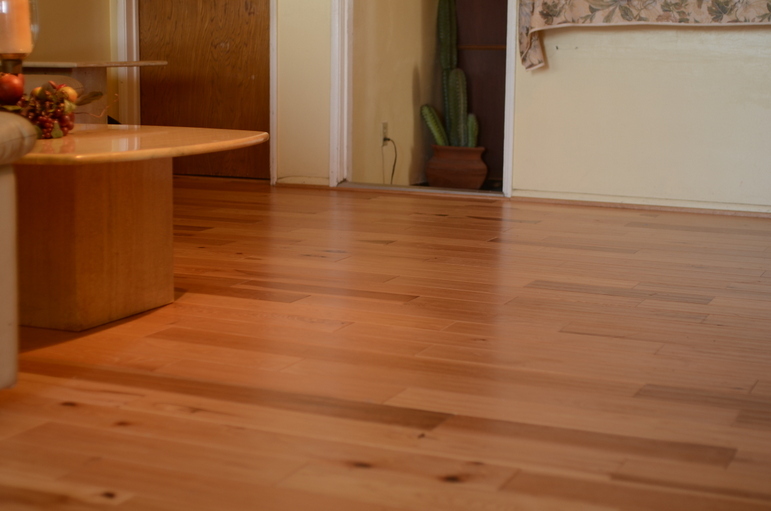 For decades, hardwood flooring has been synonymous with warmth, beauty, and value. 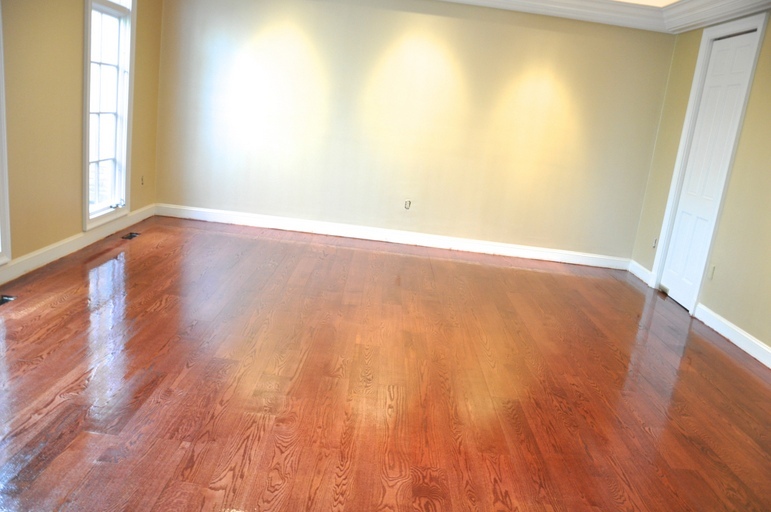 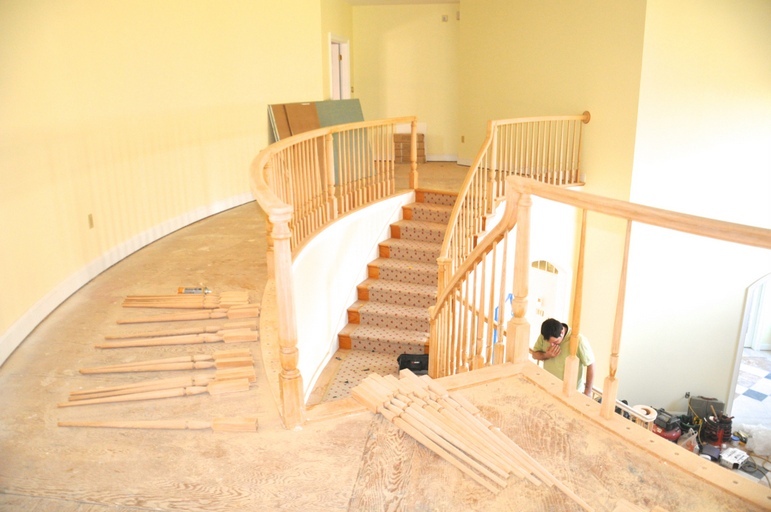 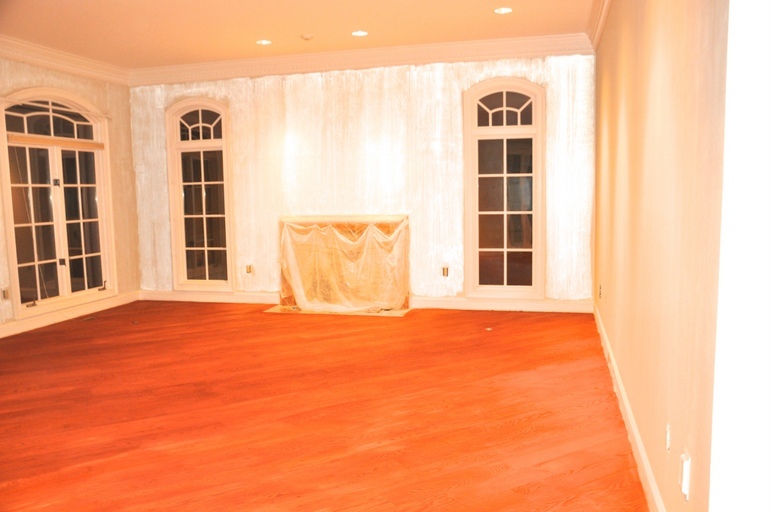 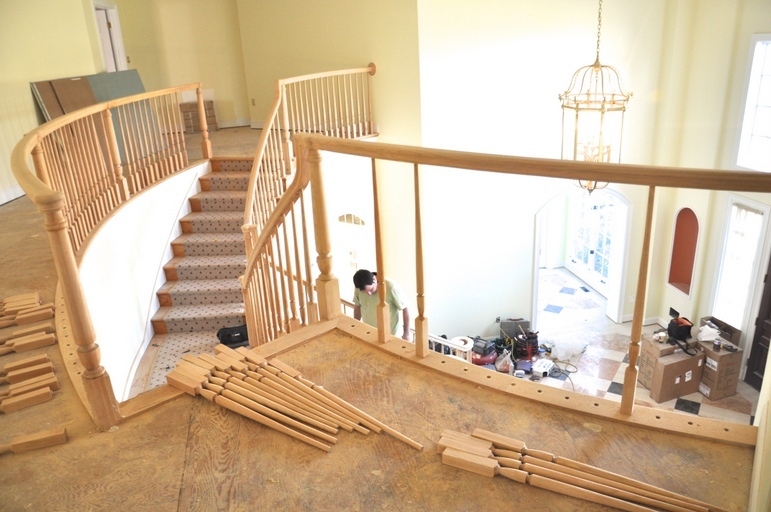 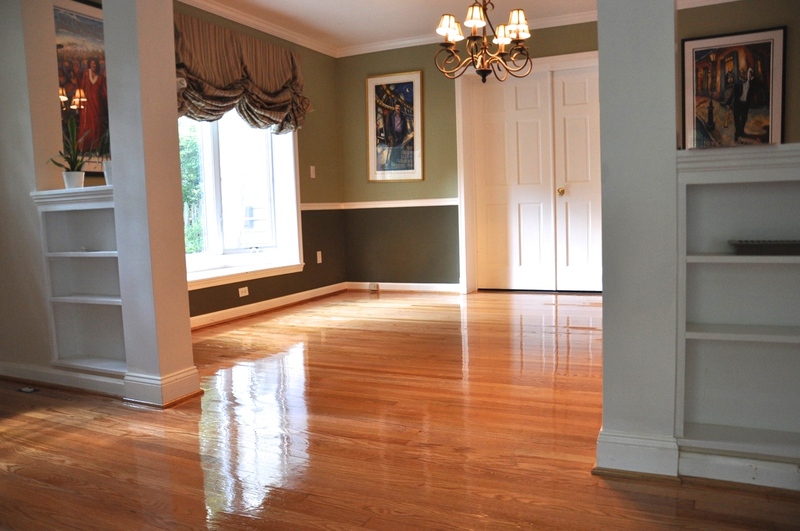 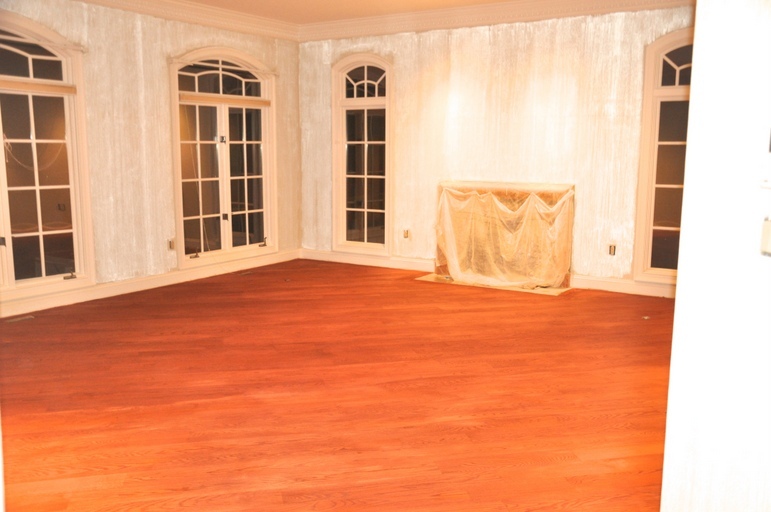 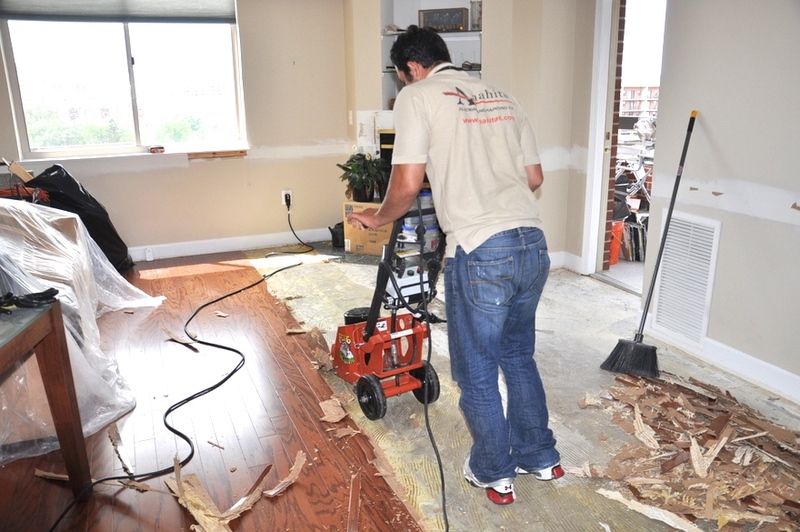 Installing hardwood flooring will enhance the décor of any room and provide an increase in value throughout the years. 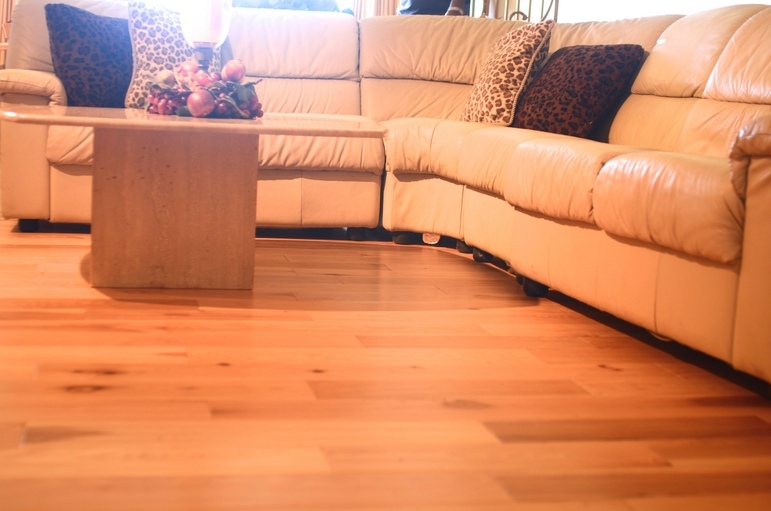 According to the National Association of Realtors (NAR), homes with hardwood flooring always sell at higher prices than homes without hardwood flooring. 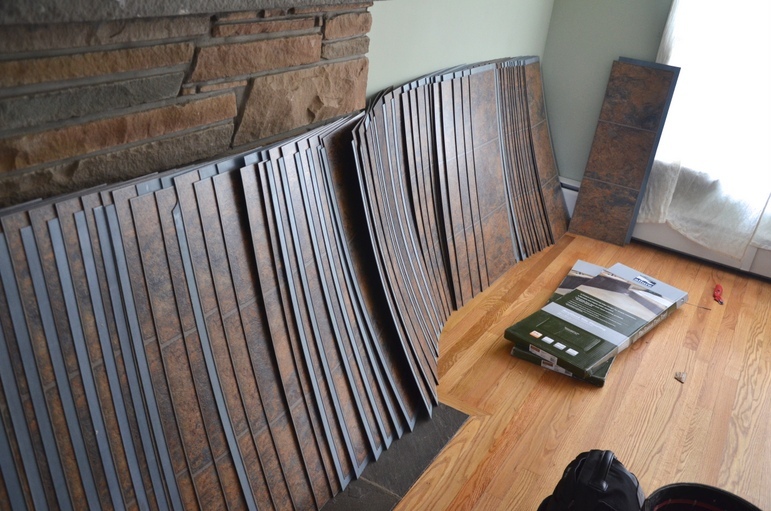 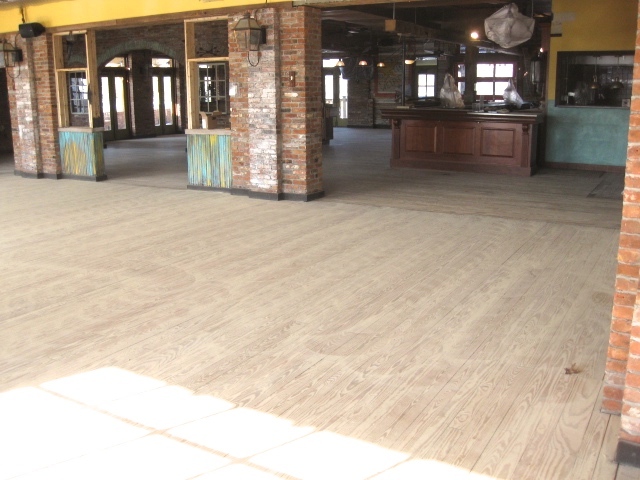 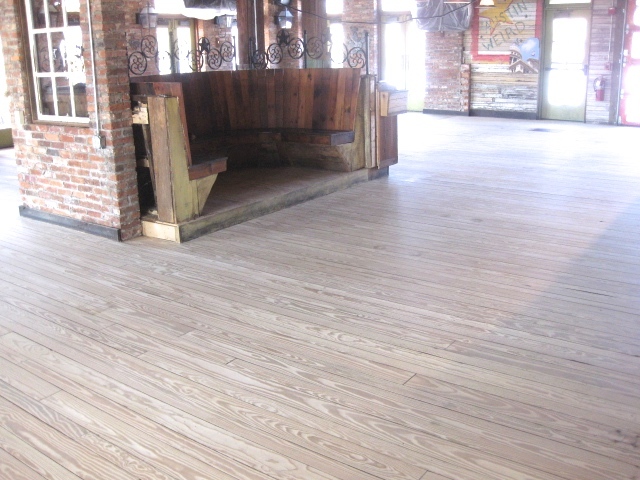 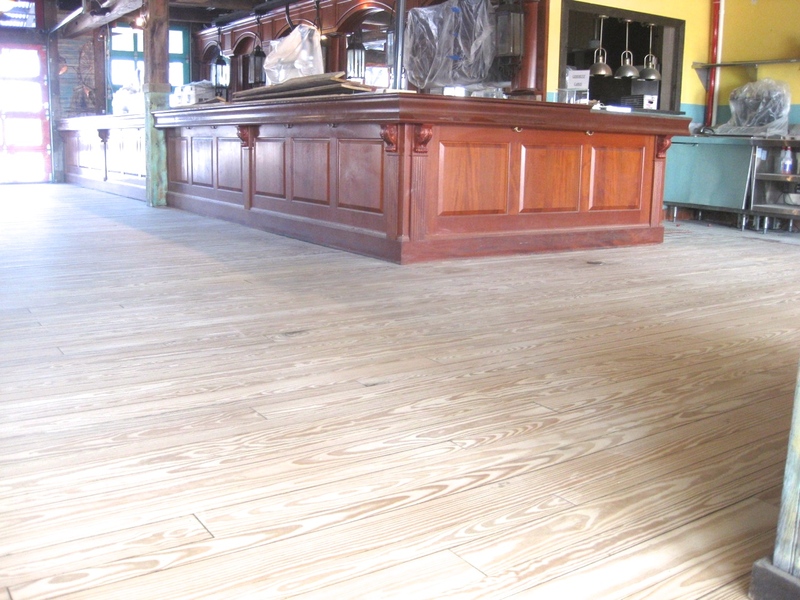 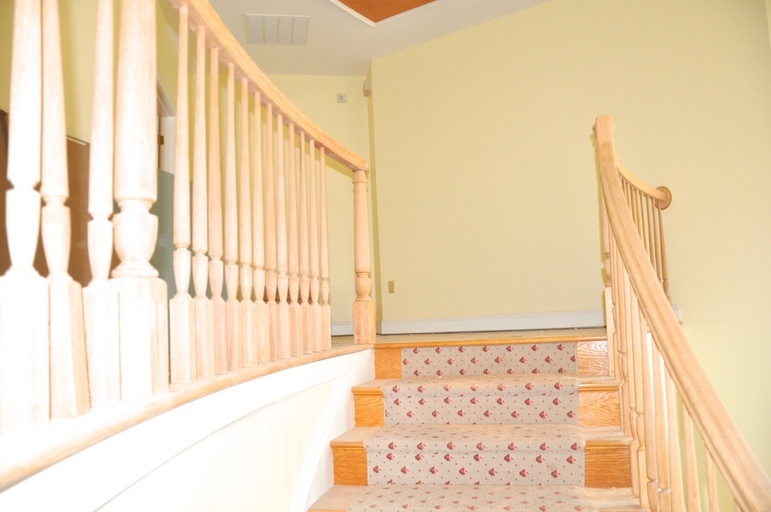 There are a variety of flooring solutions to choose from today. 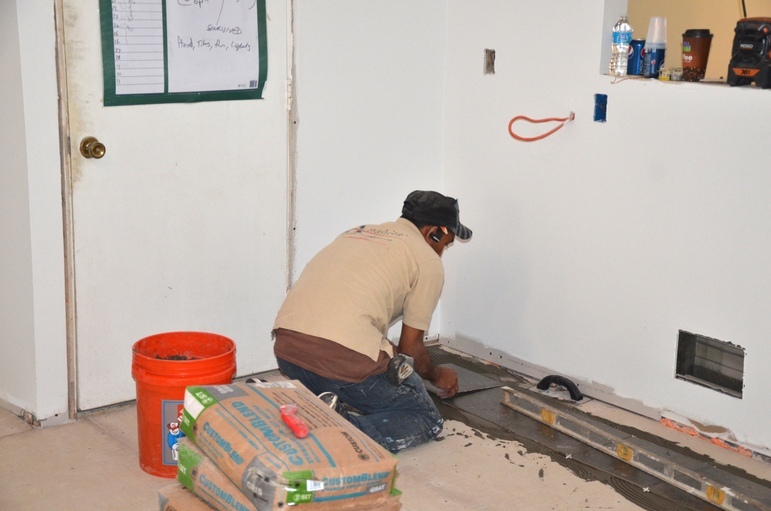 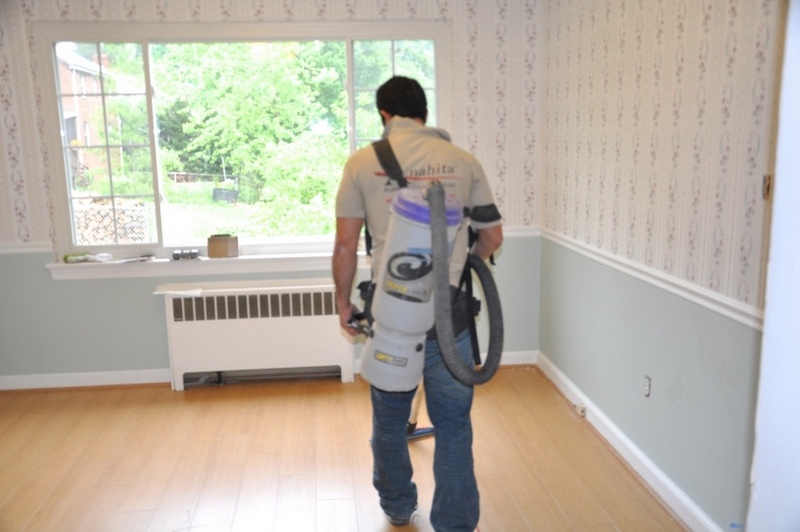 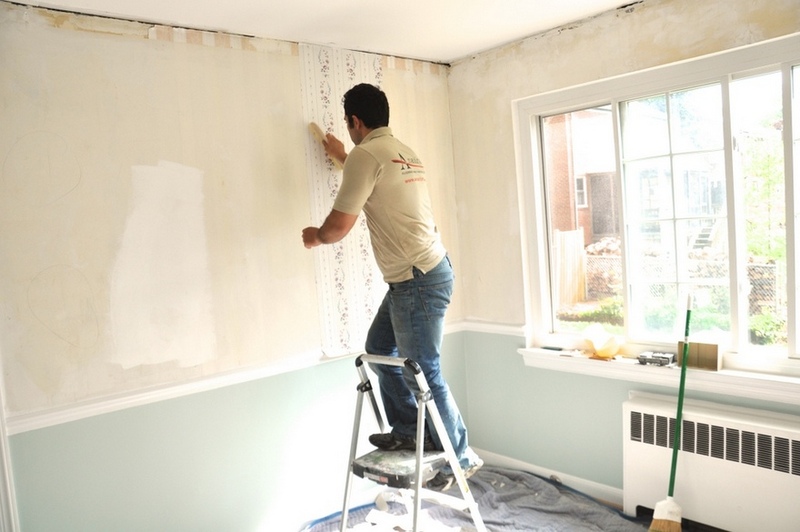 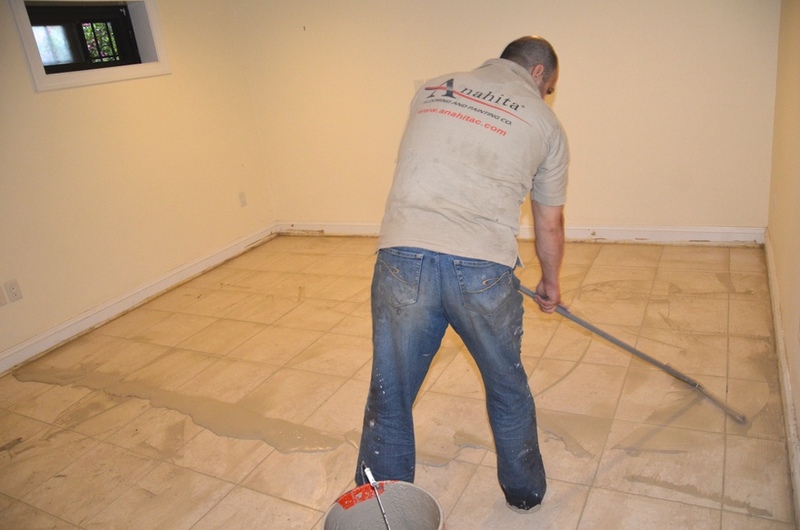 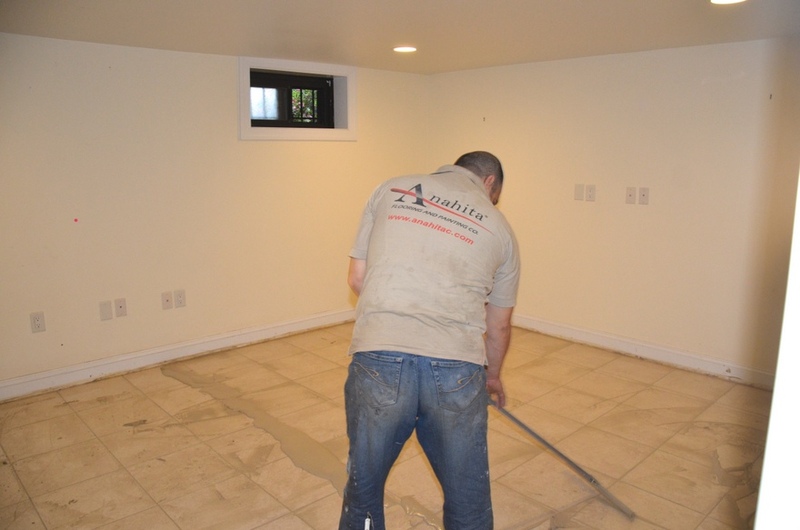 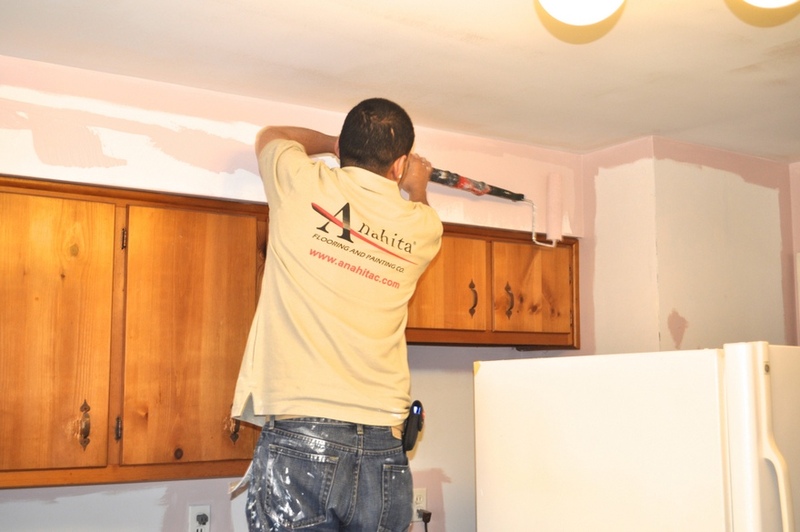 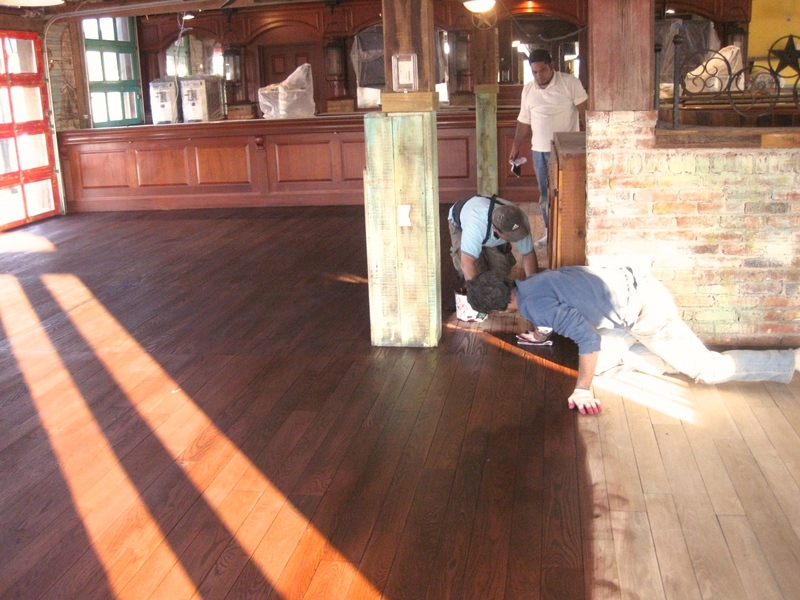 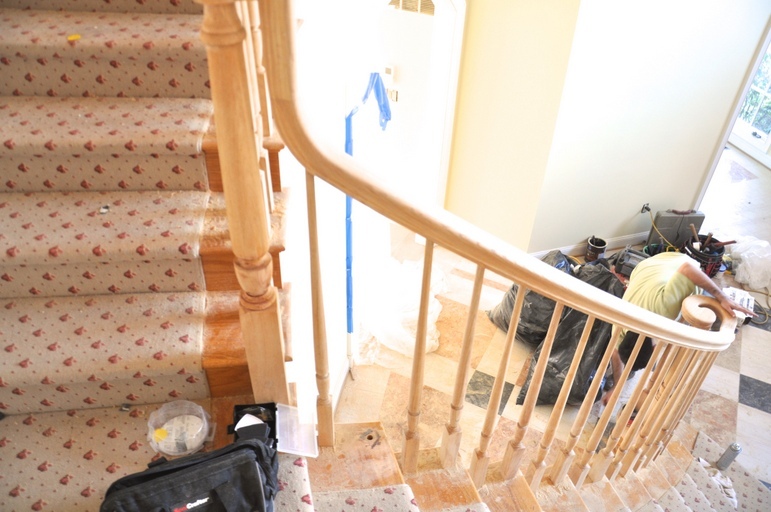 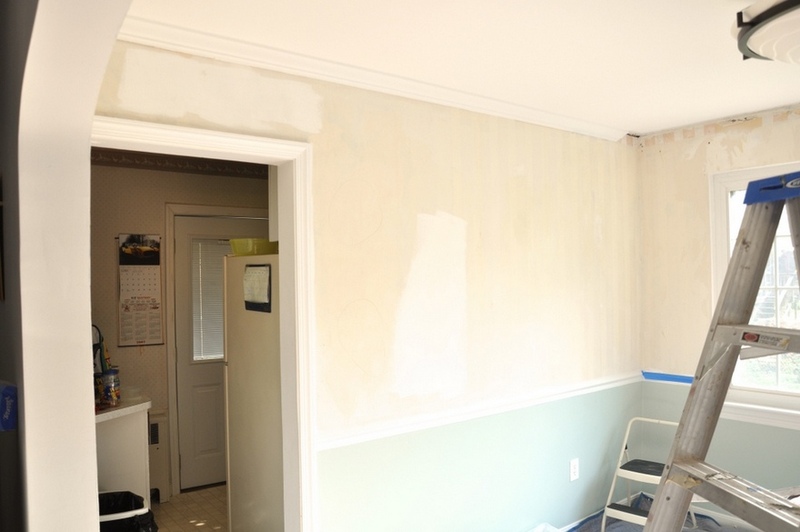 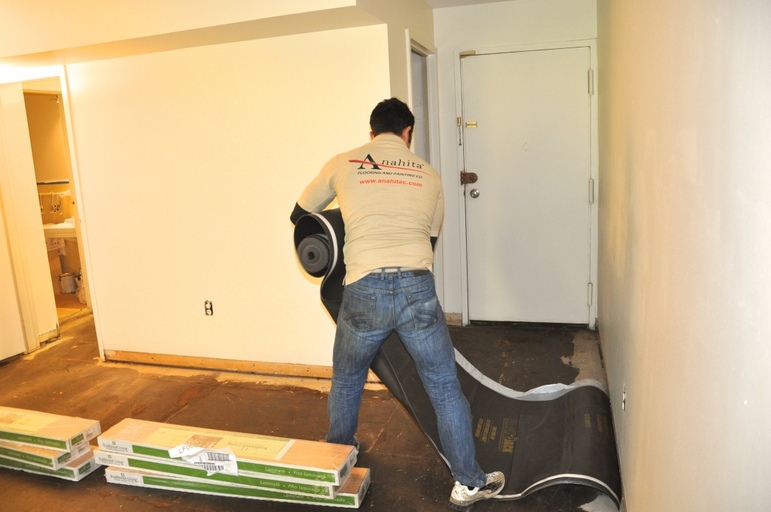 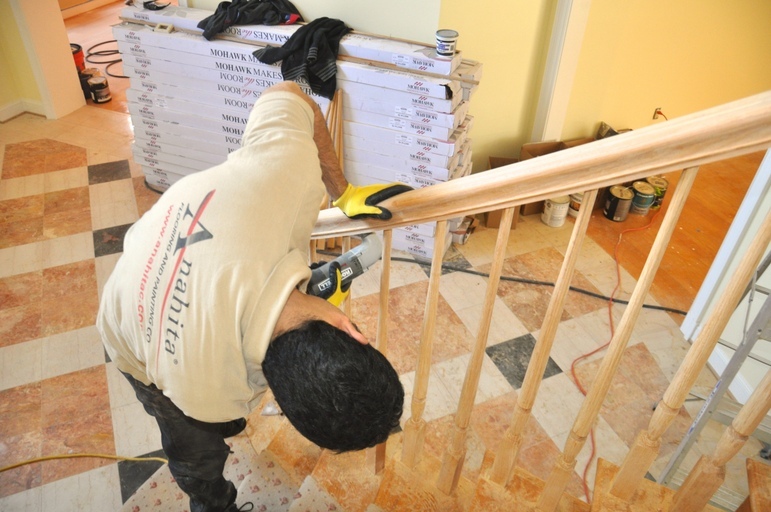 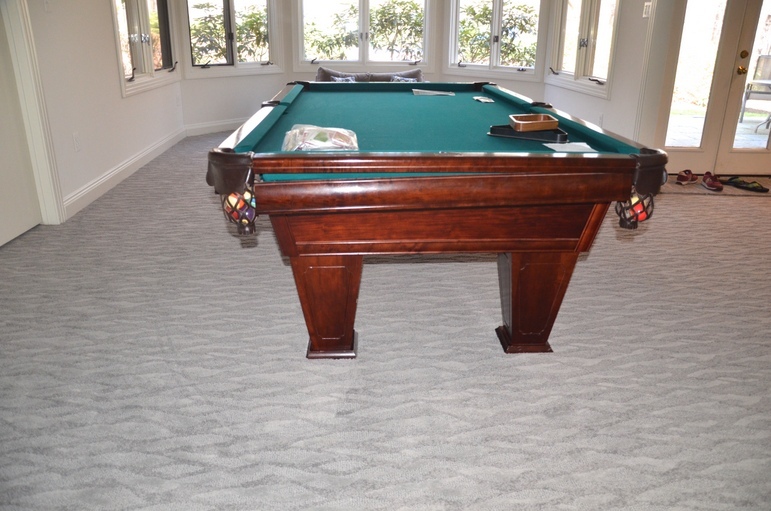 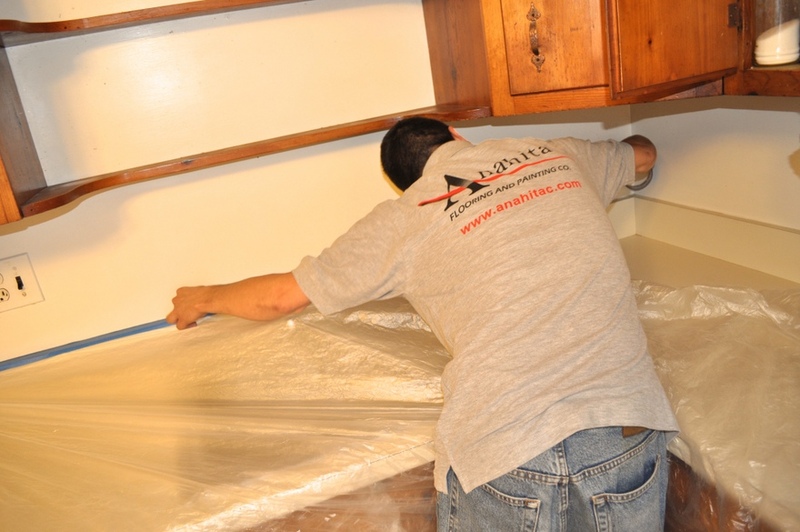 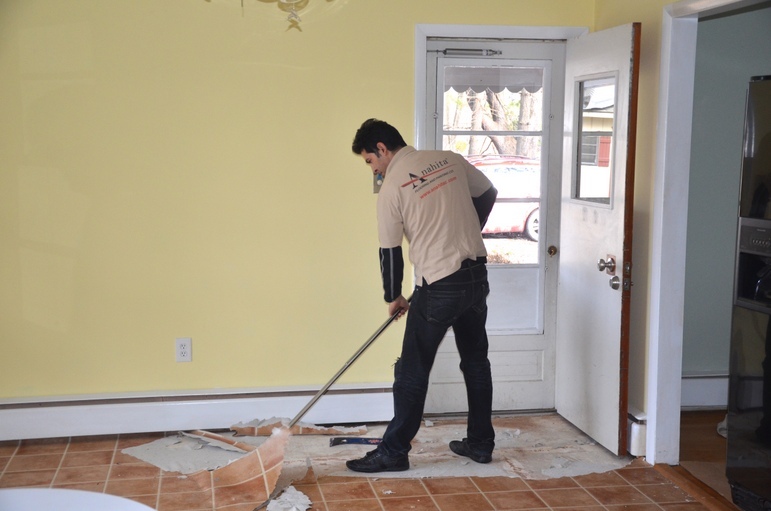 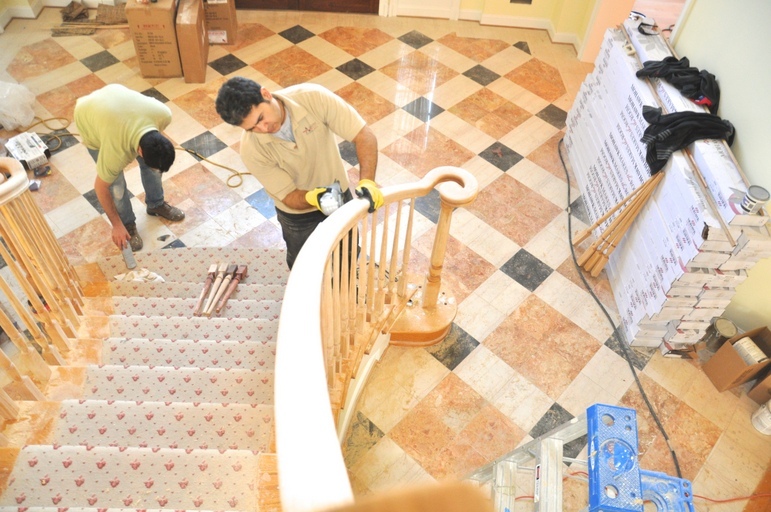 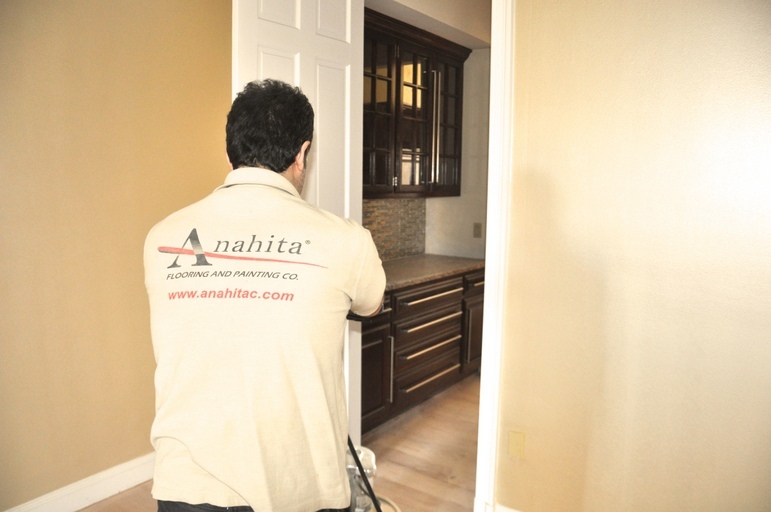 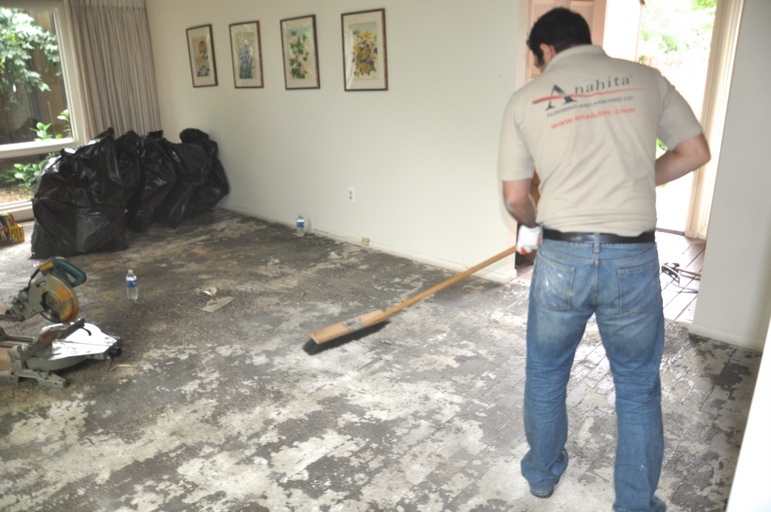 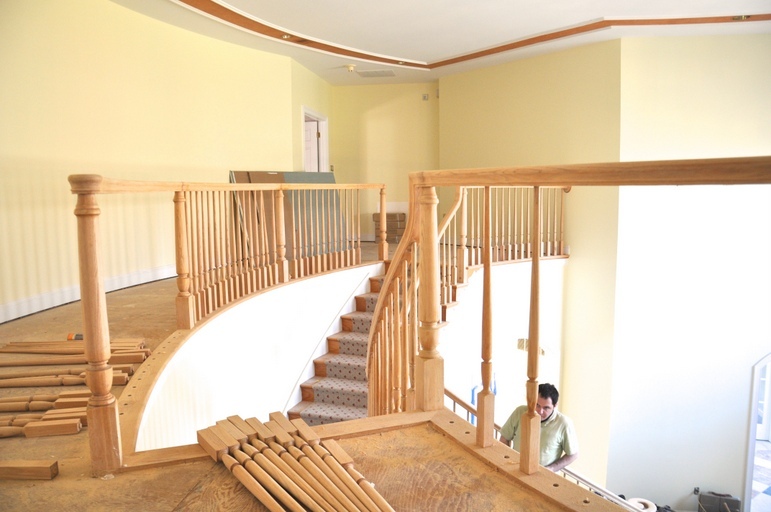 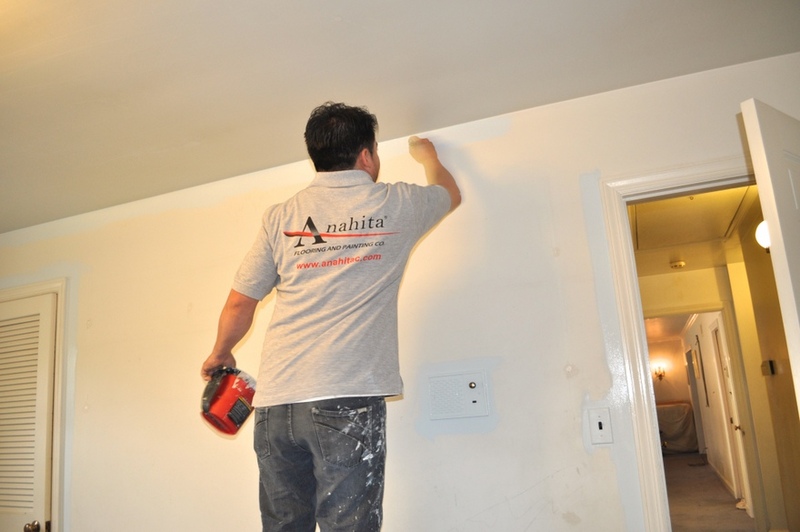 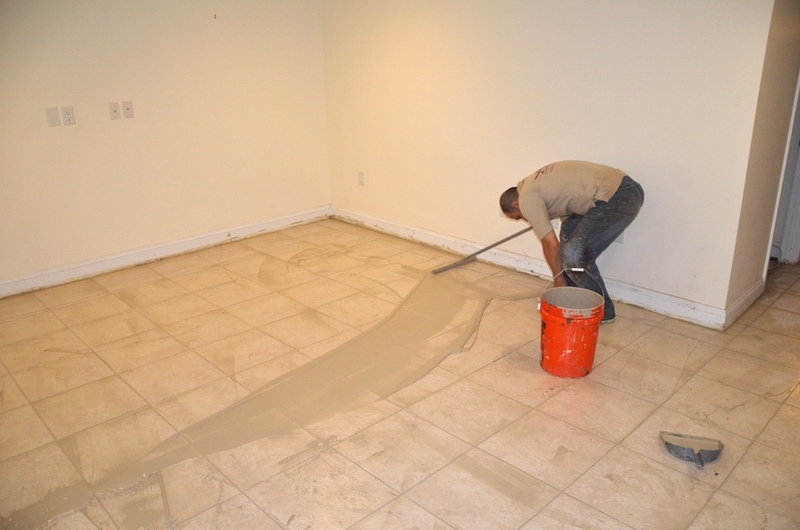 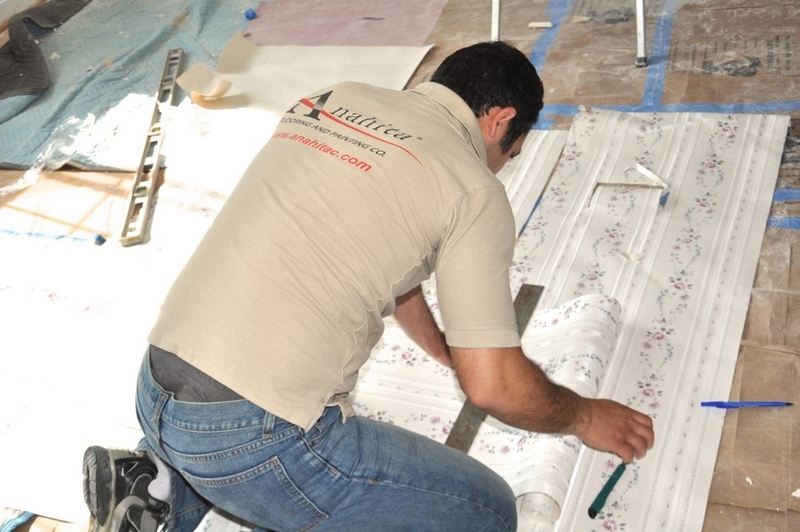 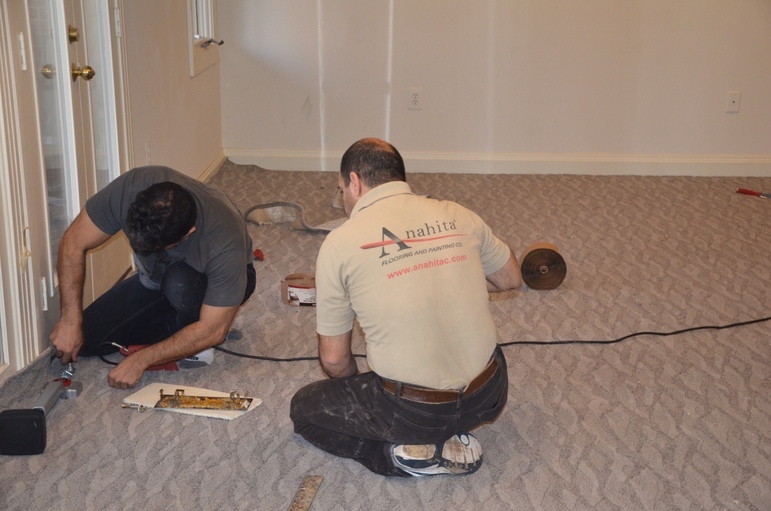 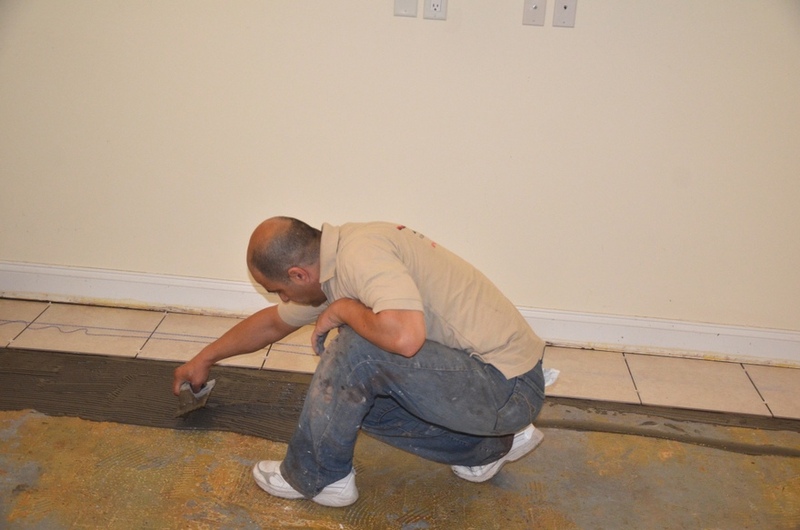 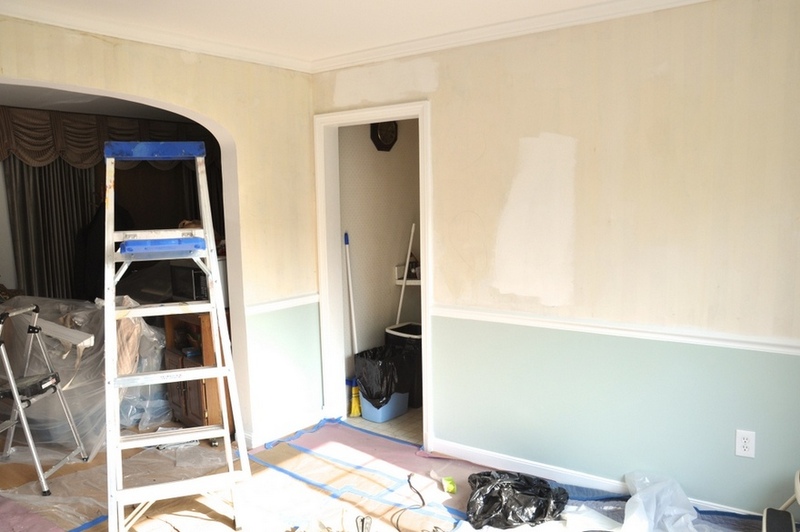 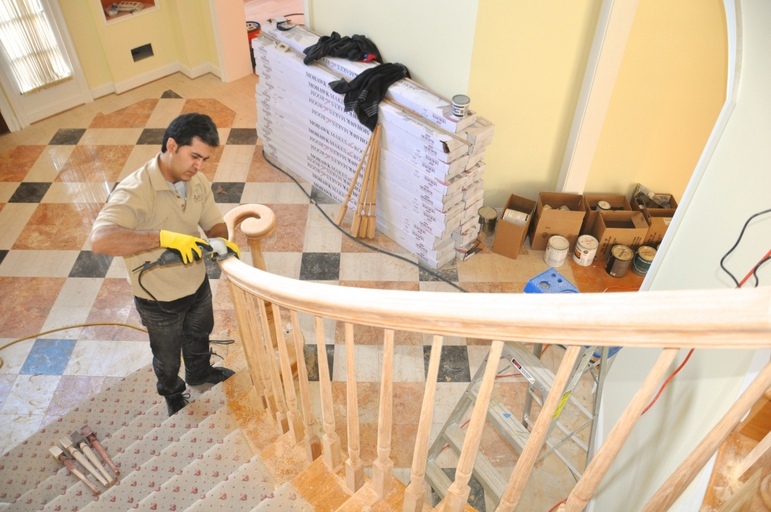 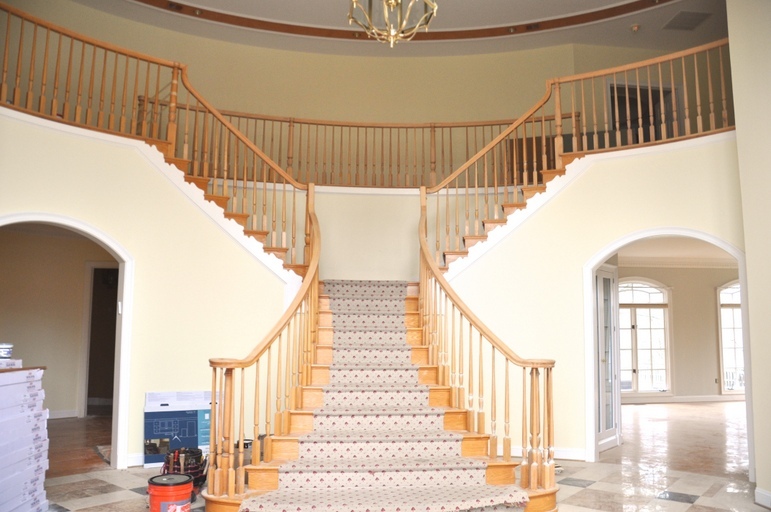 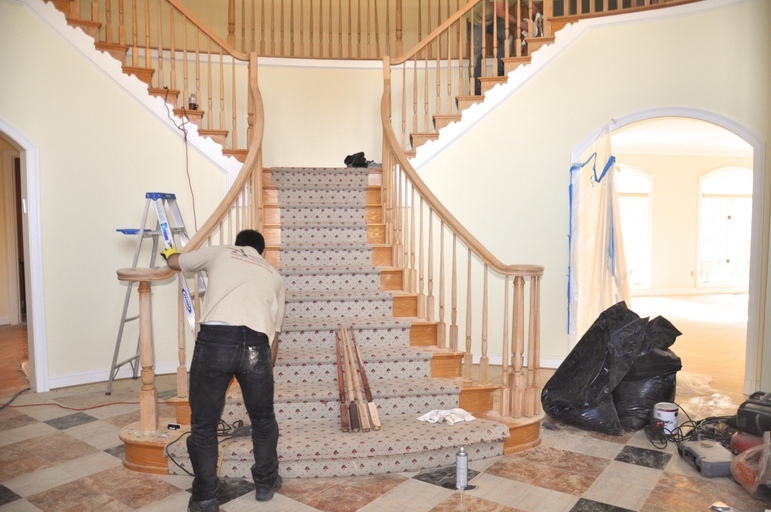 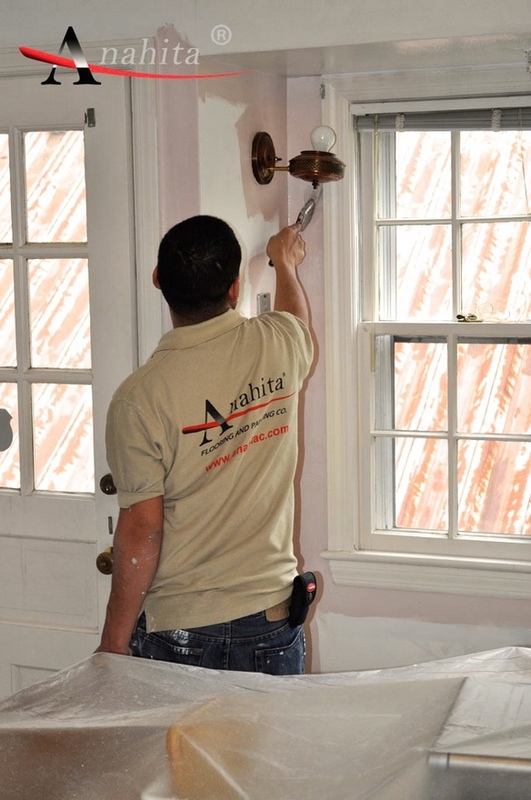 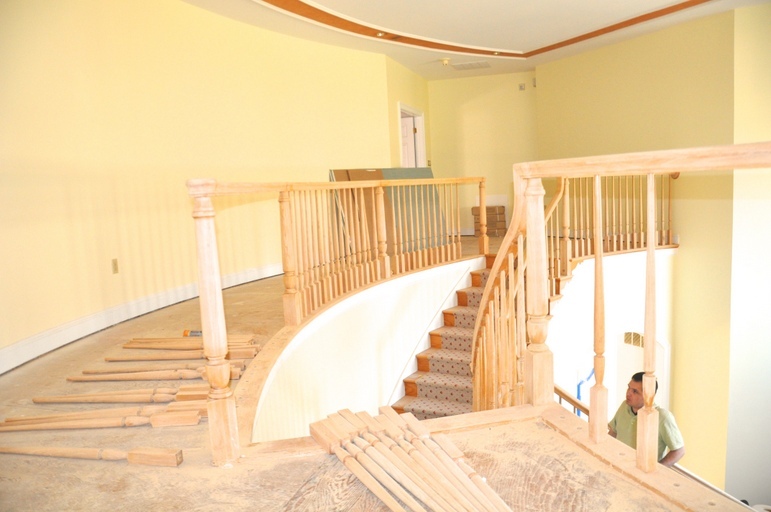 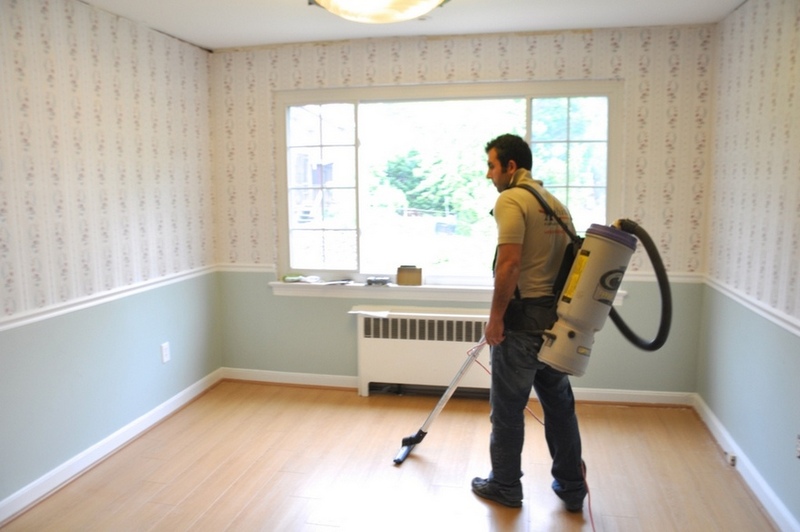 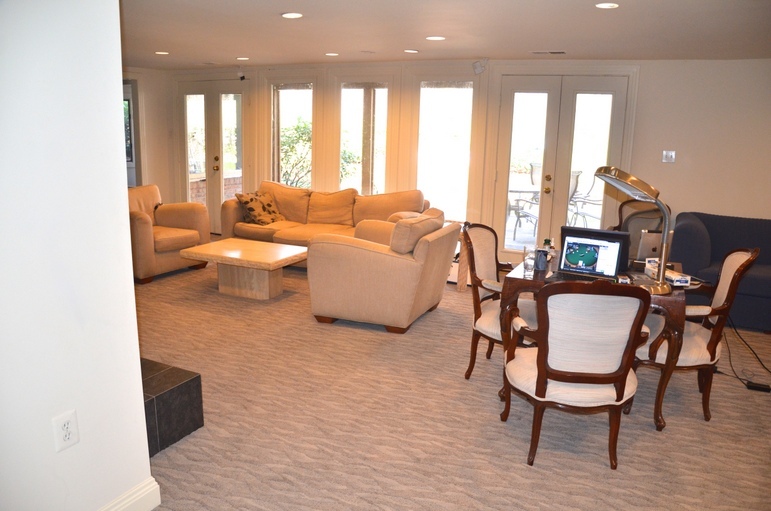 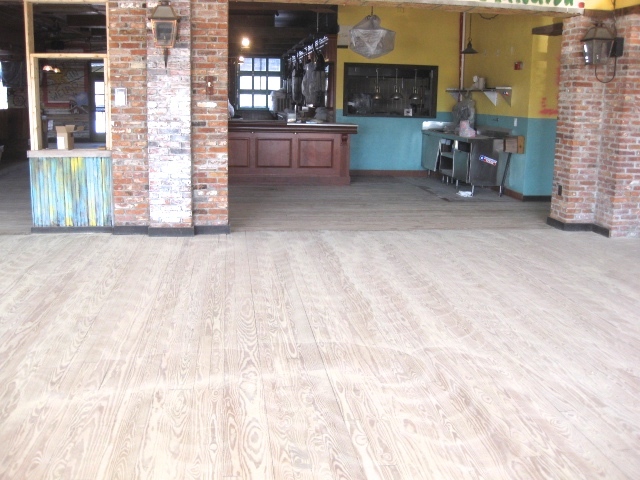 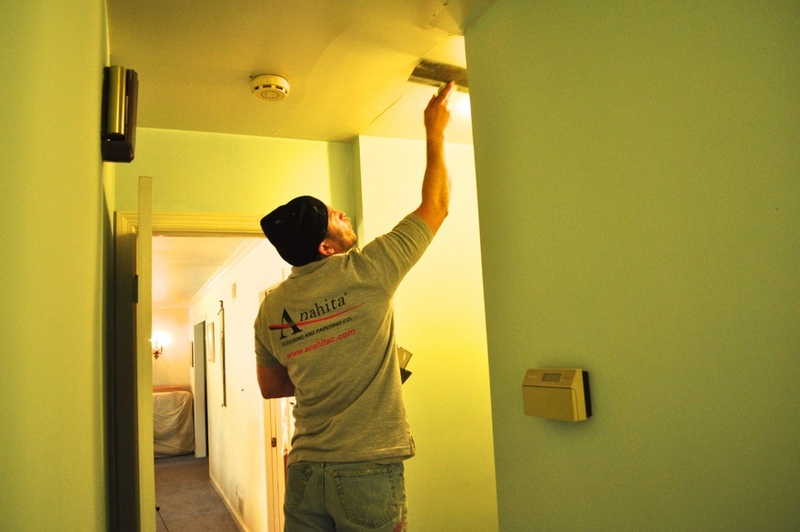 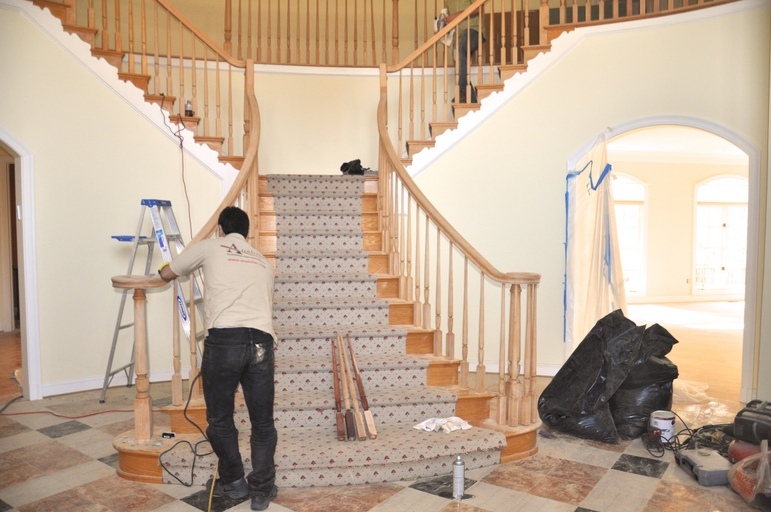 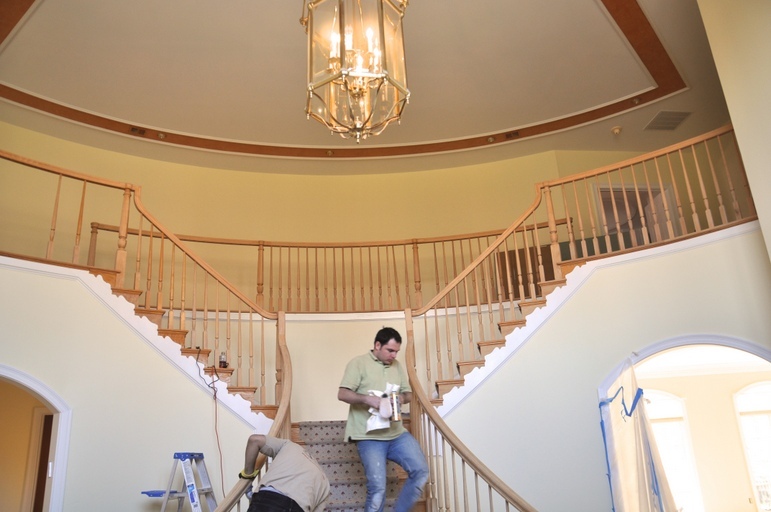 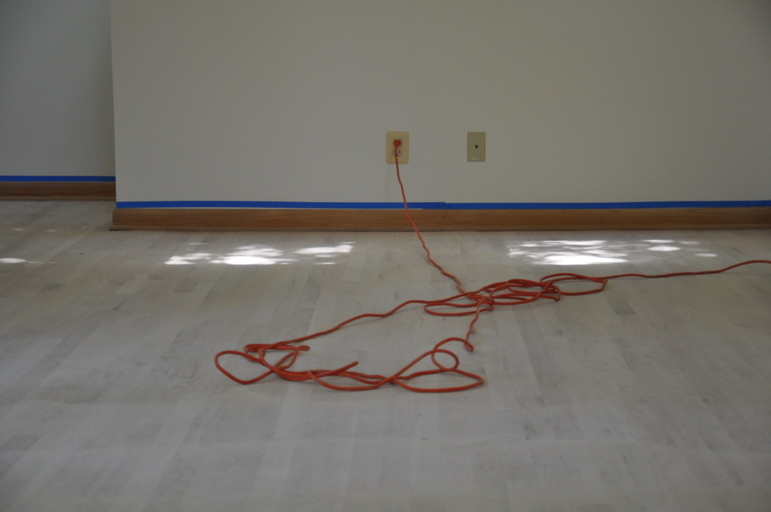 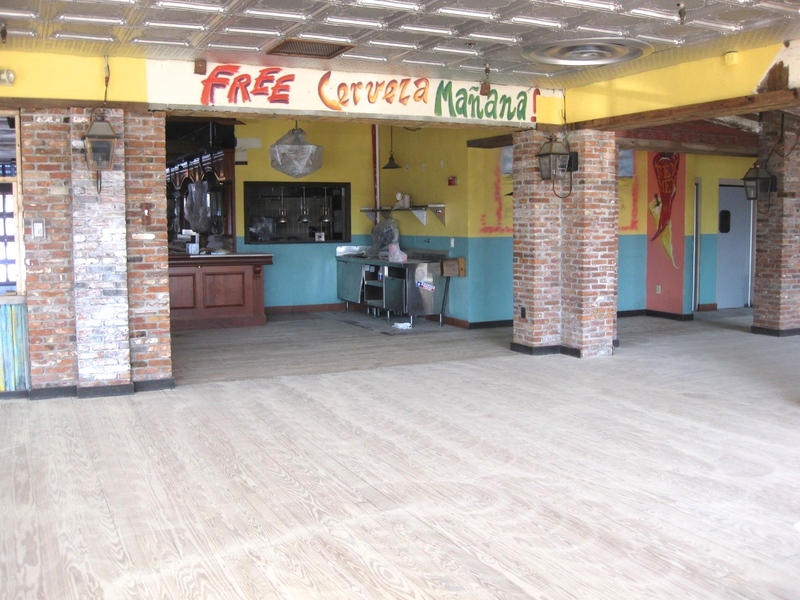 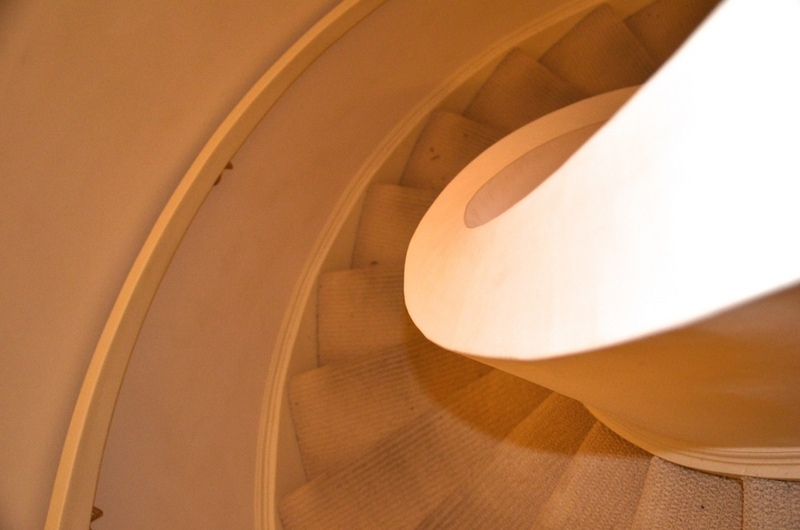 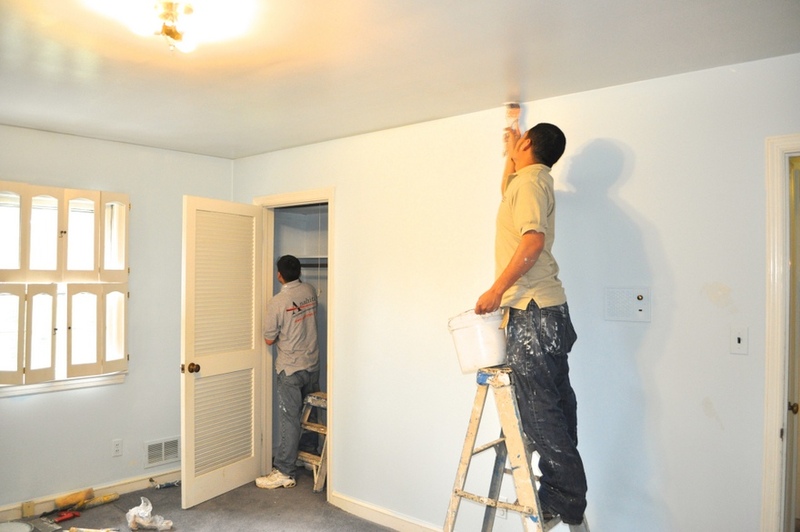 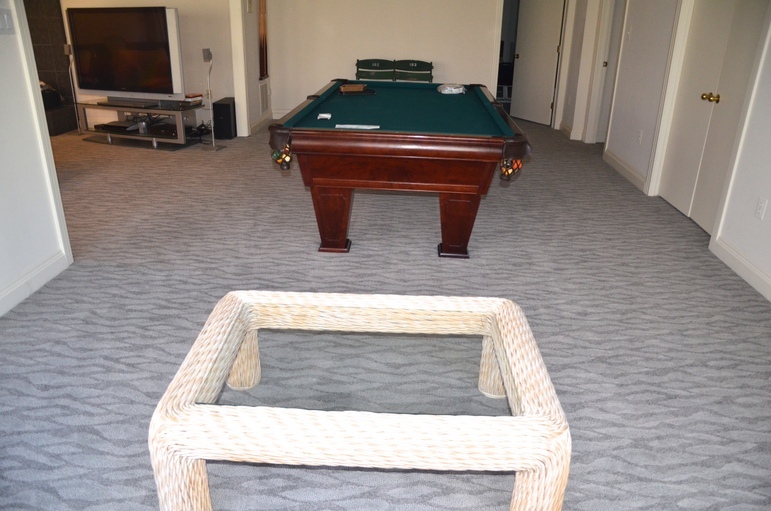 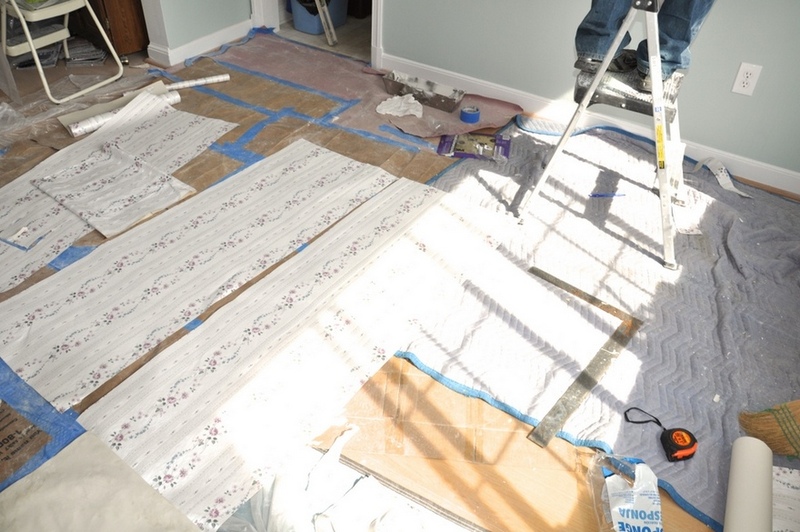 Whether your flooring project requires complete restoration or a new installation, Anahita Flooring & Painting can accommodate all of your specific flooring needs. 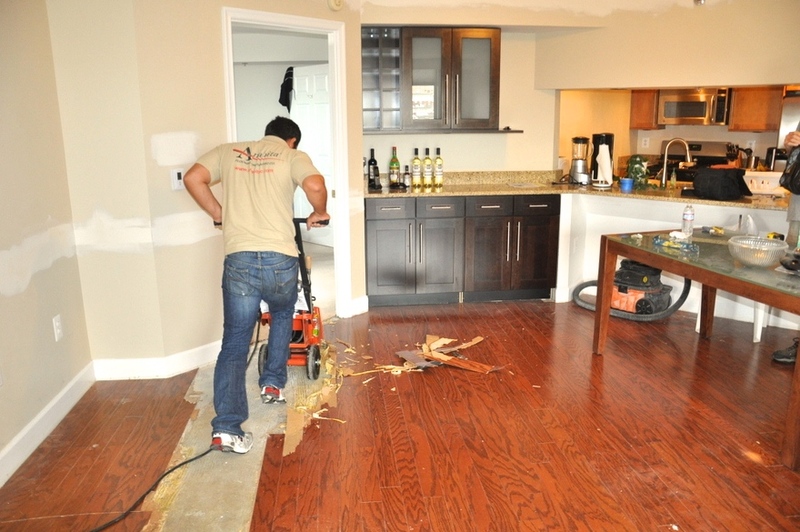 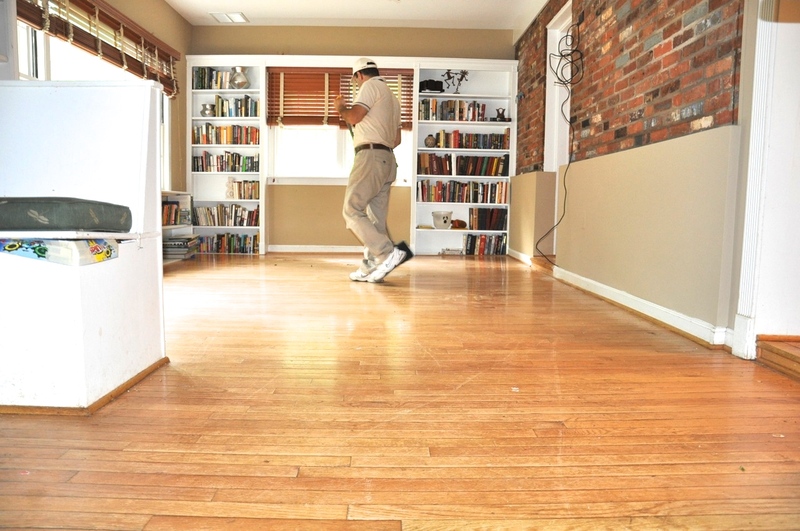 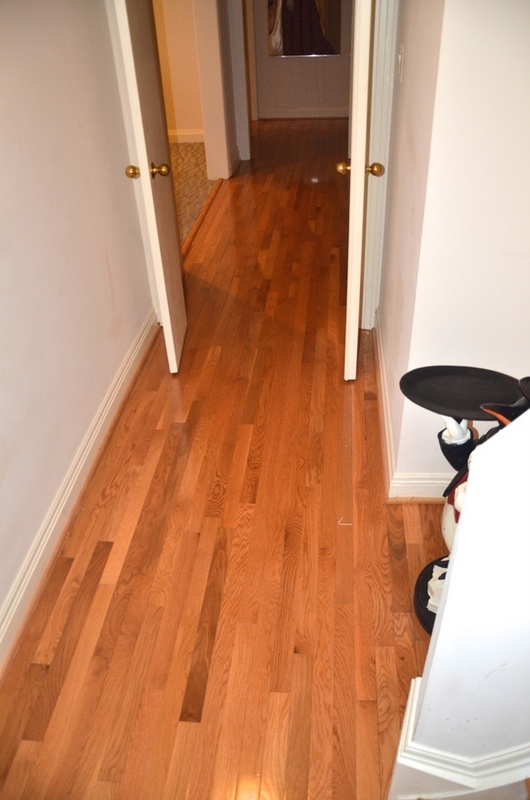 Hardwood floors have come a long way in the past few years. 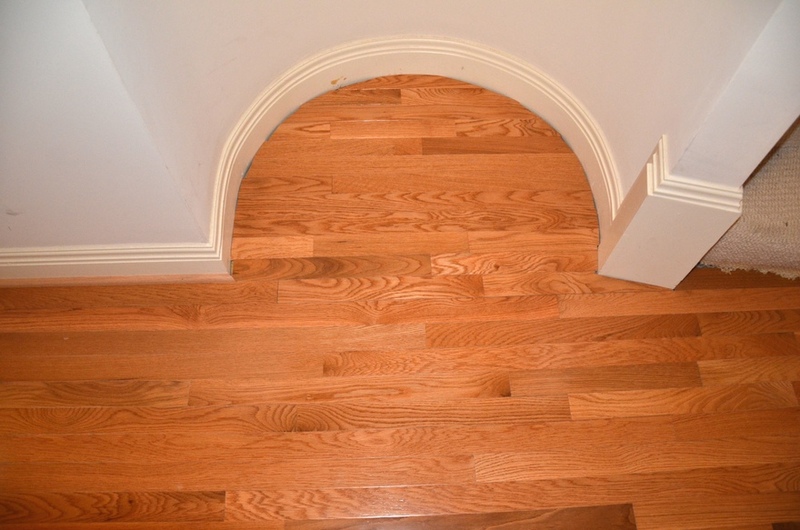 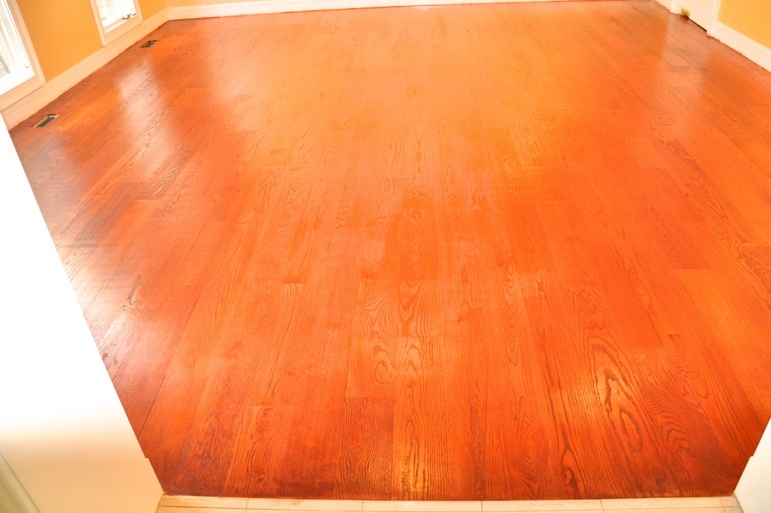 There are several styles, colors, and species of hardwood floors to choose from. 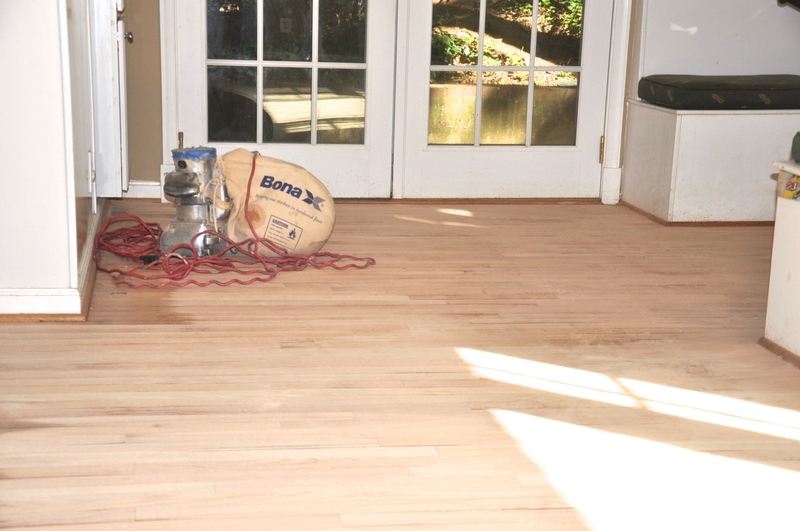 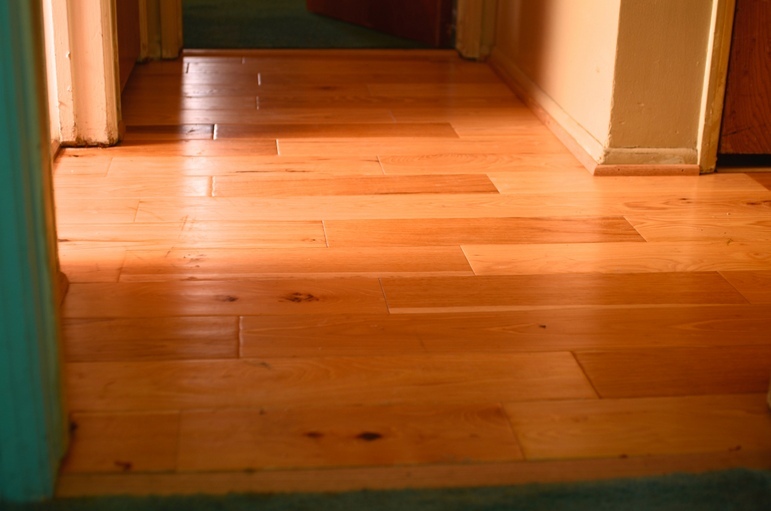 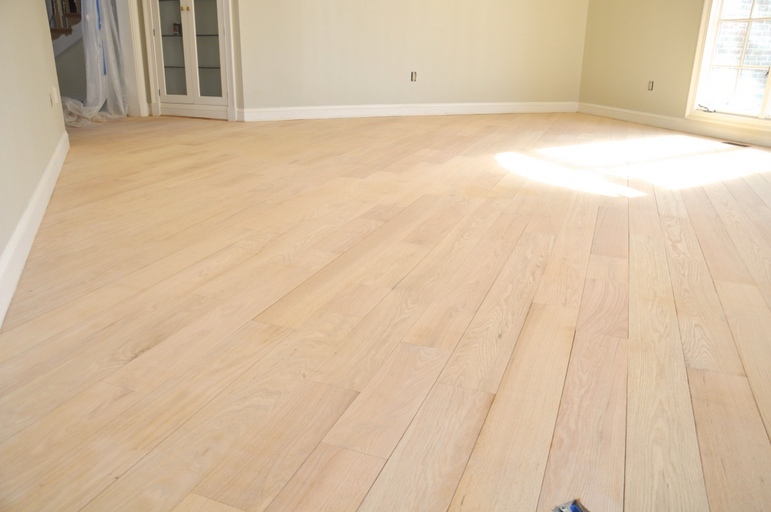 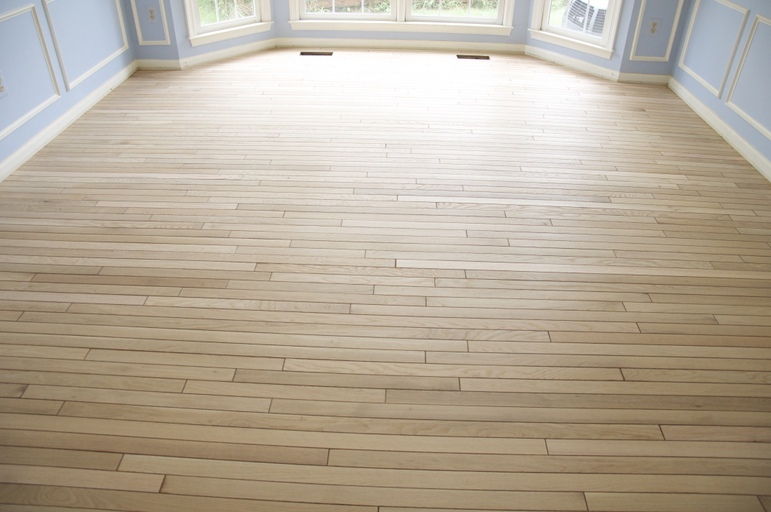 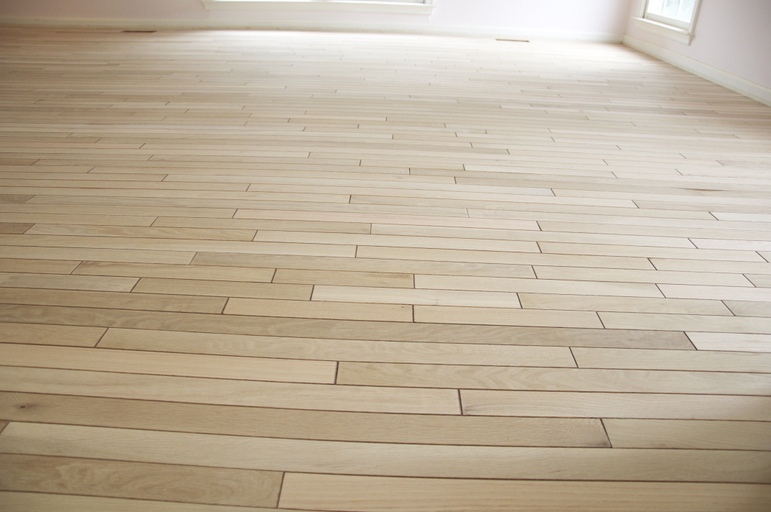 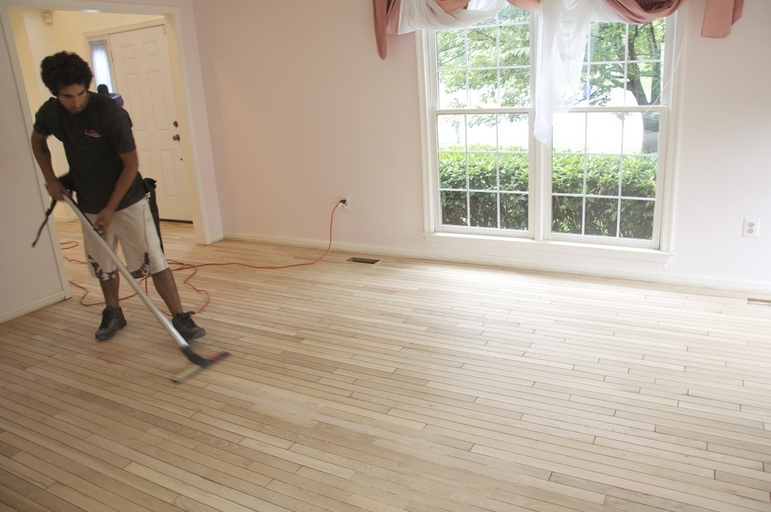 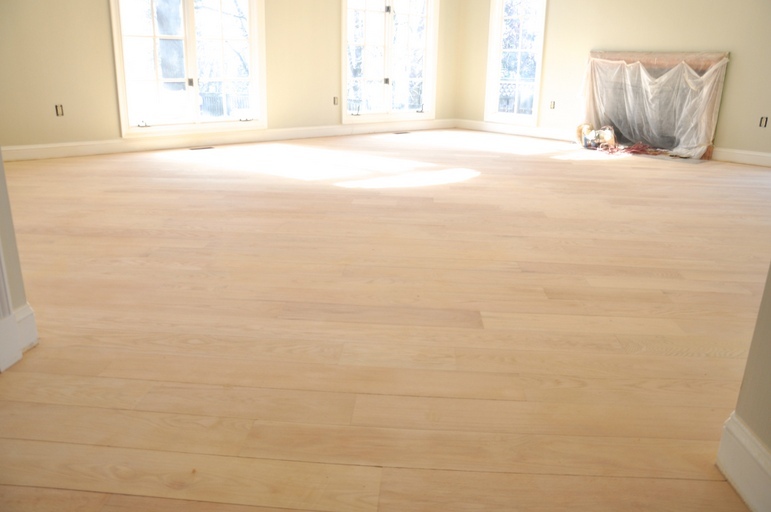 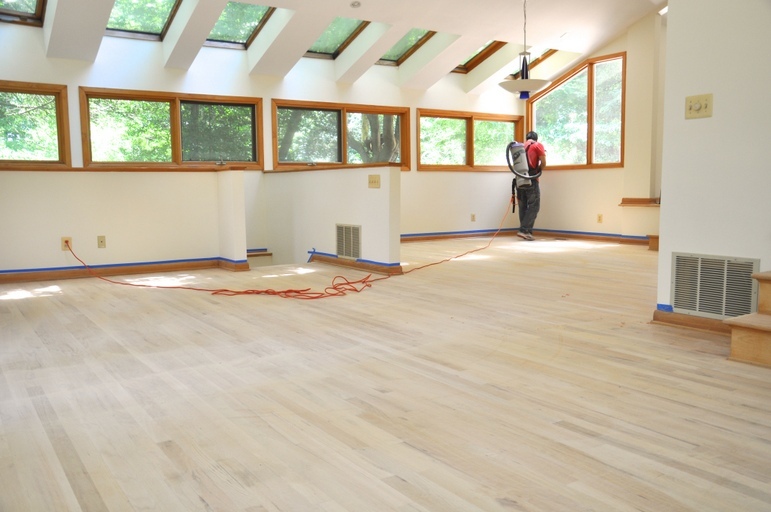 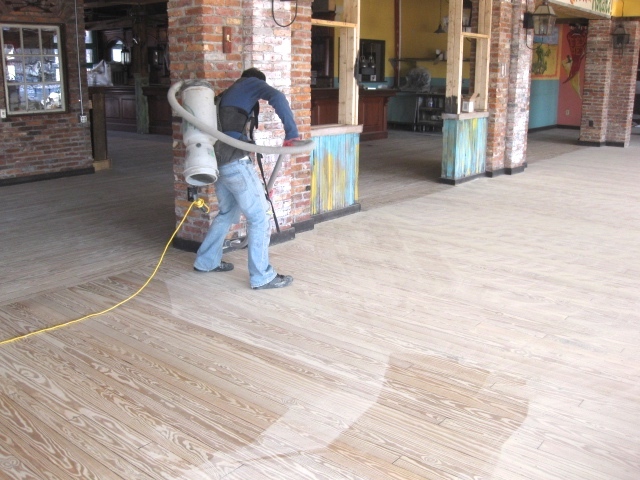 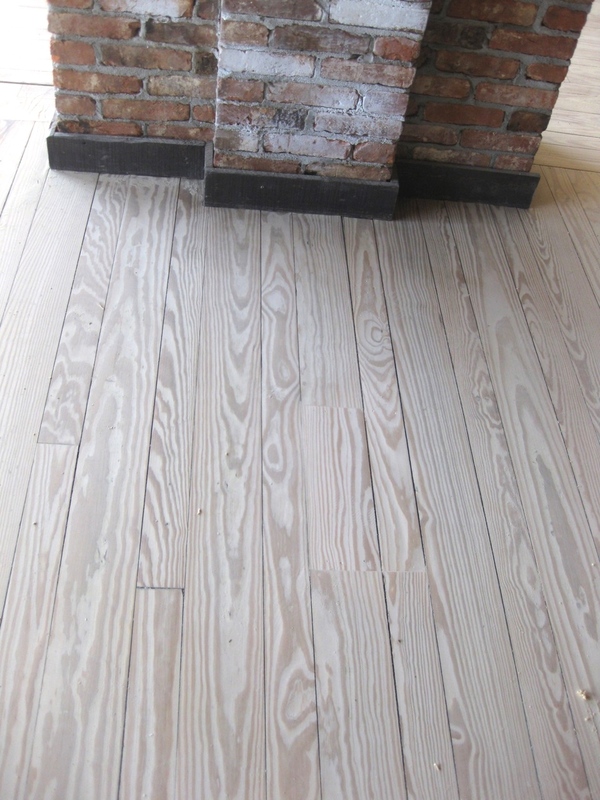 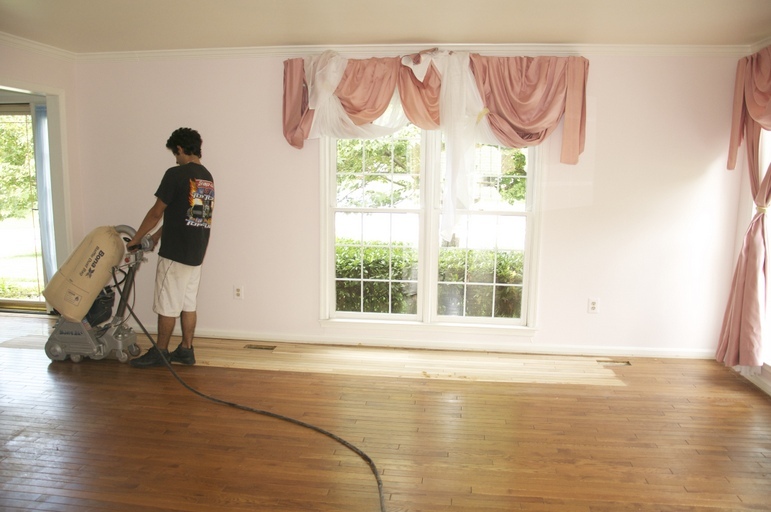 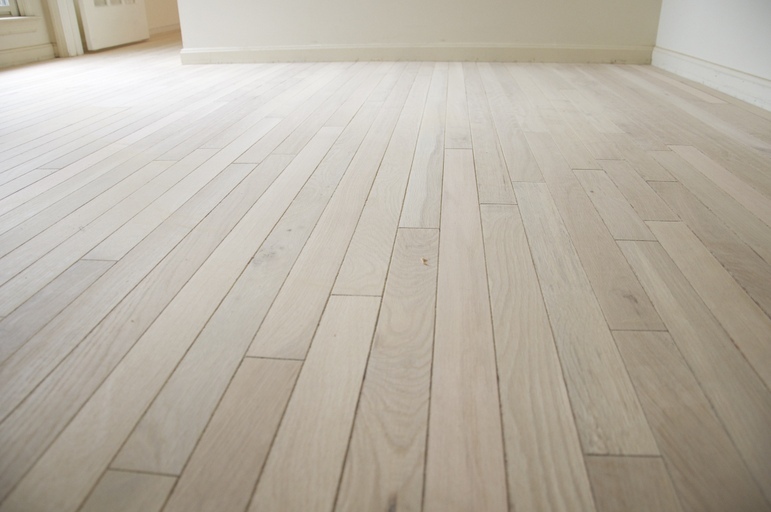 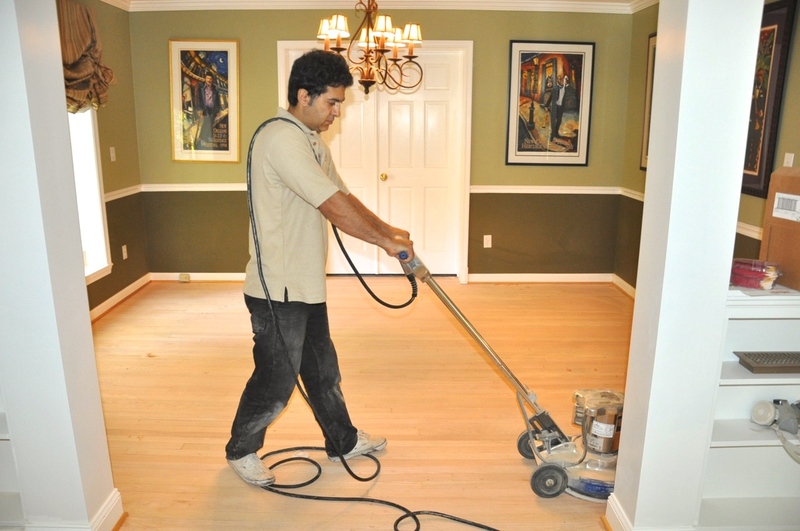 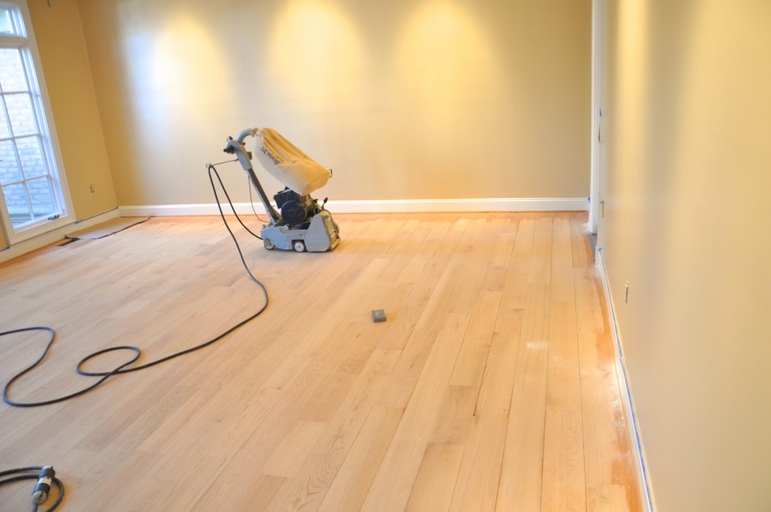 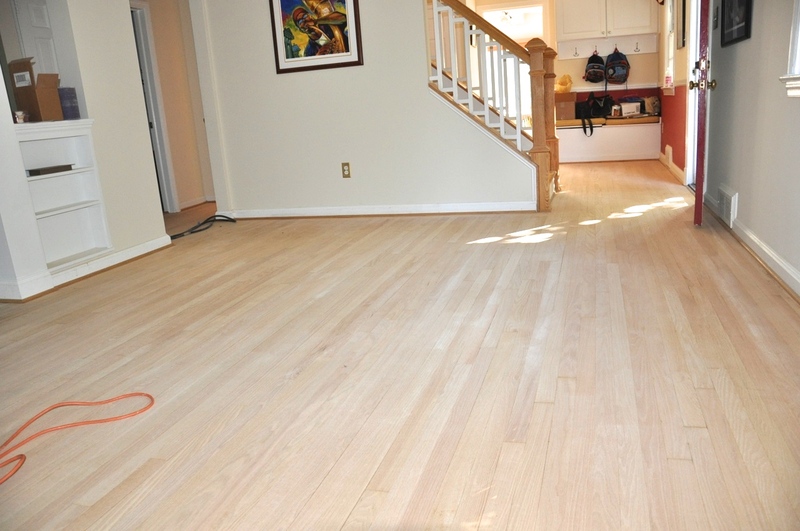 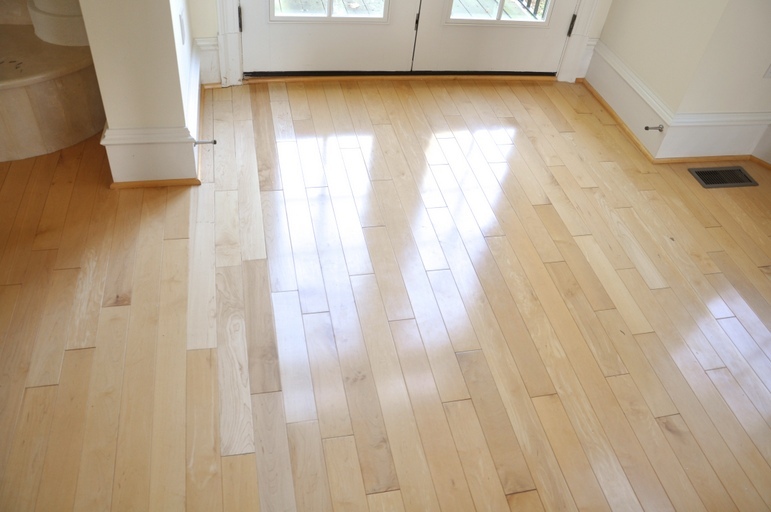 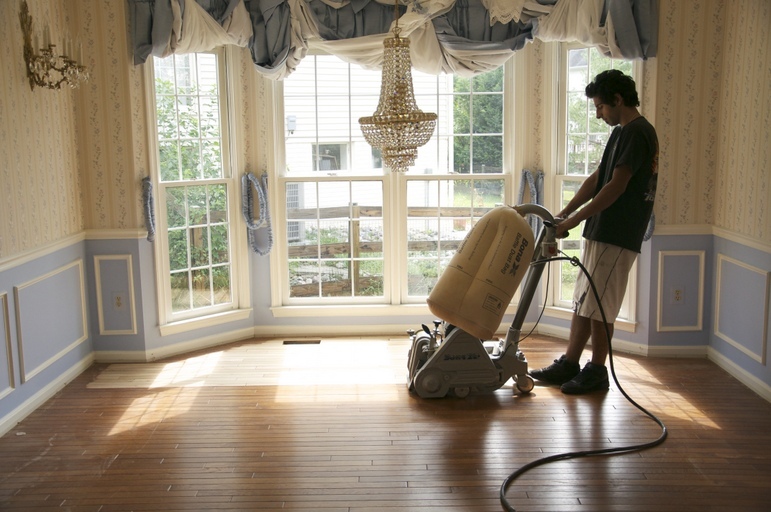 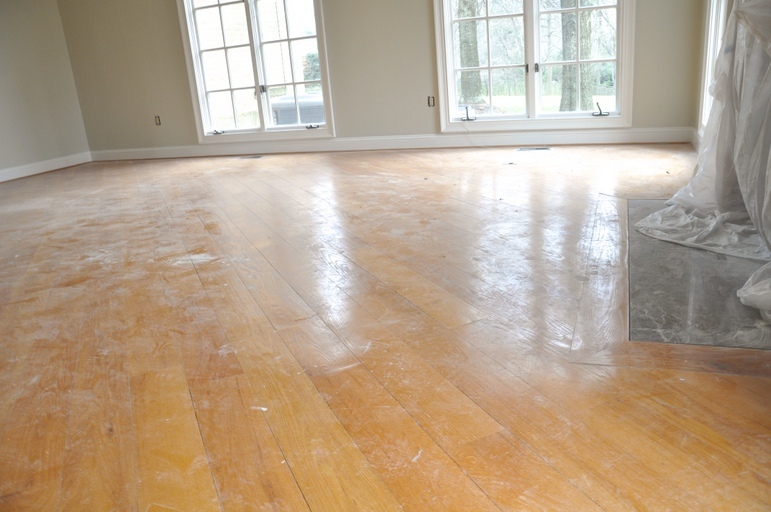 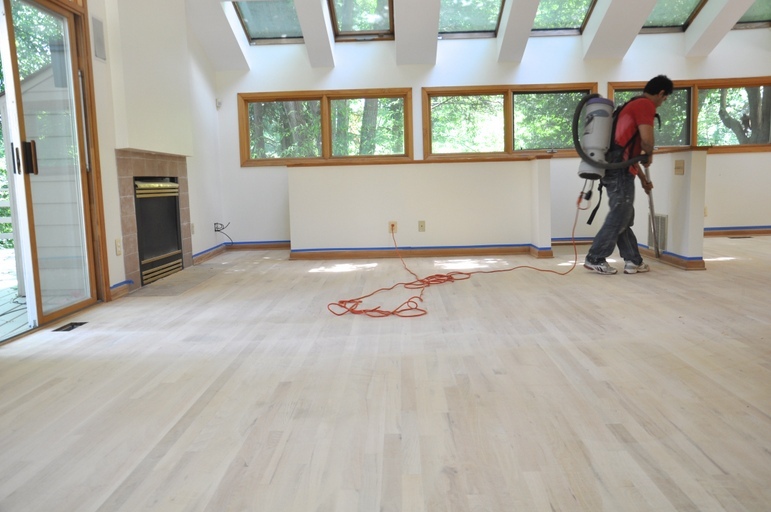 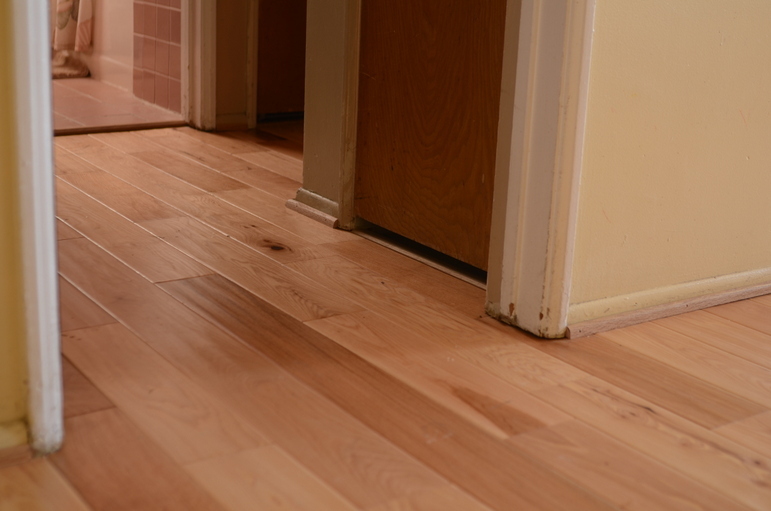 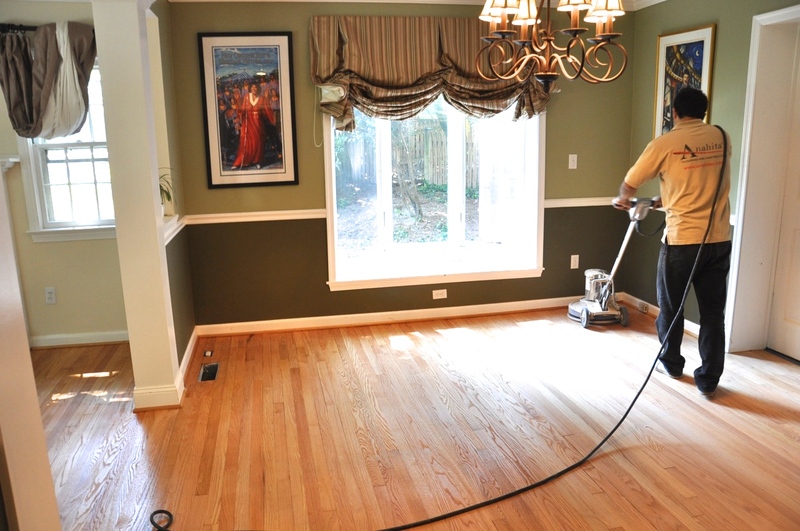 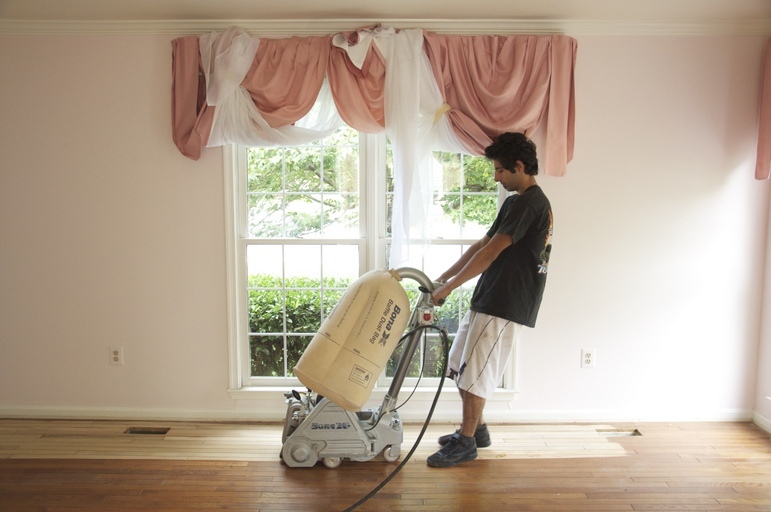 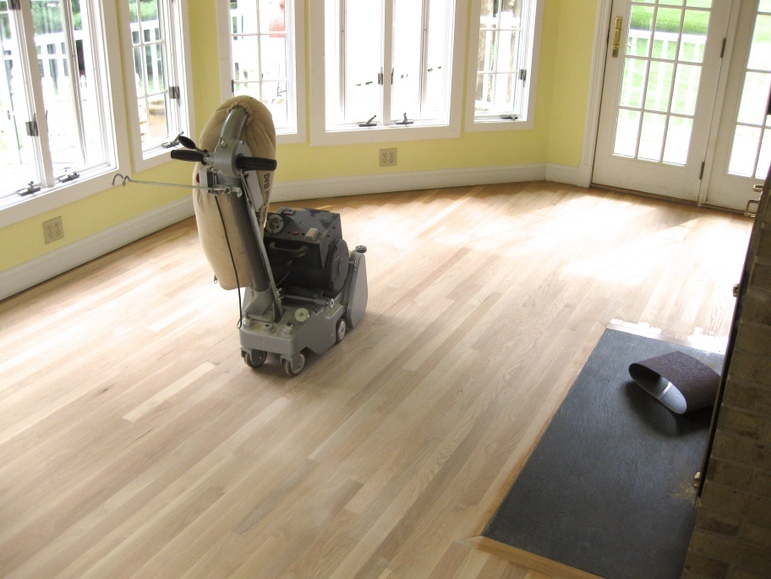 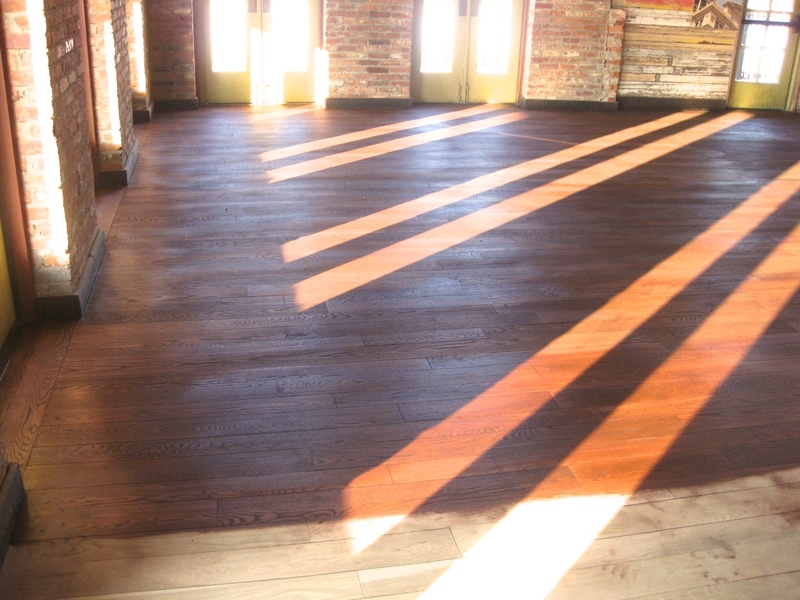 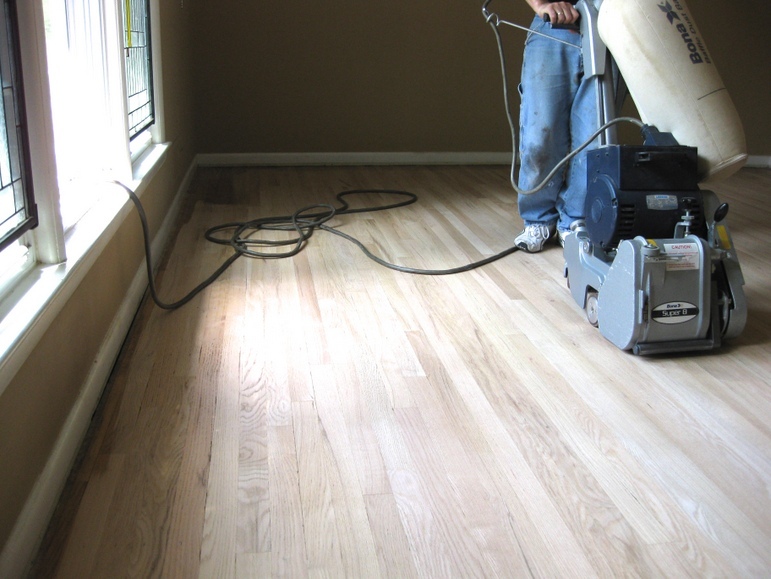 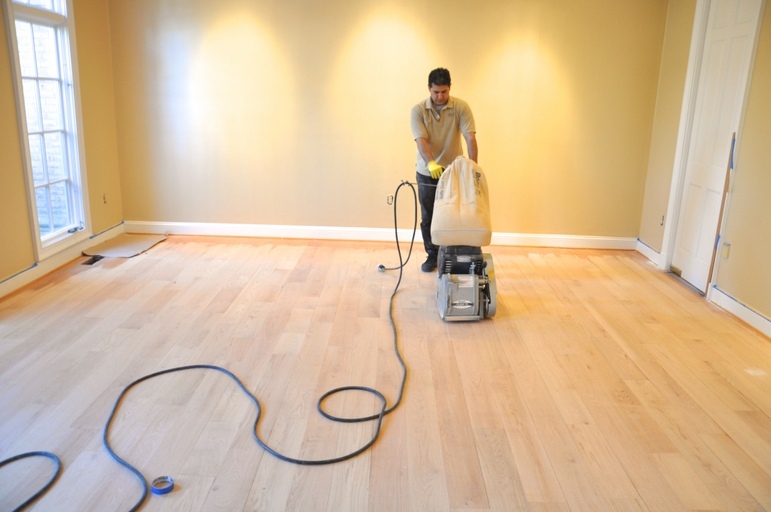 According to the National Wood Flooring Association (NWFA) guidelines, 1/32" of the hardwood floor can be minimized each time the floor is sanded. 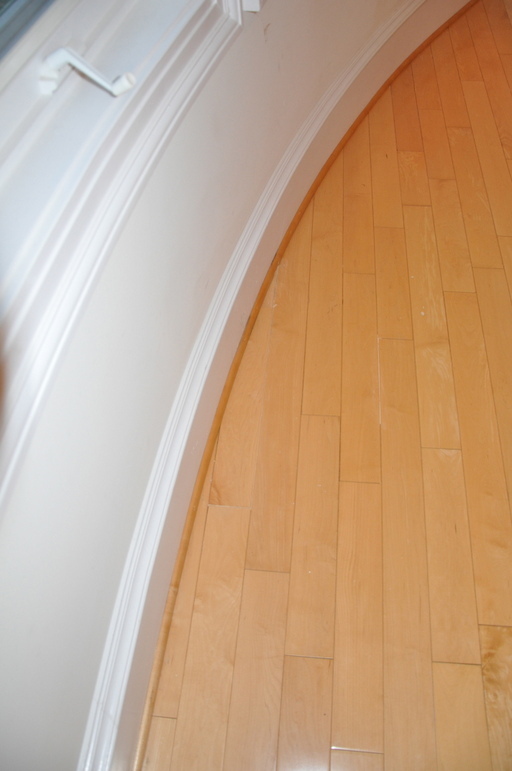 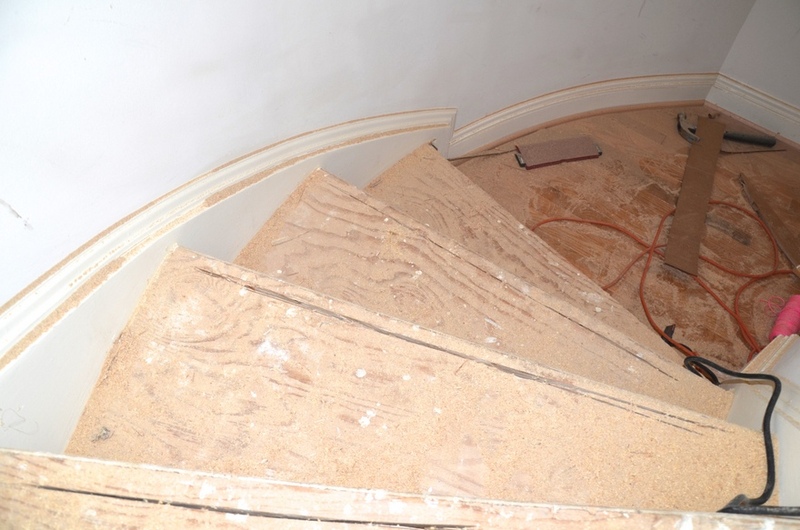 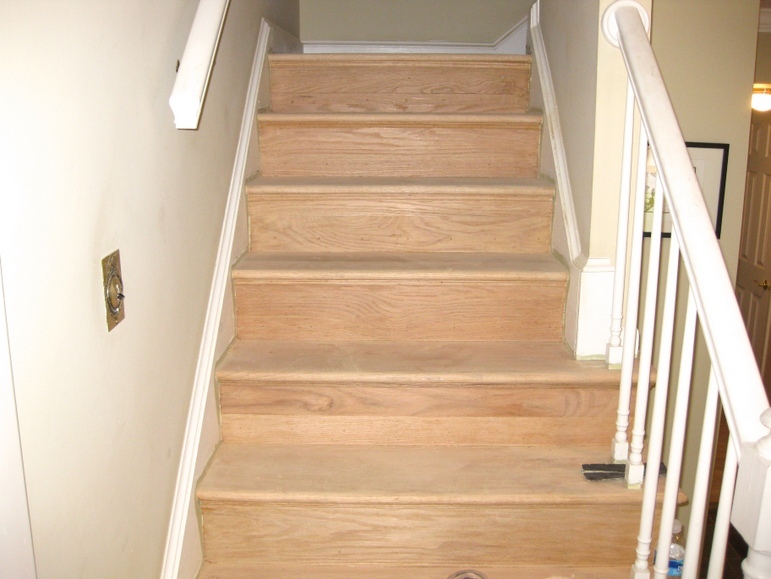 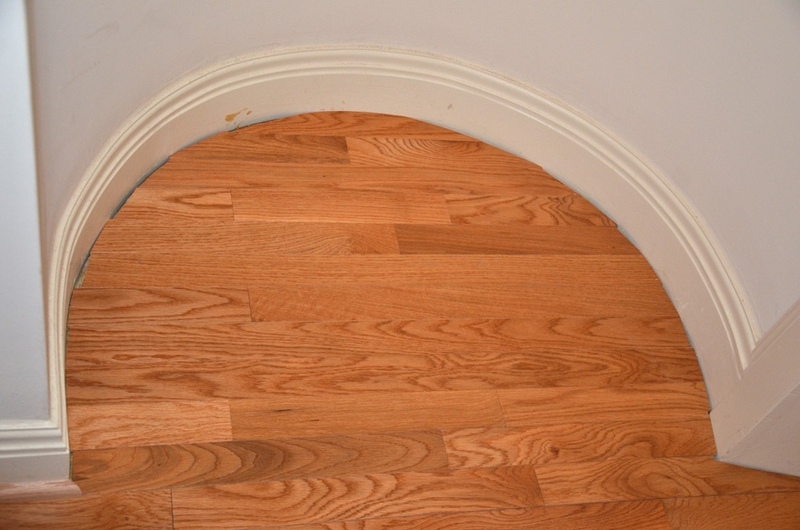 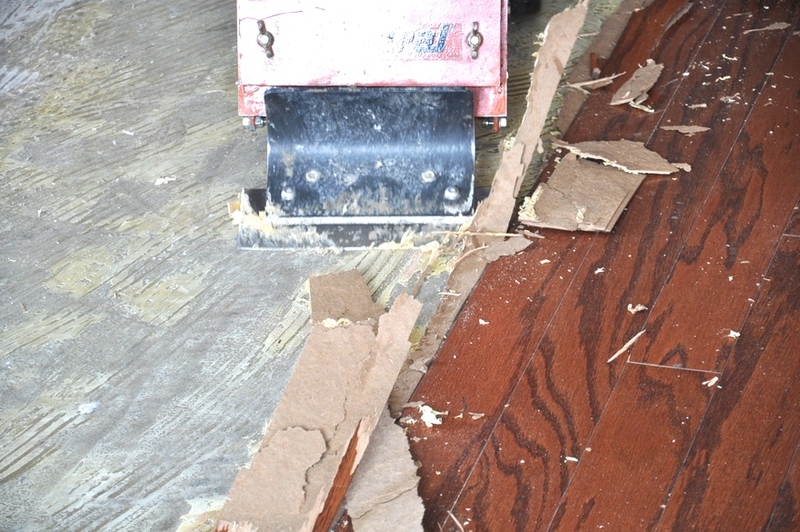 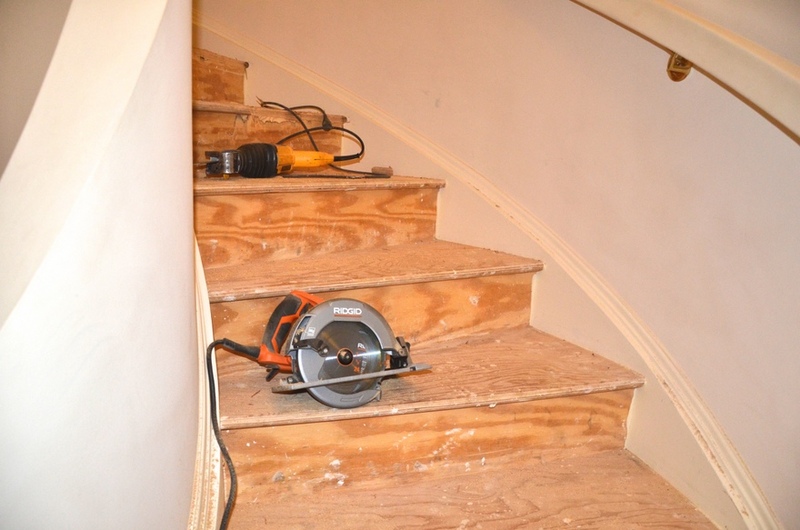 Also, a hardwood floor must have at least 1/32" thick of hardwood layer above the tongue in order to maintain the stability of the tongue and groove joints. 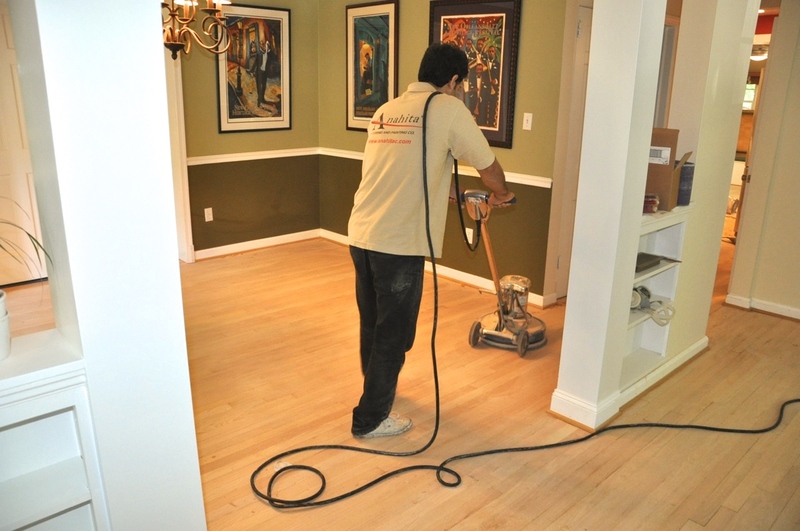 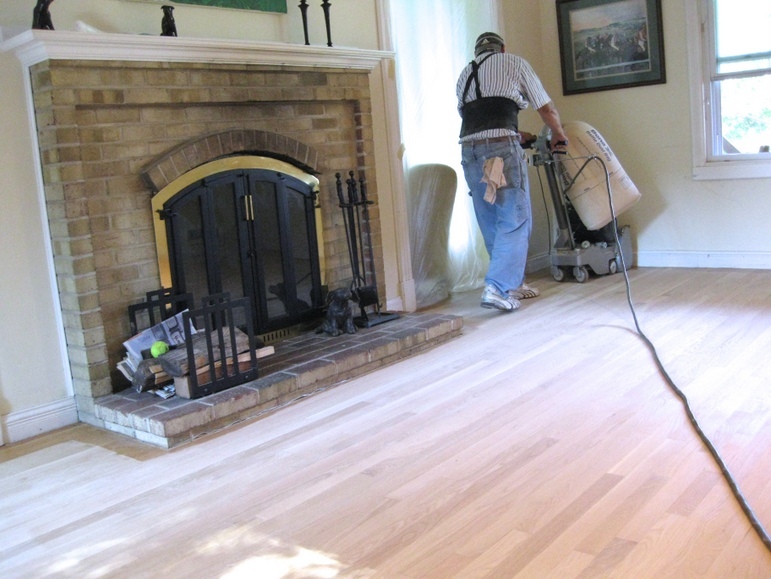 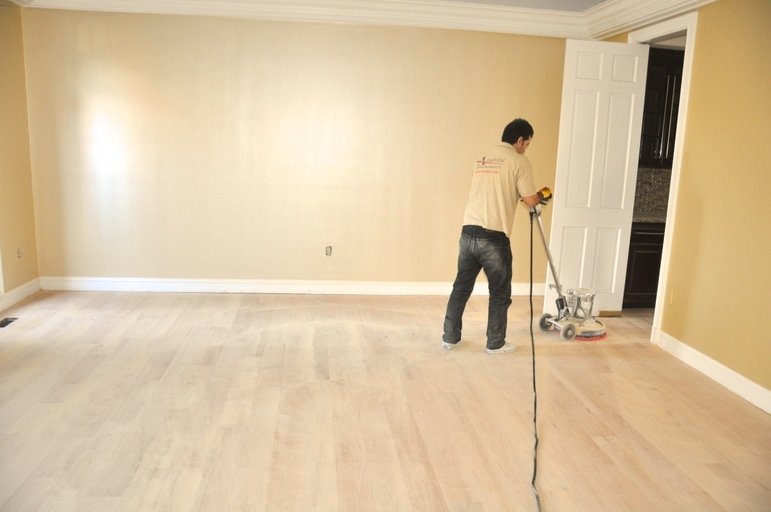 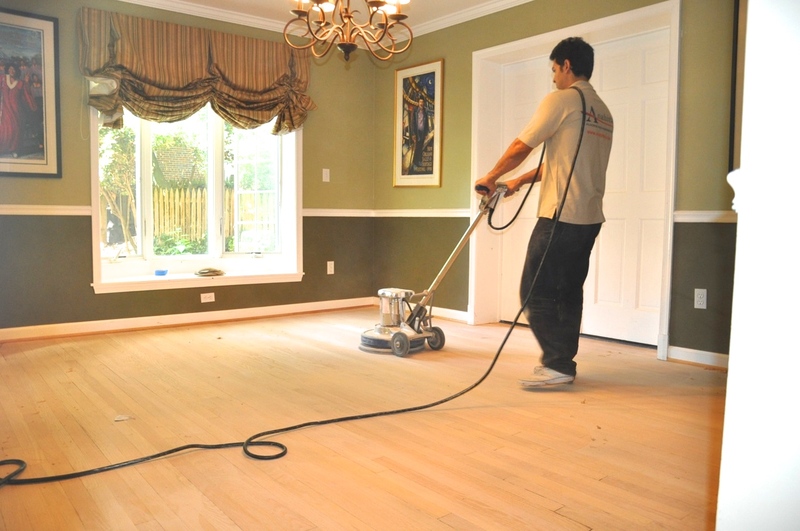 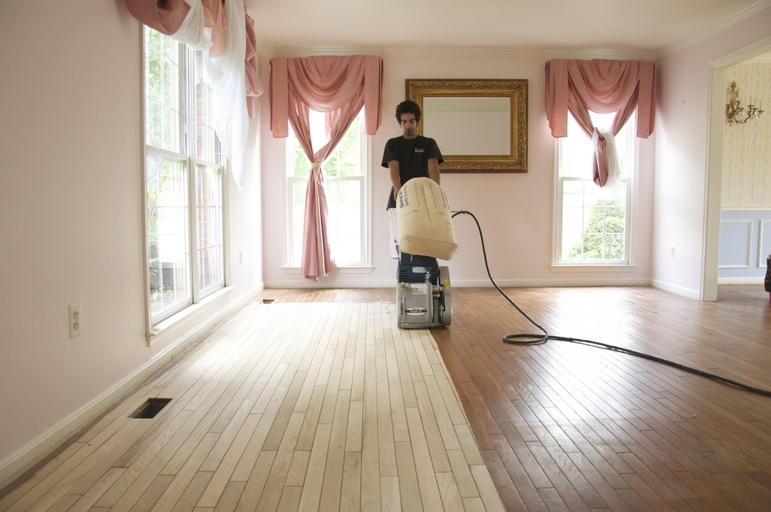 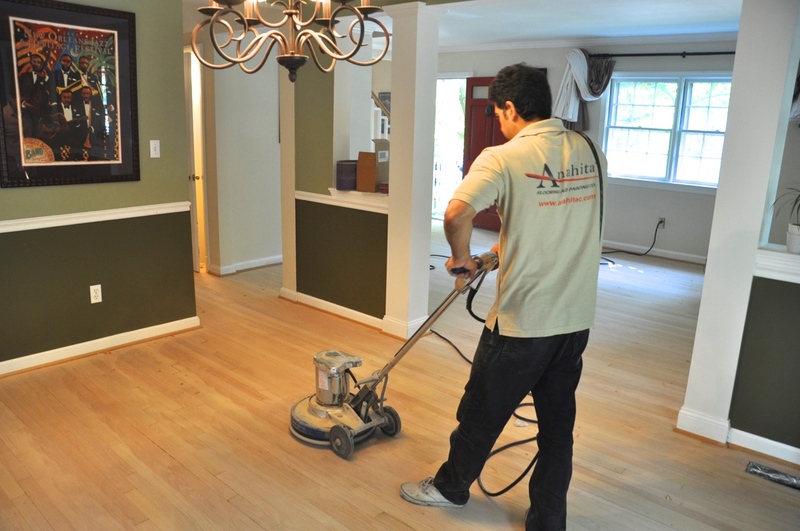 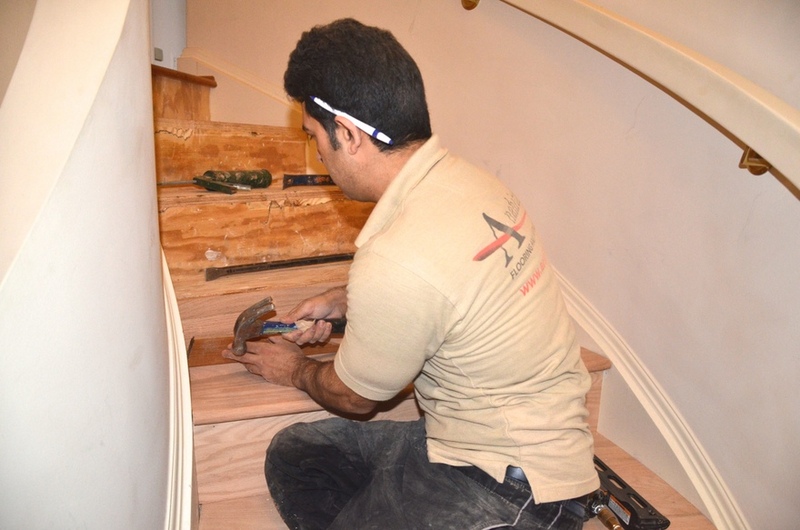 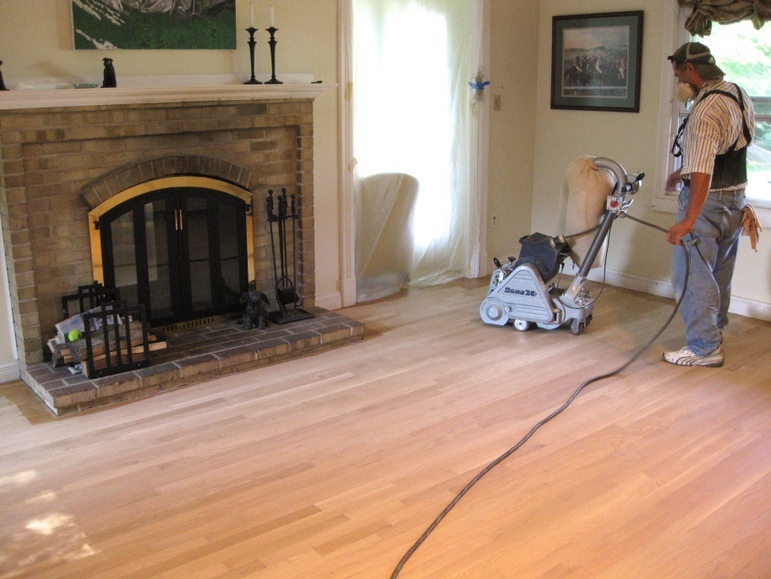 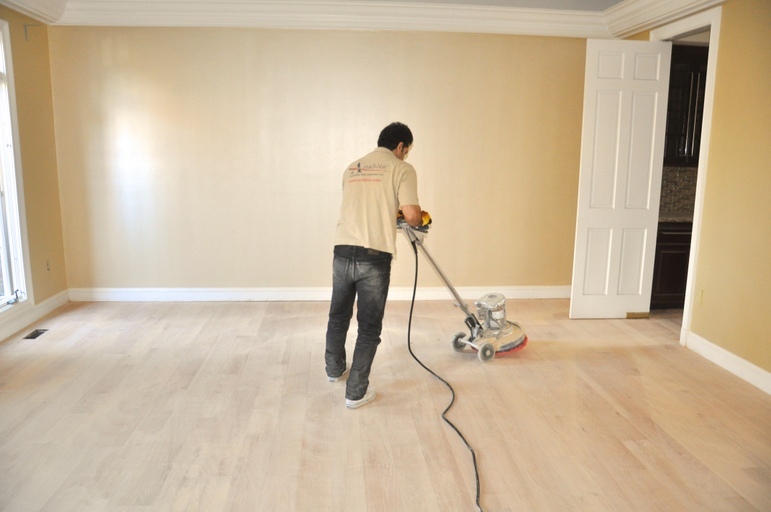 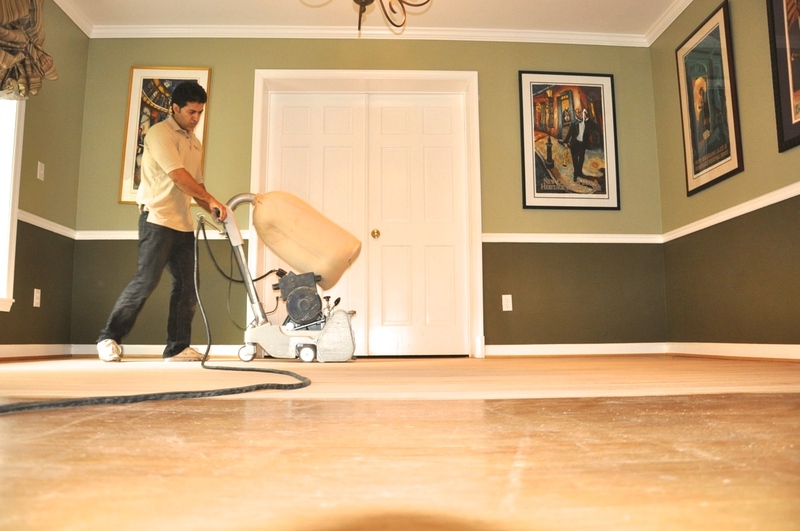 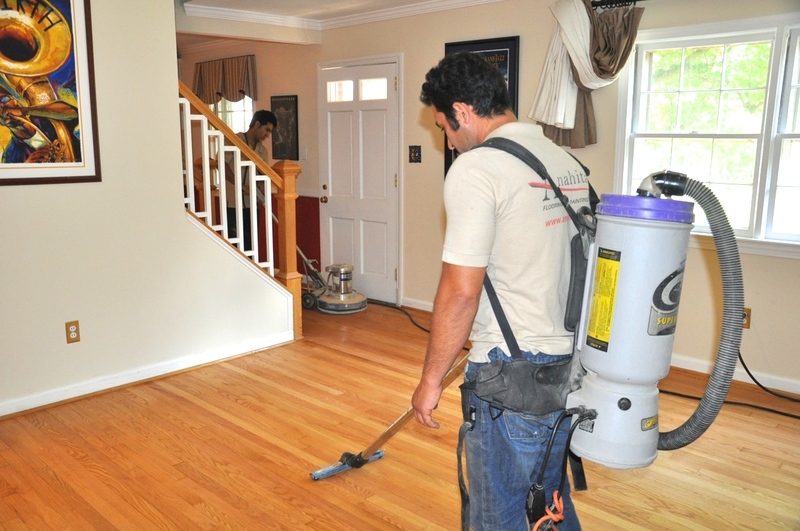 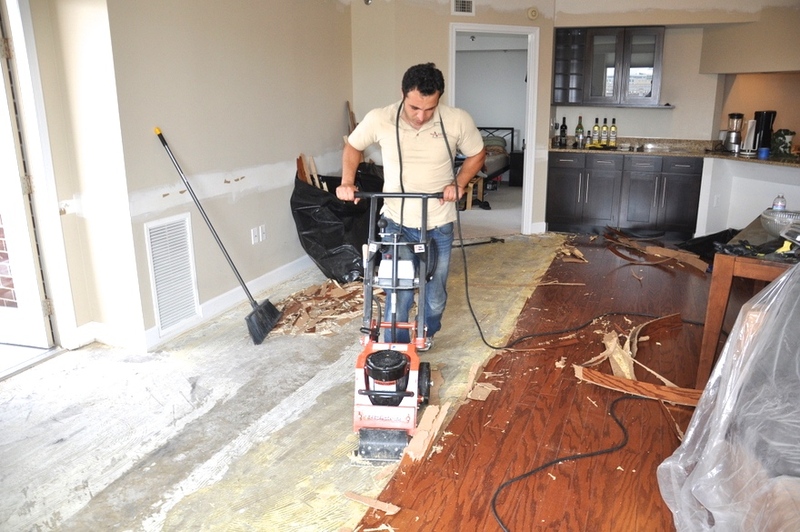 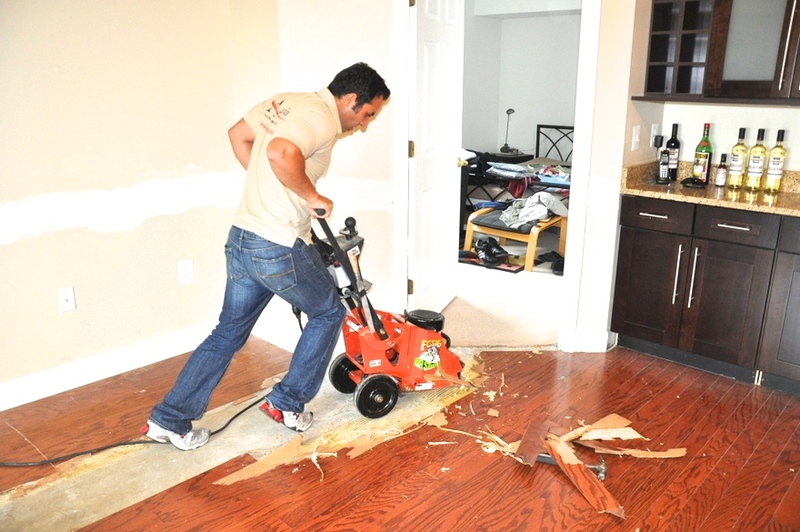 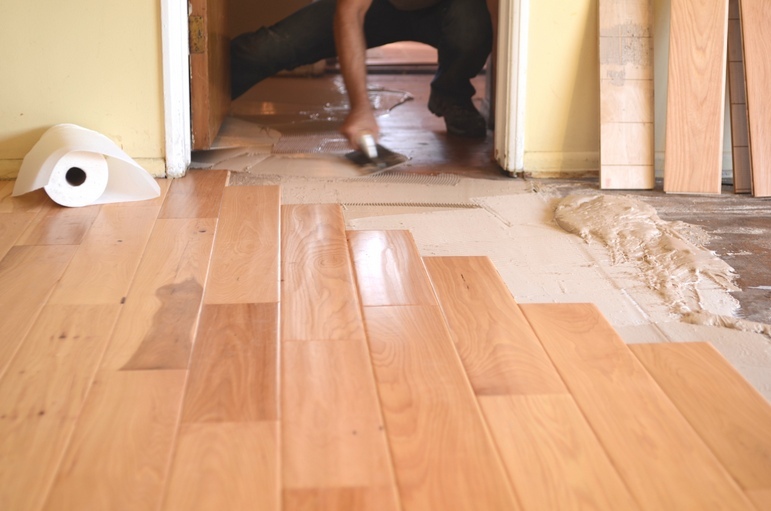 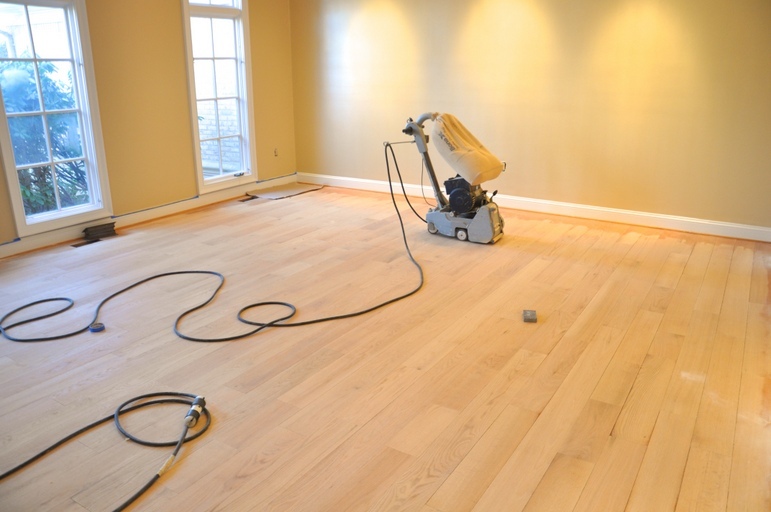 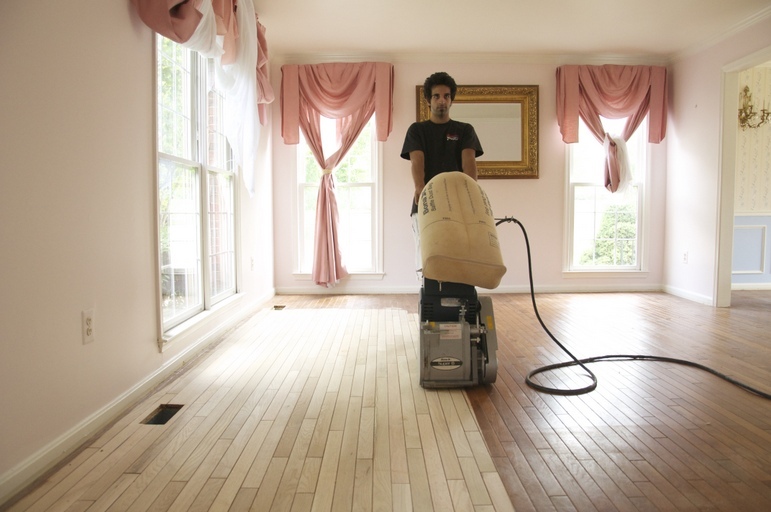 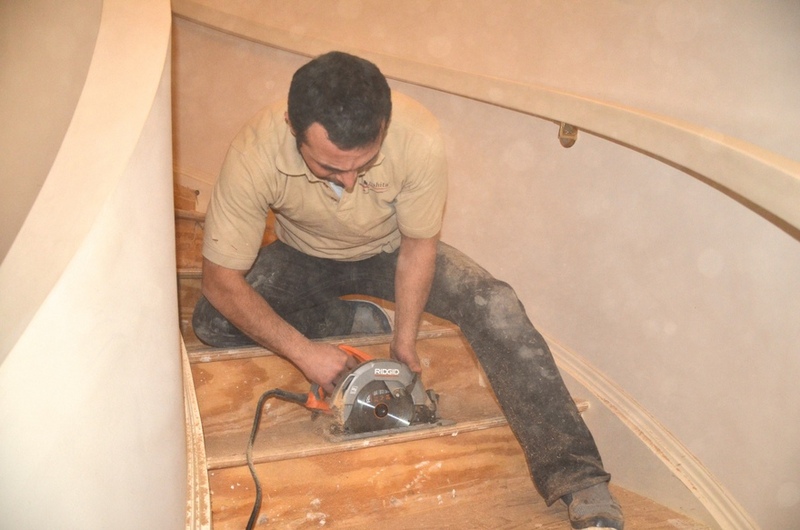 Our certified hardwood professionals are trained to identify if your hardwood floor can withstand a sand & refinishing project. 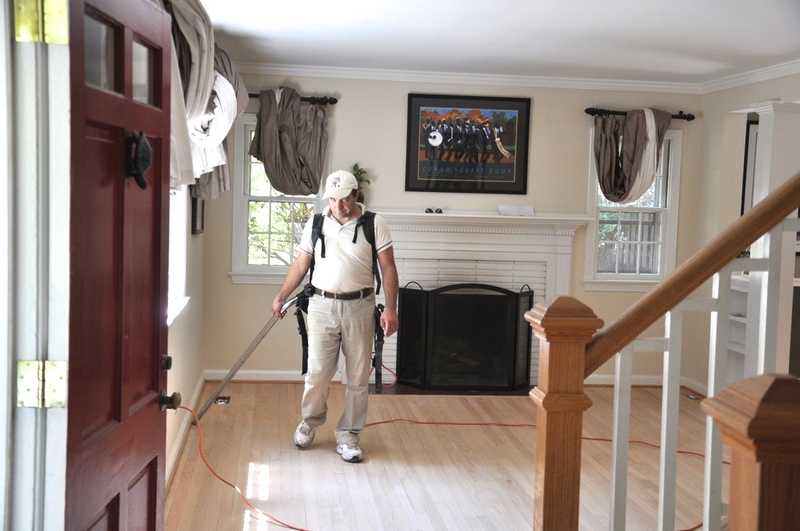 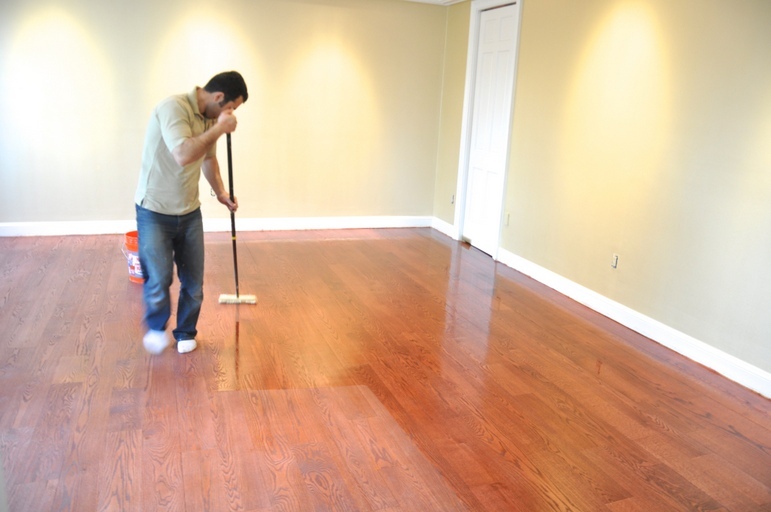 Now that your hardwood floor has been revitalized and renewed, there are specific protocols to follow in order to guarantee the longevity of your new hardwood floor fininsh: Do not use sheet vinyl or tile floor care products on wood floors. 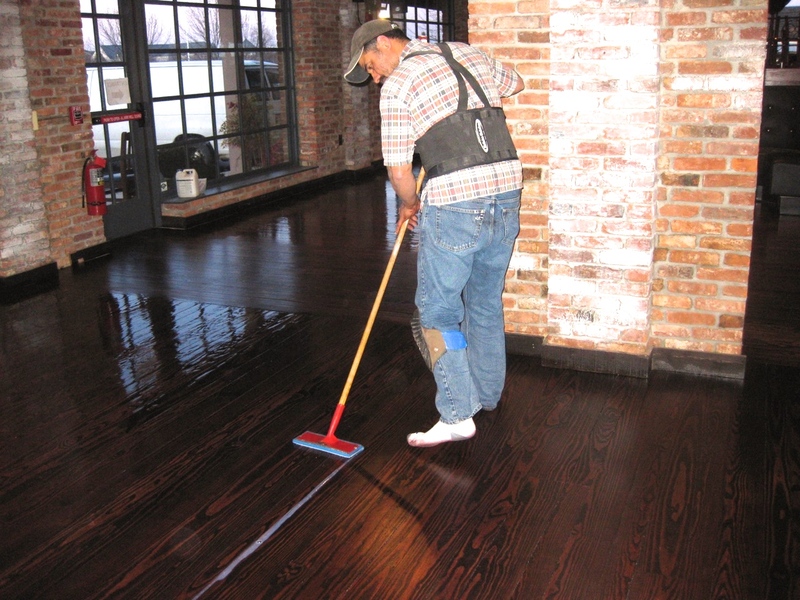 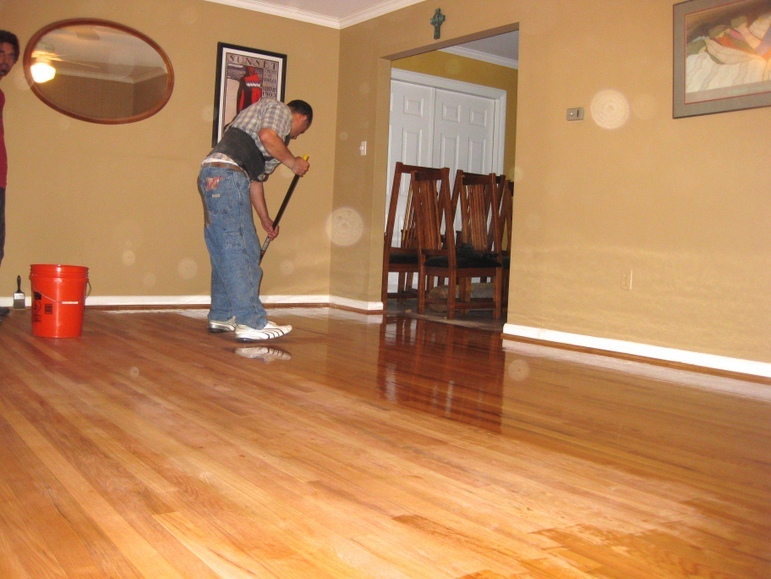 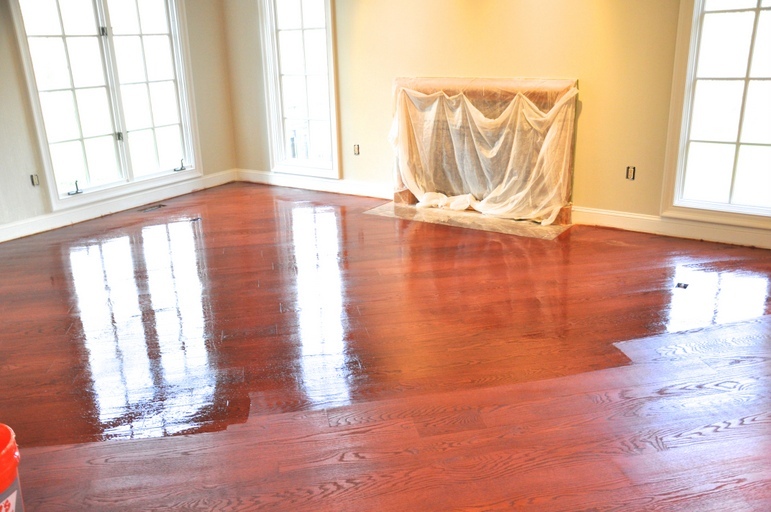 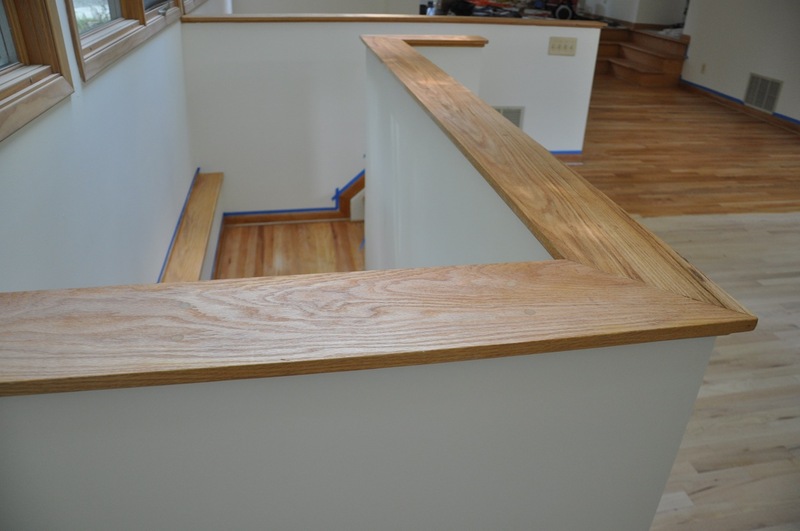 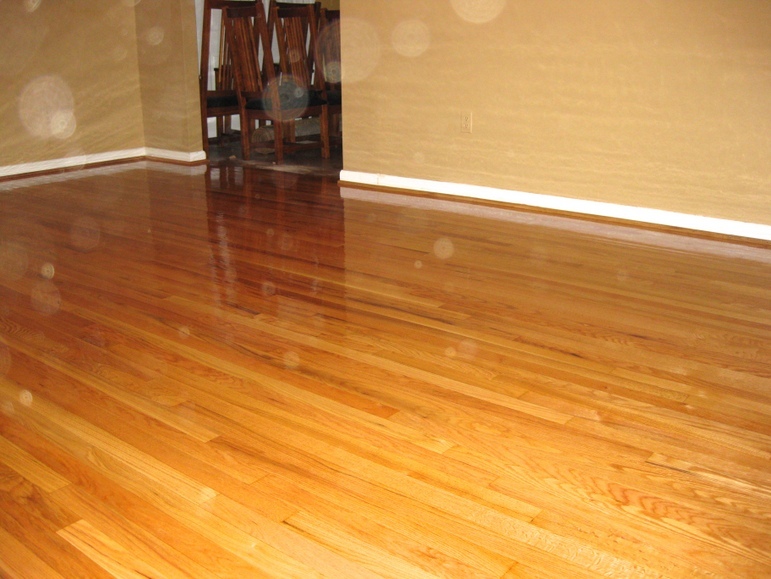 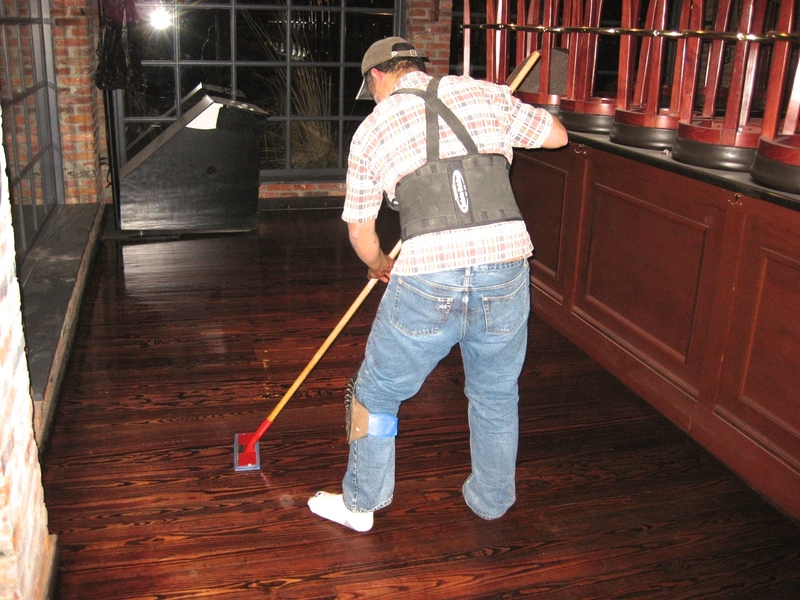 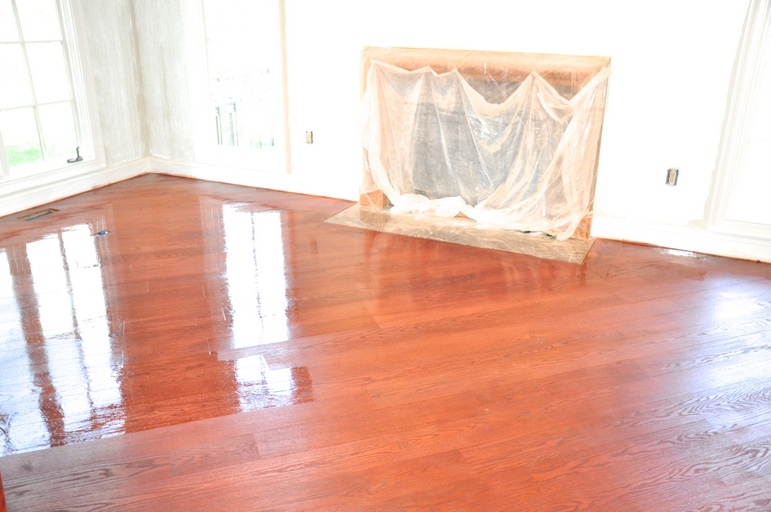 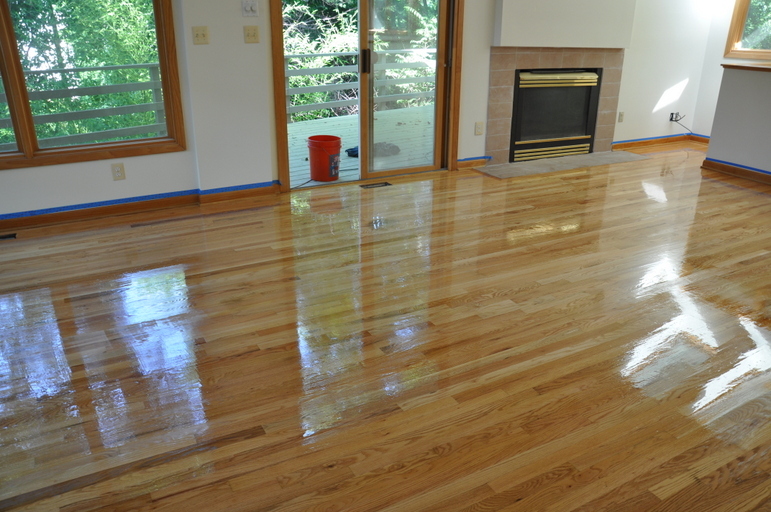 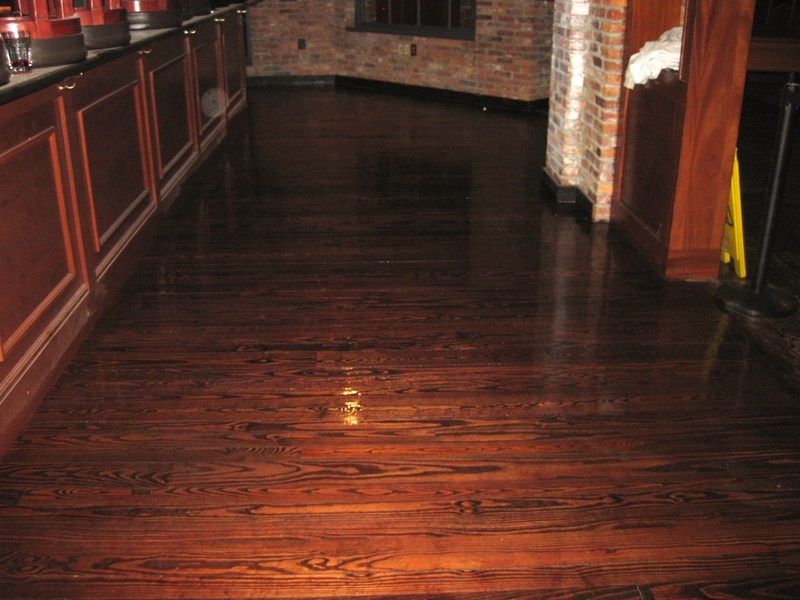 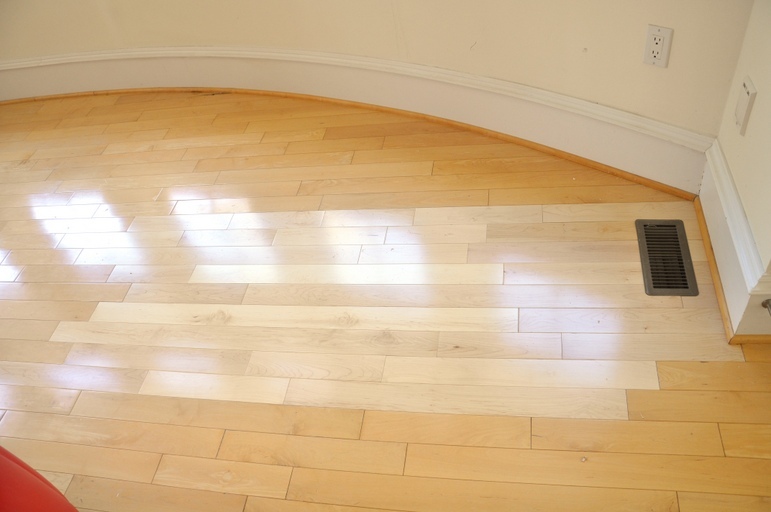 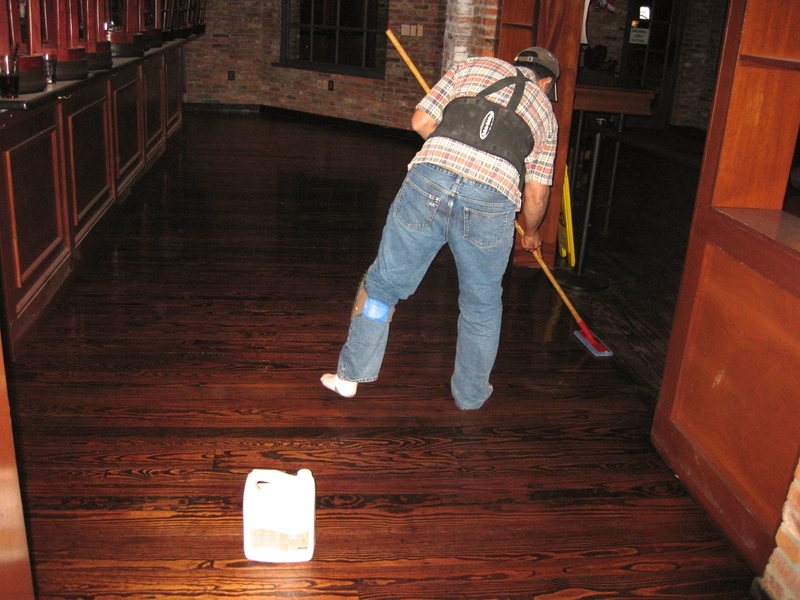 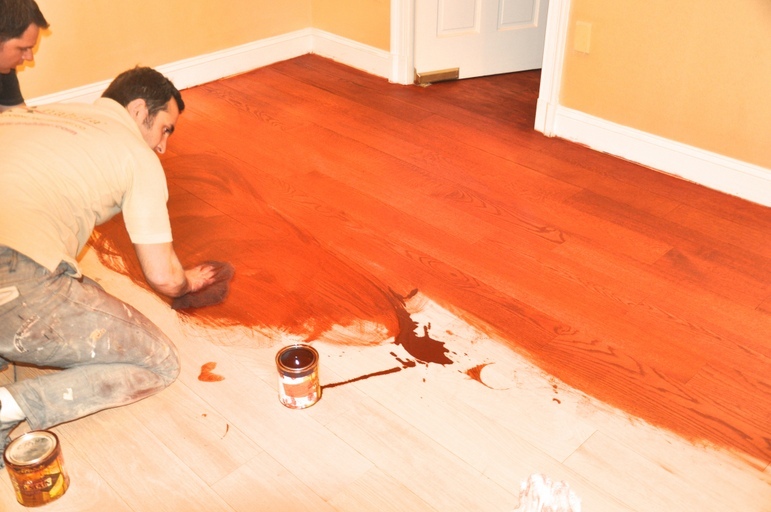 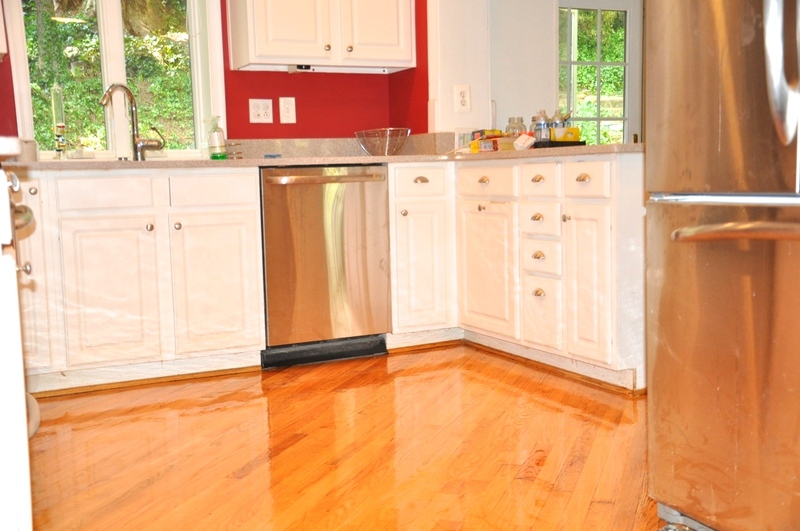 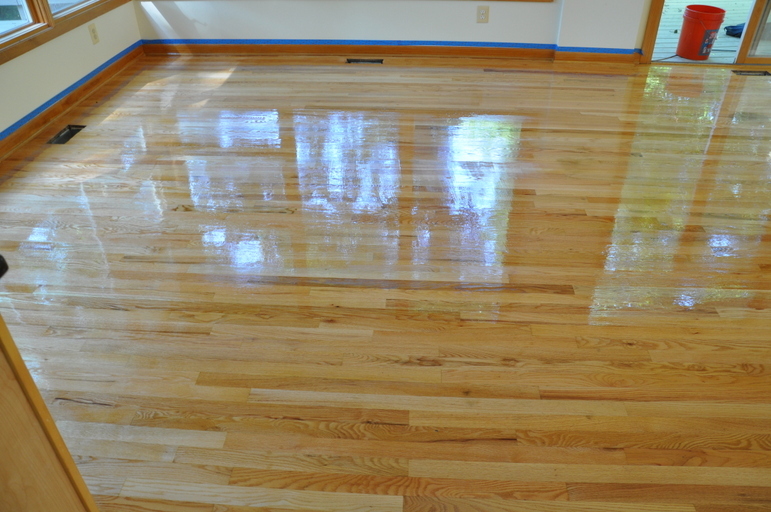 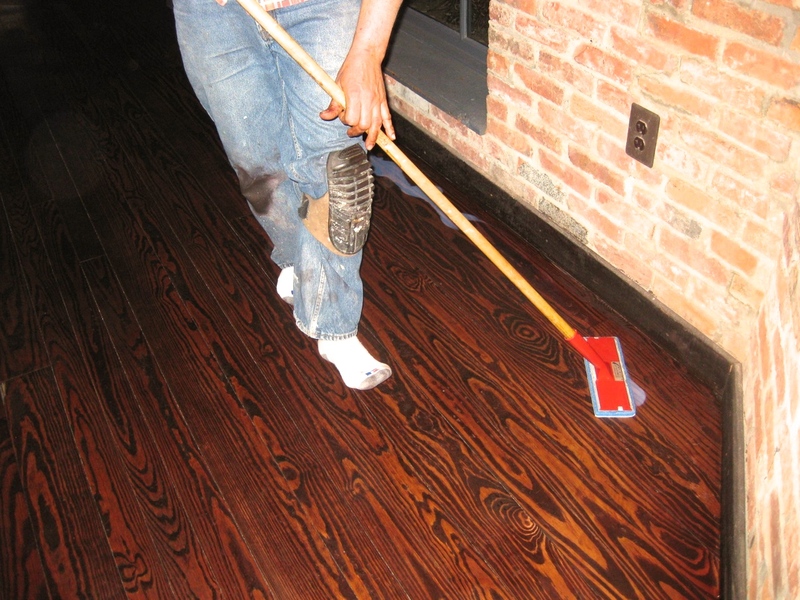 Self-polishing acrylic waxes cause wood to become slippery and appear dull quickly. 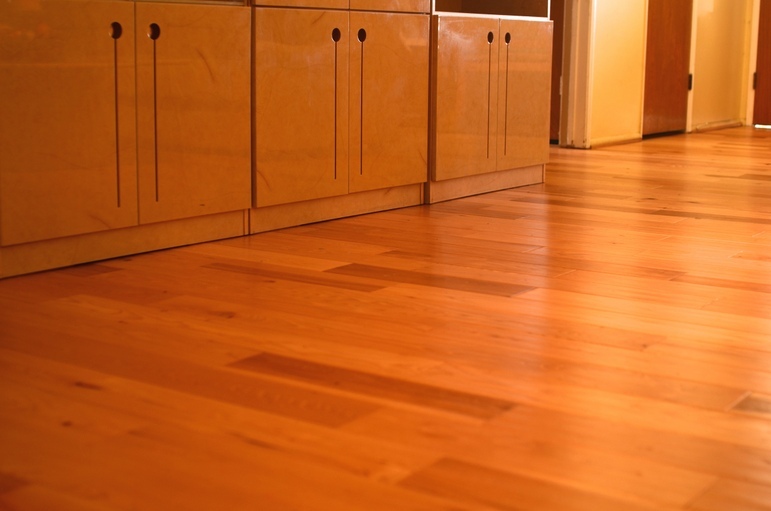 Avoid walking on your wood floors with cleats, sports shoes and high heels. 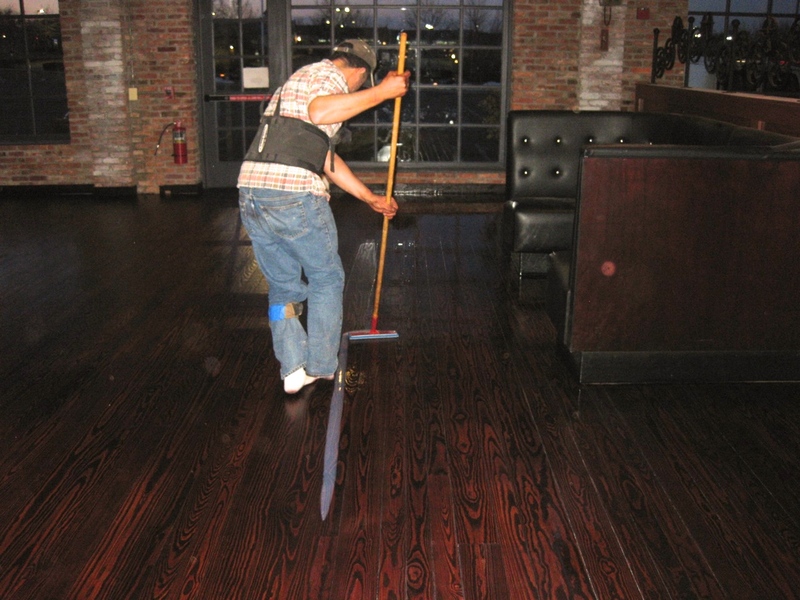 A 125-pound woman walking in high heels has an impact of 2,000 pounds per square inch. 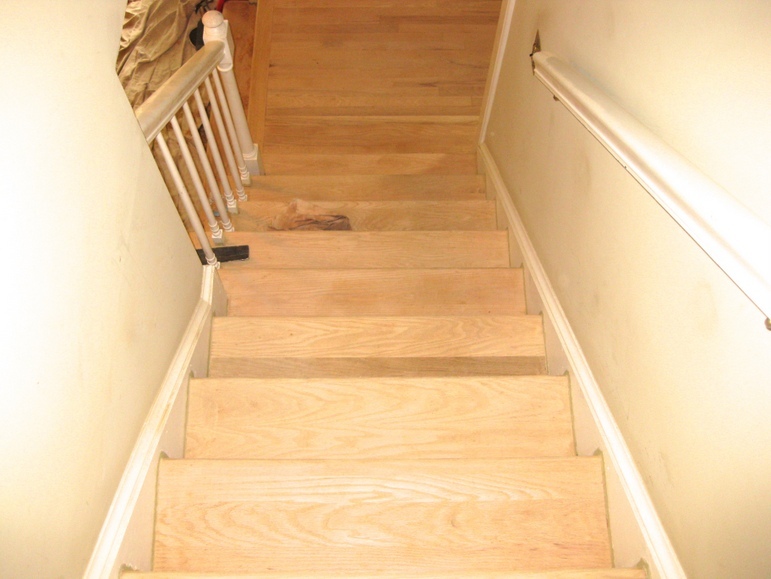 An exposed heel nail from a shoe can exert up to 8,000 pounds per square inch. 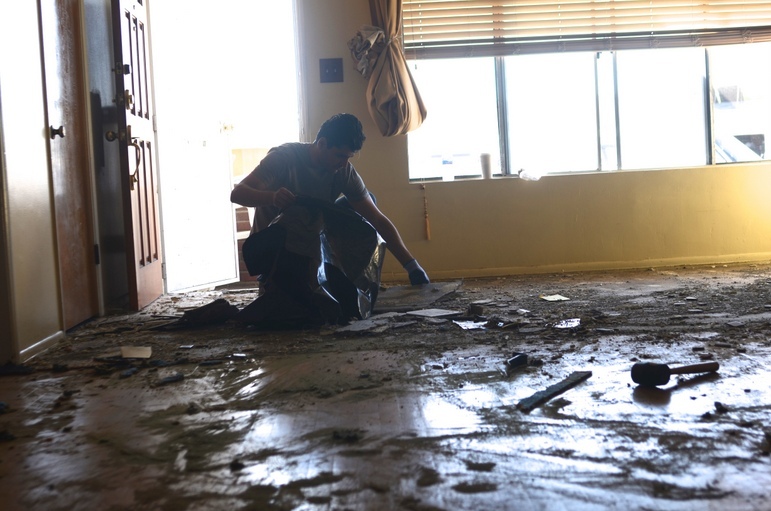 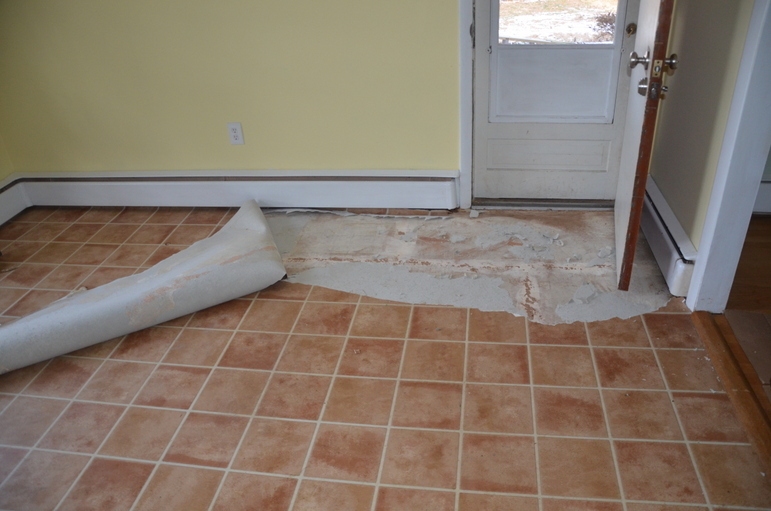 This kind of impact can dent any floor surface. 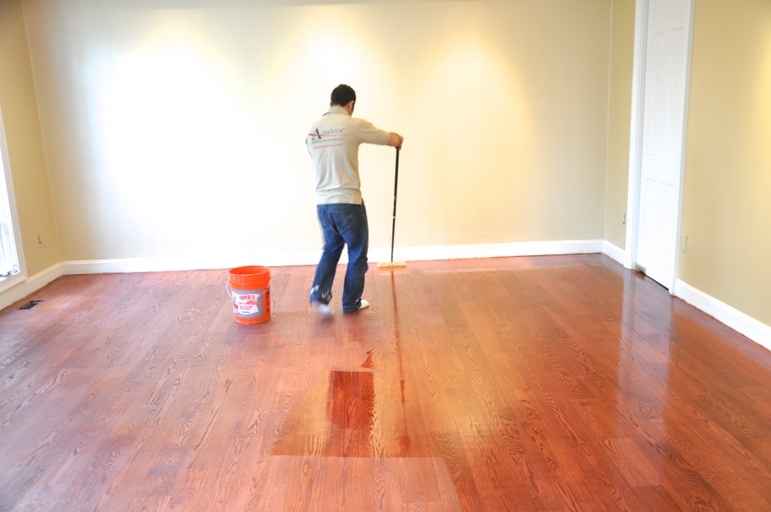 Now that your hardwood floor has been revitalized and renewed, there are specific protocols to follow in order to guarantee the longevity of your new hardwood floor fininsh: Do not use sheet vinyl or tile floor care products on wood floors. 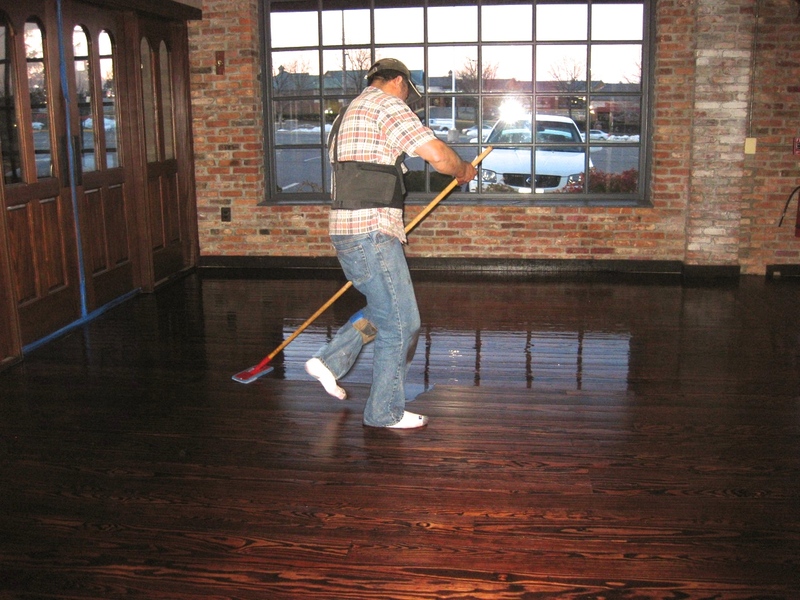 Self-polishing acrylic waxes cause wood to become slippery and appear dull quickly. 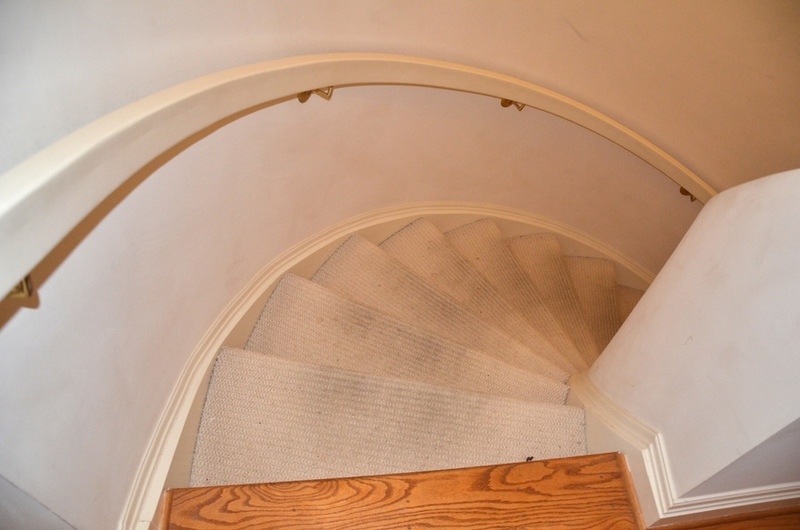 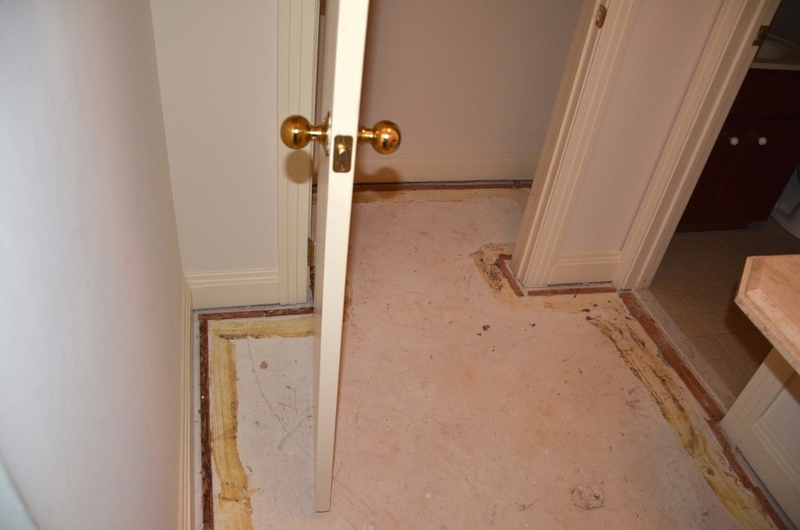 Use throw rugs both inside and outside doorways to help prevent grit, dirt and other debris from being tracked onto your wood floors. 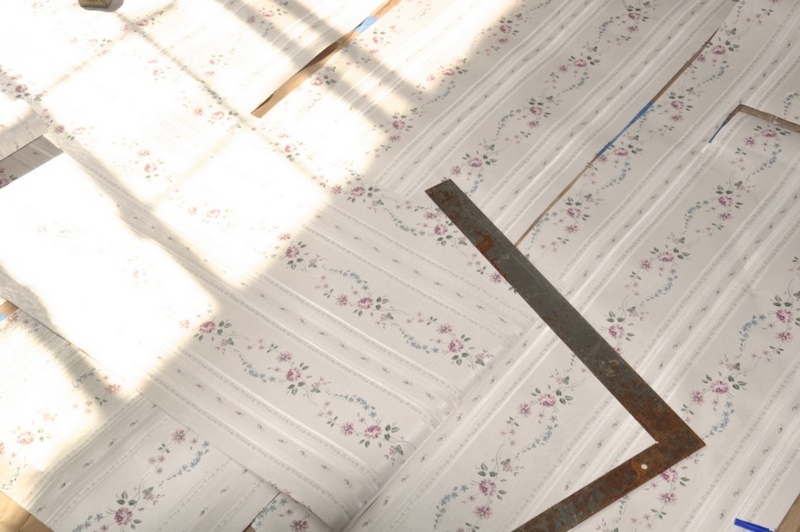 This will prevent scratching. 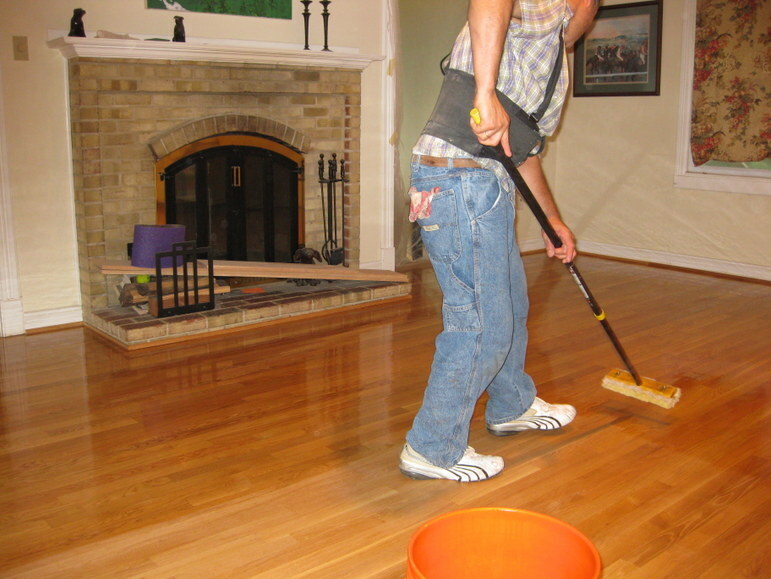 Do not wet-mop a wood floor. 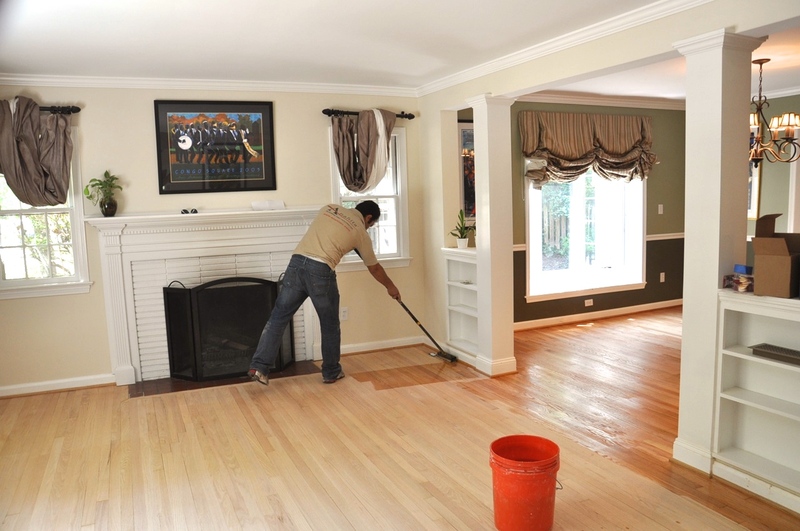 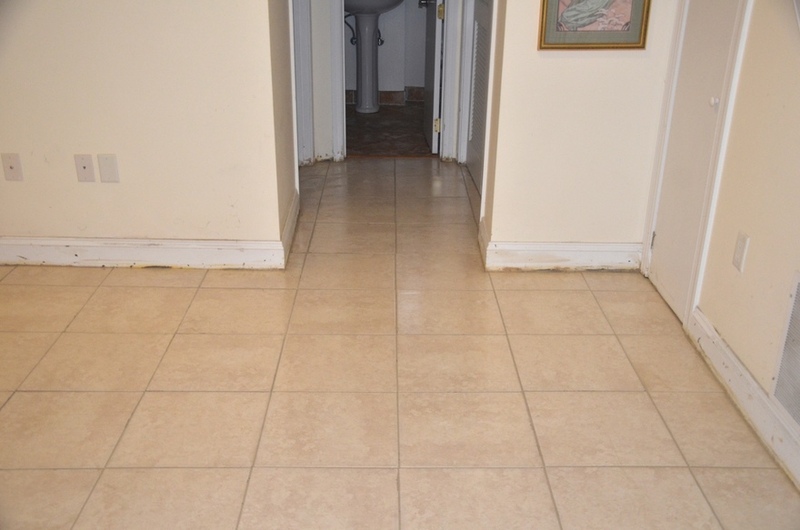 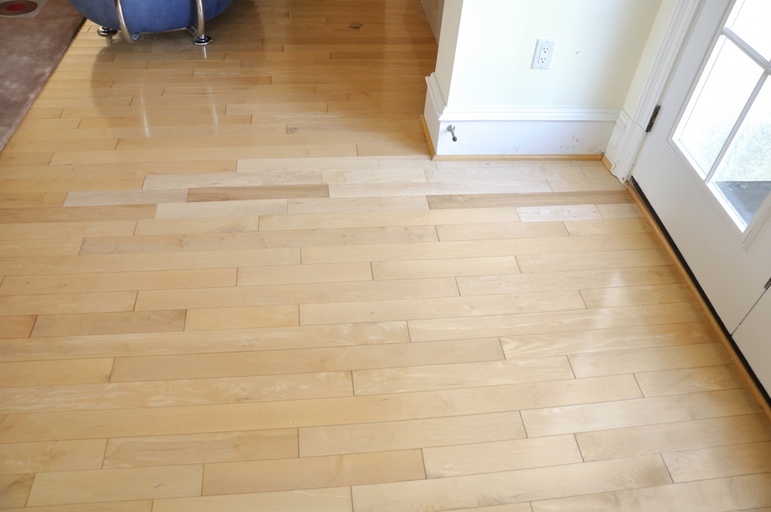 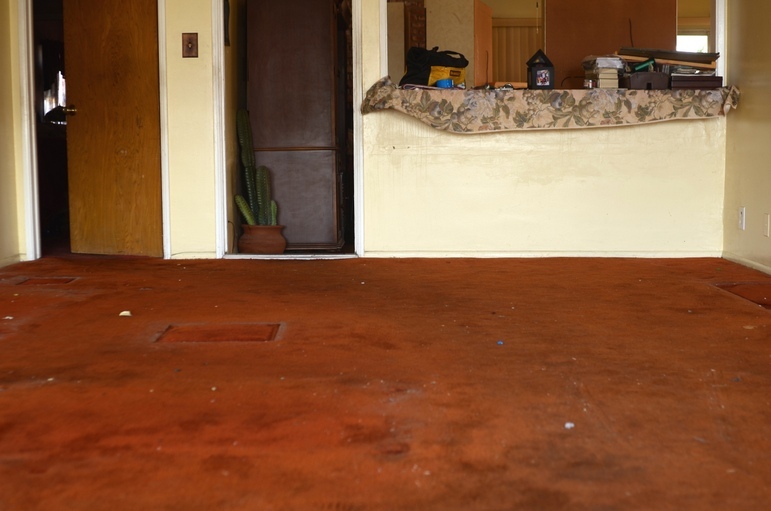 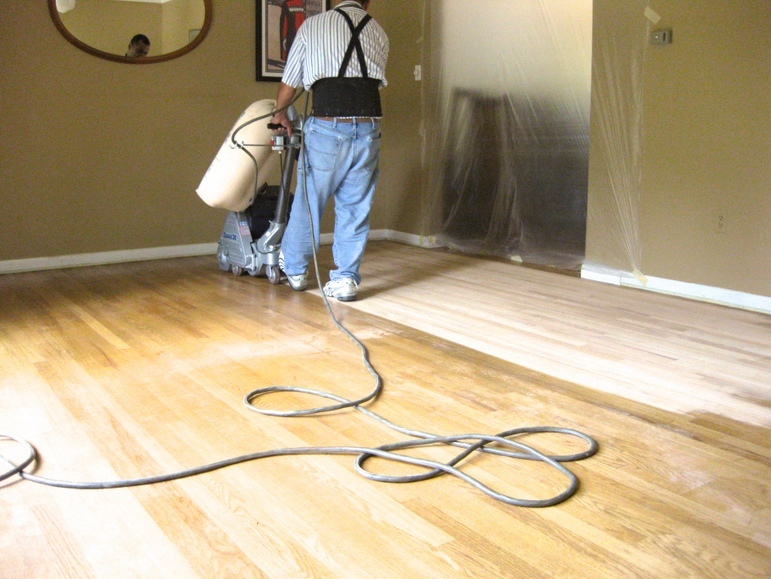 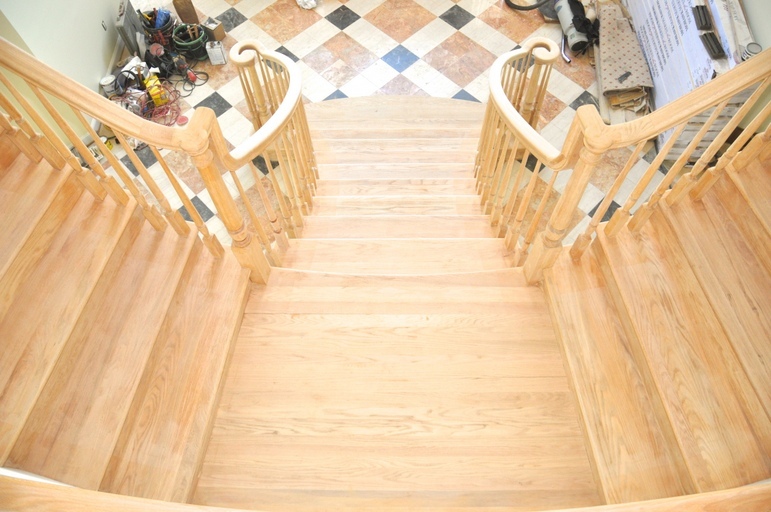 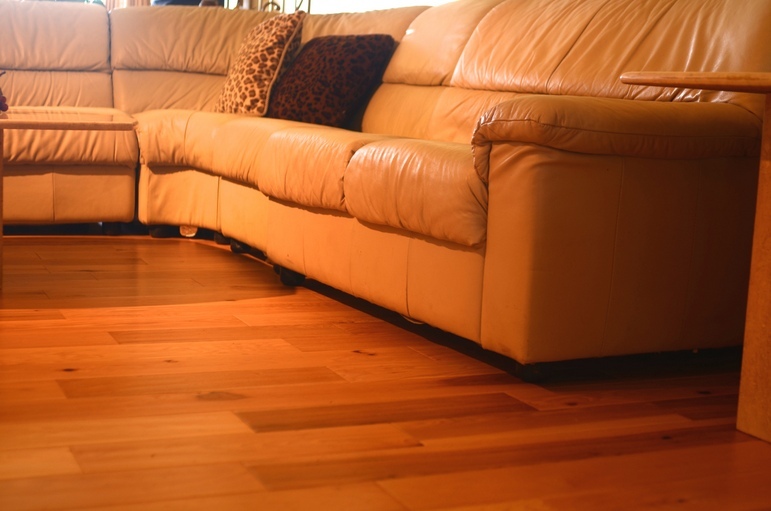 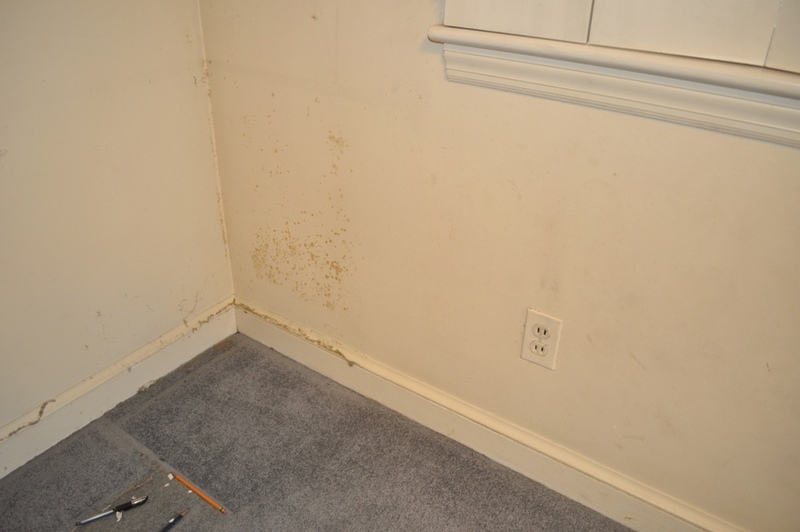 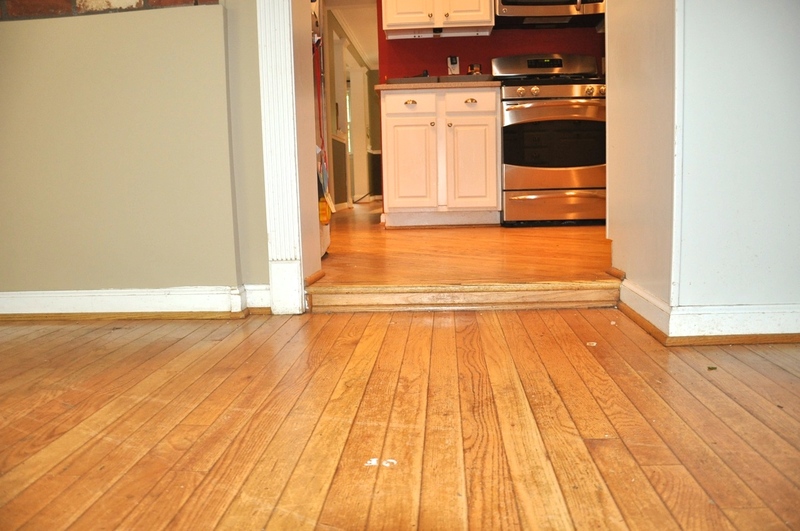 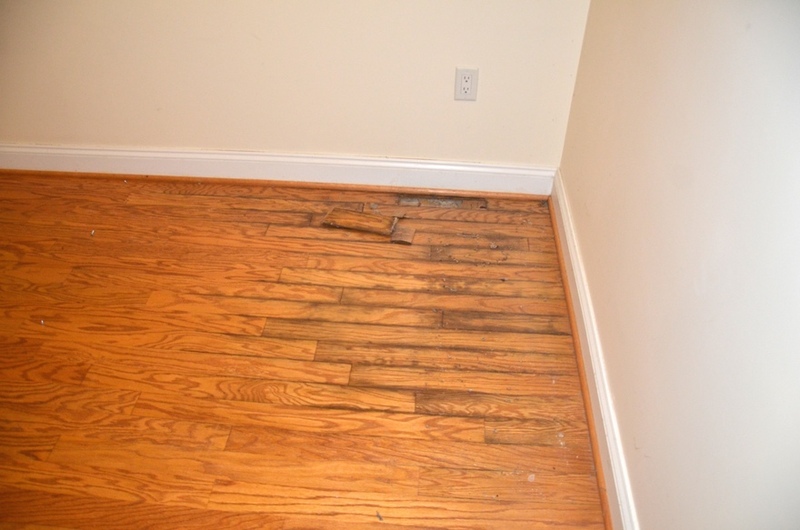 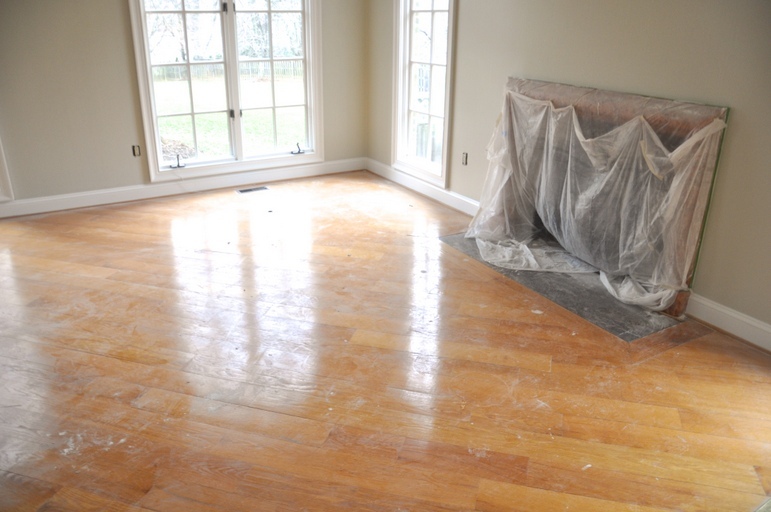 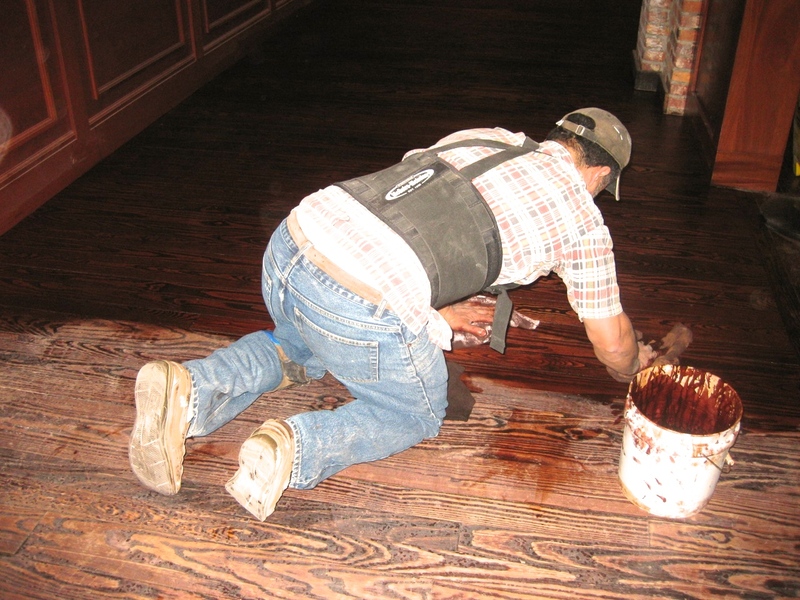 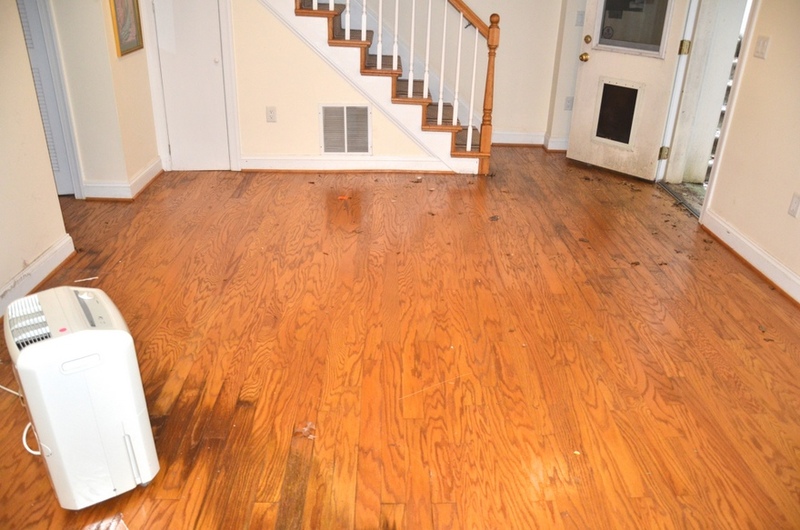 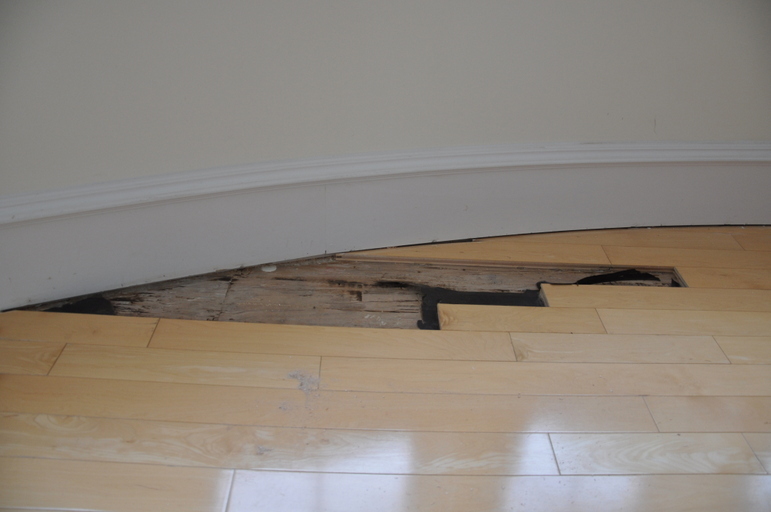 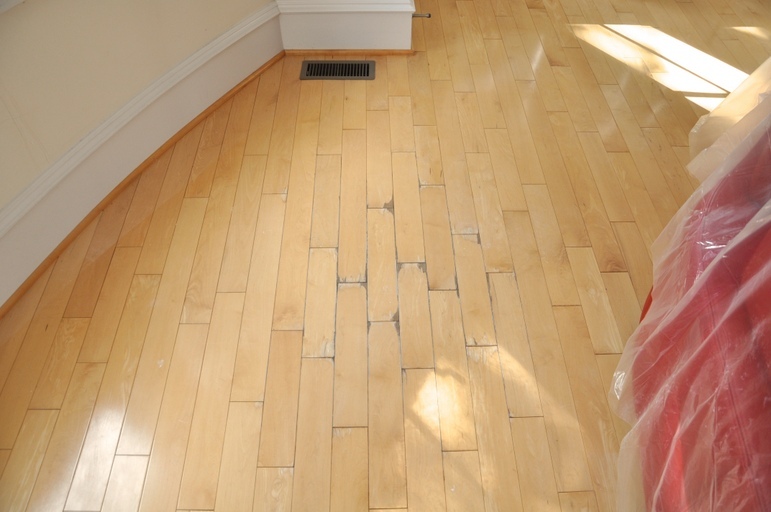 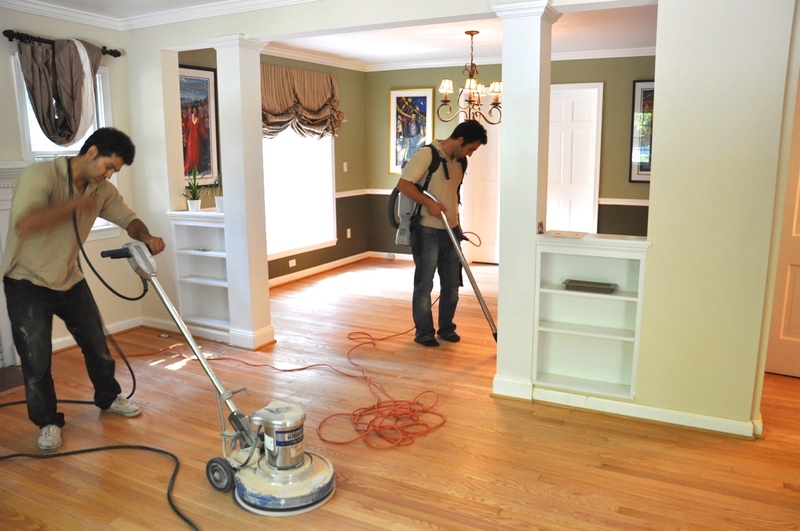 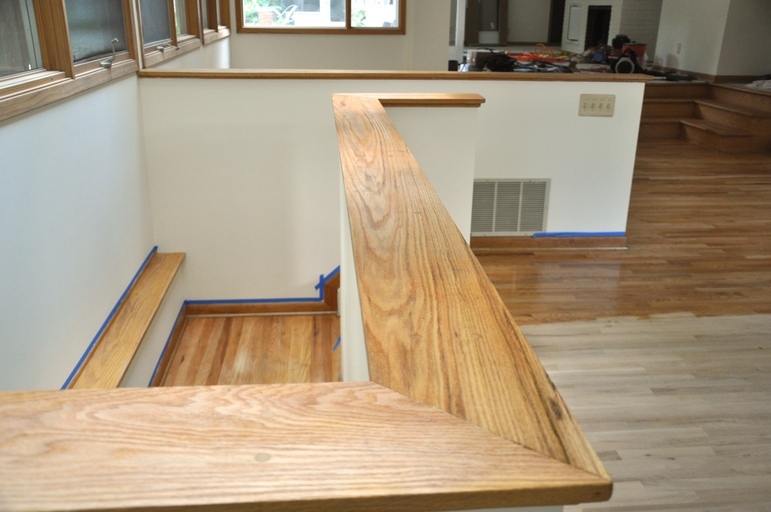 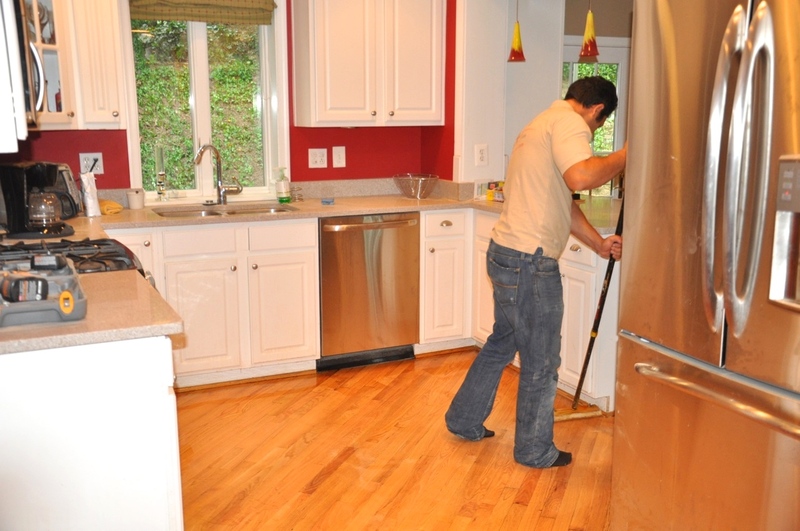 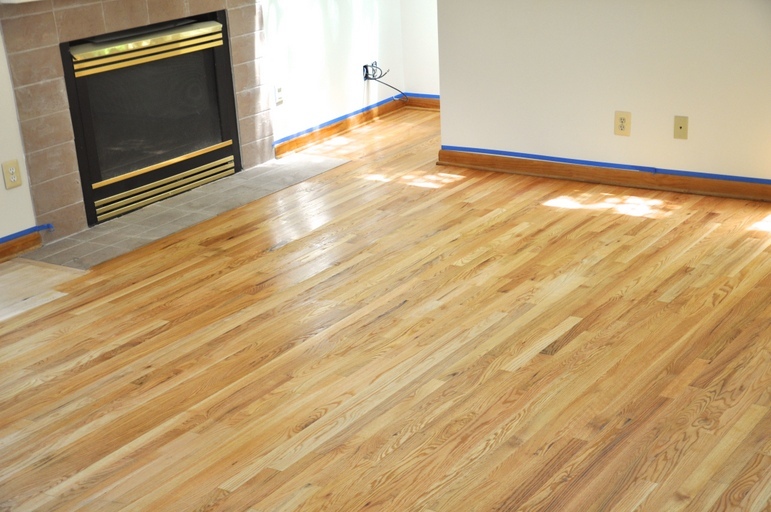 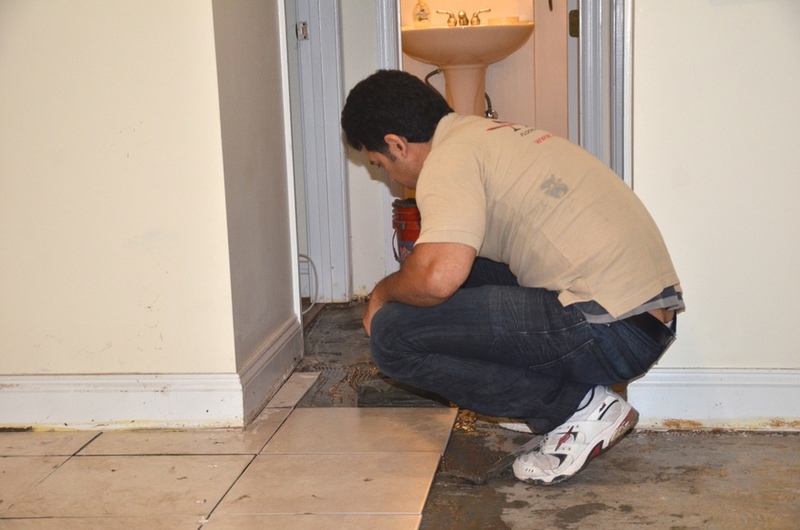 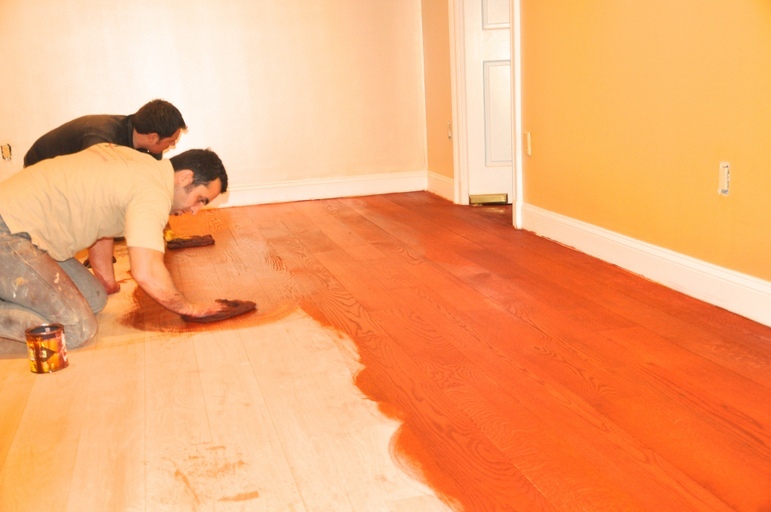 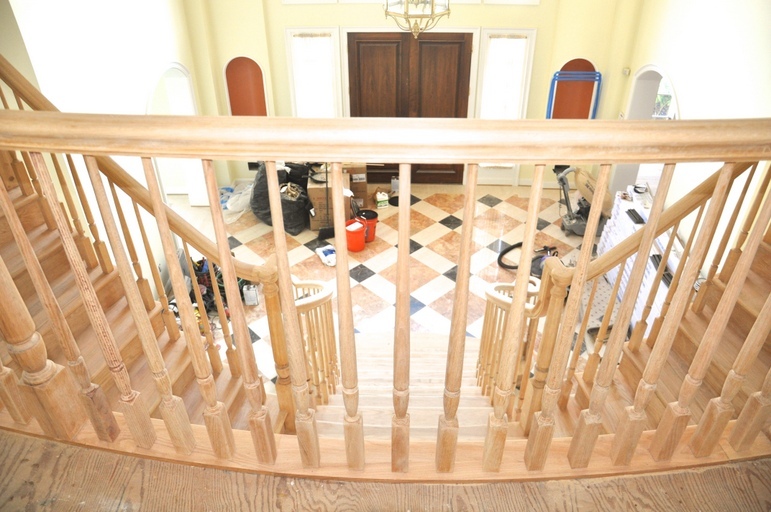 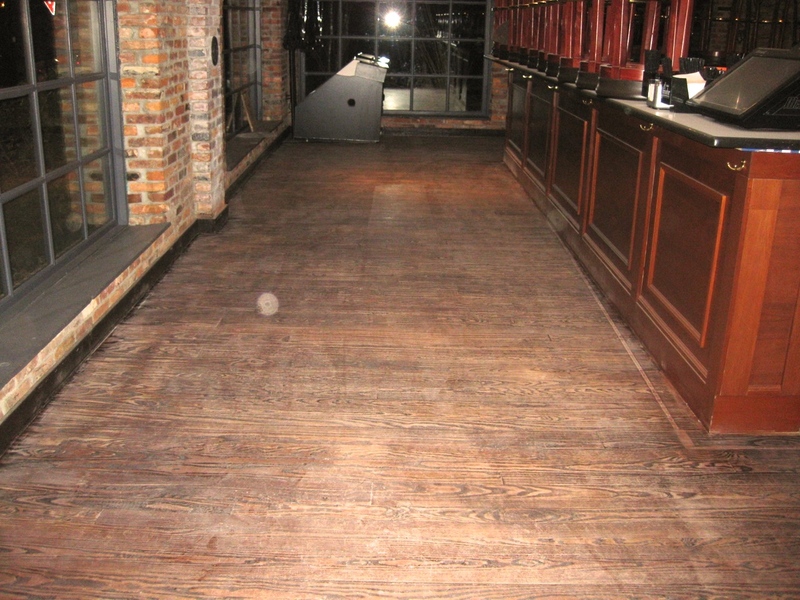 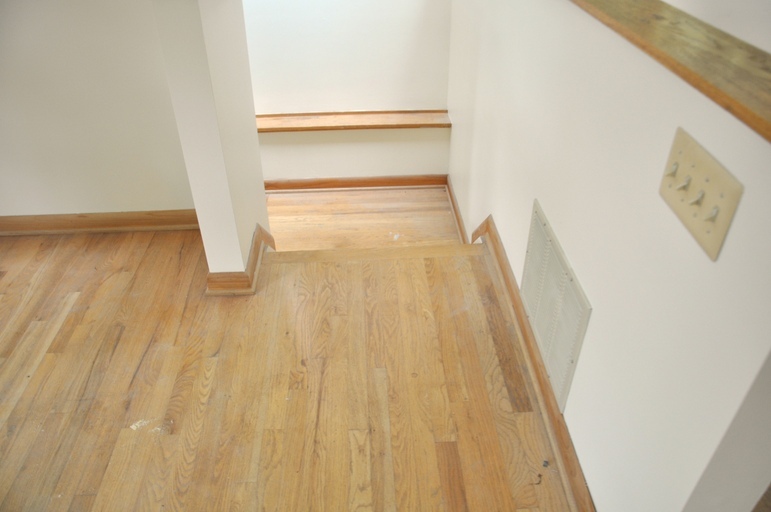 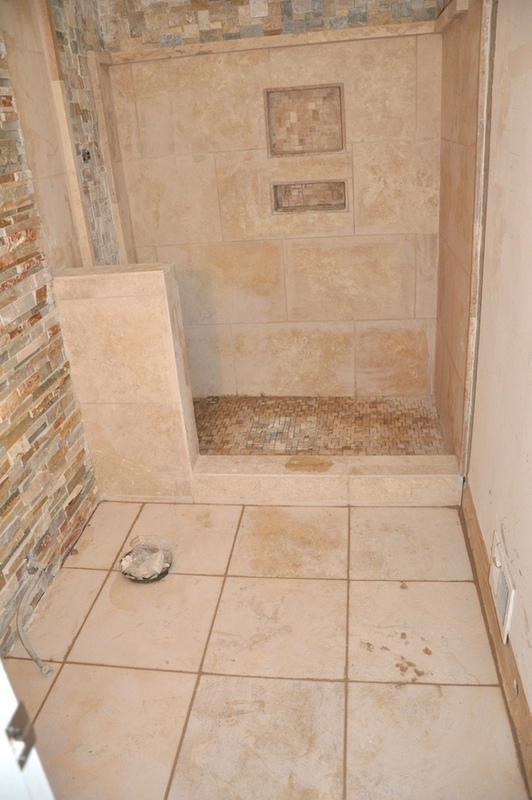 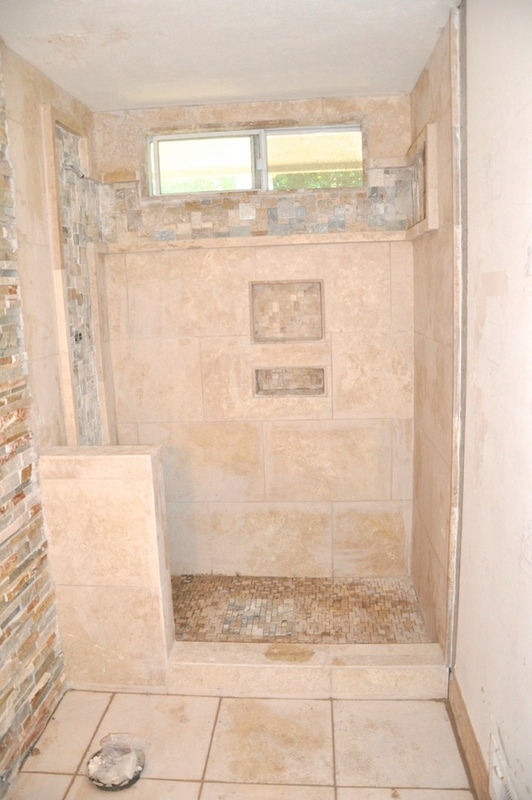 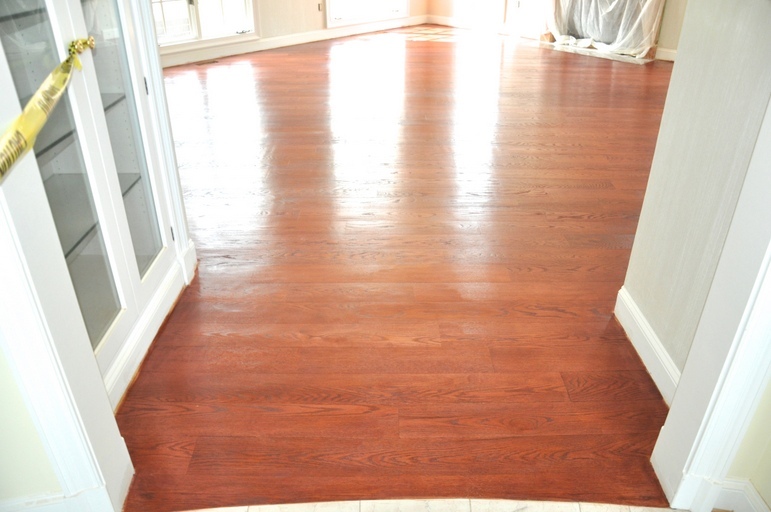 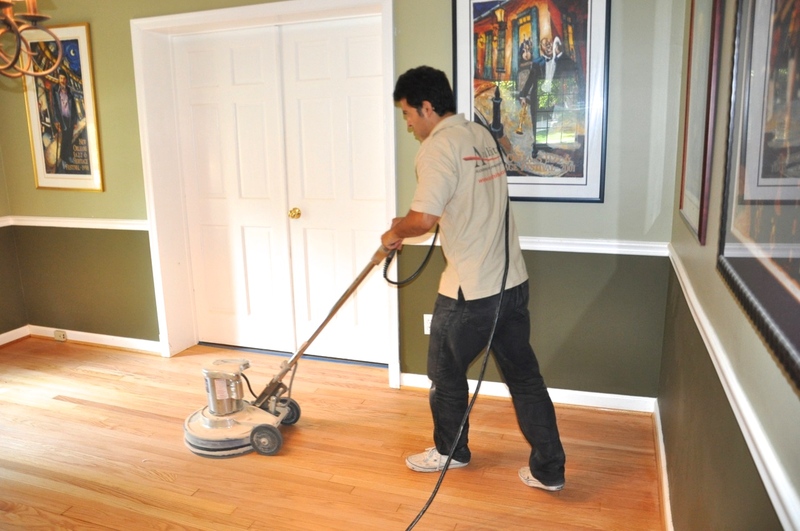 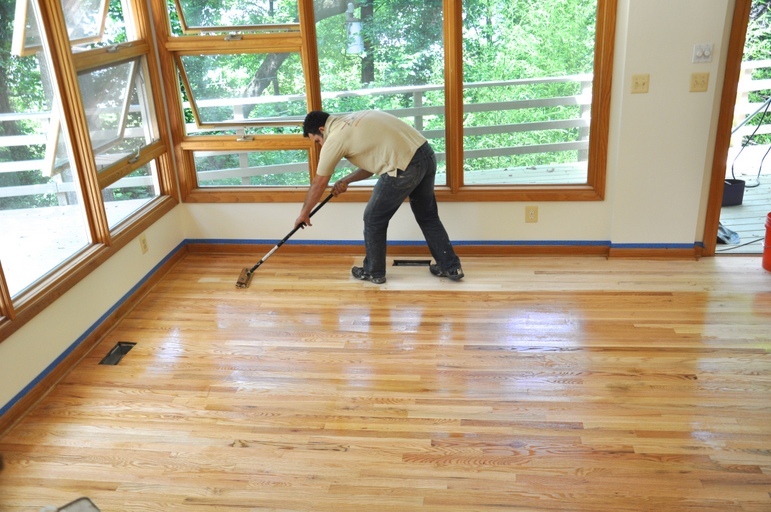 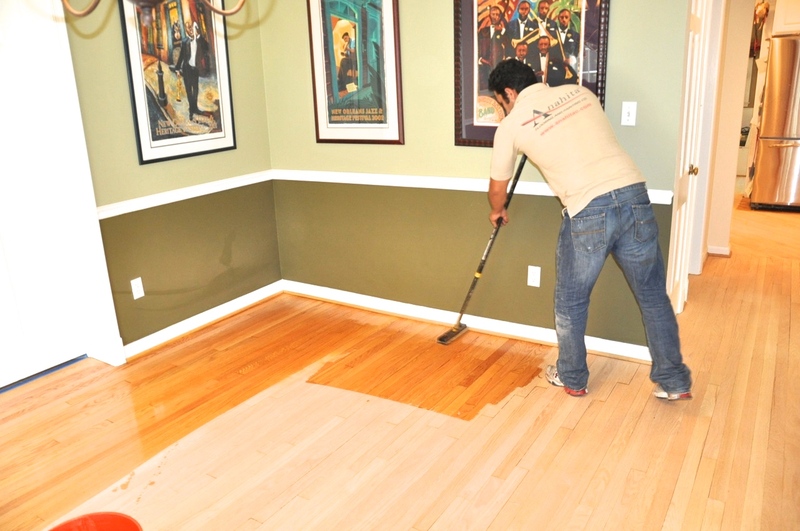 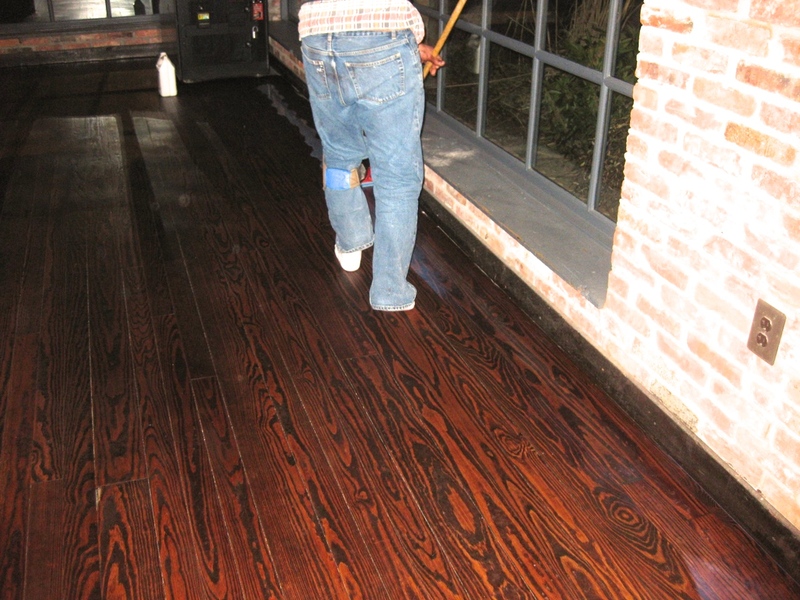 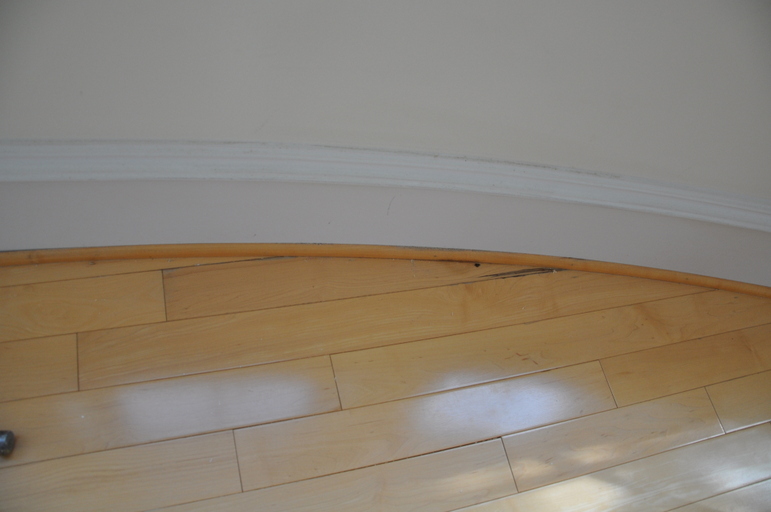 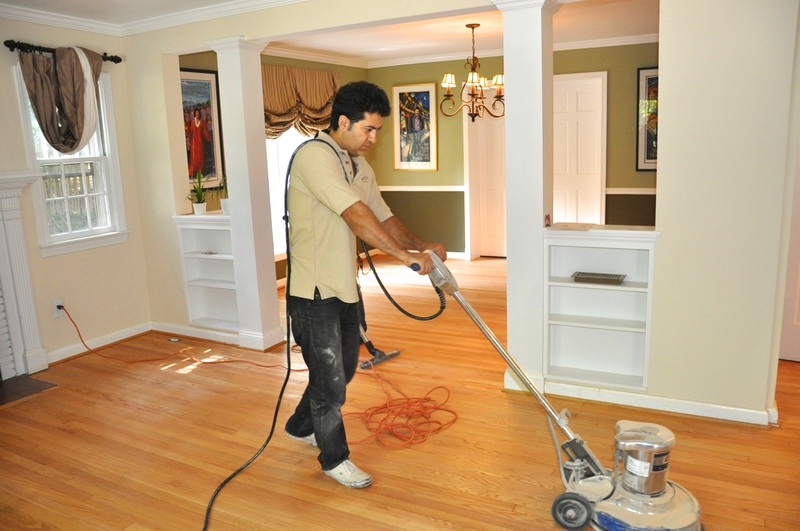 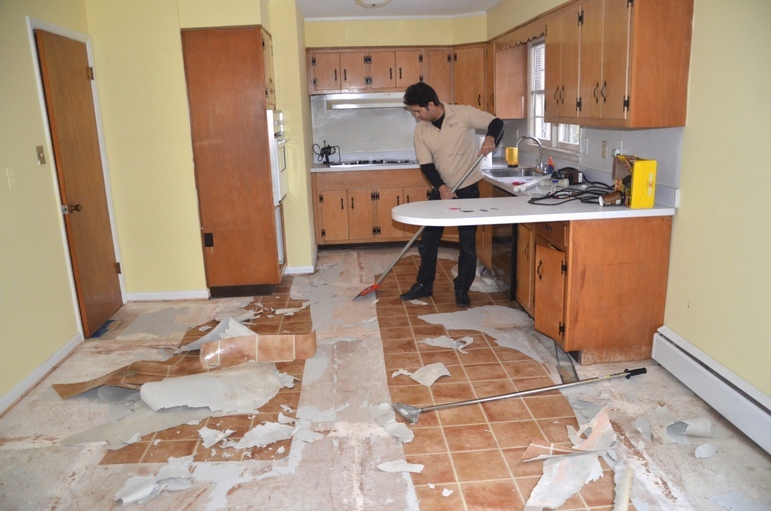 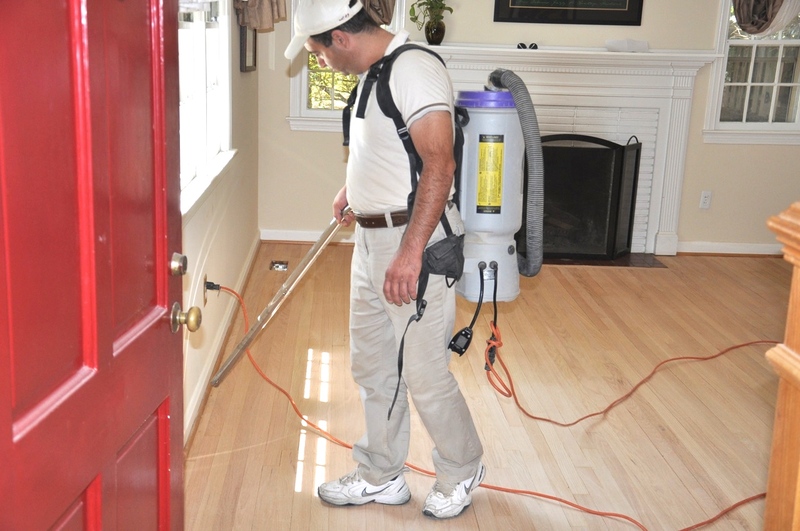 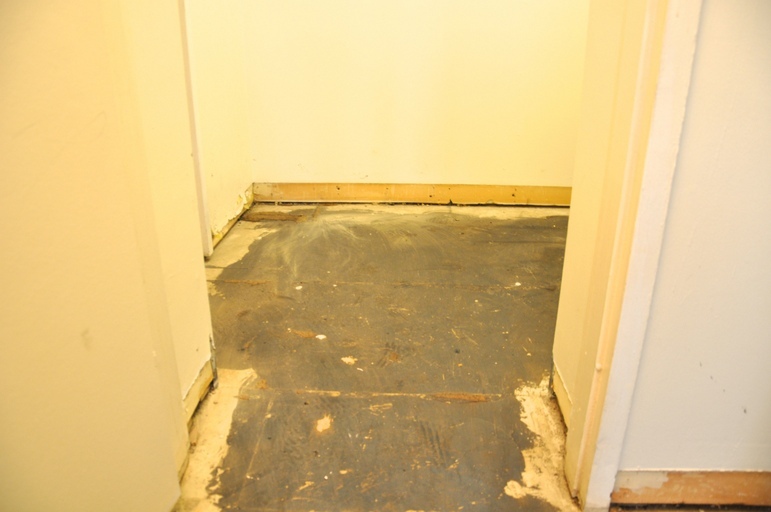 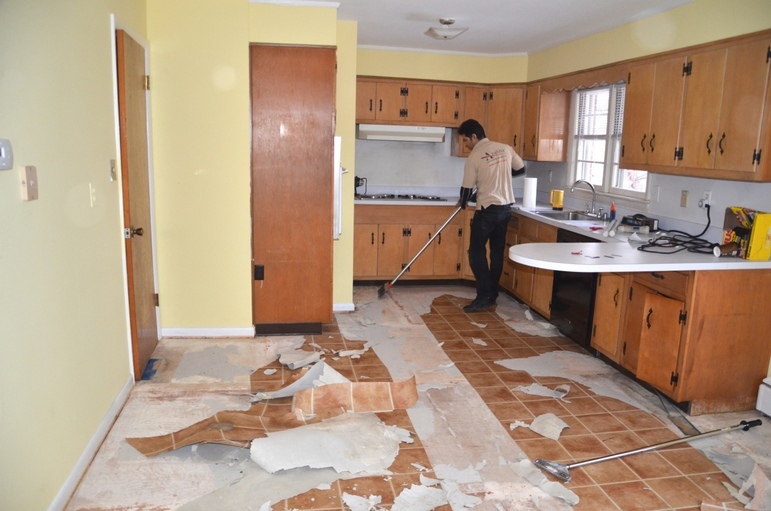 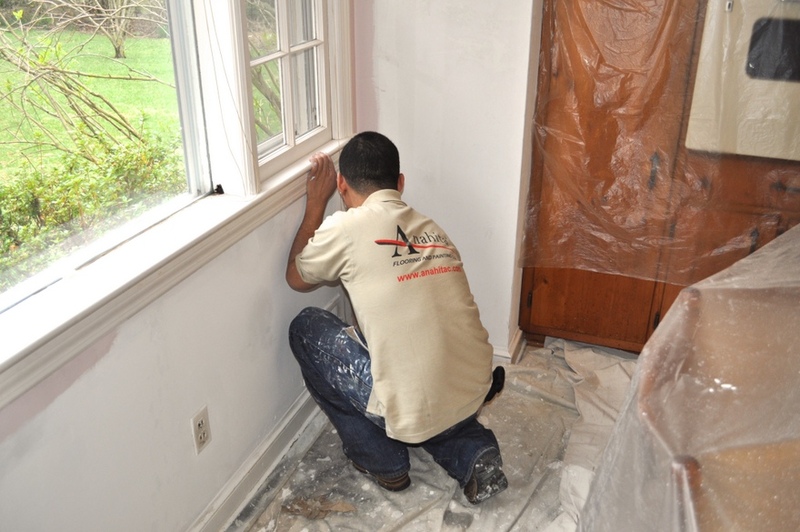 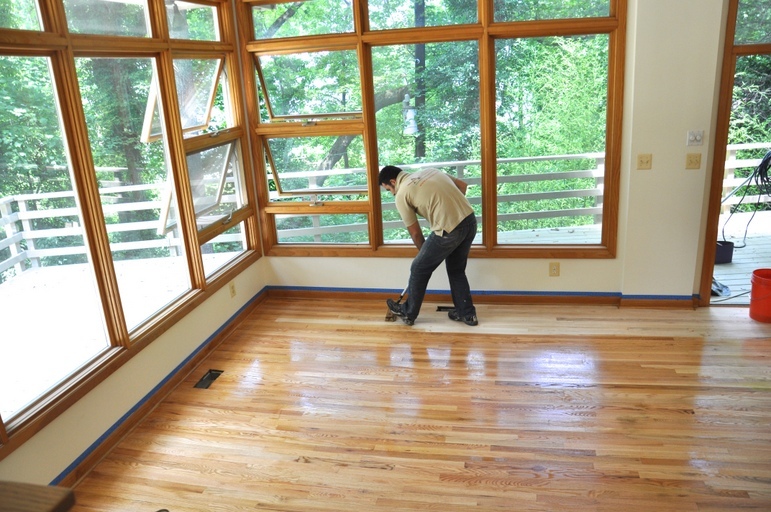 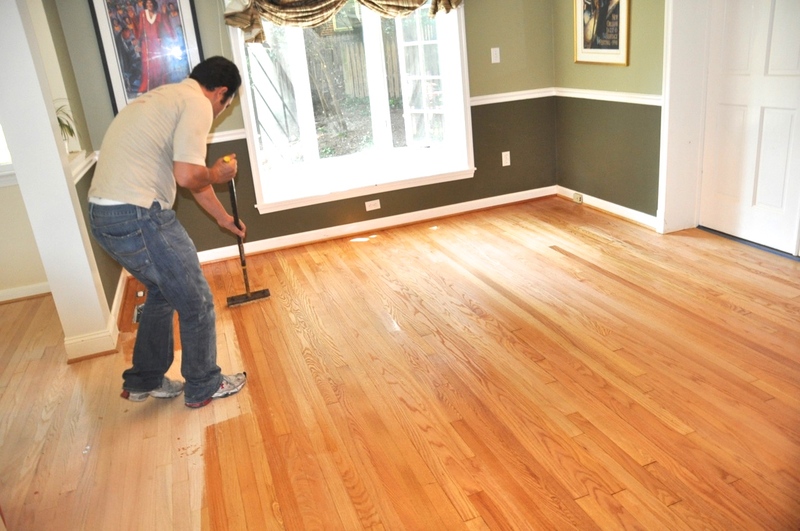 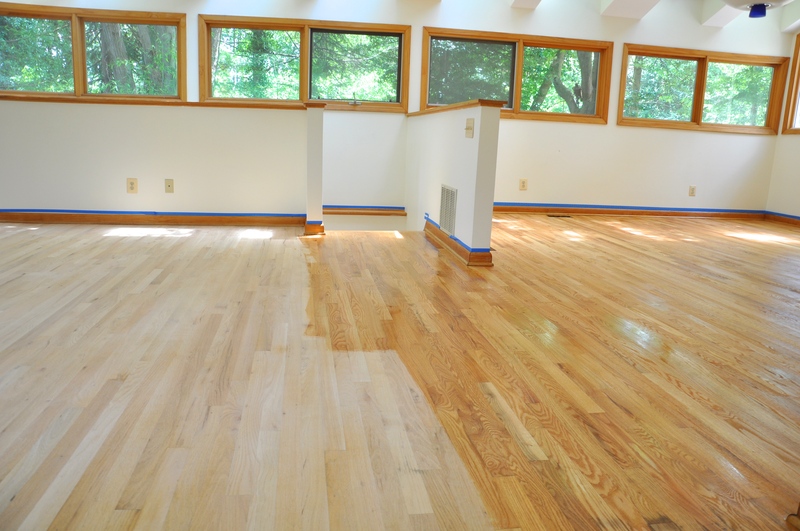 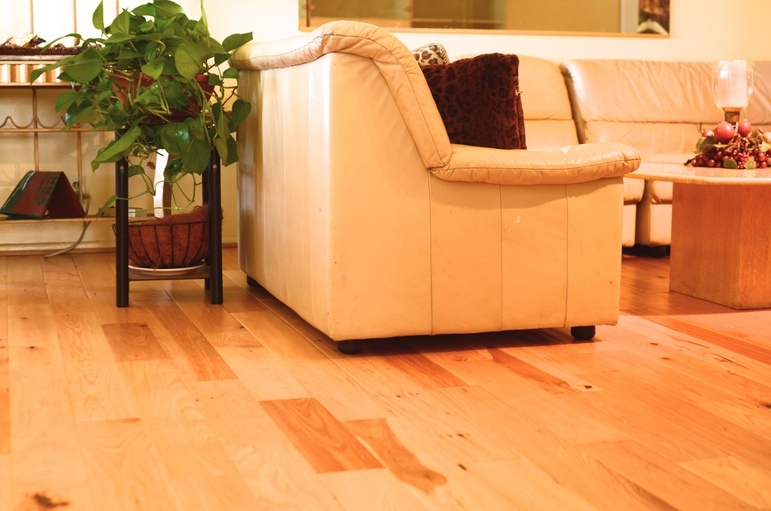 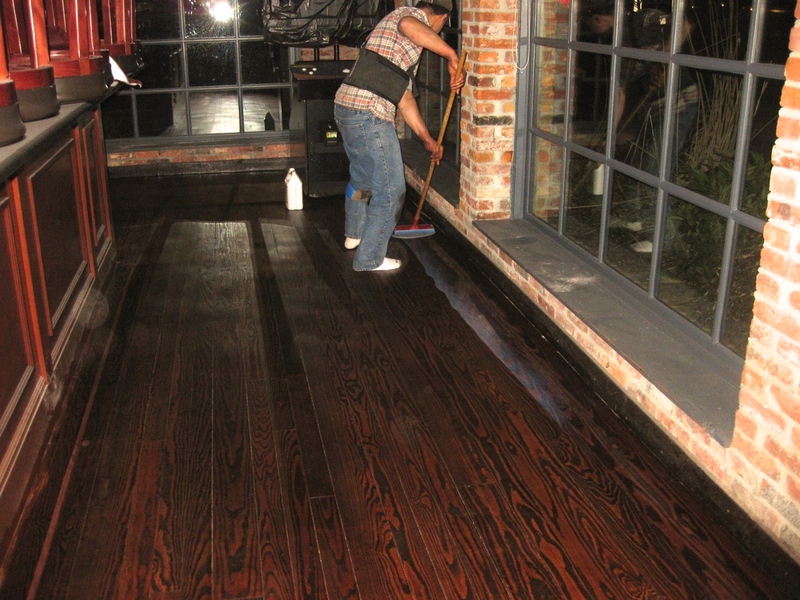 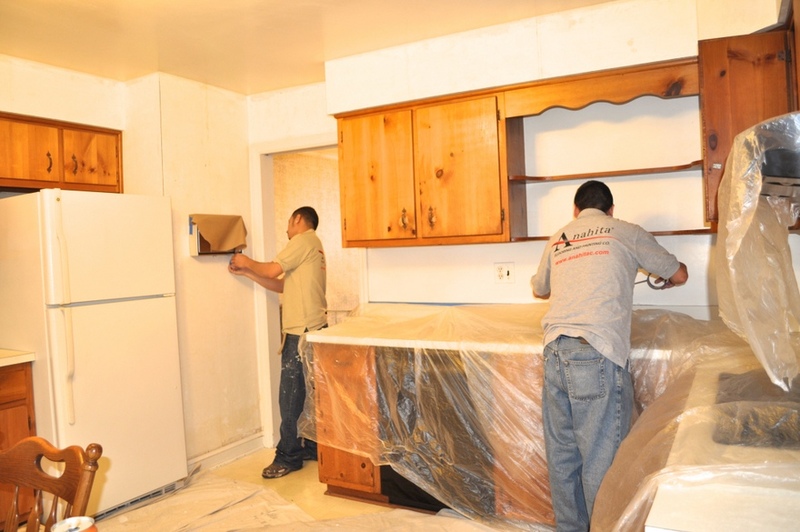 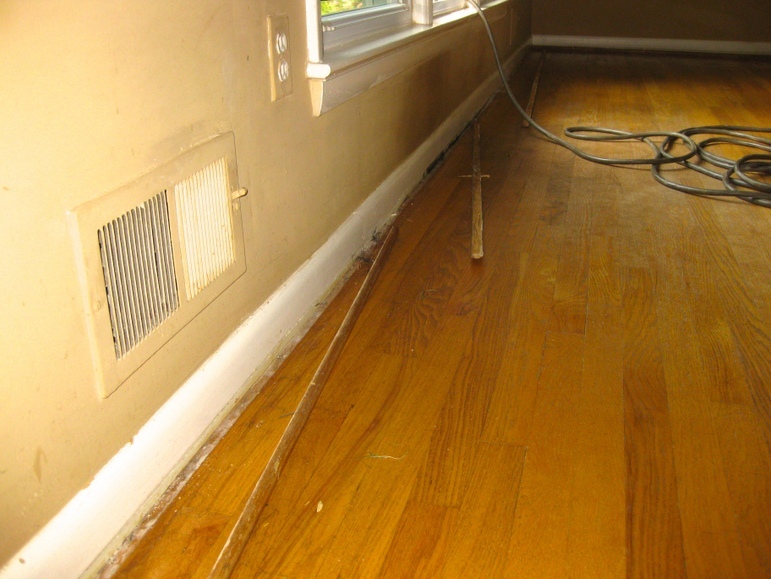 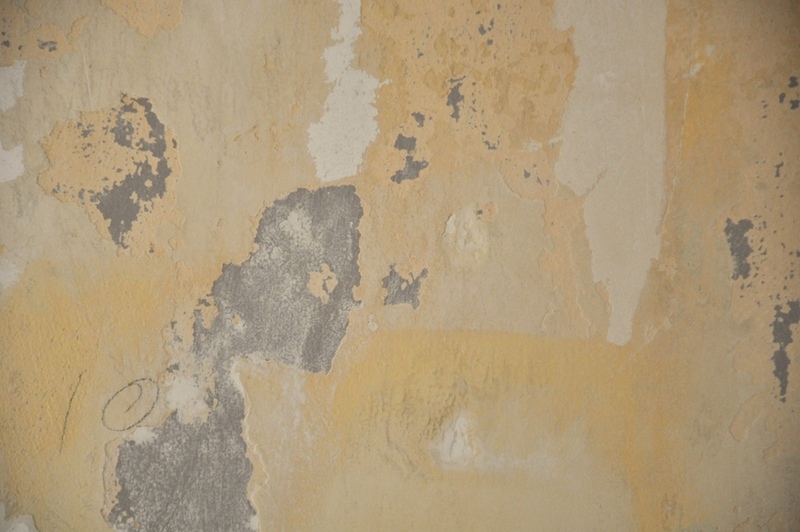 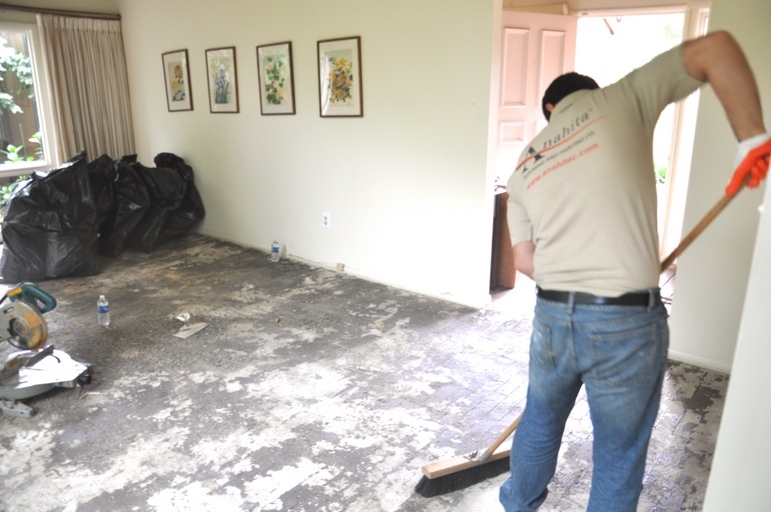 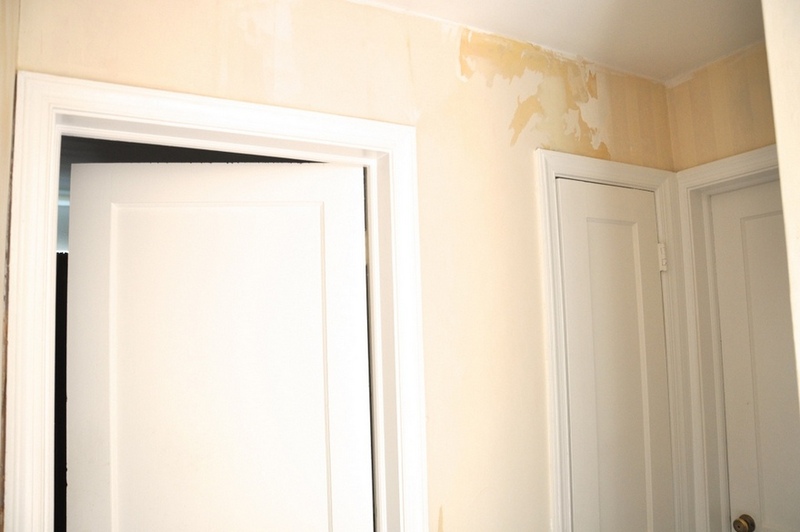 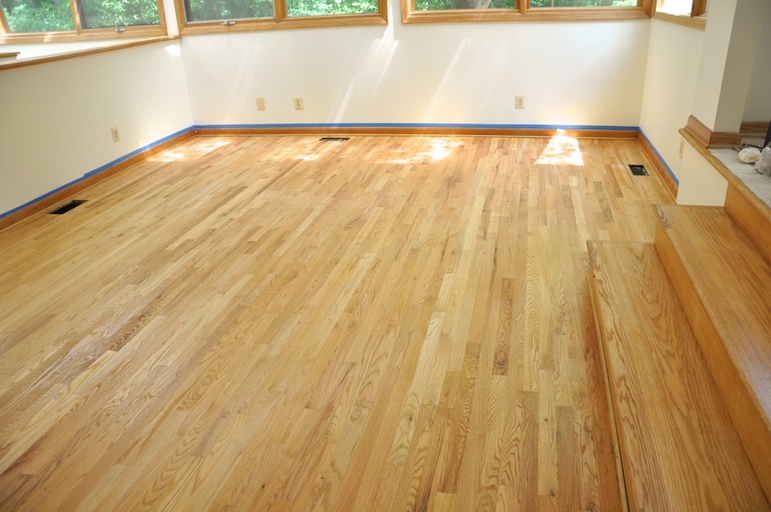 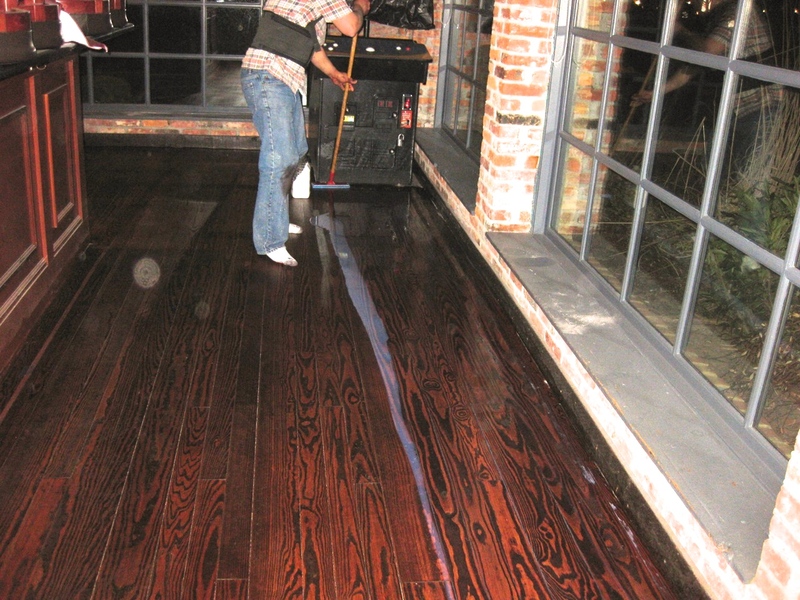 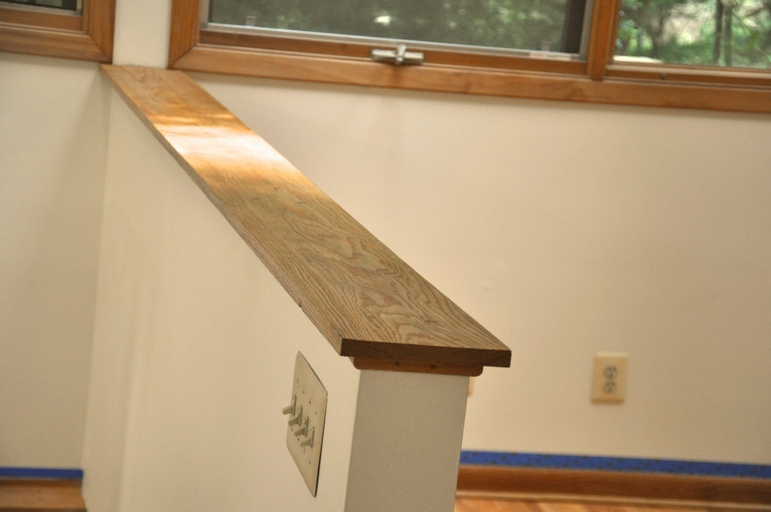 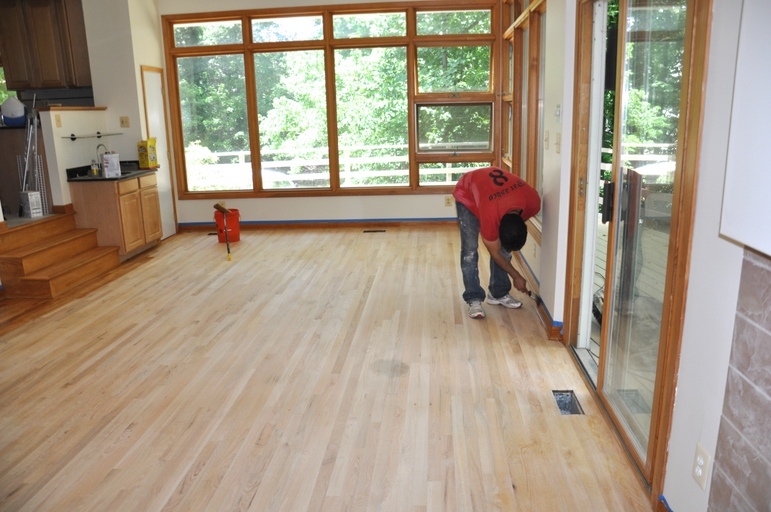 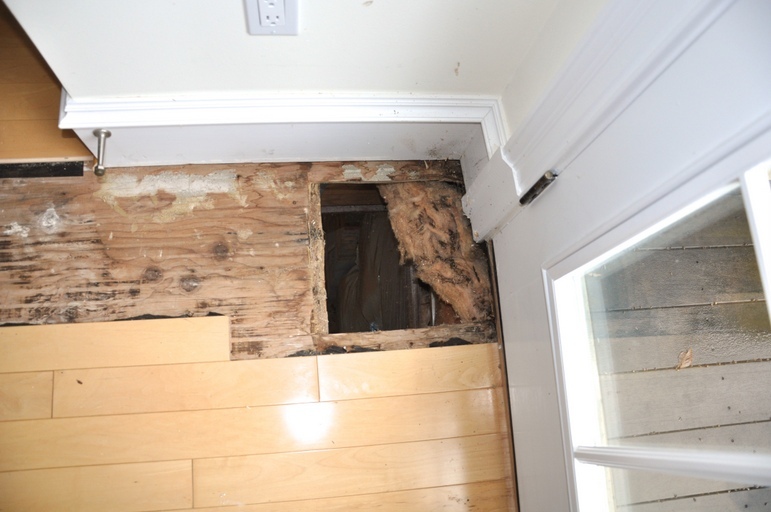 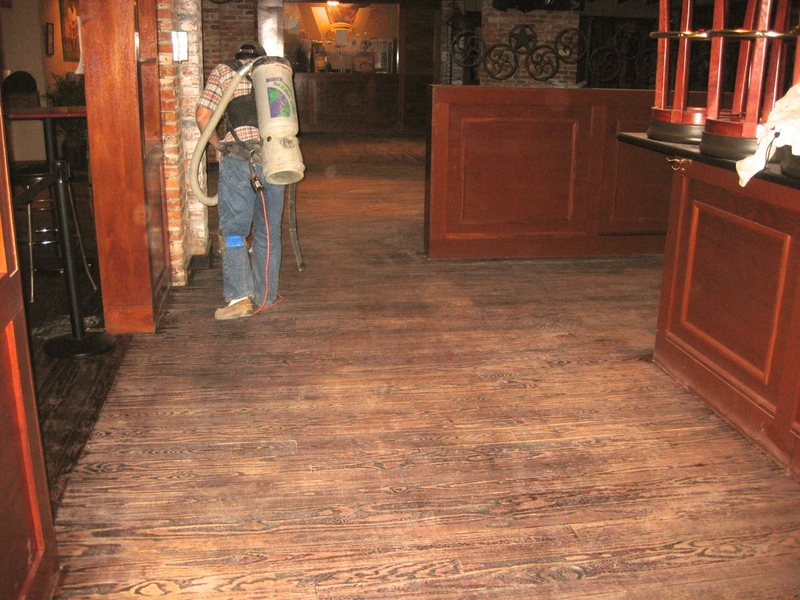 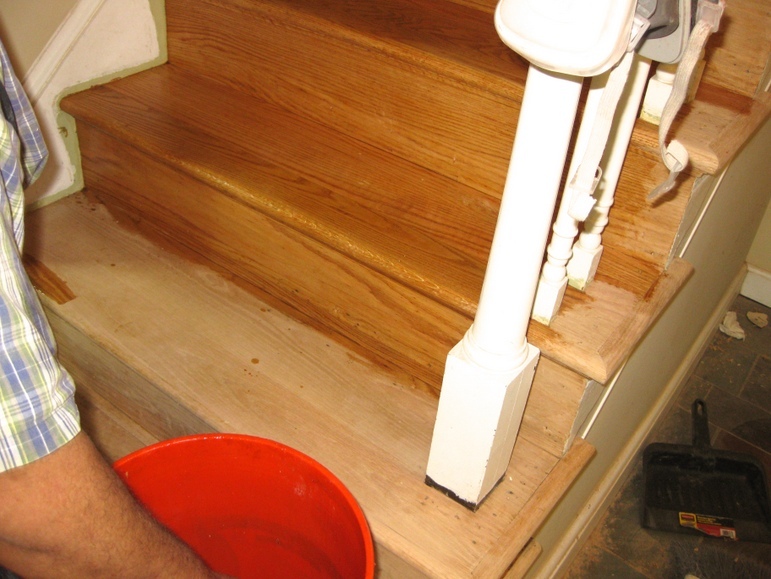 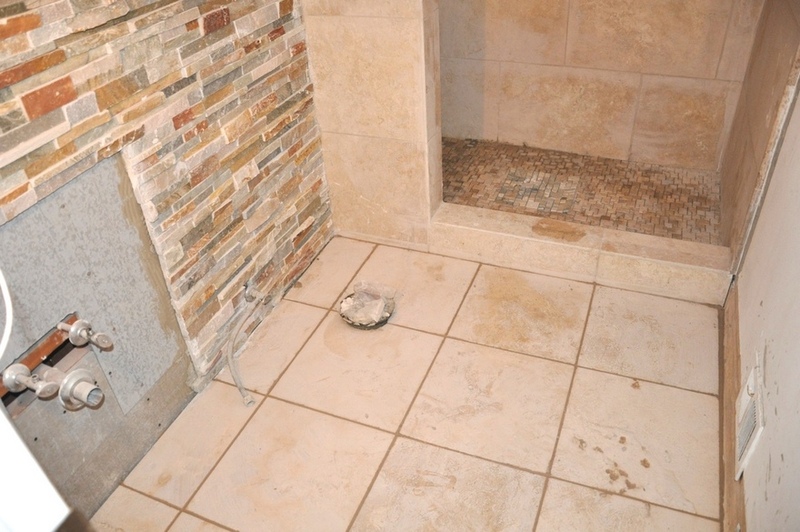 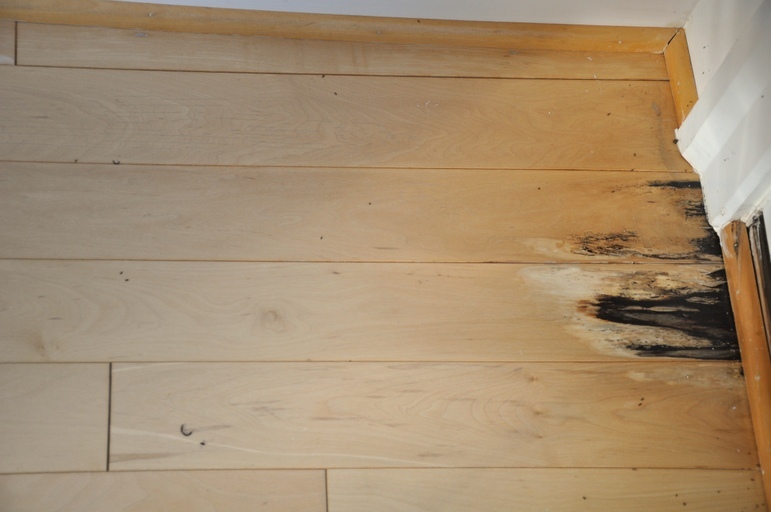 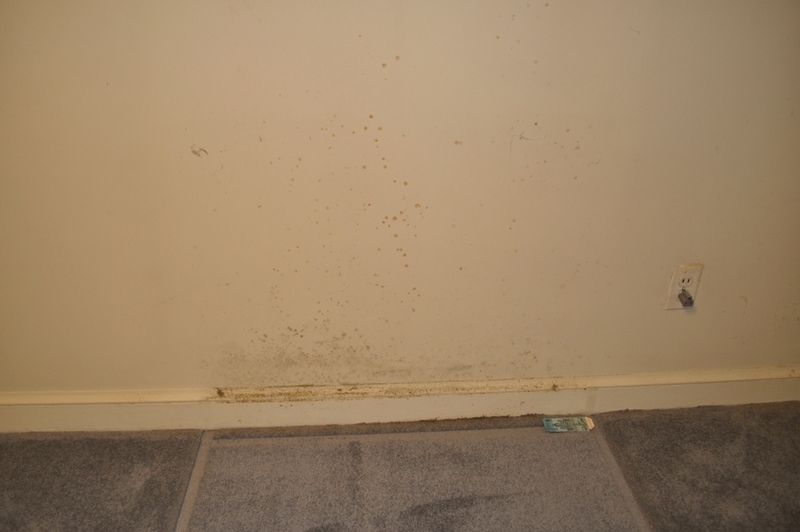 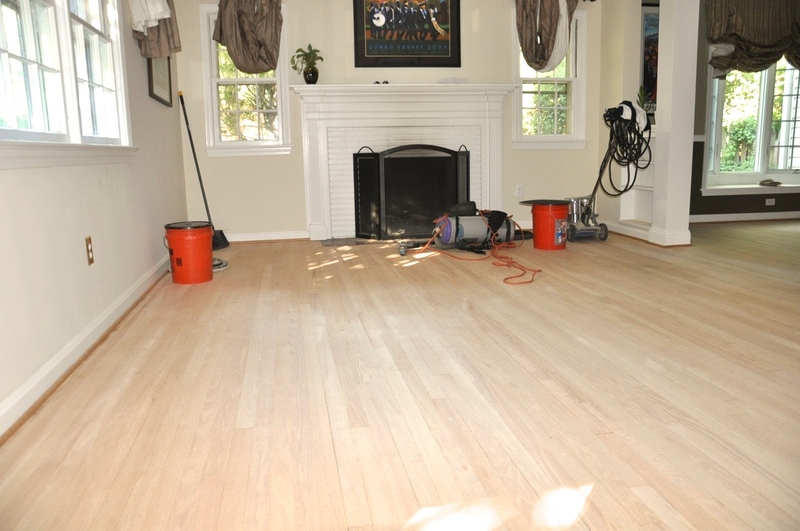 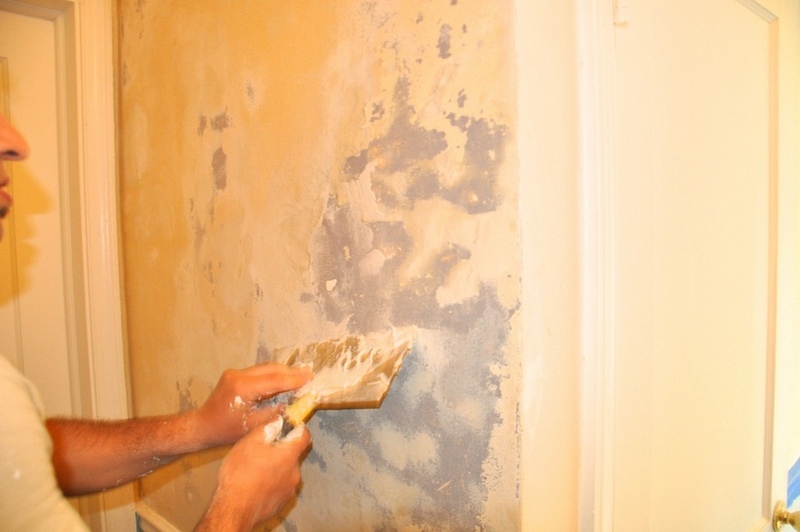 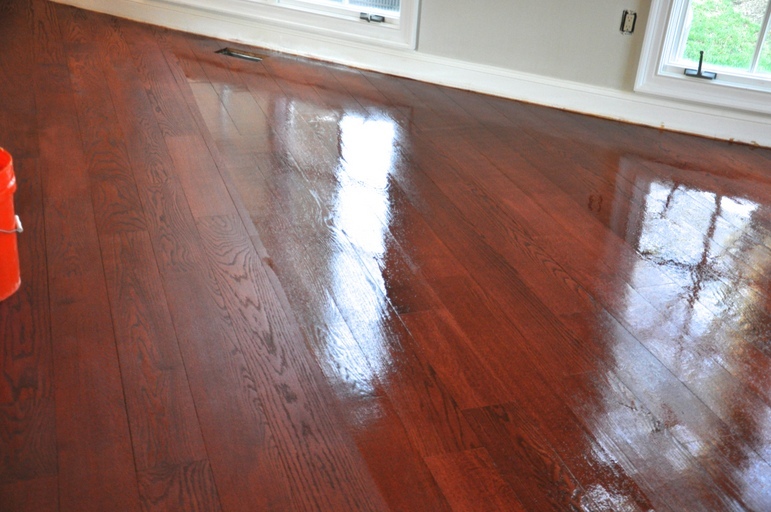 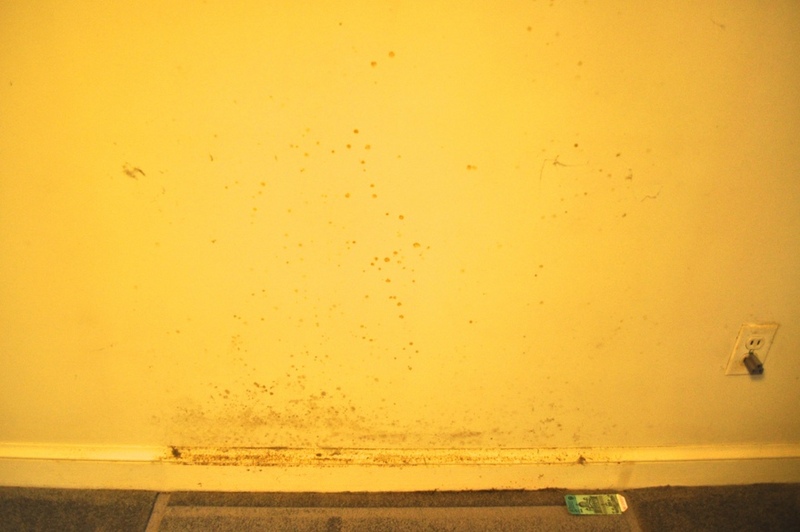 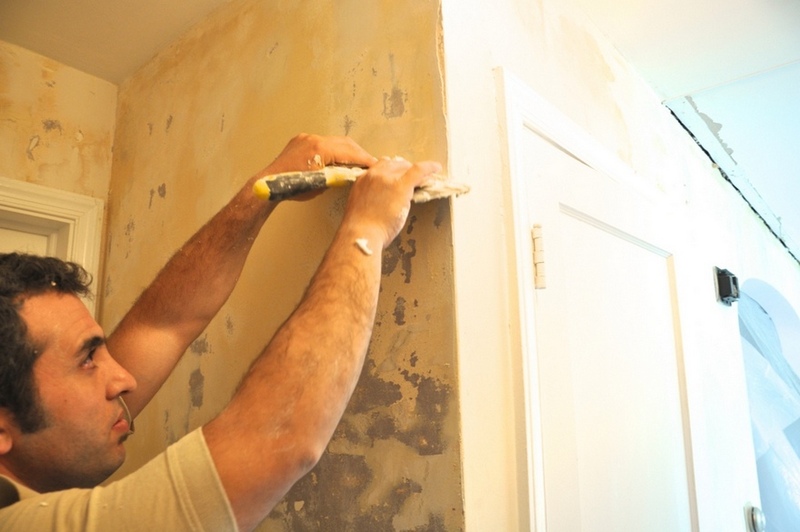 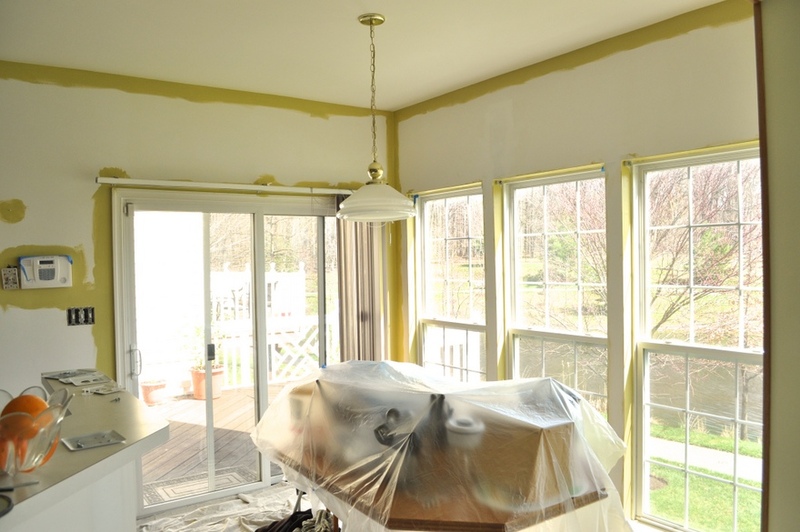 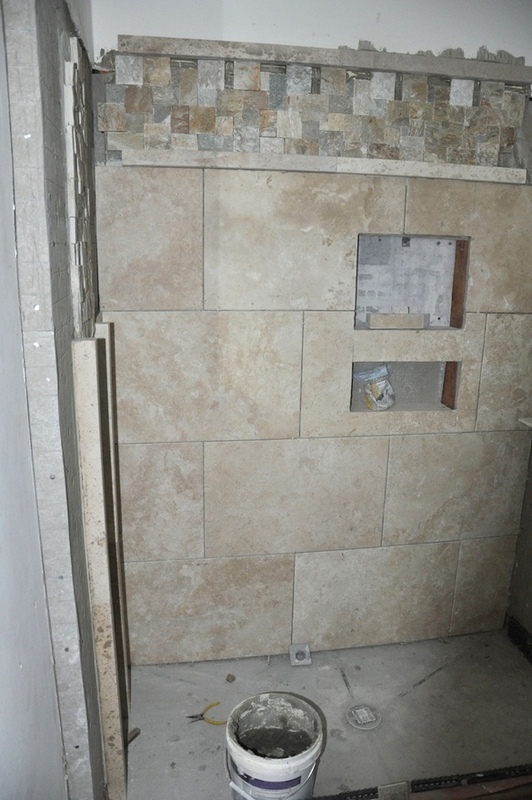 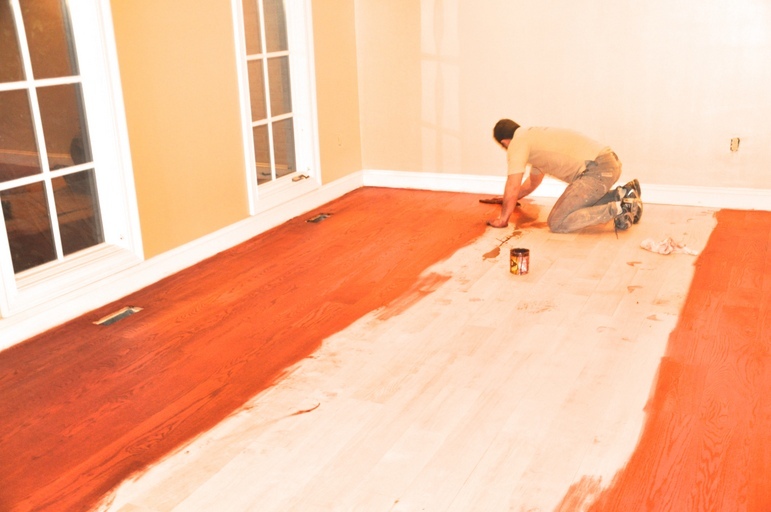 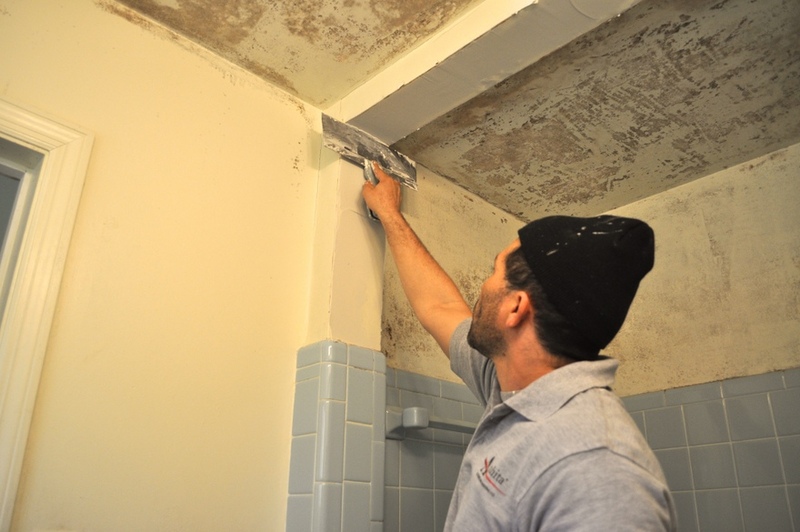 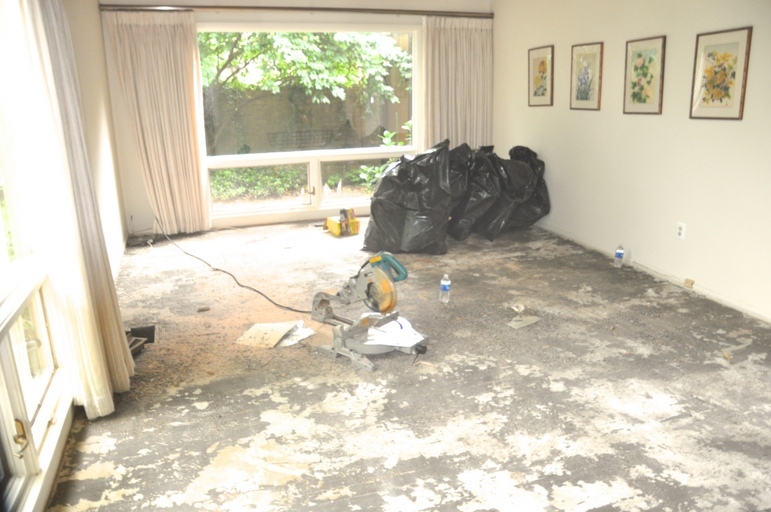 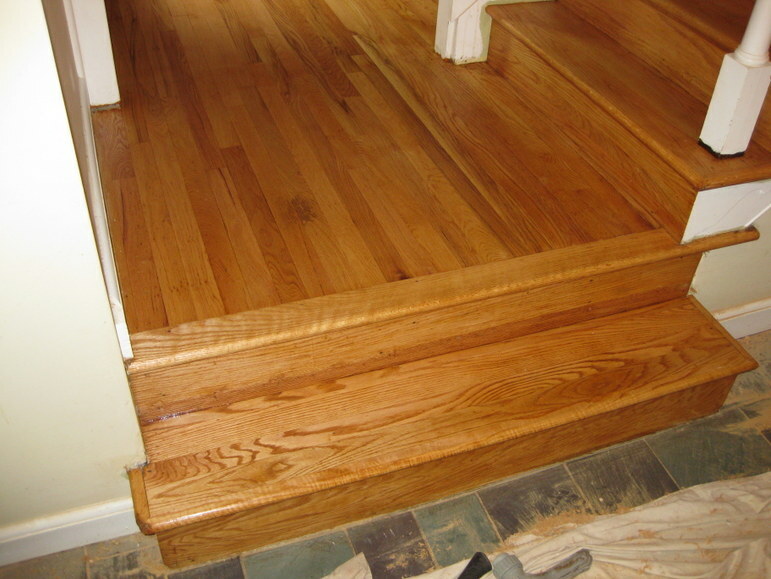 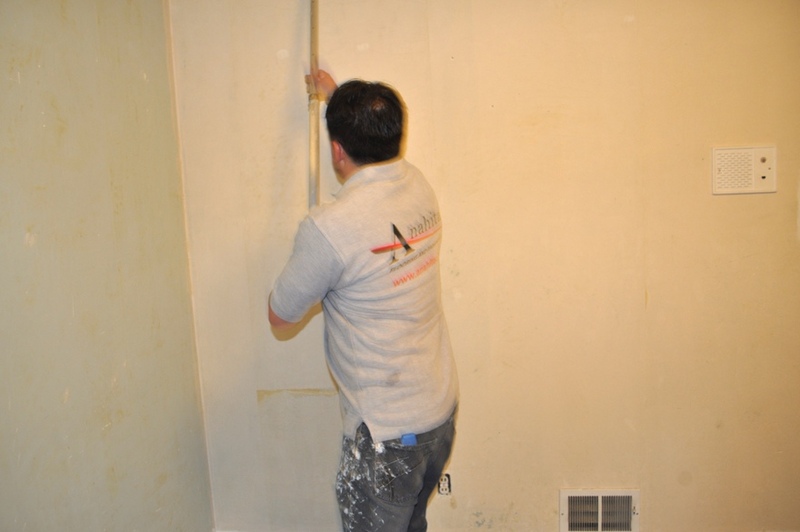 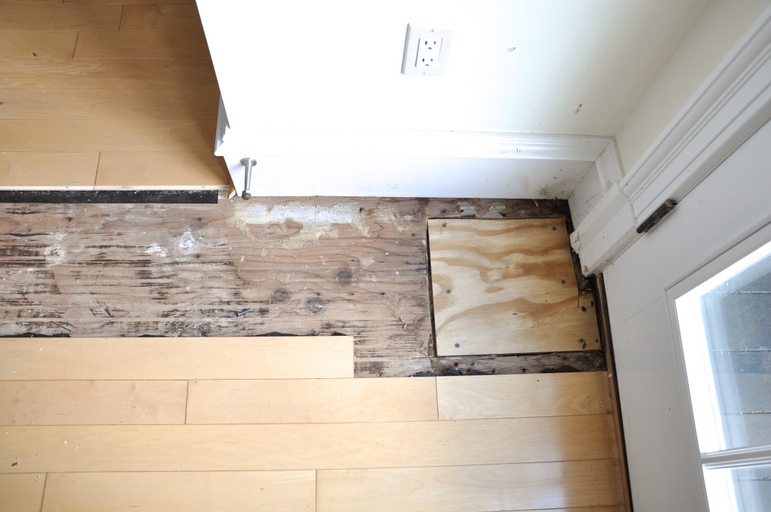 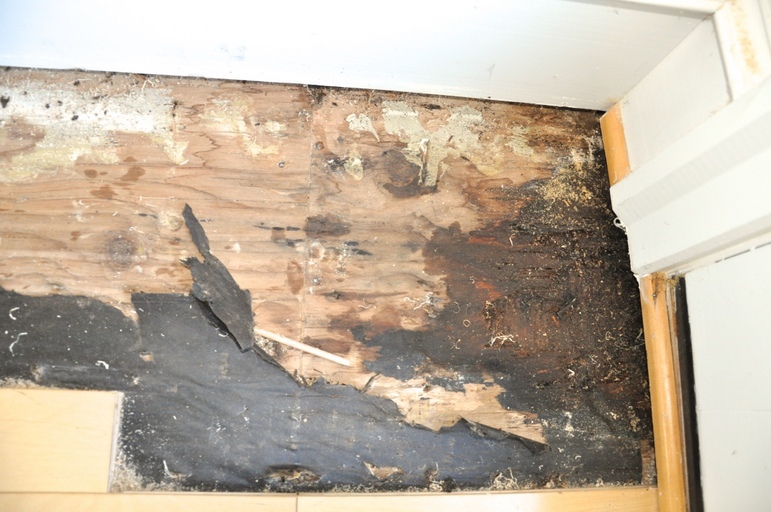 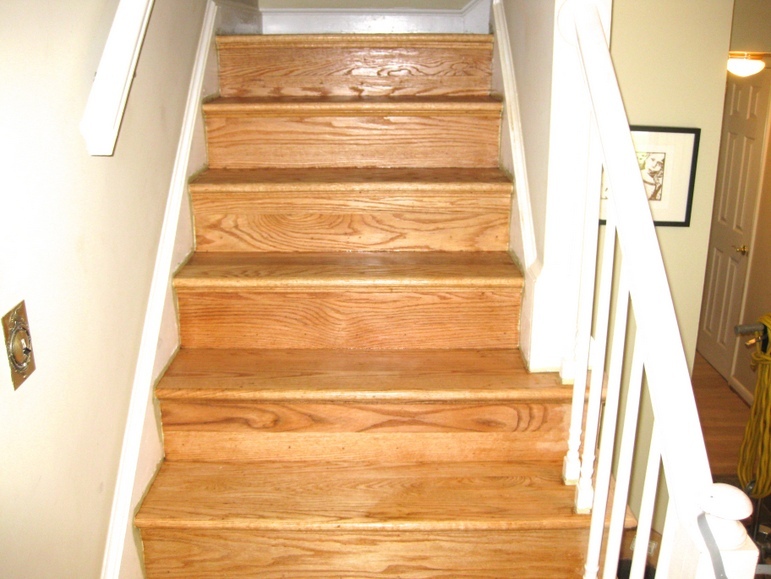 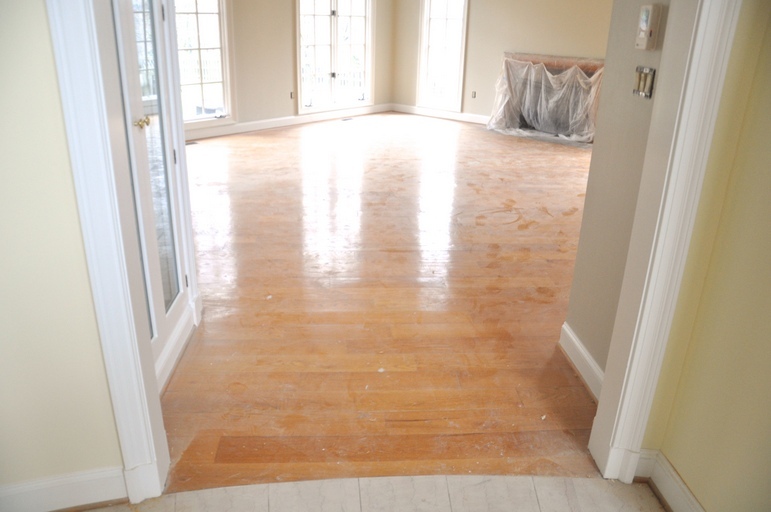 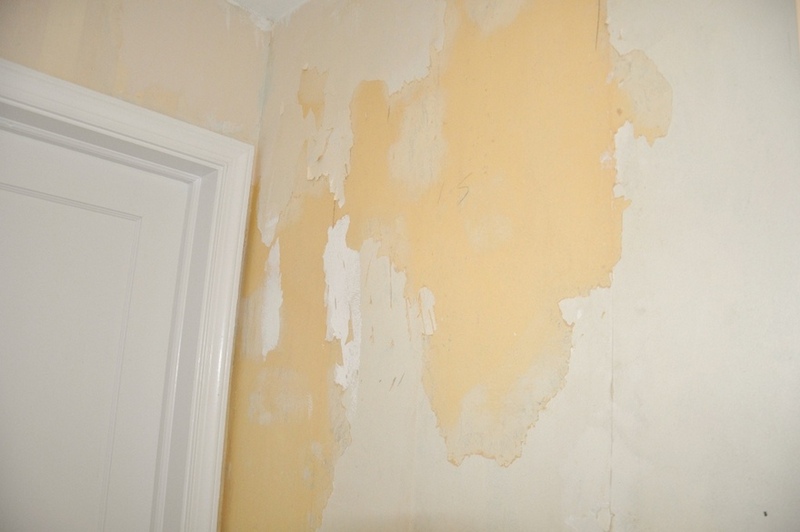 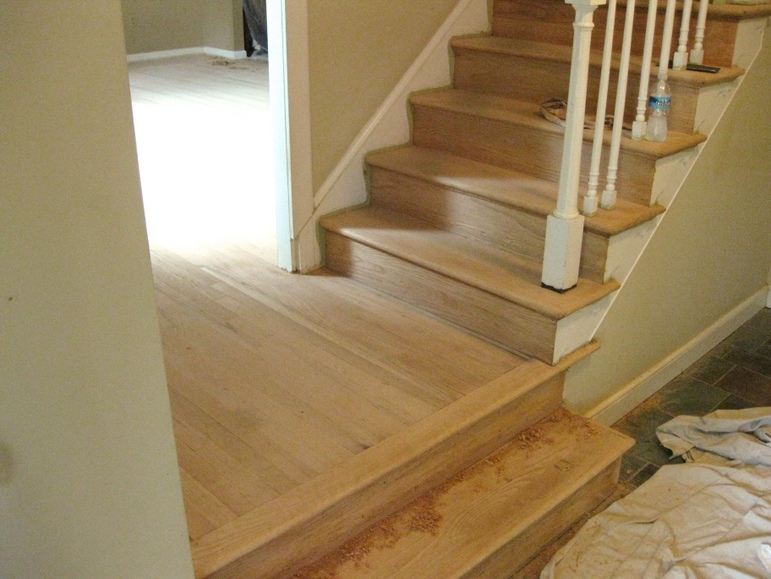 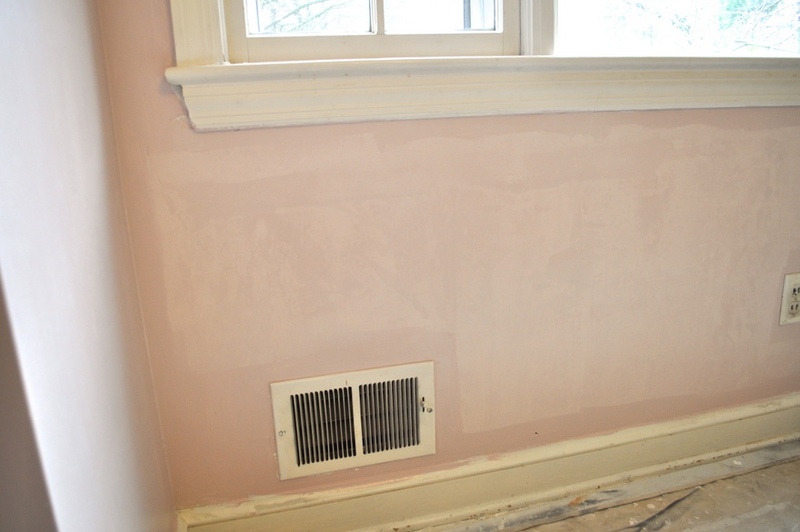 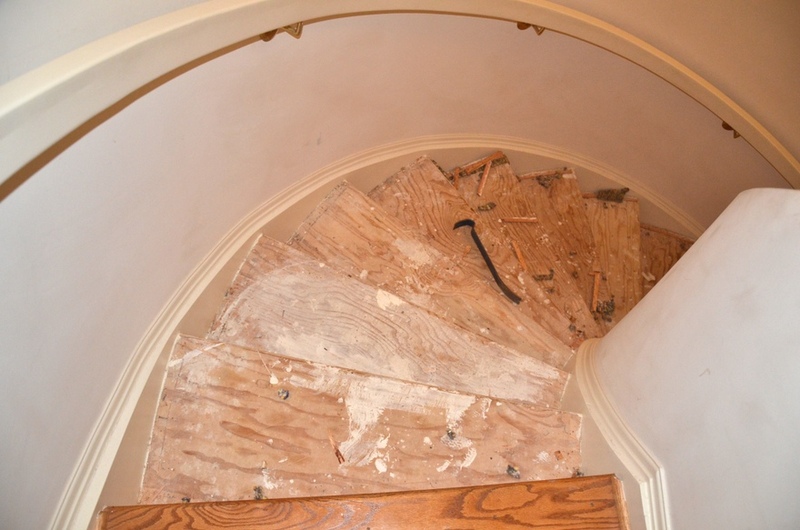 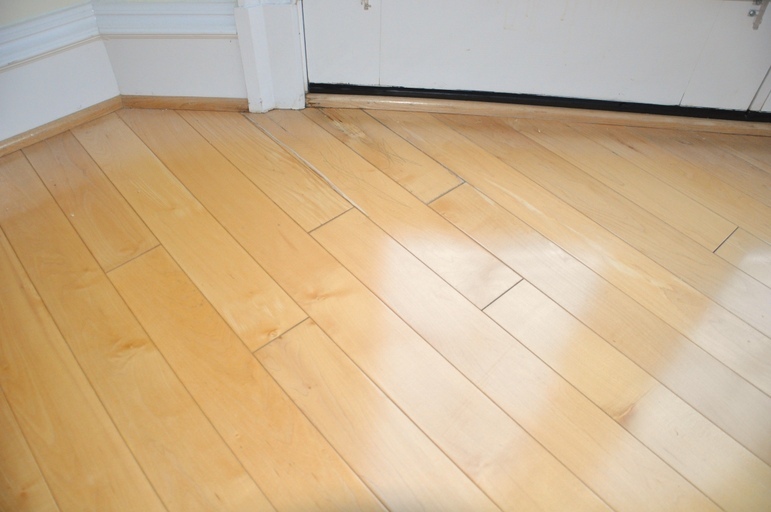 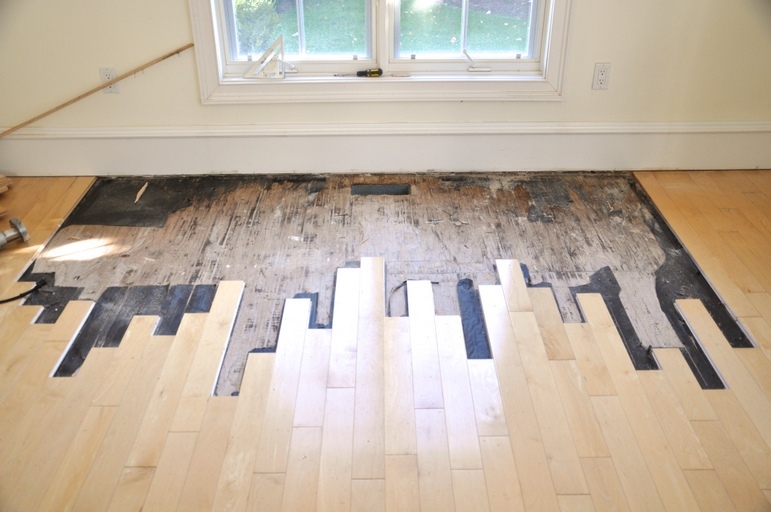 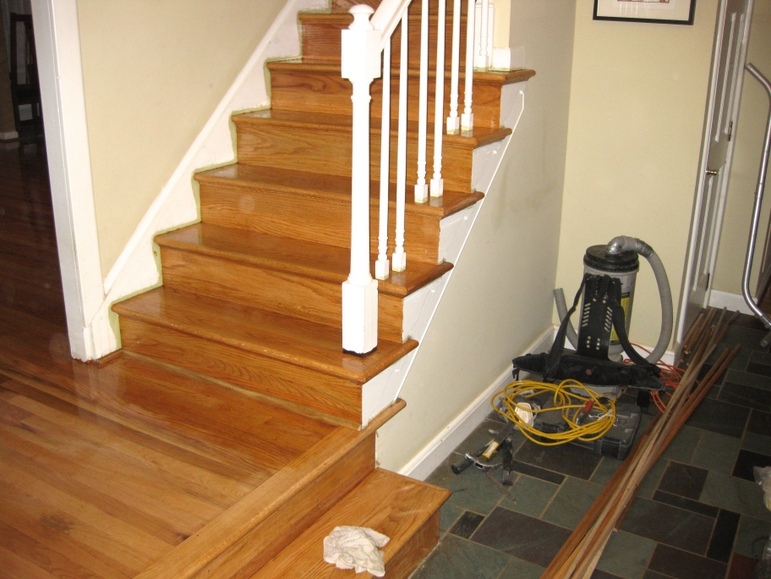 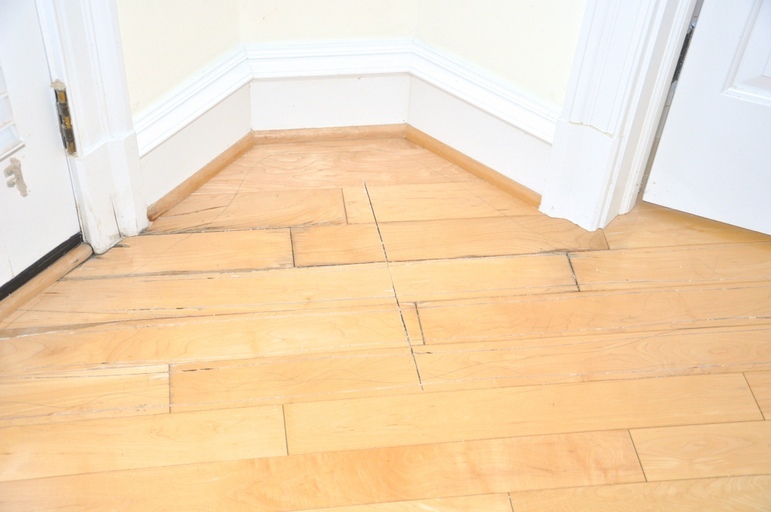 Standing water can dull the finish, damage the wood and leave a discoloring residue. 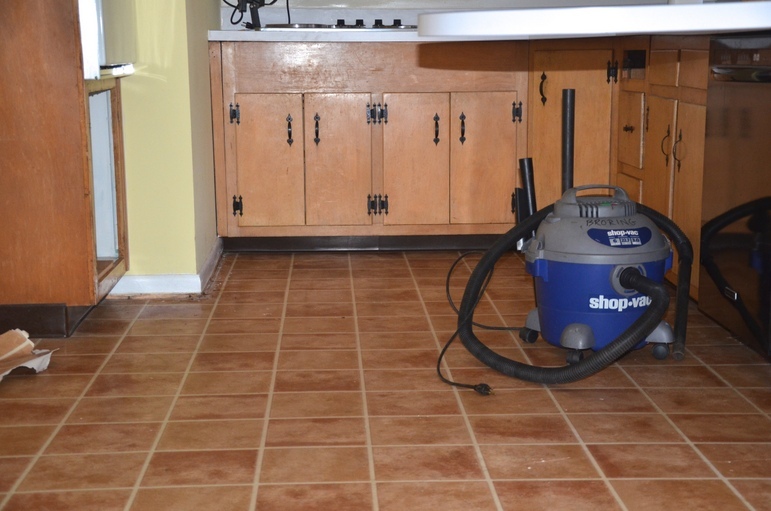 Wipe up spills immediately with a slightly dampened towel. 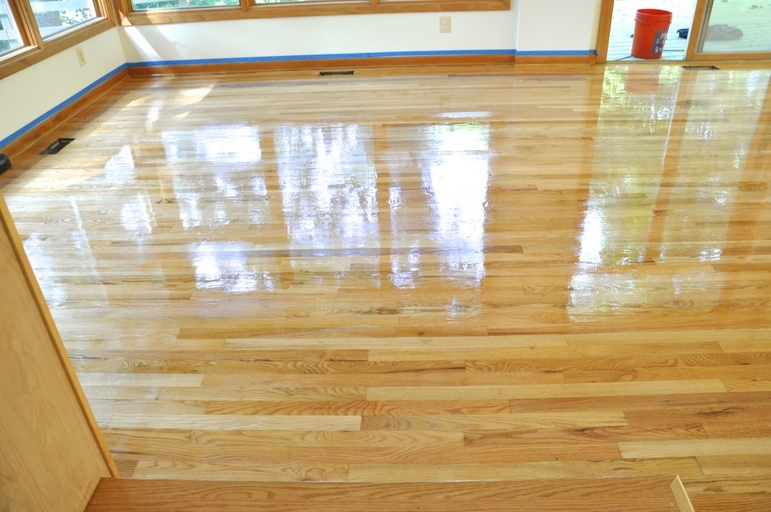 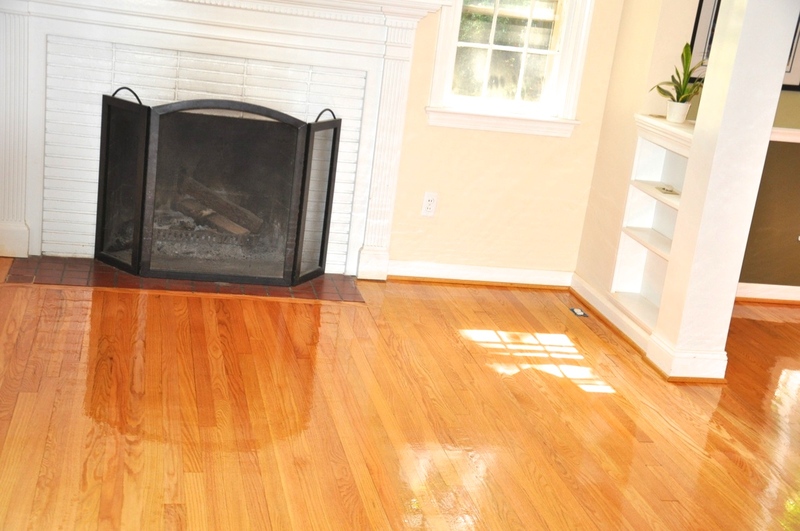 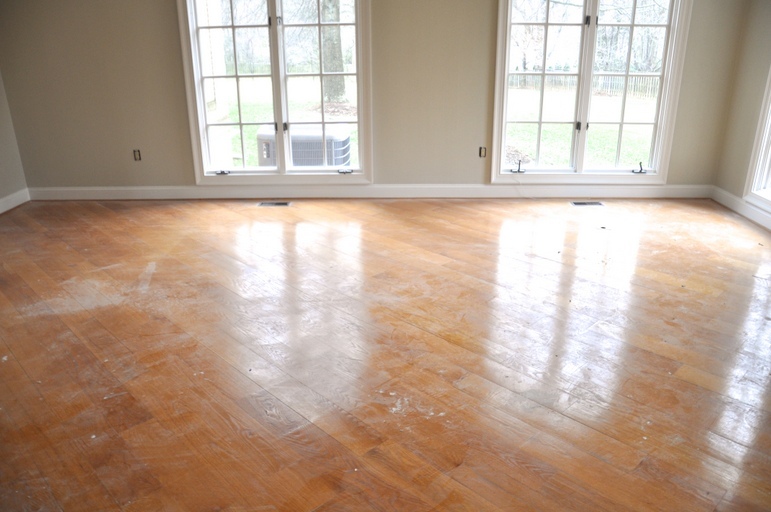 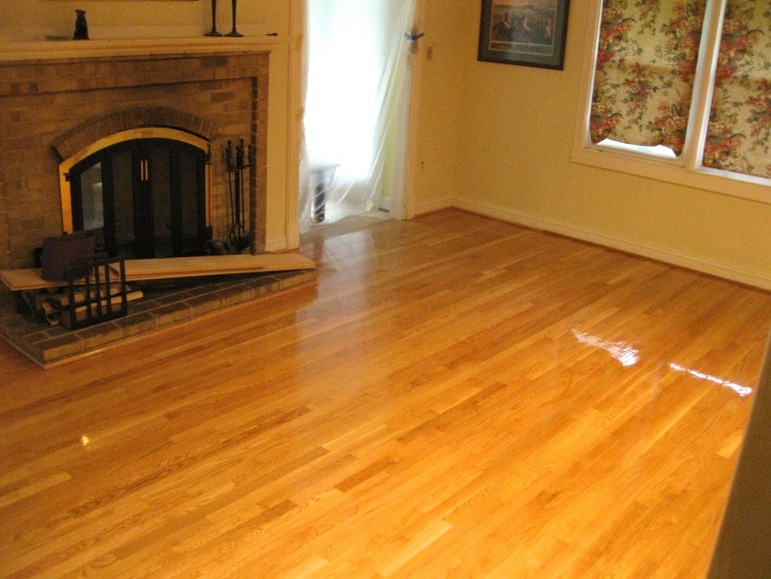 Do not over-wax a wood floor. 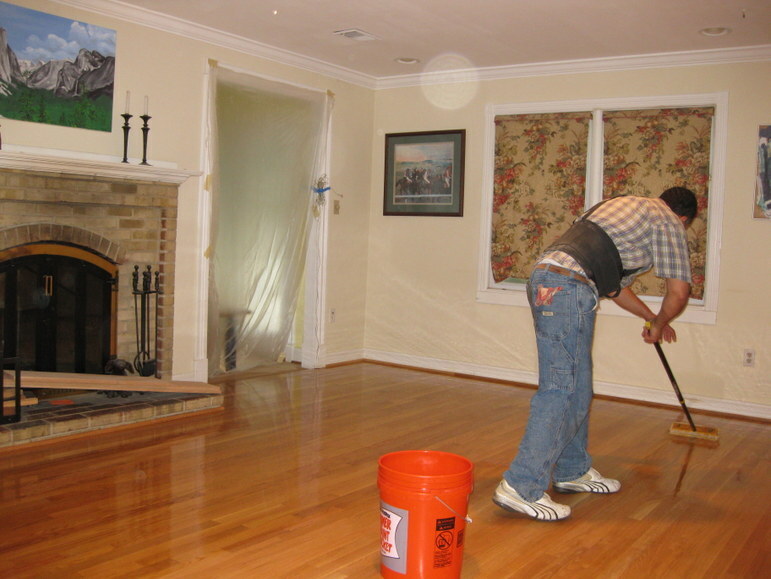 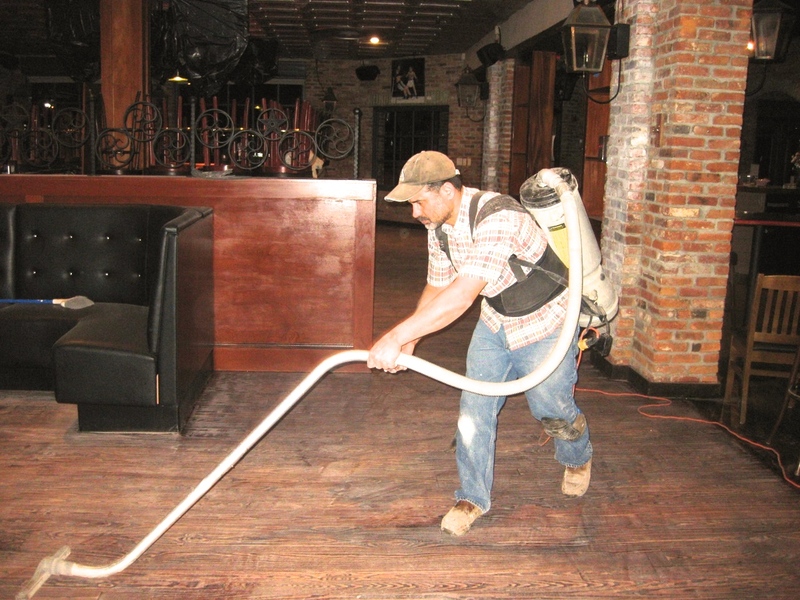 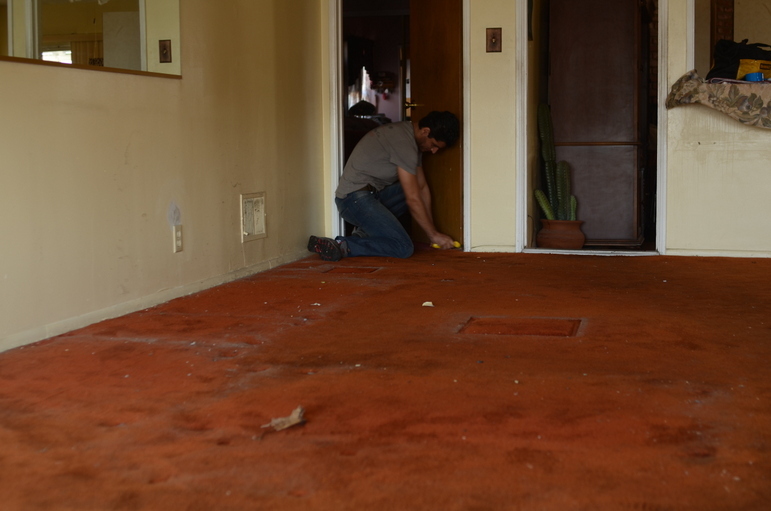 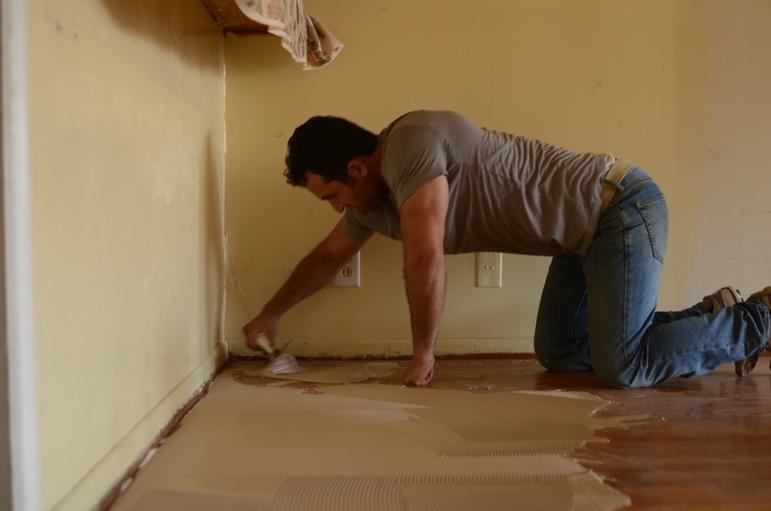 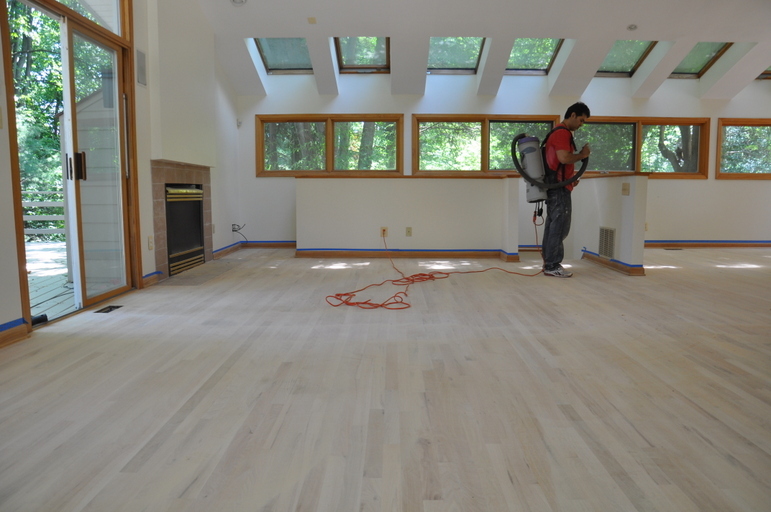 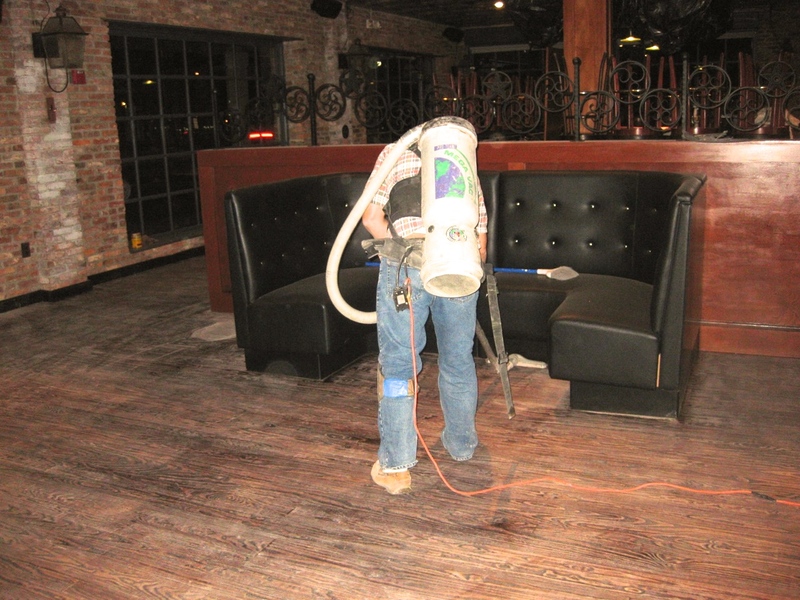 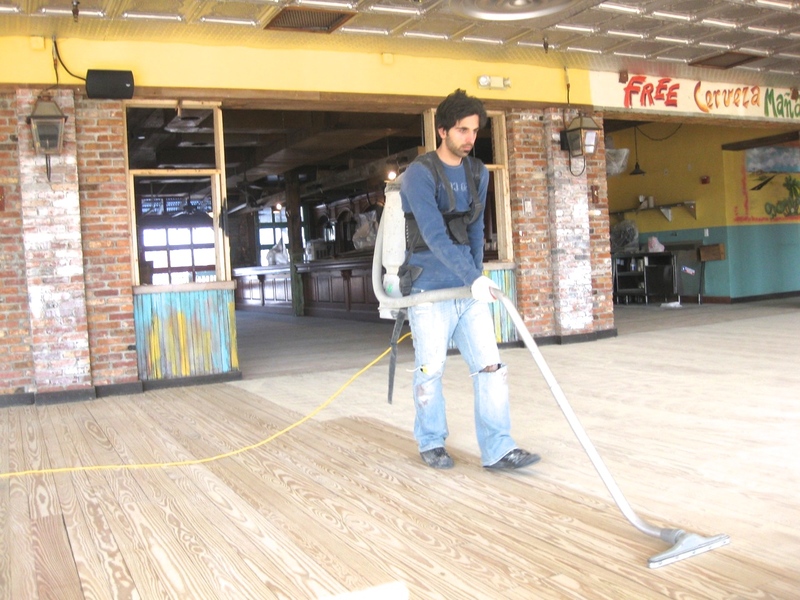 If the floor dulls, try buffing instead. 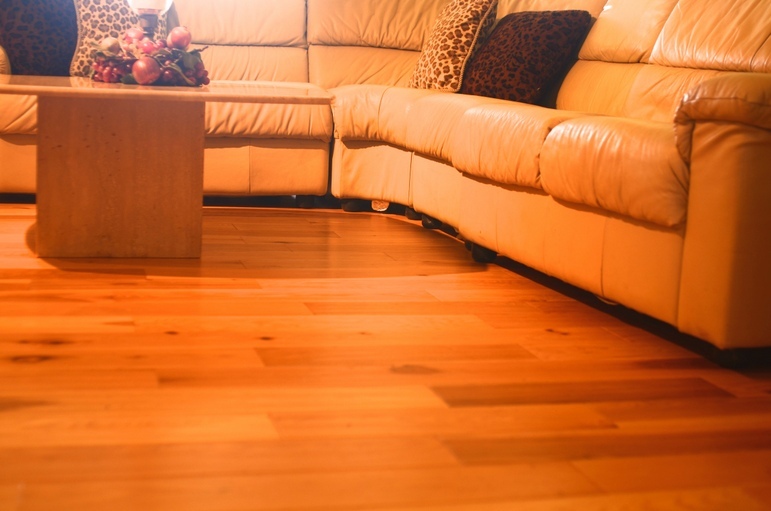 Avoid wax buildup under furniture and other light traffic areas by applying wax in these spots every other waxing session. 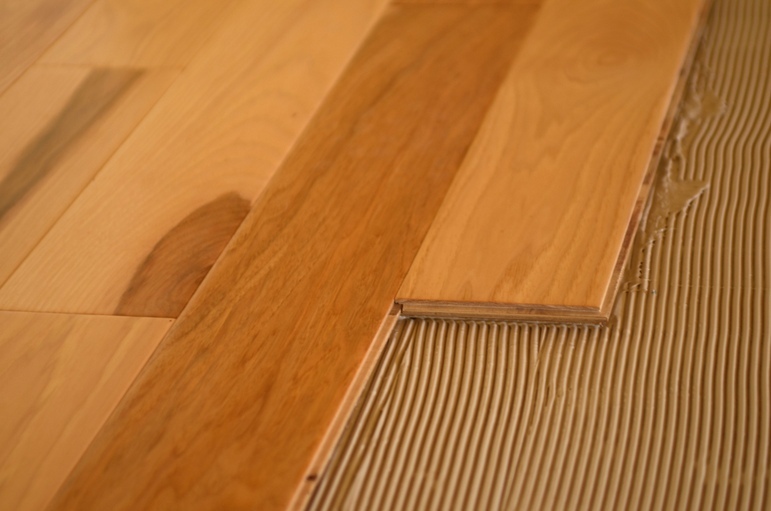 The advances of laminate flooring technology has greatly improved over the past few years and its cost effectiveness makes it a top choice amongst homeowners. 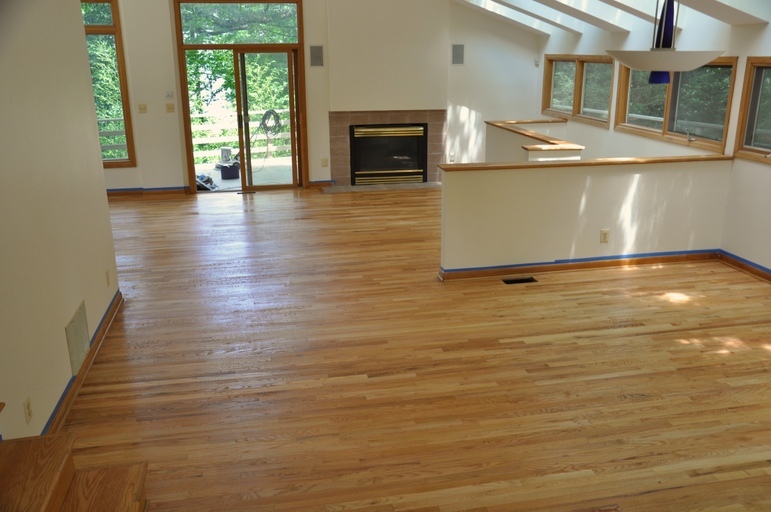 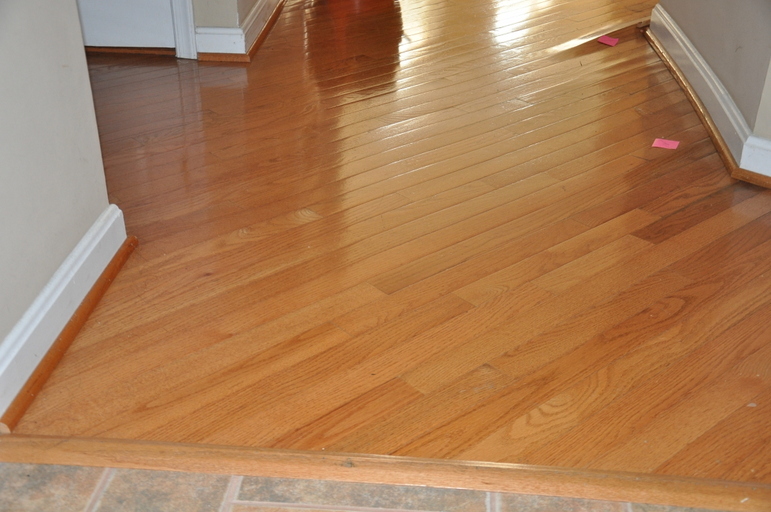 Laminate flooring has a core comprised of High Density Fiber (HDF). 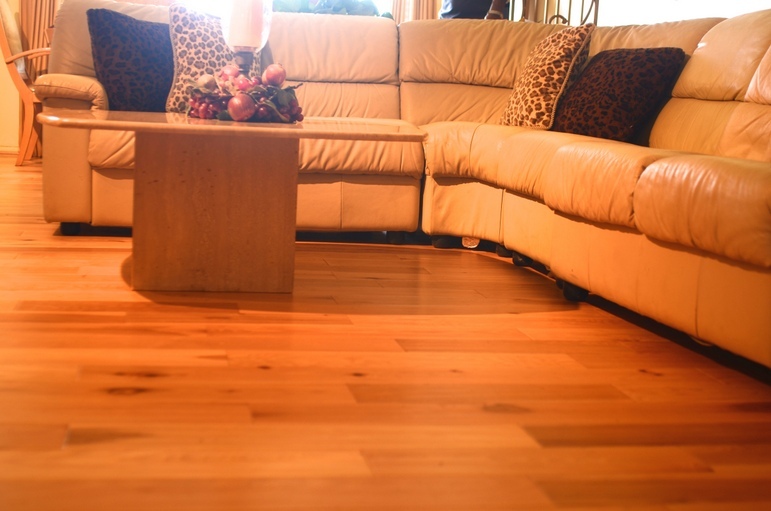 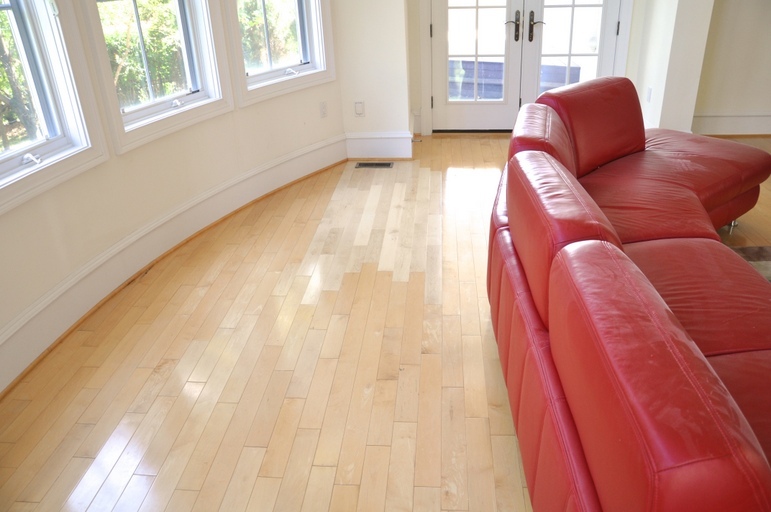 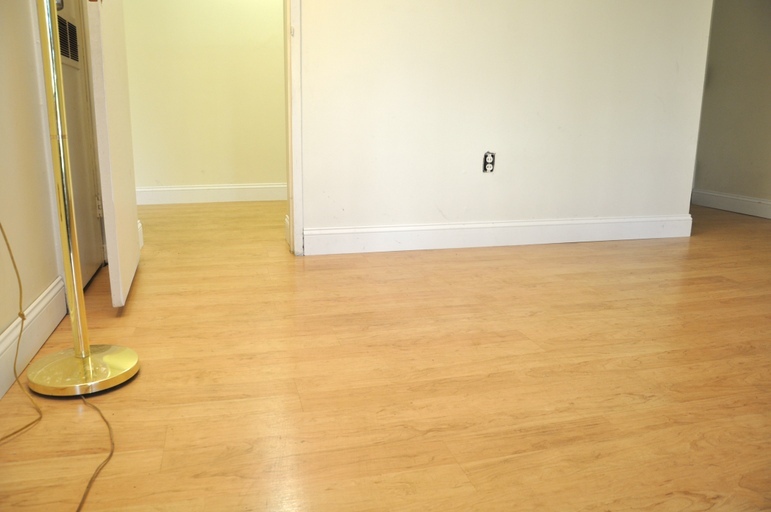 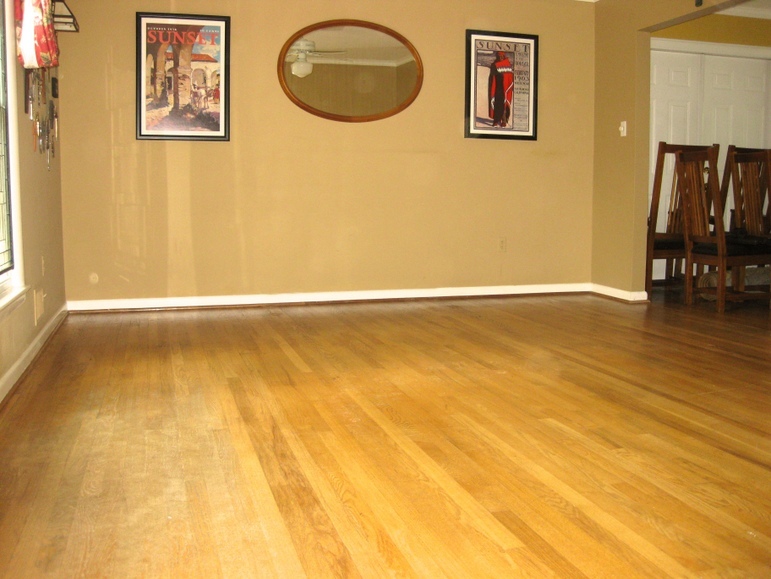 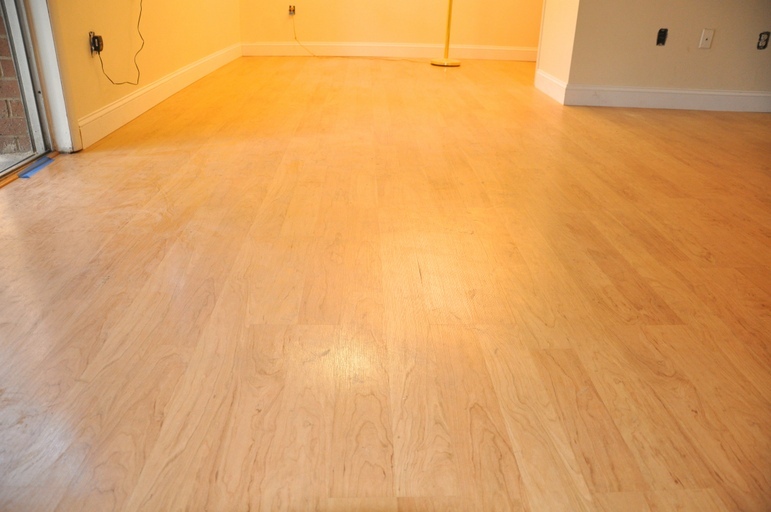 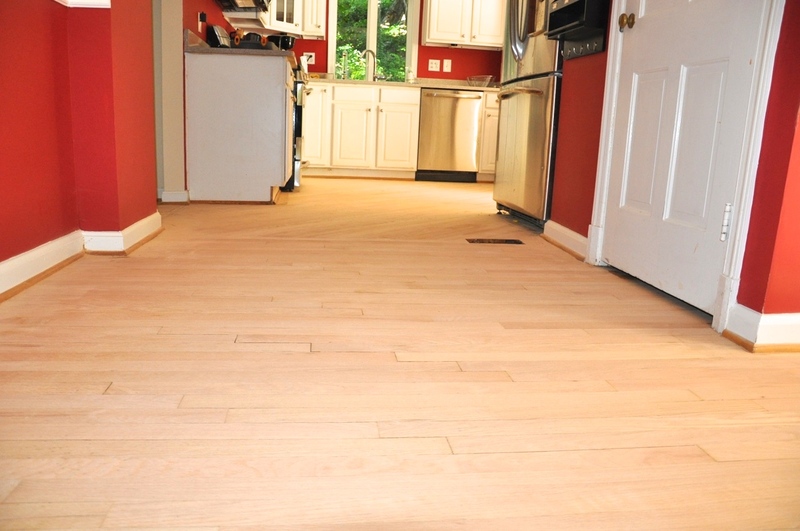 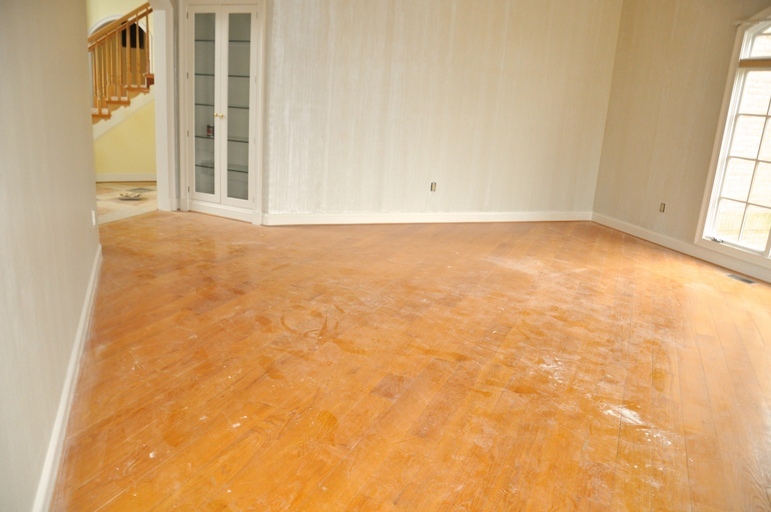 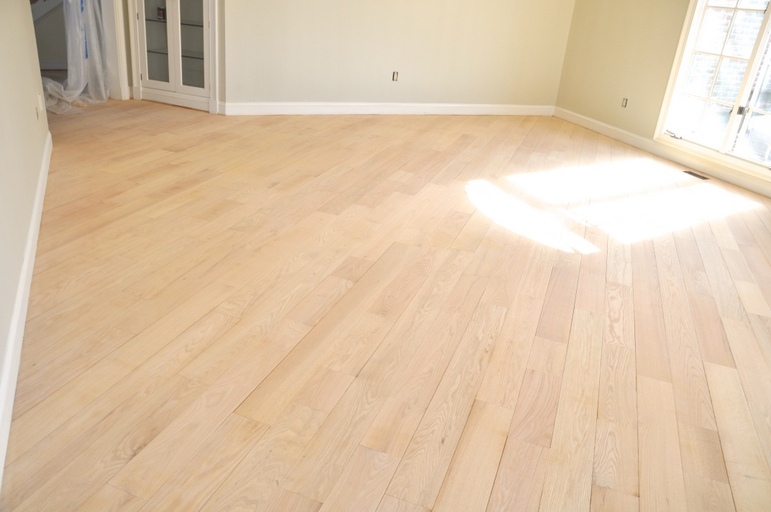 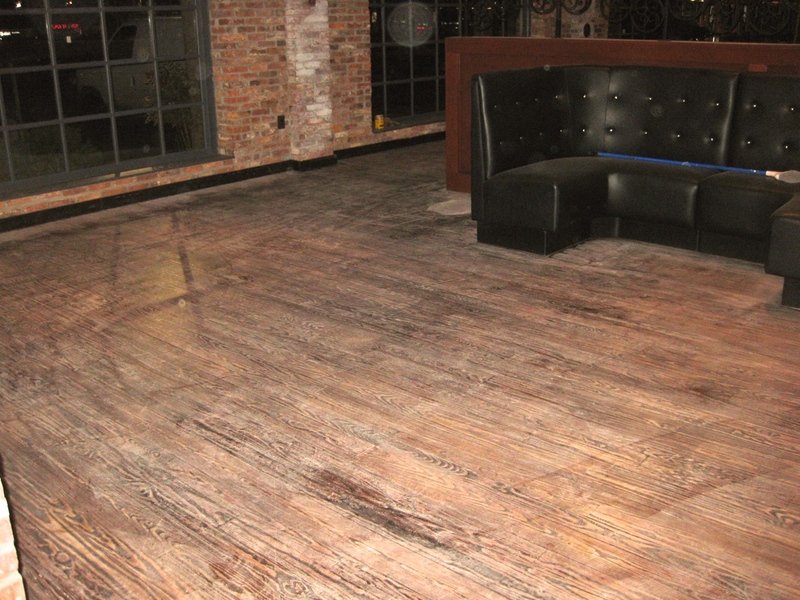 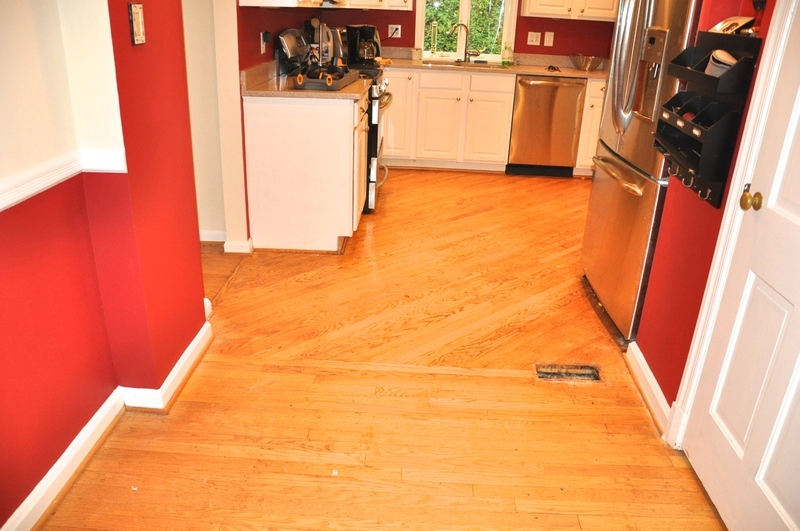 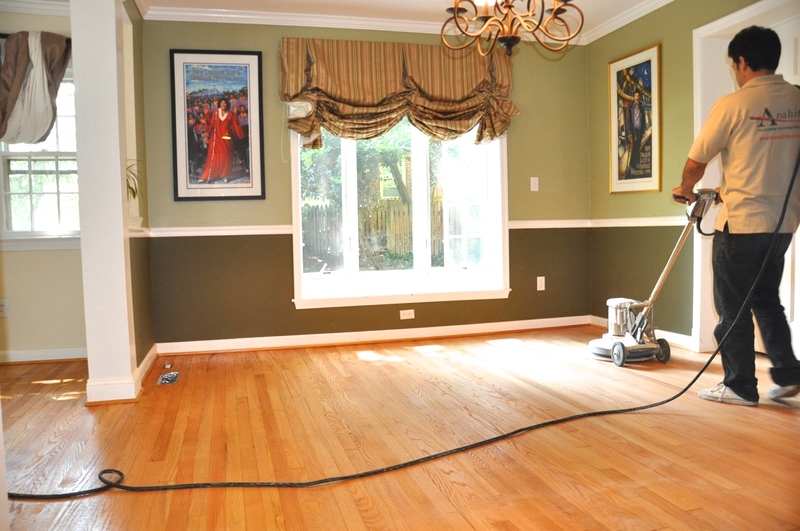 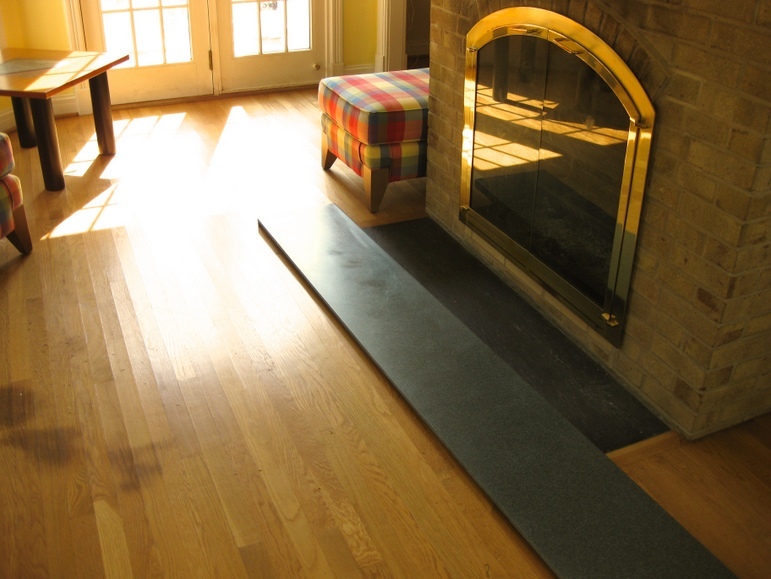 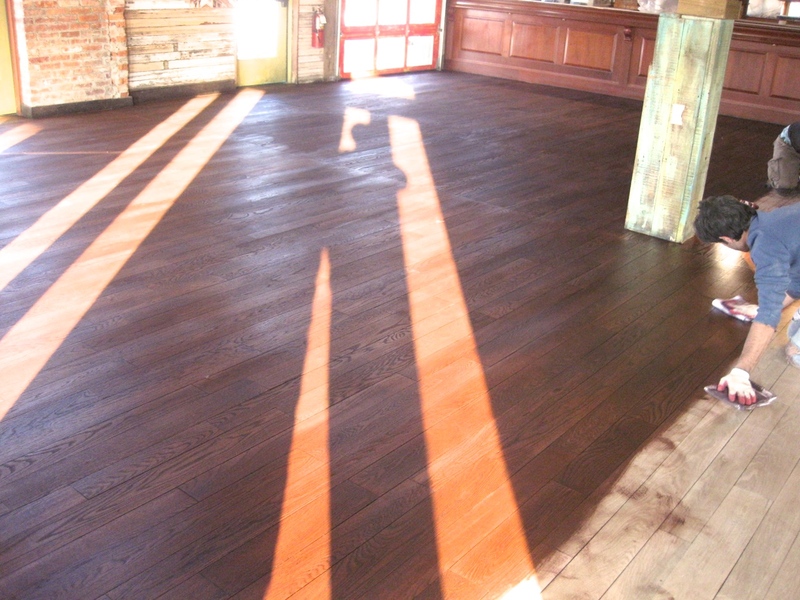 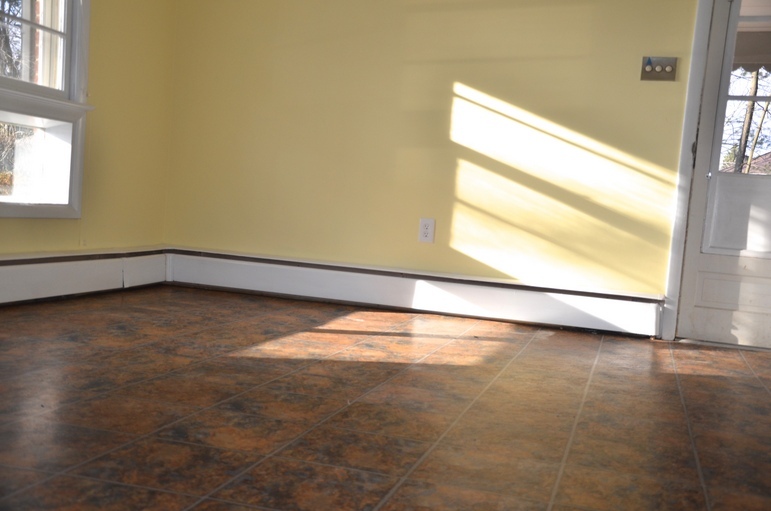 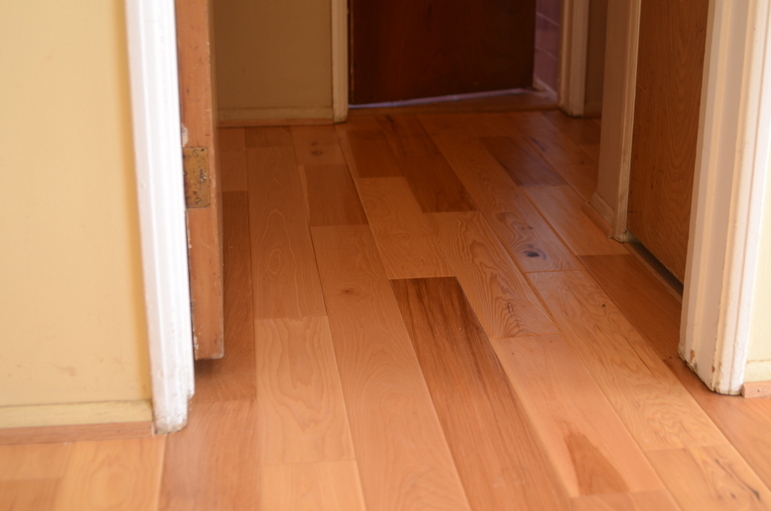 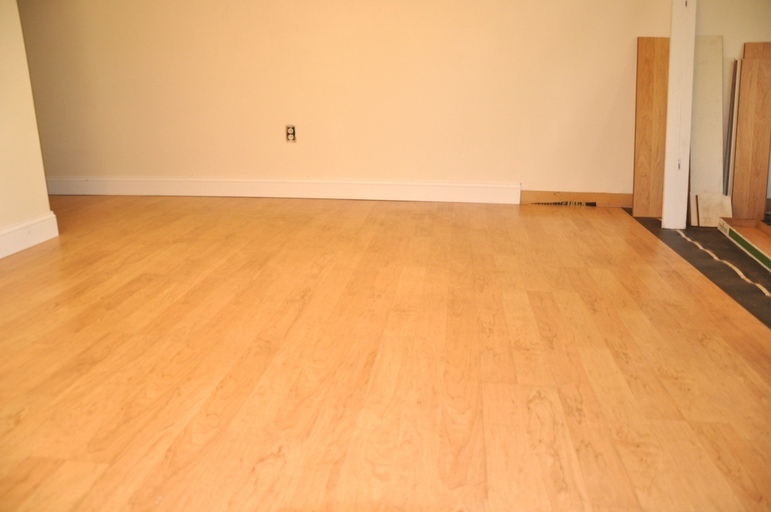 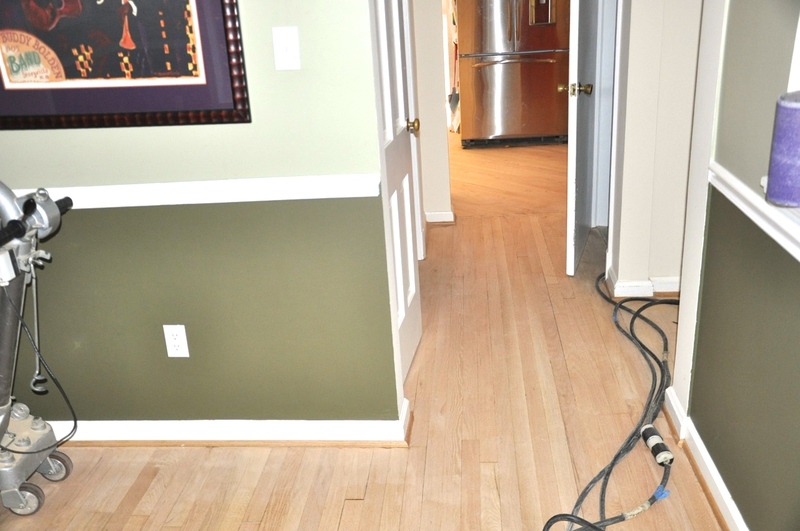 The superficial layer of laminate flooring emulates hardwood, stone or tile. 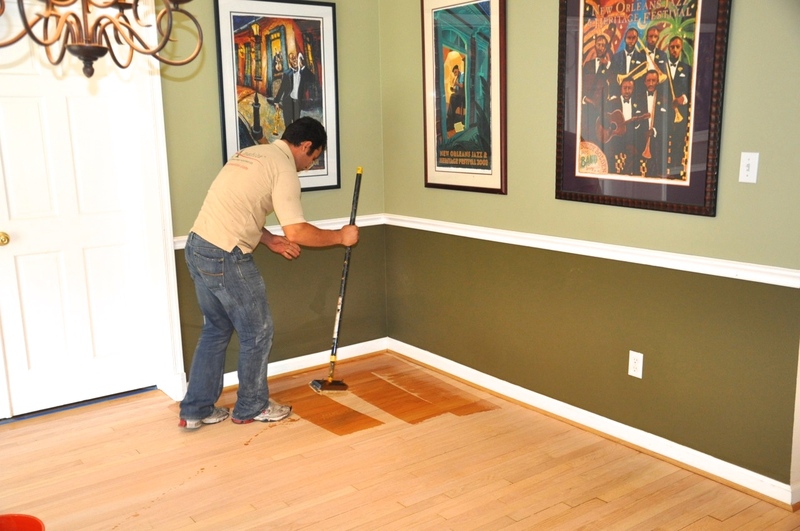 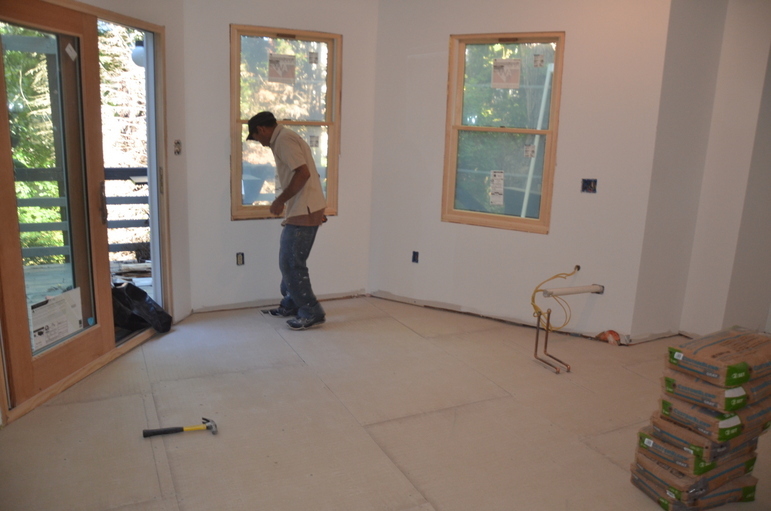 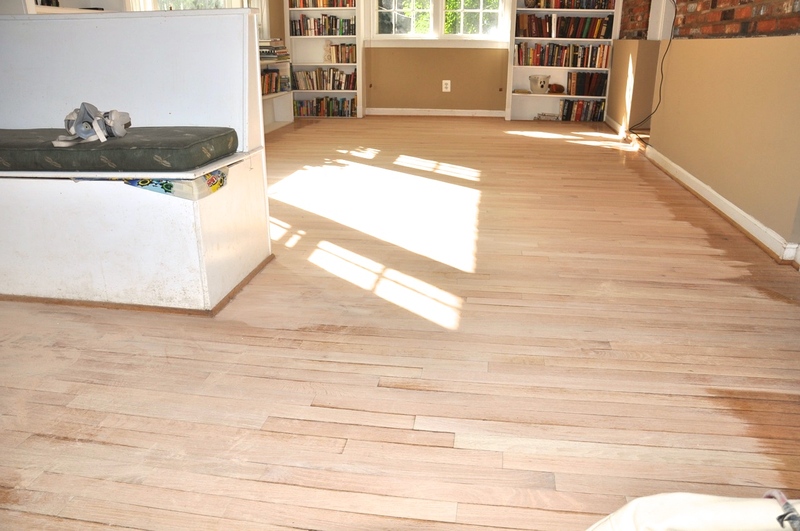 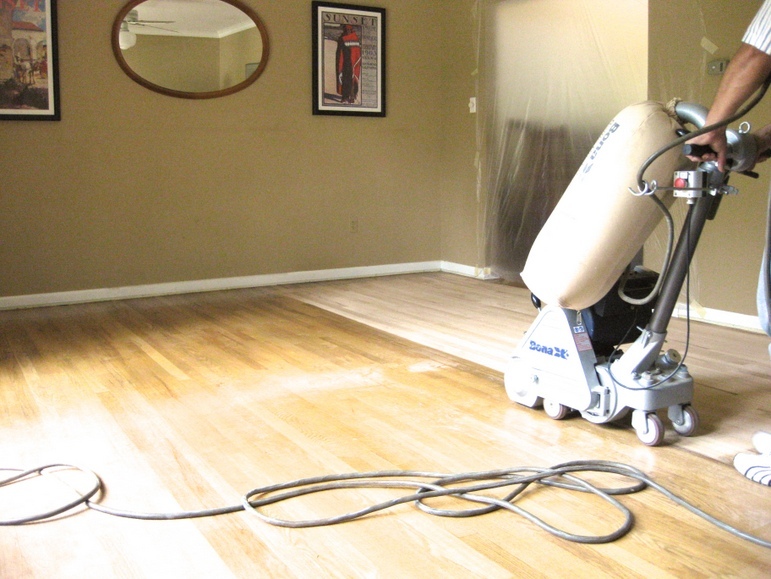 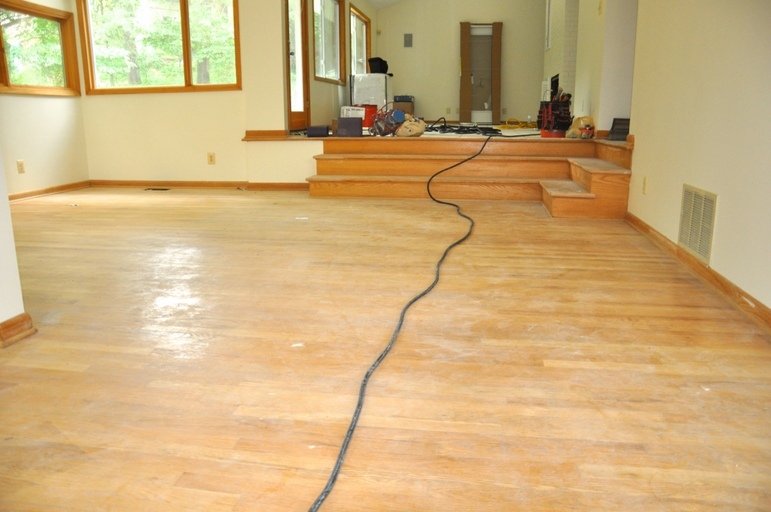 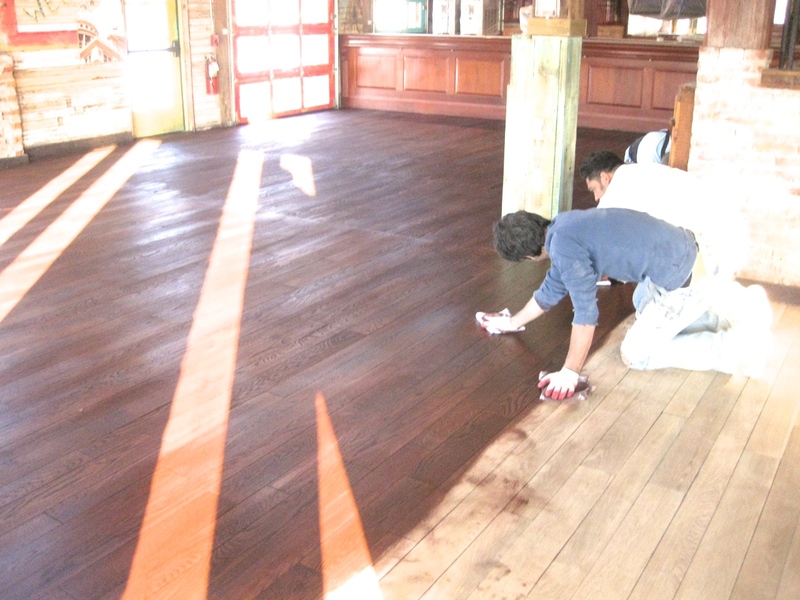 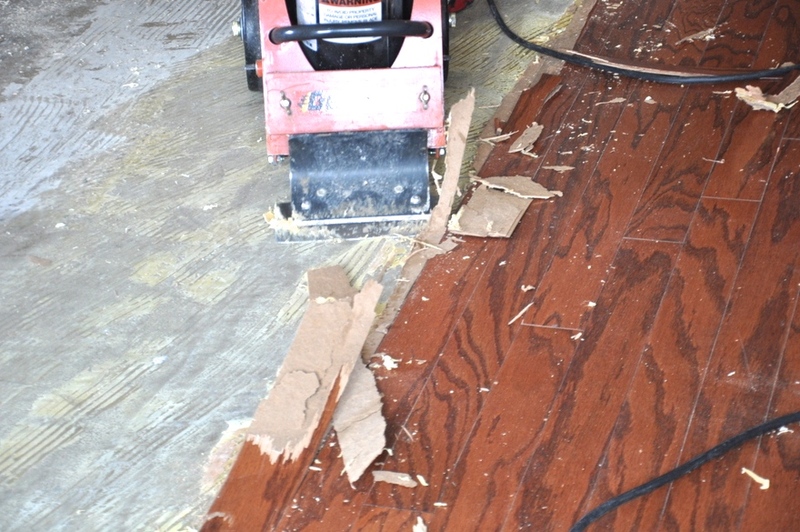 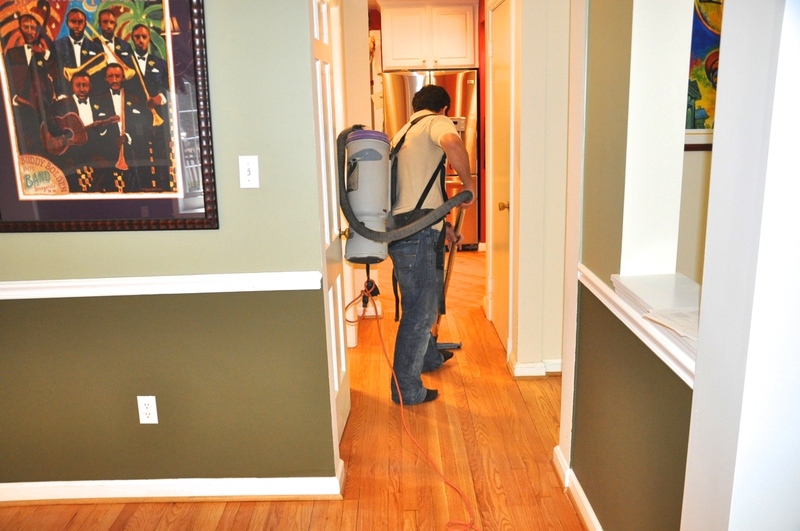 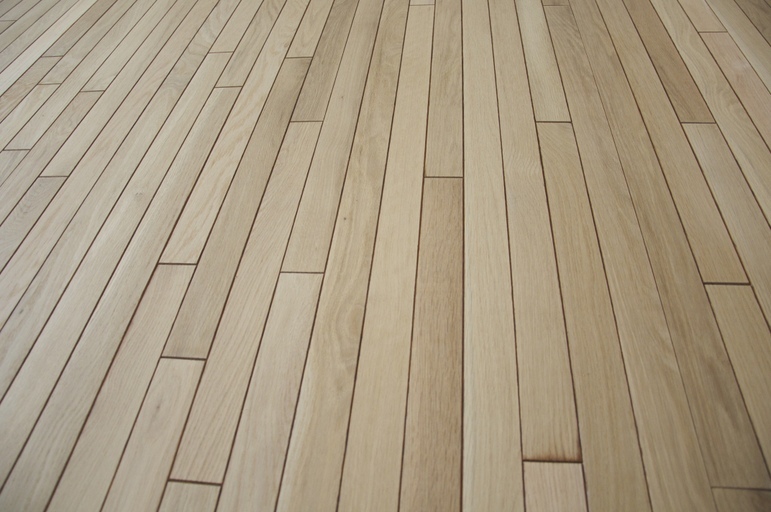 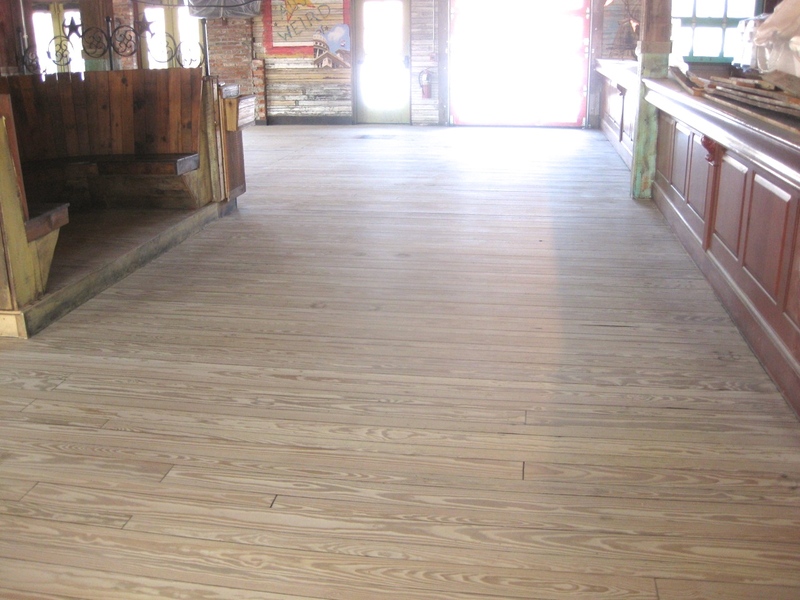 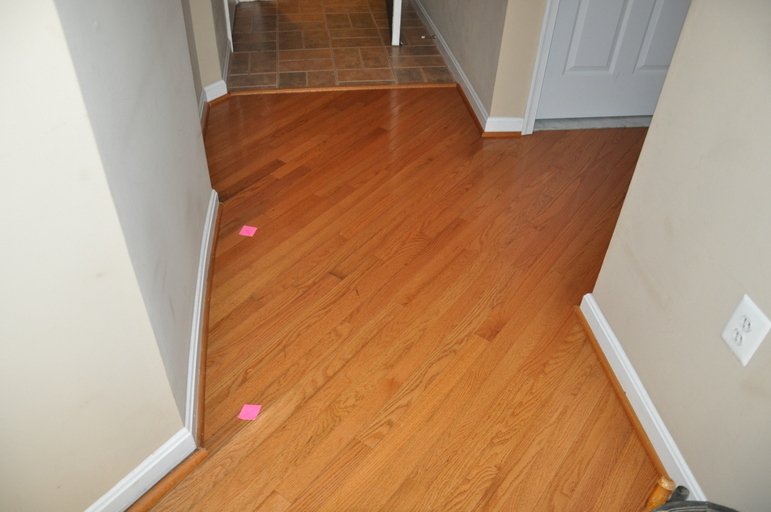 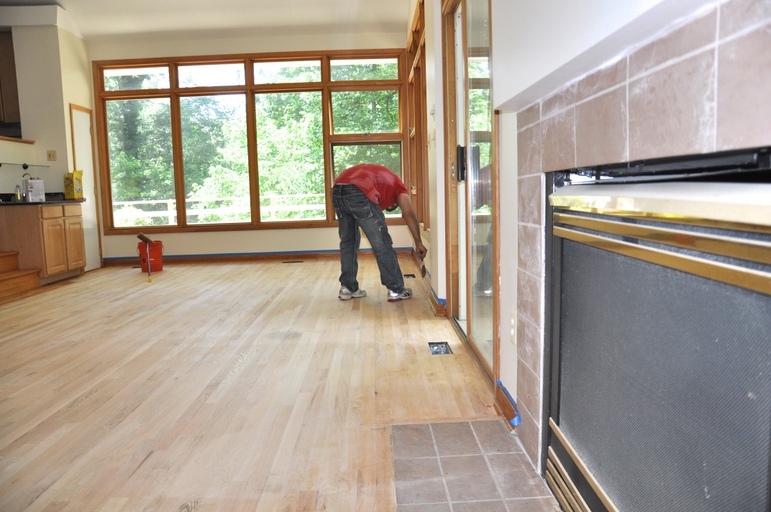 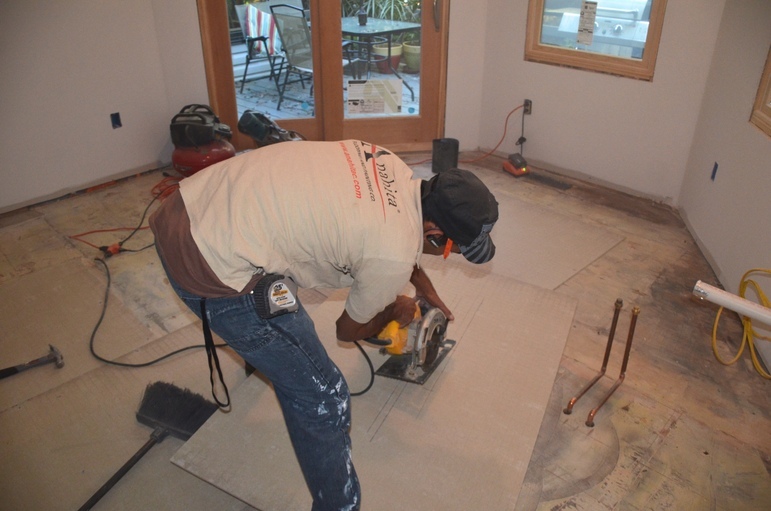 A key benefit of laminate flooring is the floating installation method. 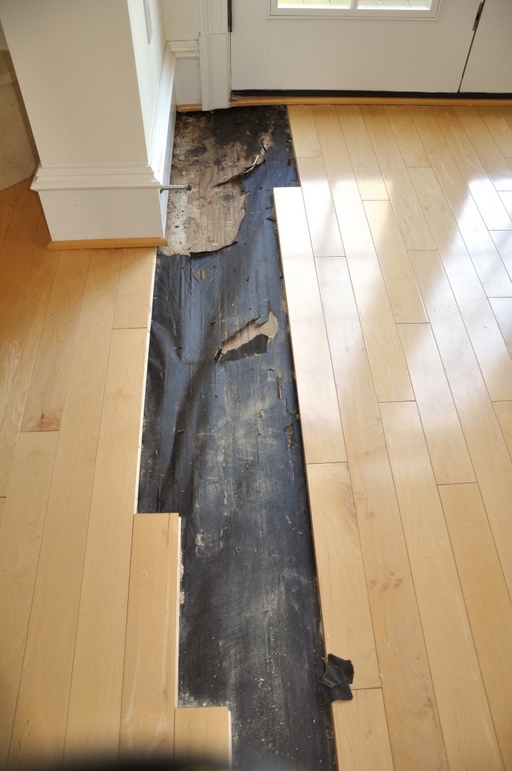 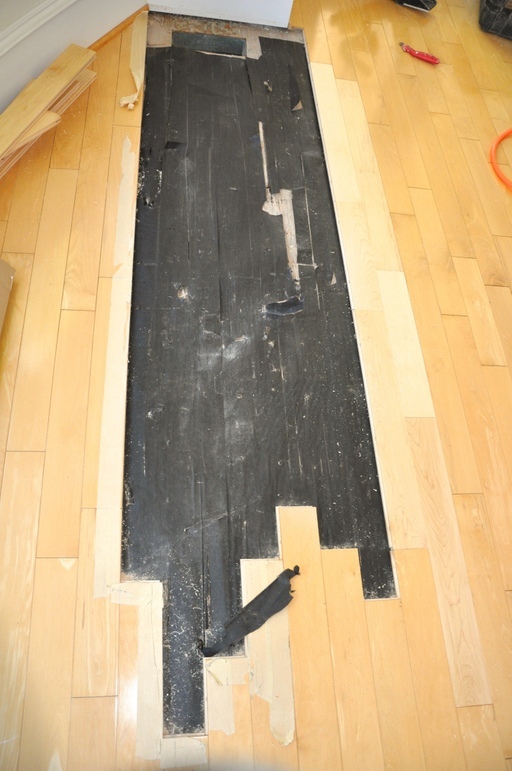 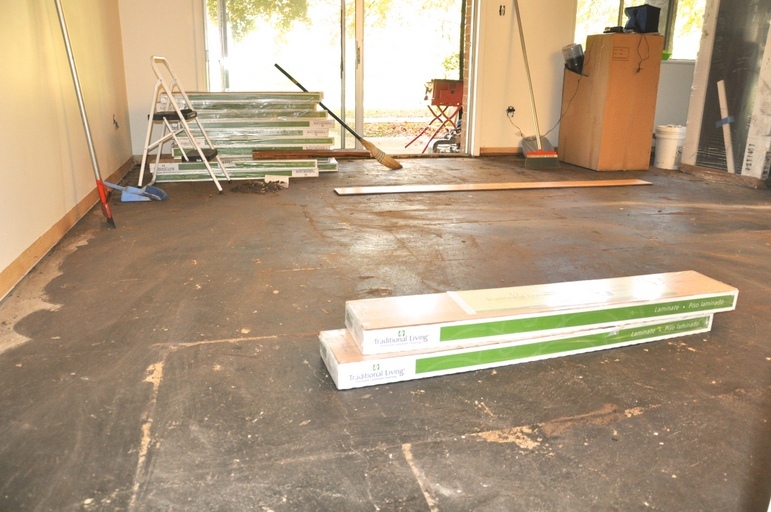 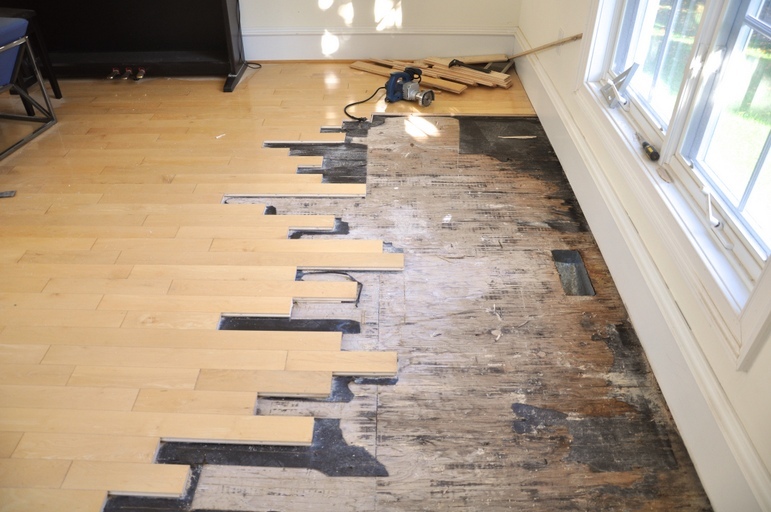 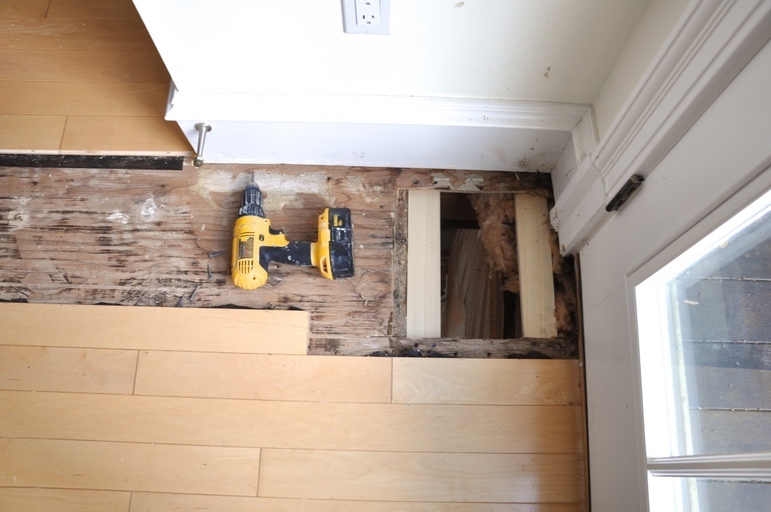 The floating installation method is when the individual planks are locked together but never attached to the subfloor underneath. 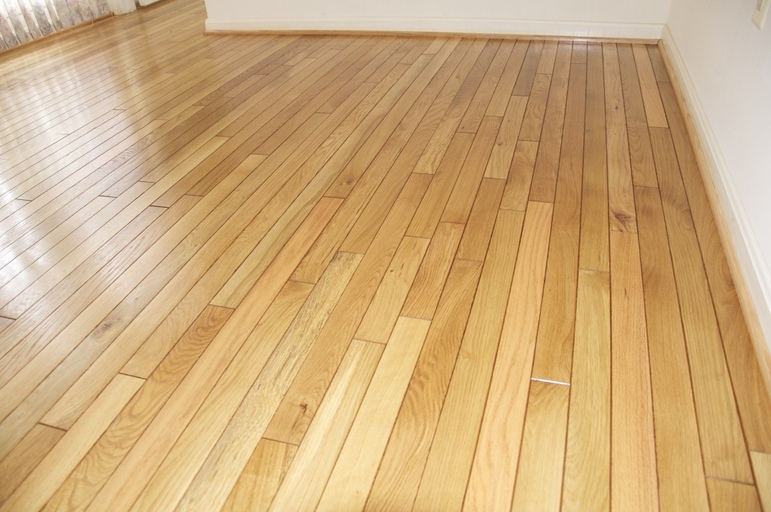 Laminate hardwood floors have a special tongue and groove locking system that tightly joins the planks or tiles together. 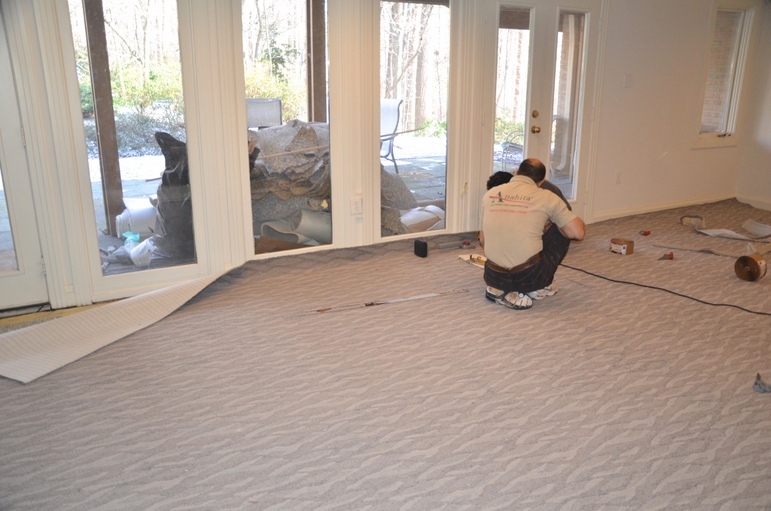 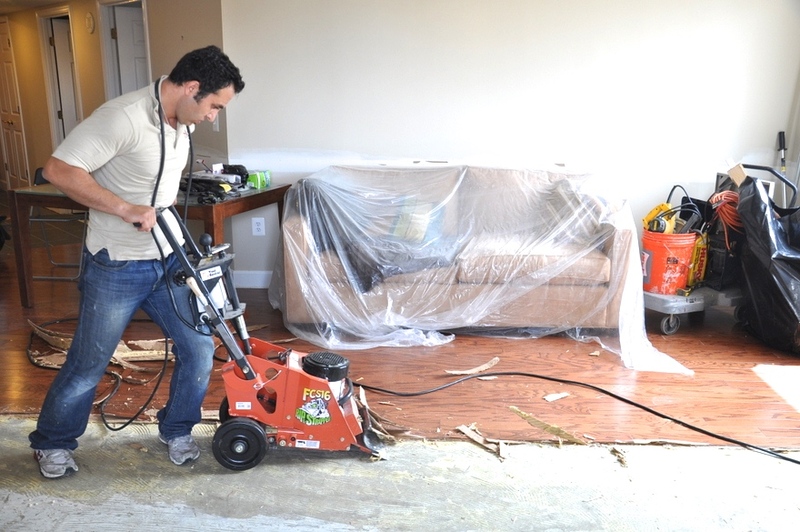 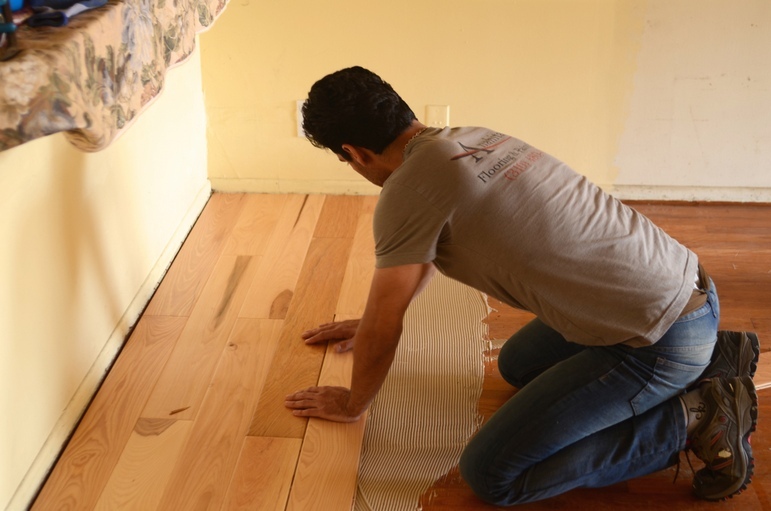 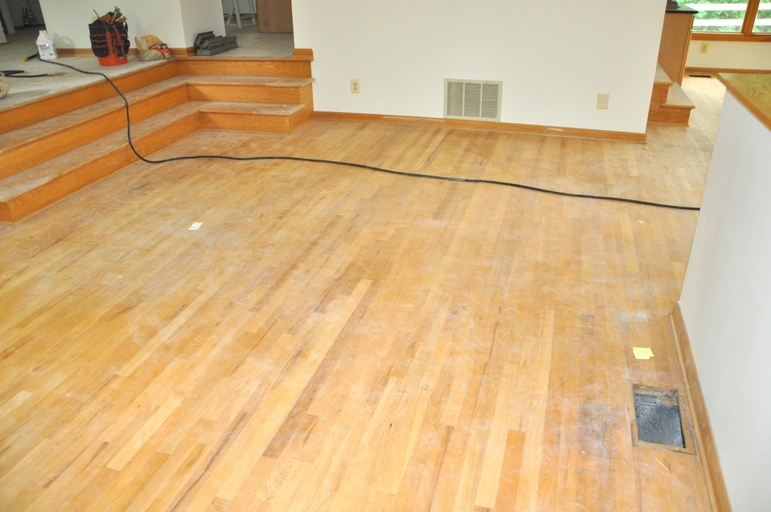 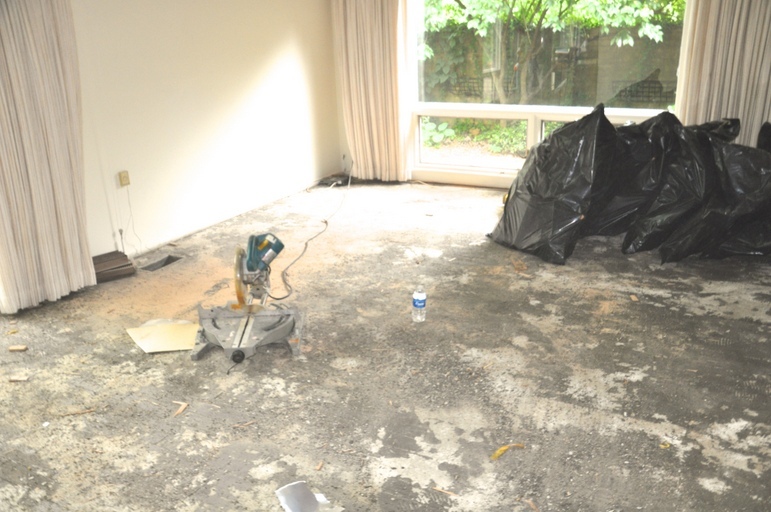 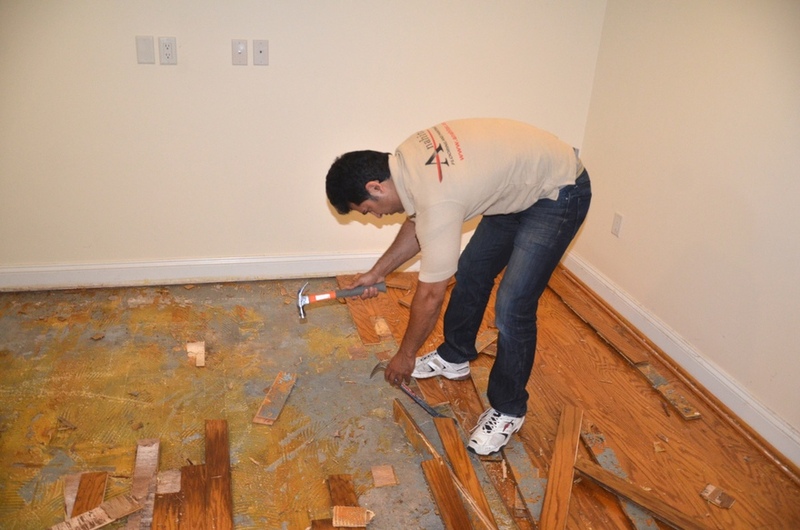 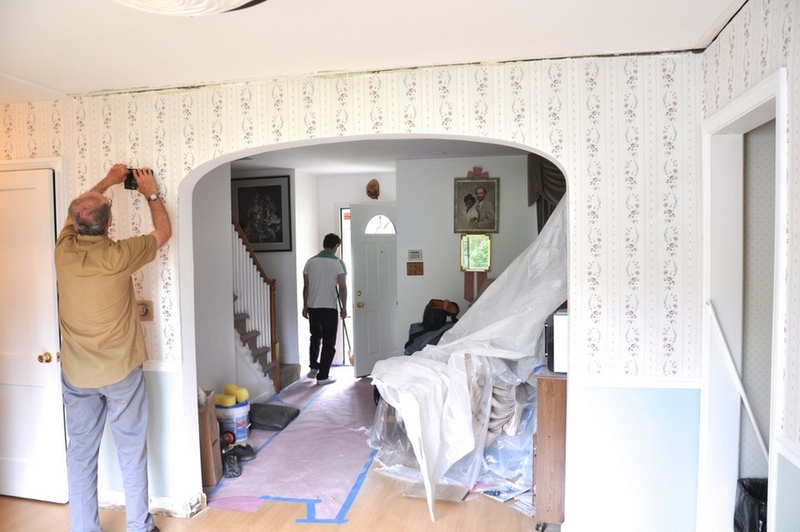 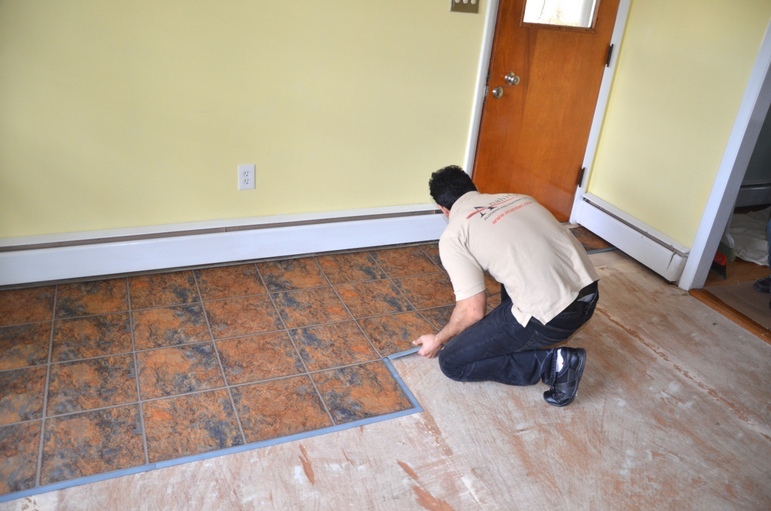 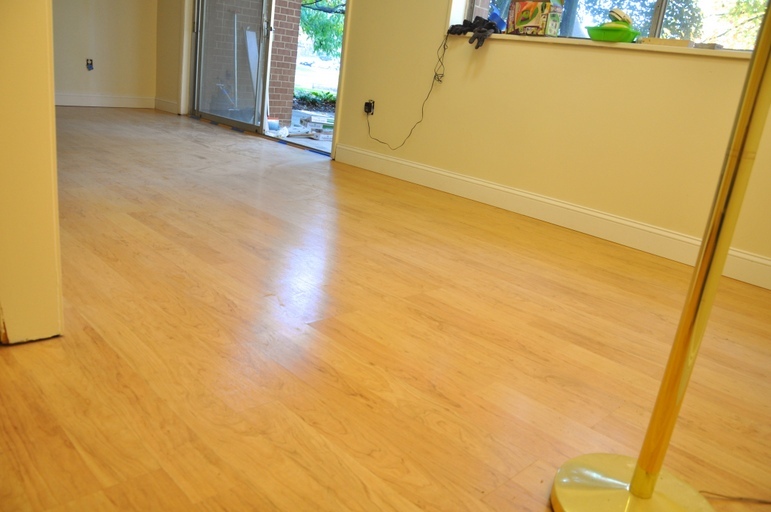 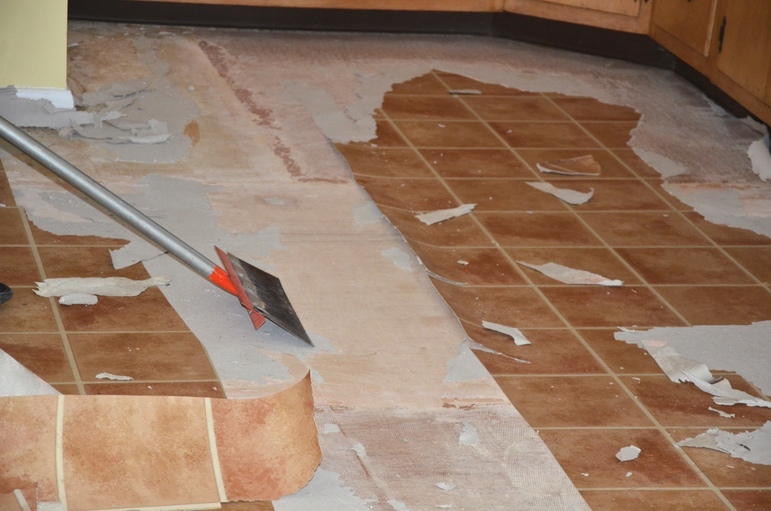 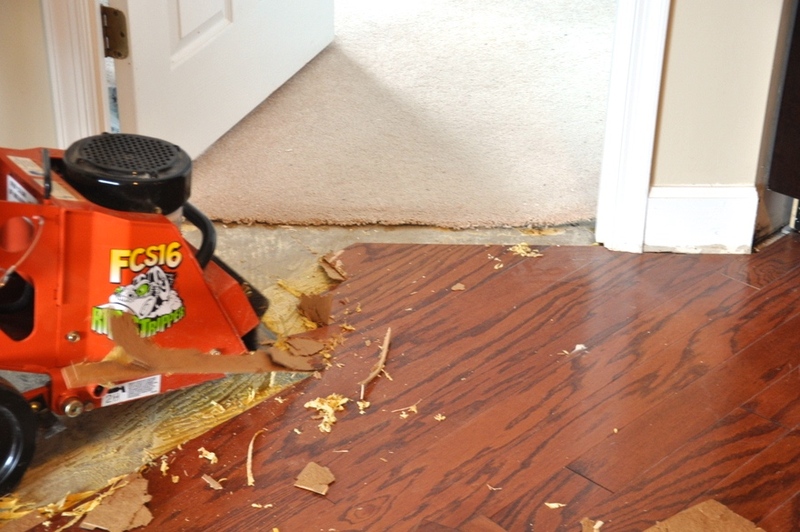 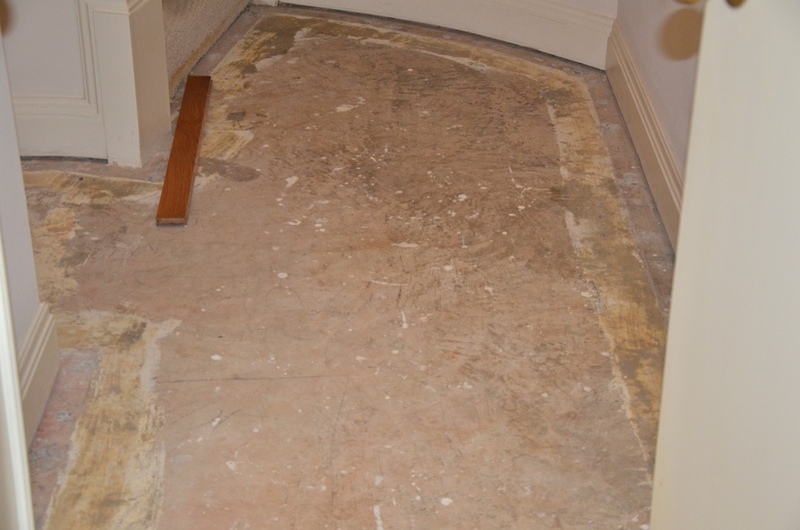 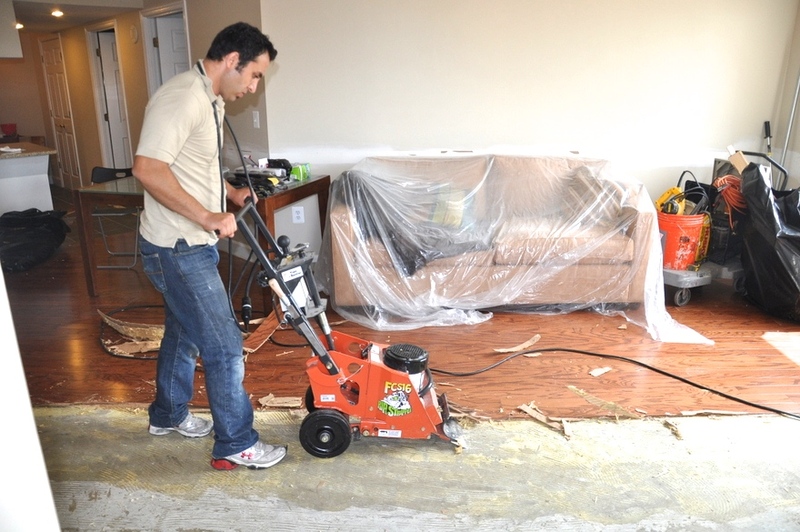 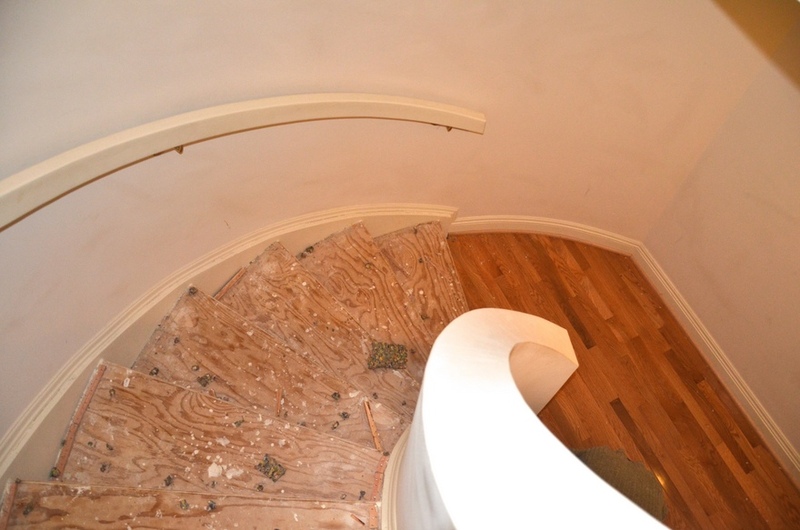 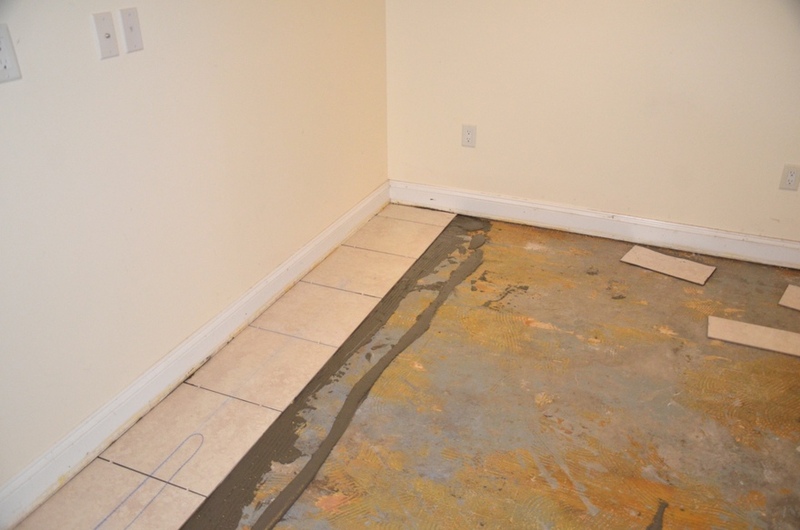 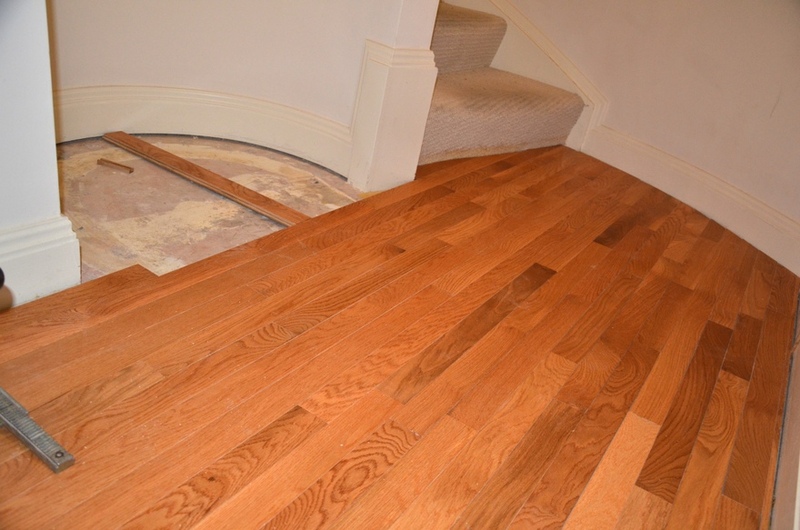 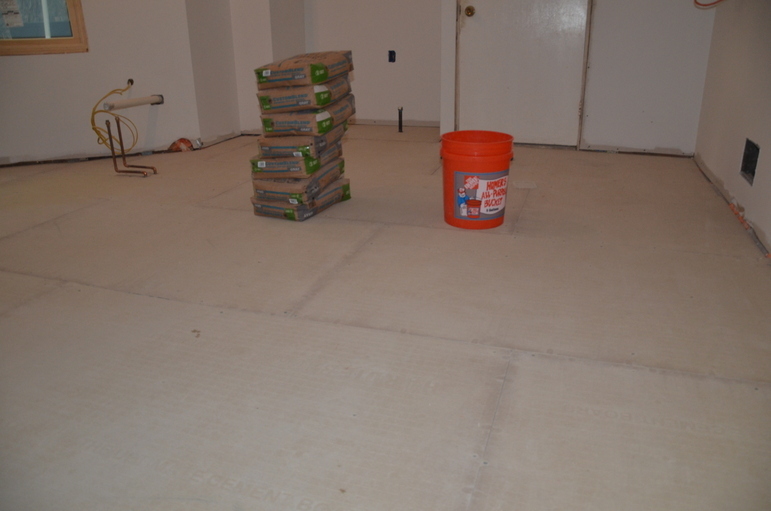 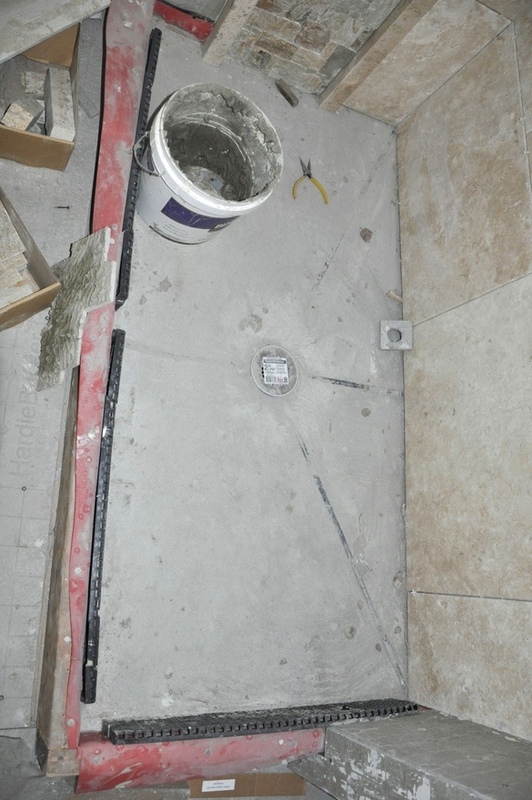 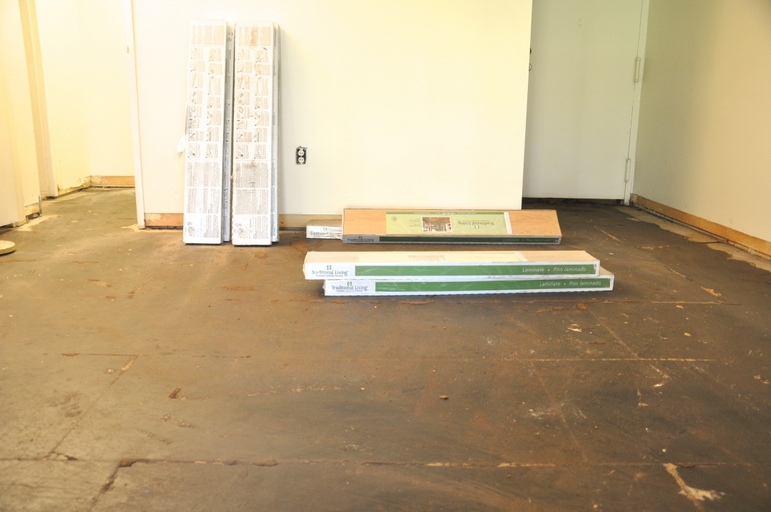 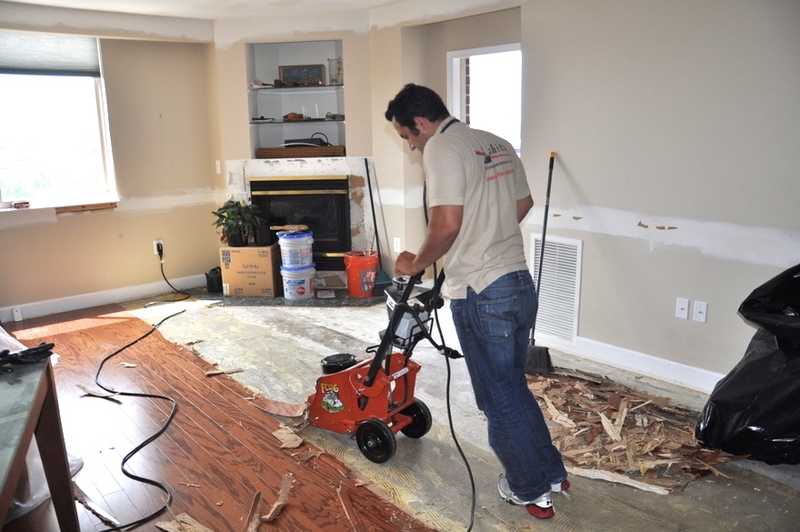 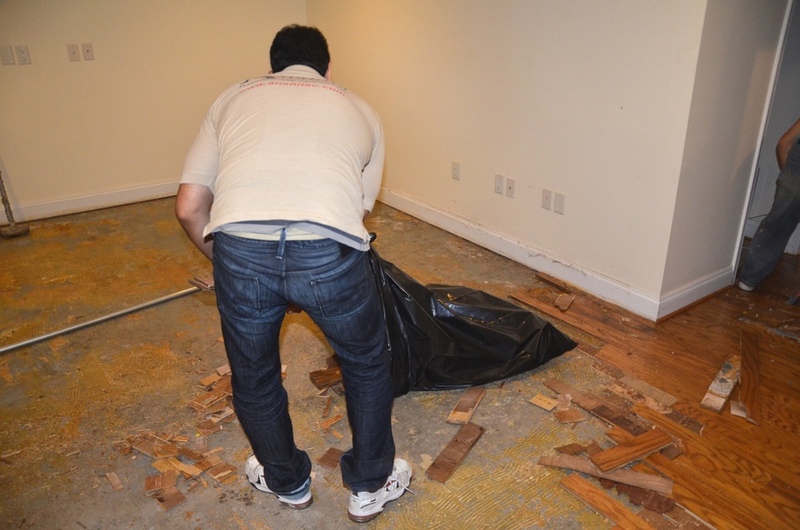 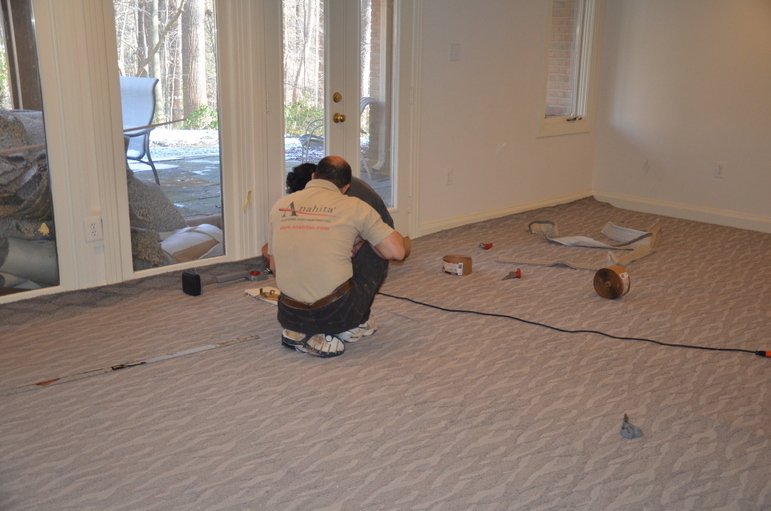 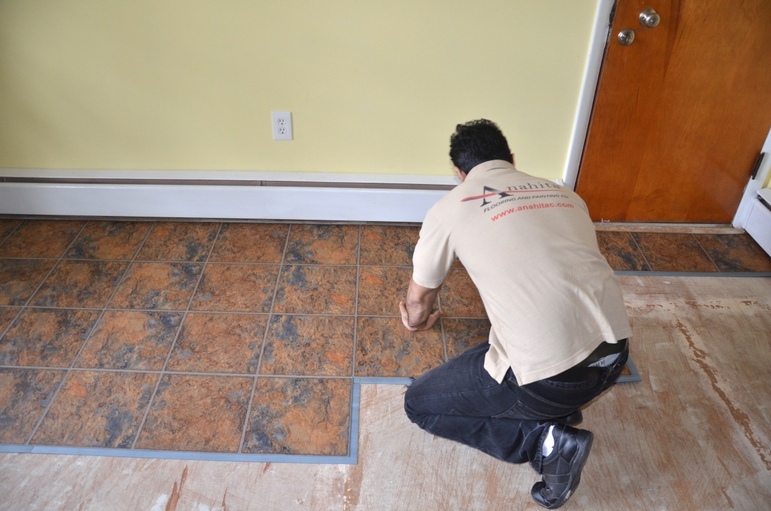 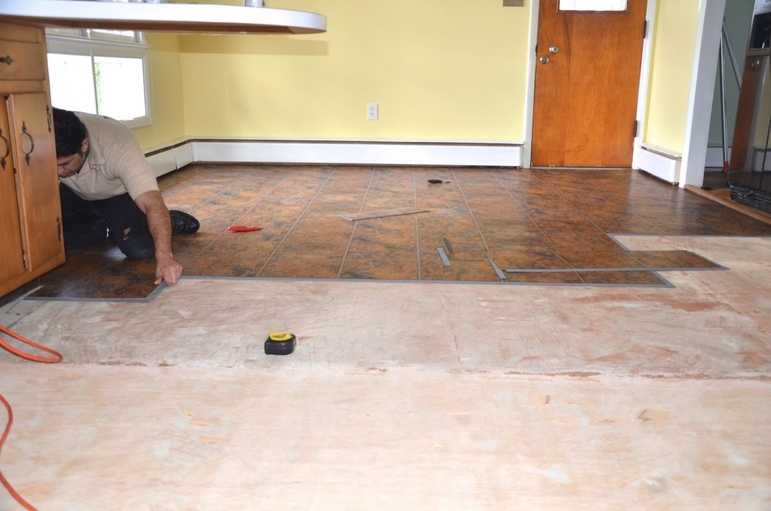 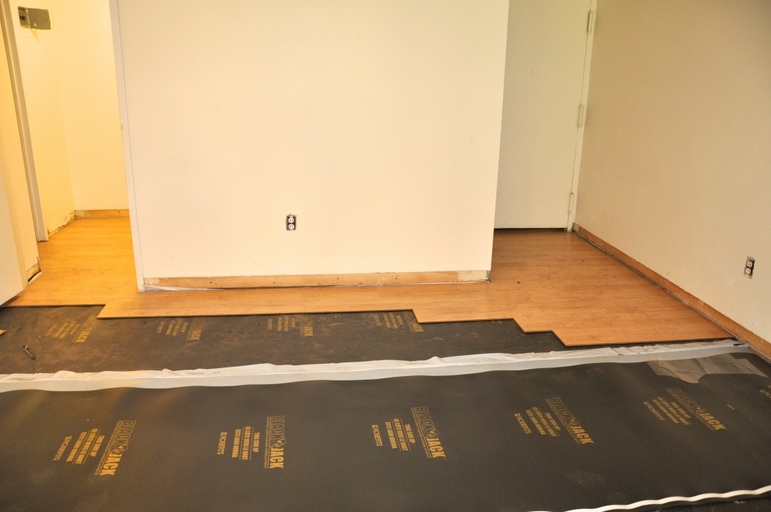 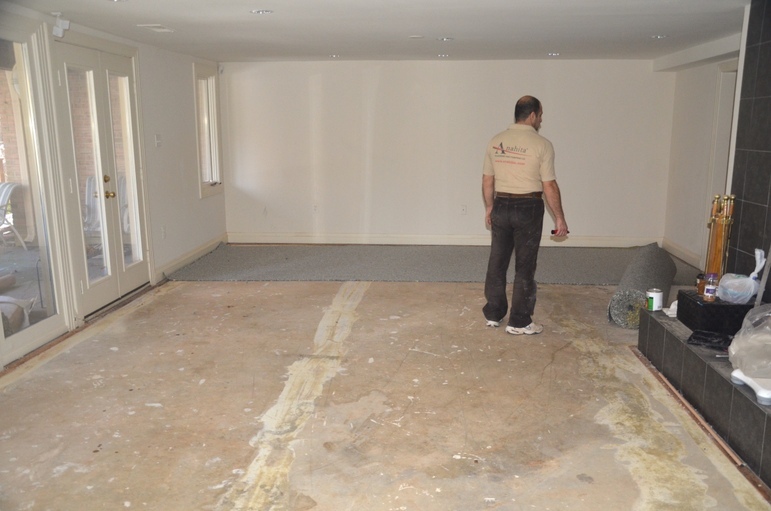 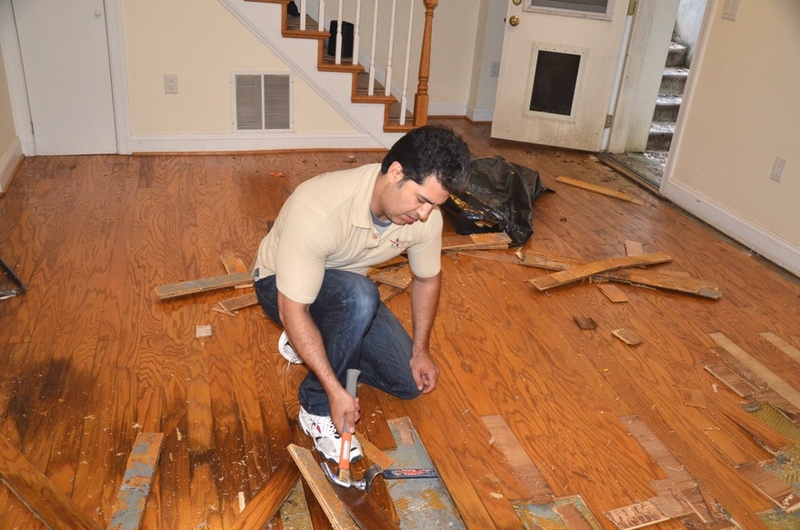 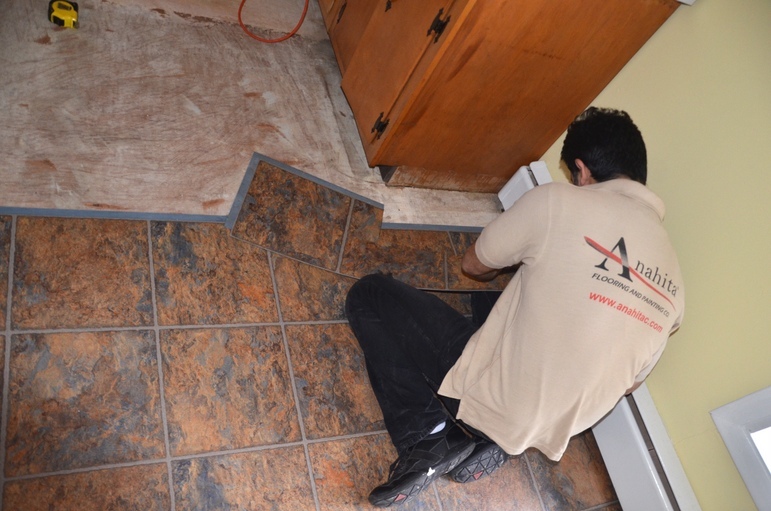 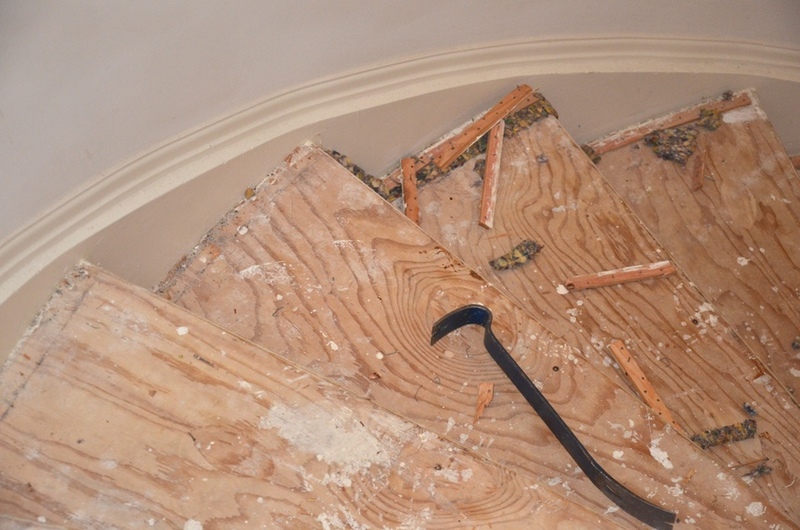 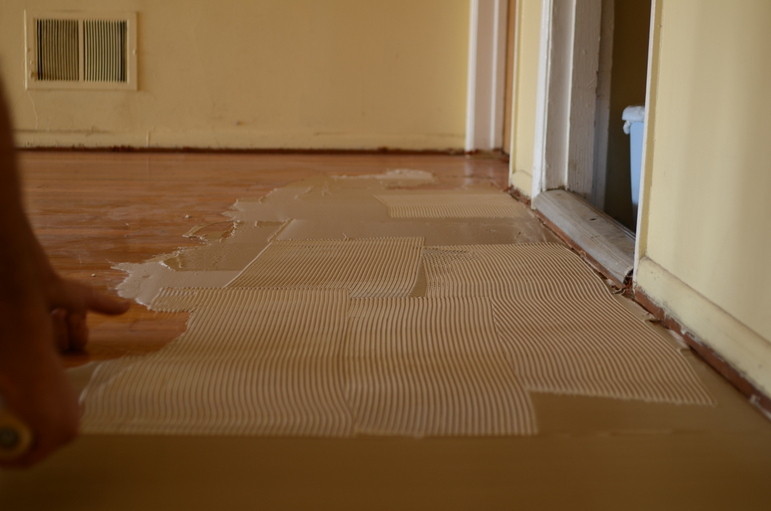 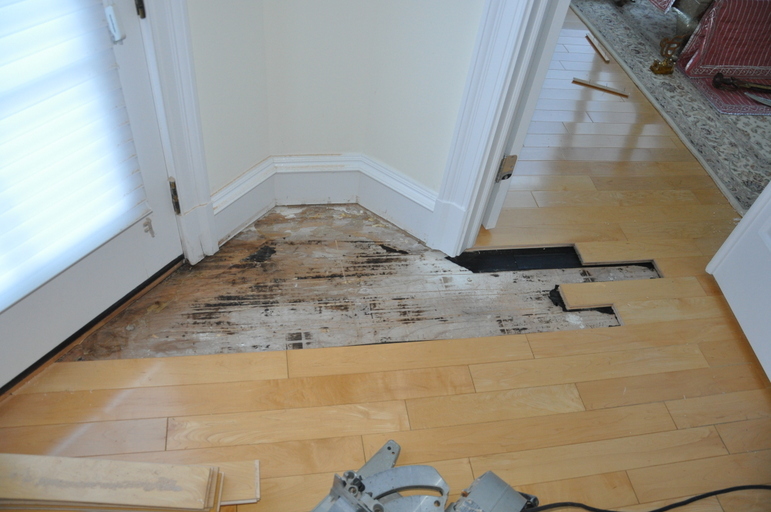 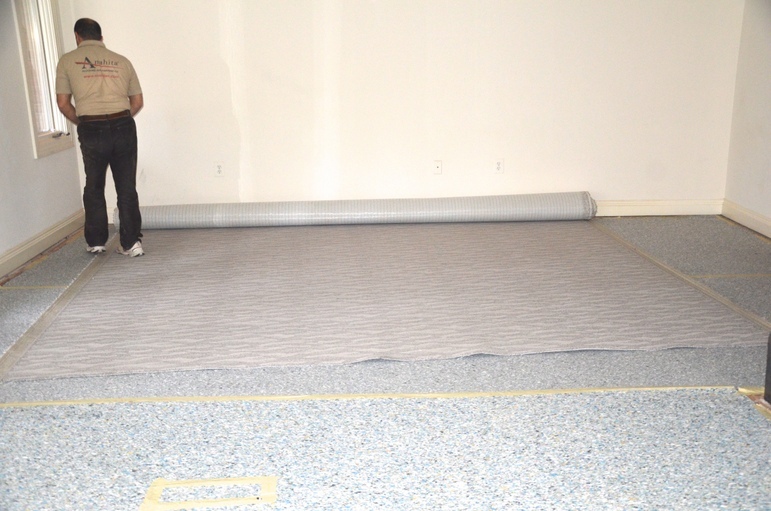 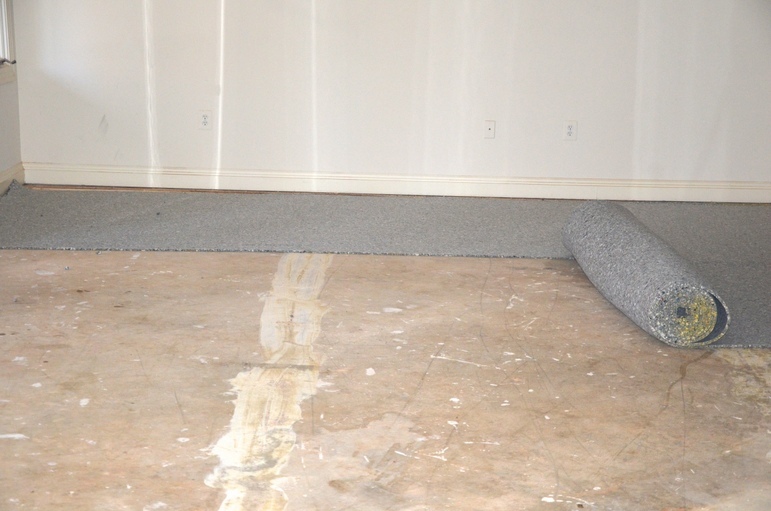 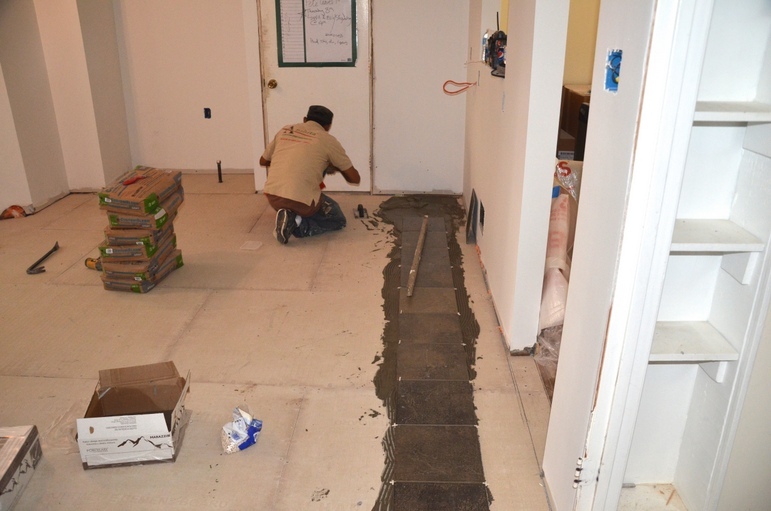 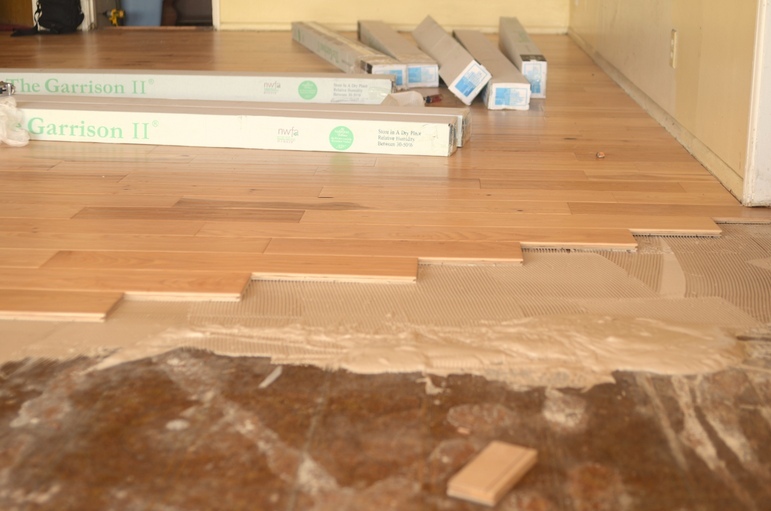 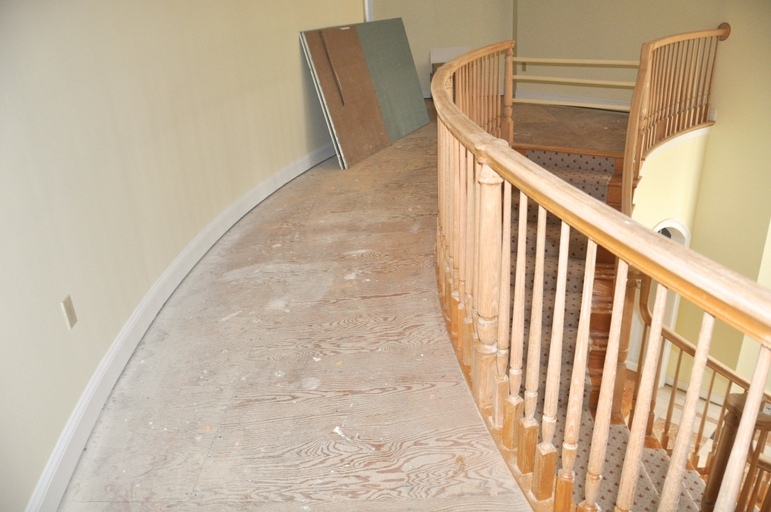 This installation system requires no glue, nails or staples and leaves the old floor intact (resulting in a considerable cost savings since removal of your old floor is not necessary). 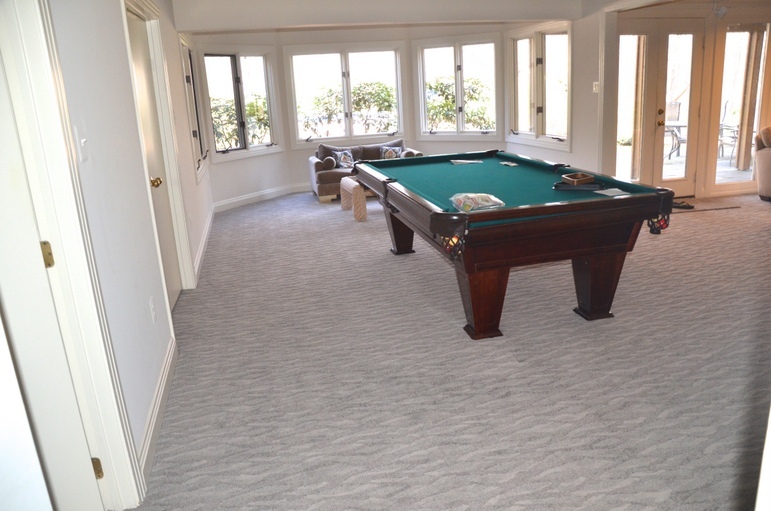 Carpet not only quiets a room but also offers homeowners more warmth and softness to touch than any other flooring product. 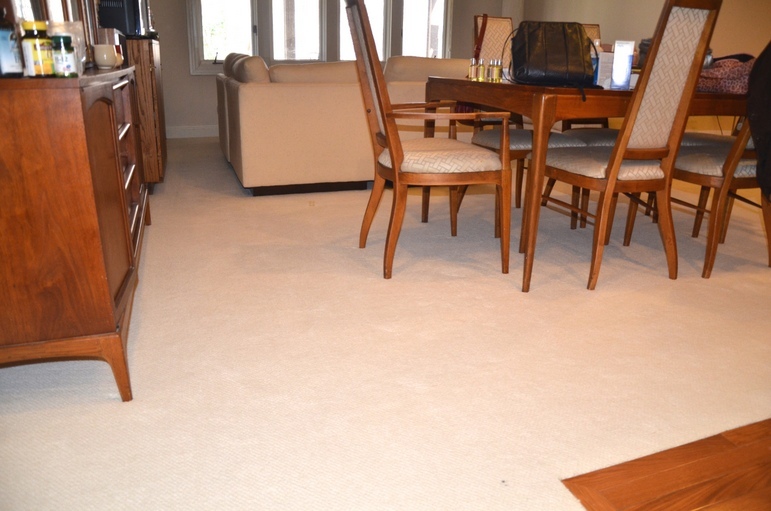 Advancements in carpet fiber technology are making carpets softer and more stain-resistant than ever before. 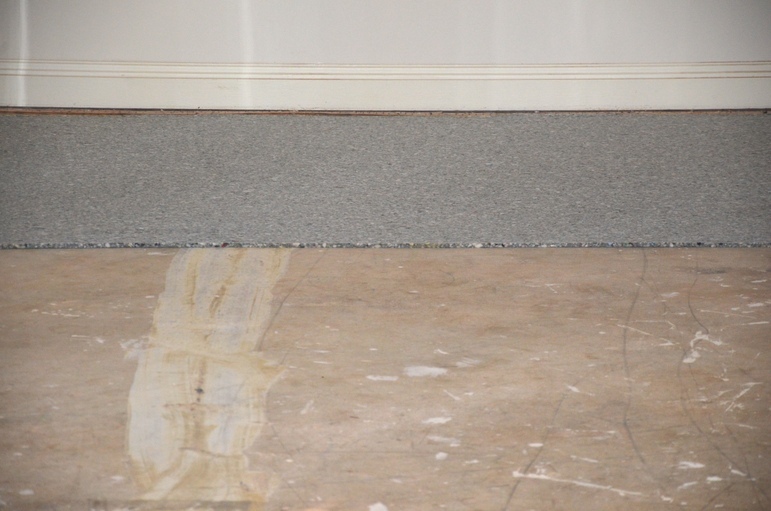 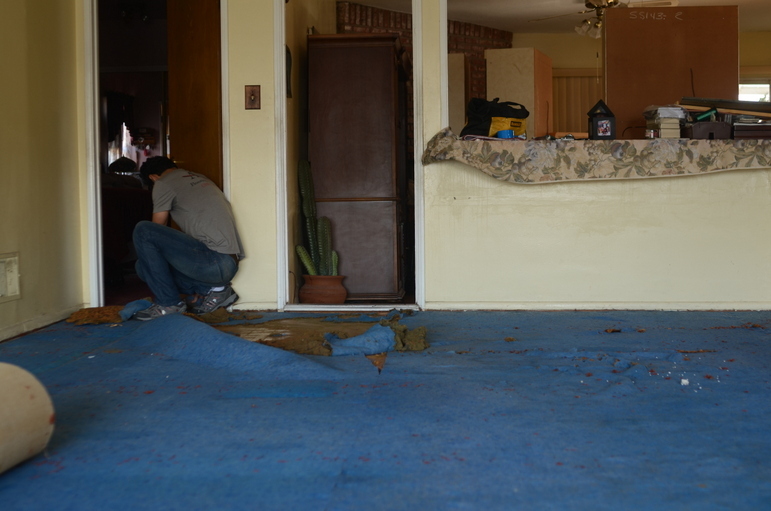 Carpet padding technology has been dramatically been improved as well. 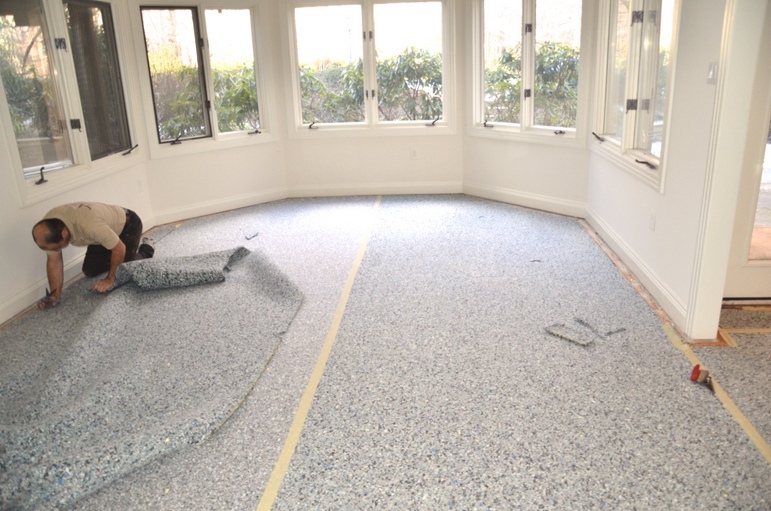 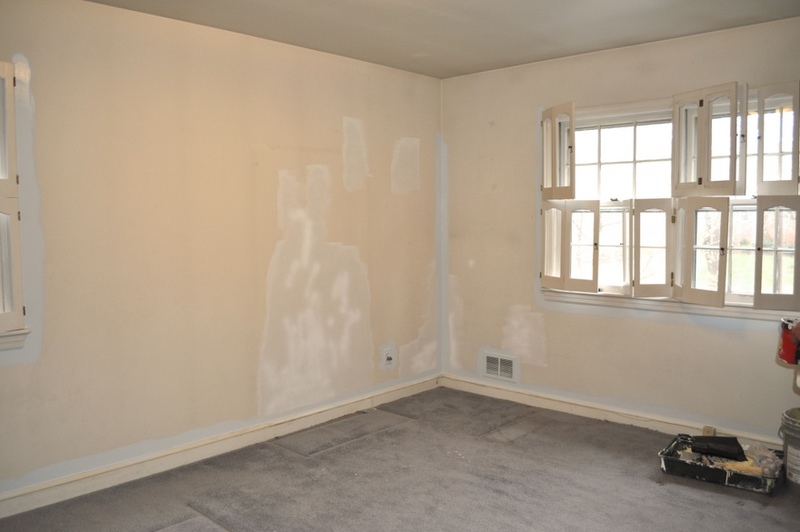 Some carpet padding can block liquid spills from penetrating the cushion and soaking into the subfloor while some padding are able to eliminate odors in your carpet. 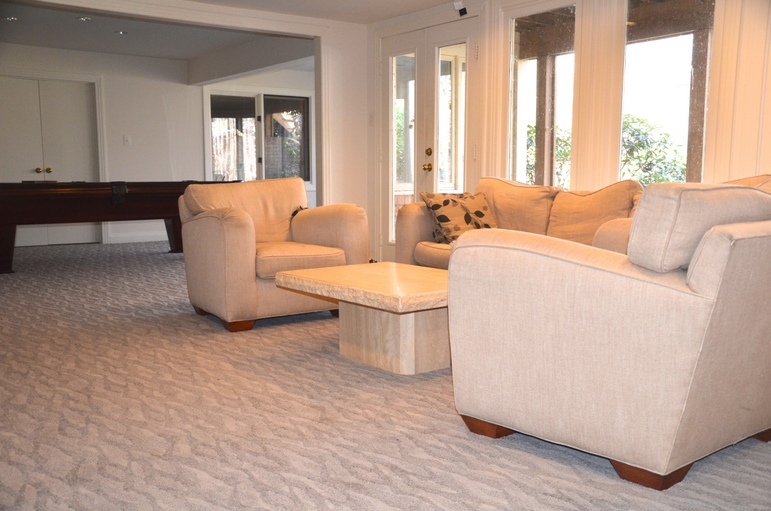 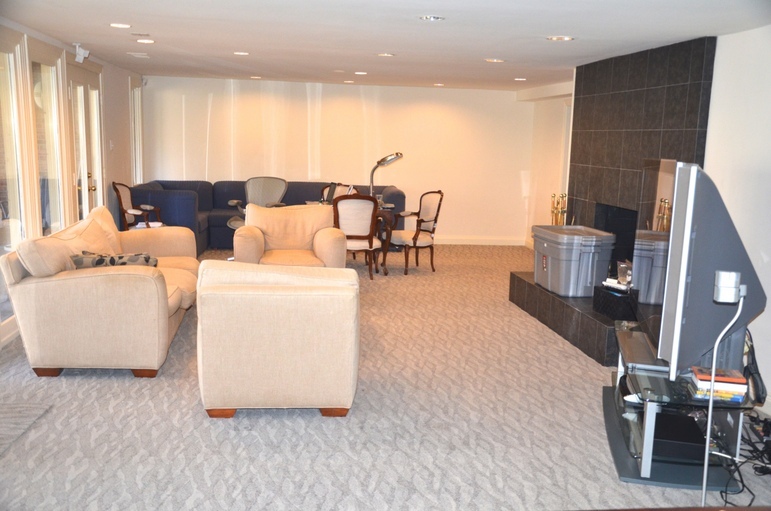 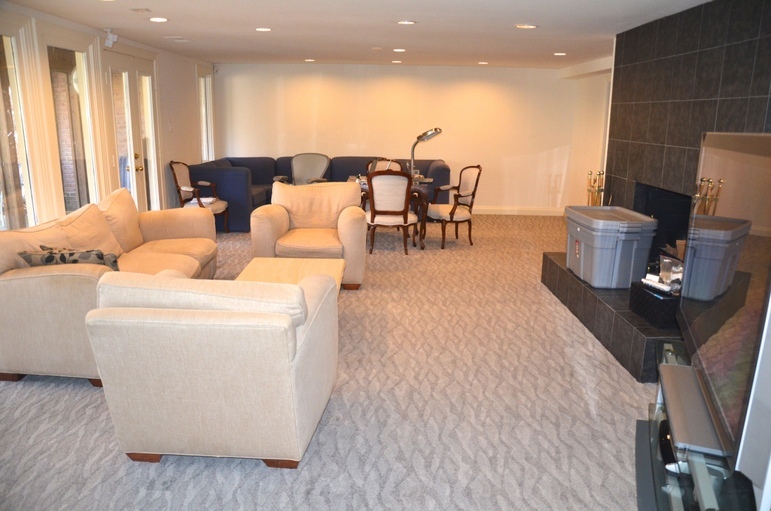 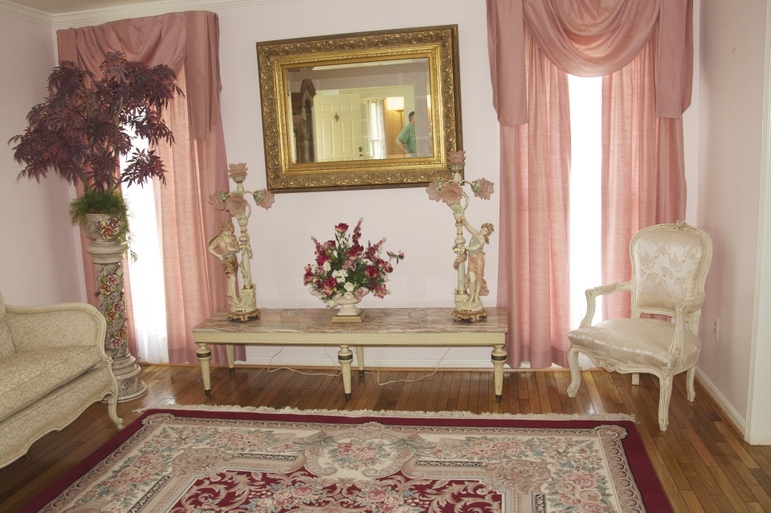 Carpet comes in a wide variety of colors and hues. 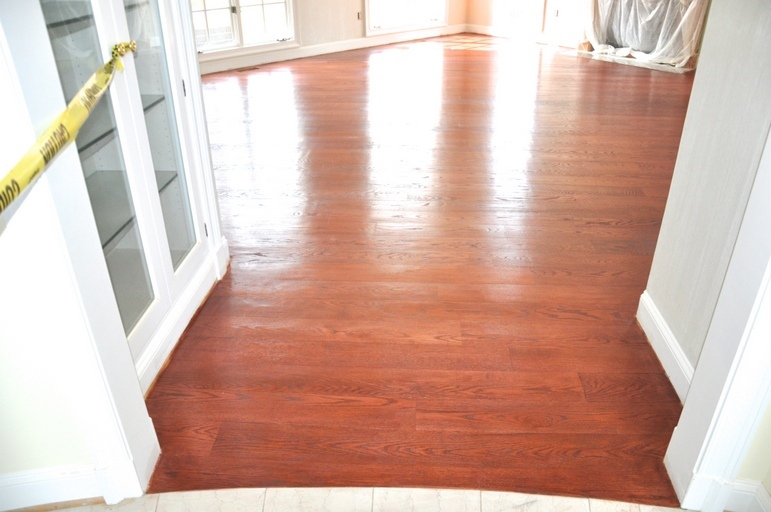 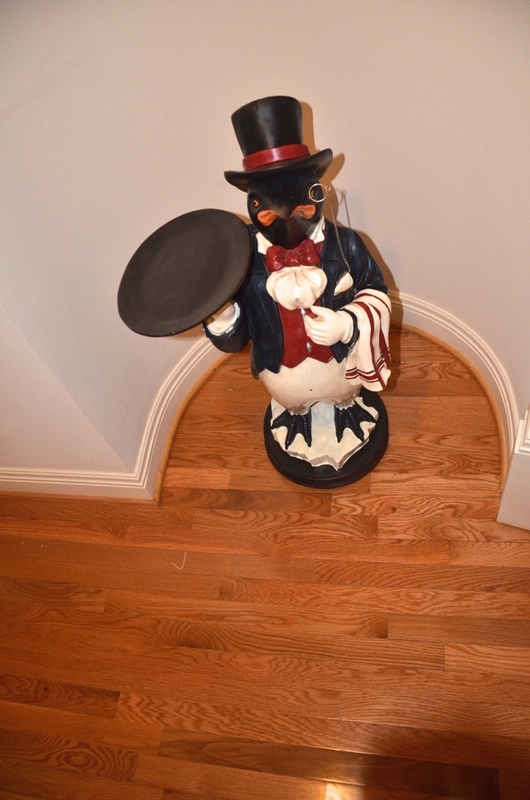 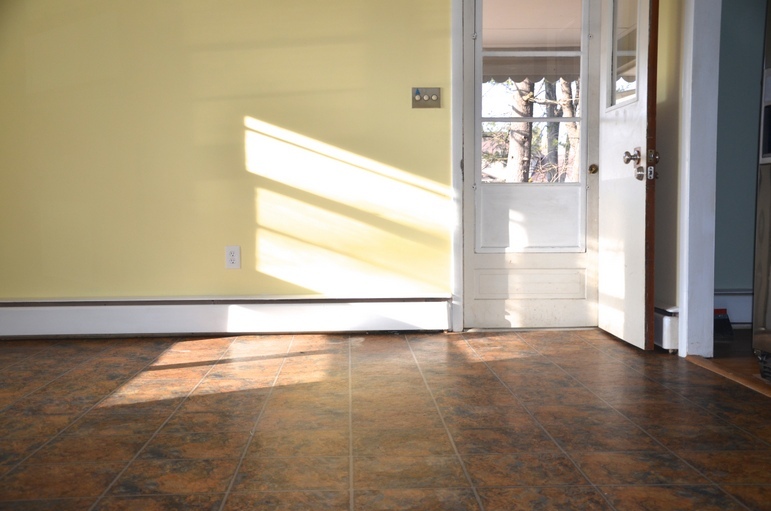 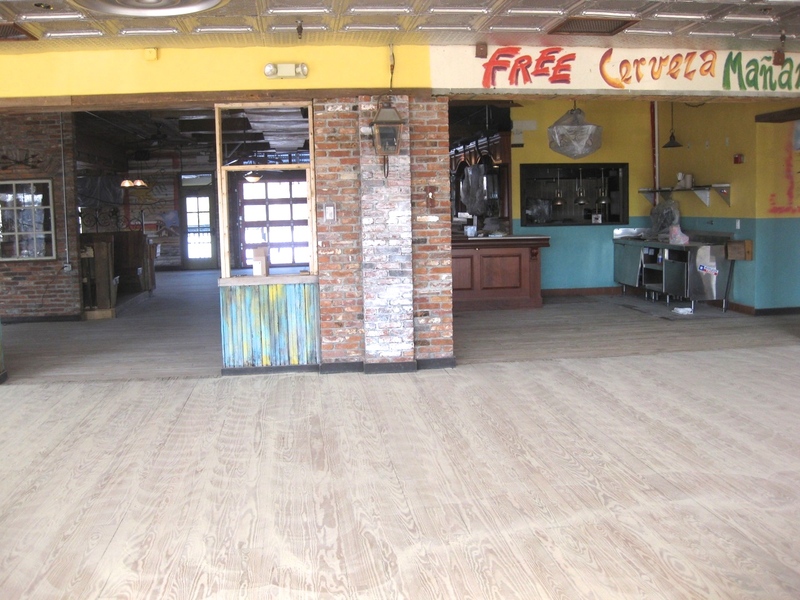 Vinyl floors offer a variety of colors and patterns. 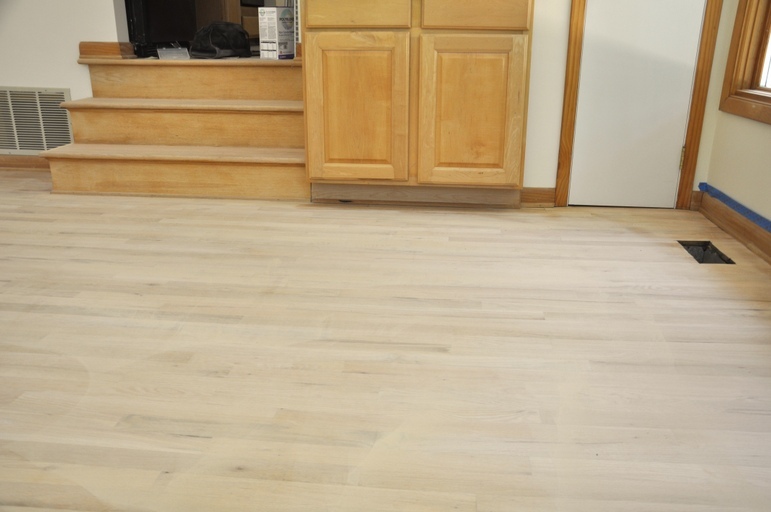 The most Recent advancements in wearlayer backing technology and styling make vinyl floors America's number one choice for your flooring solutions. 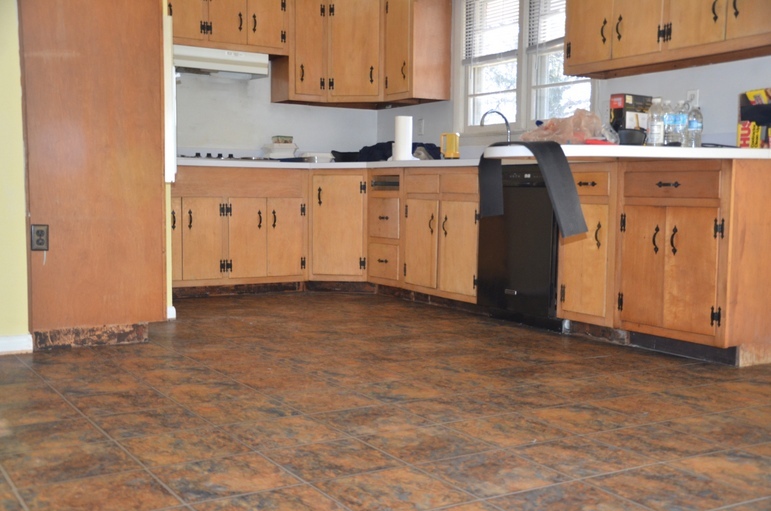 Sheet vinyl is a very durable flooring solution that remains a popular choice amongst homeowners seeking a sturdy and cost-effective floor. 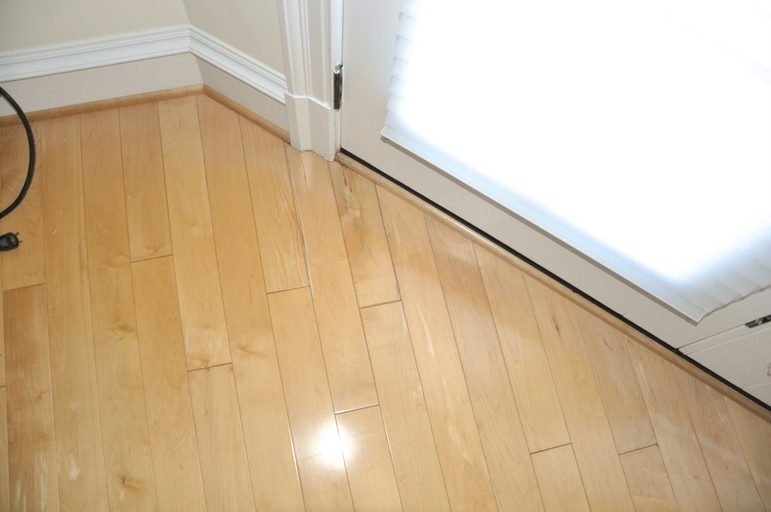 There are two basic types of sheet vinyl (perimeter-bond and full-bond). 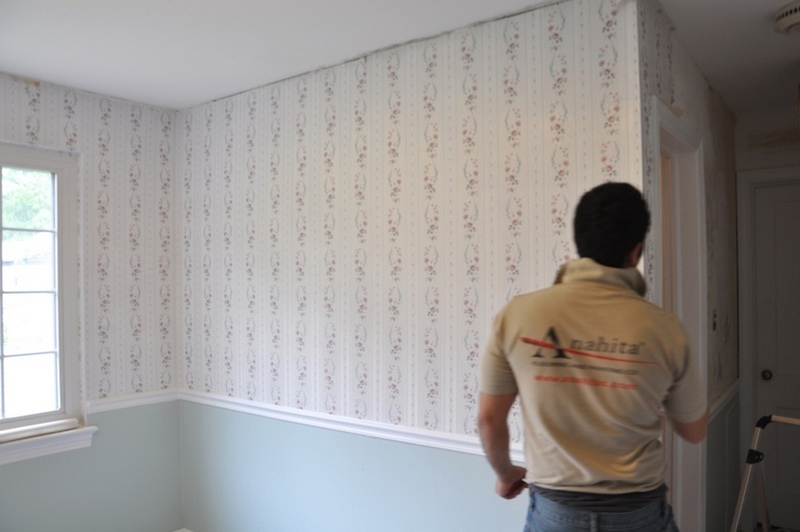 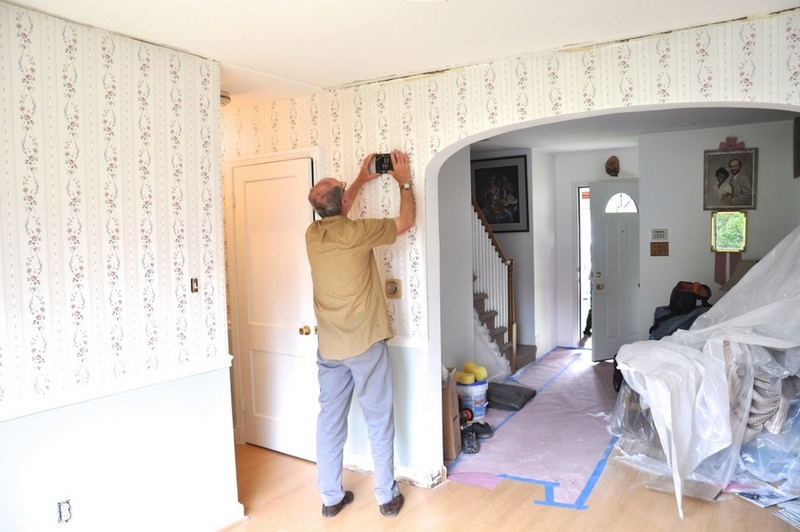 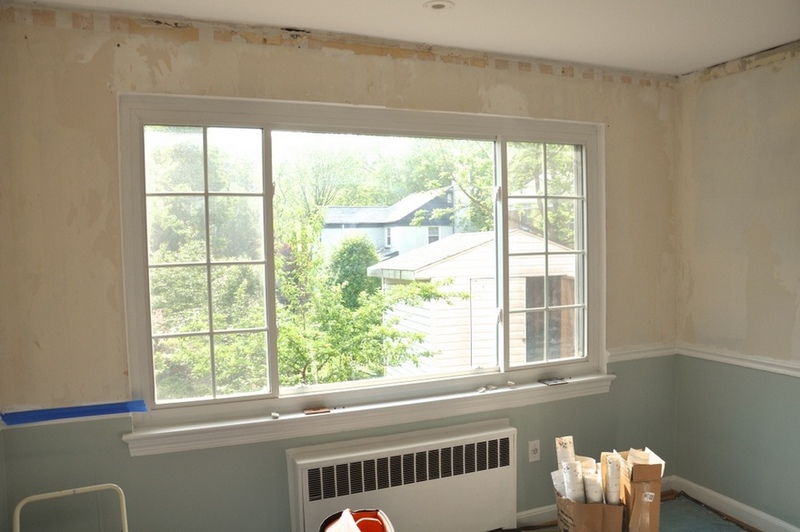 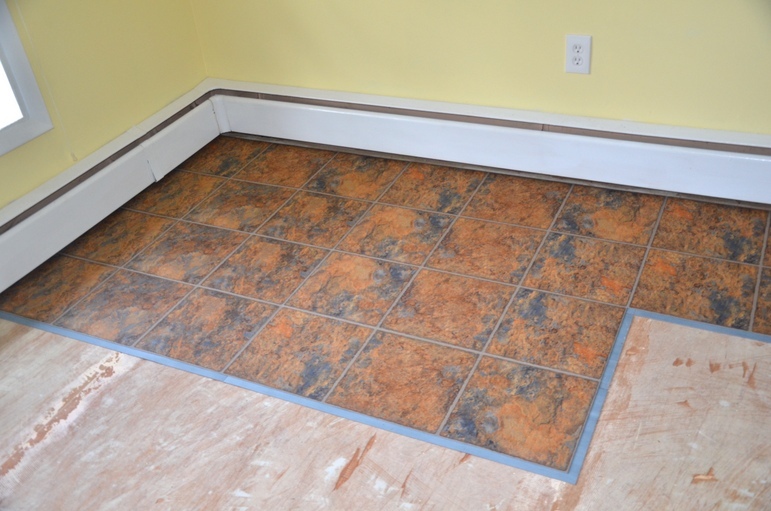 Perimeter-bond sheet vinyl adheres to a flat surface by placing glue around the outer edges of the sheet. 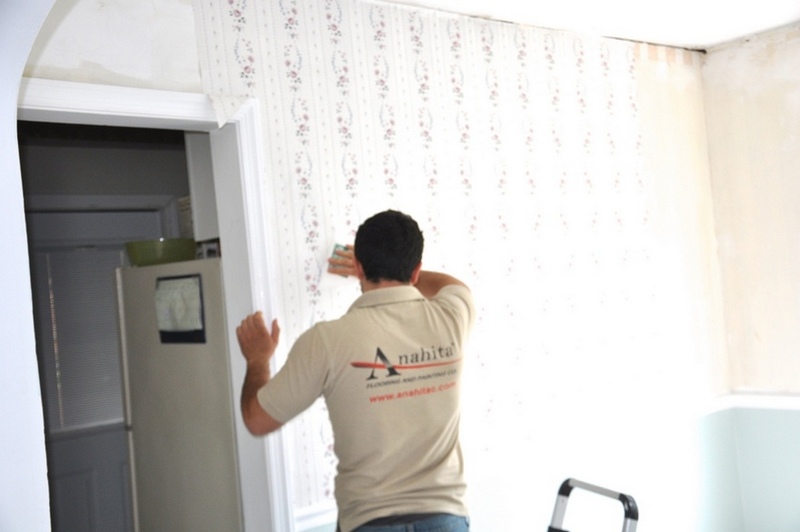 Full-bond sheet vinyl adheres to a flat surface by placing glue on the entire backside of the sheet. 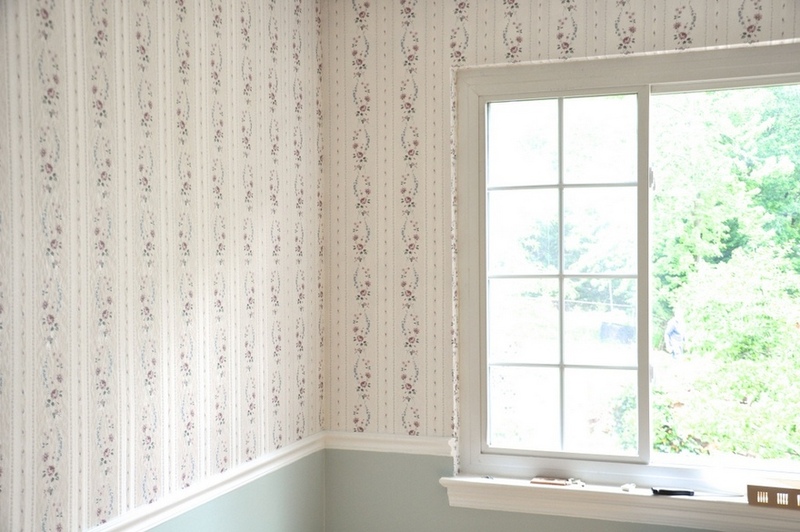 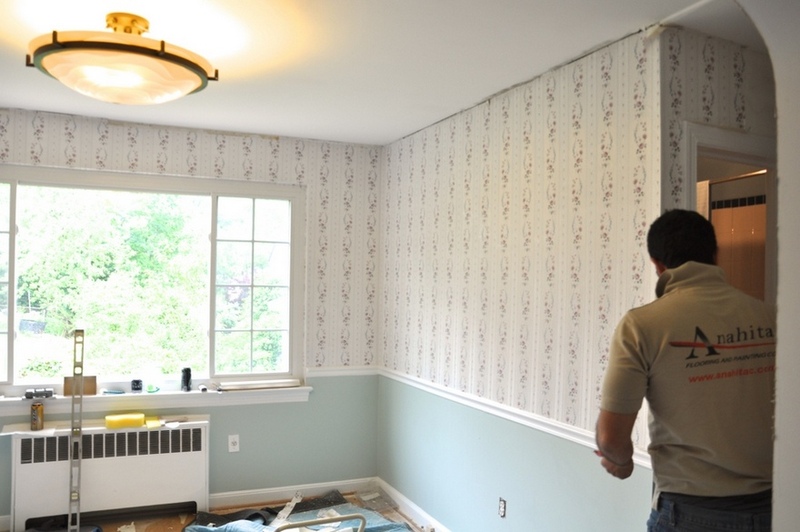 Sheet vinyl is available in a variety of styles and patterns. 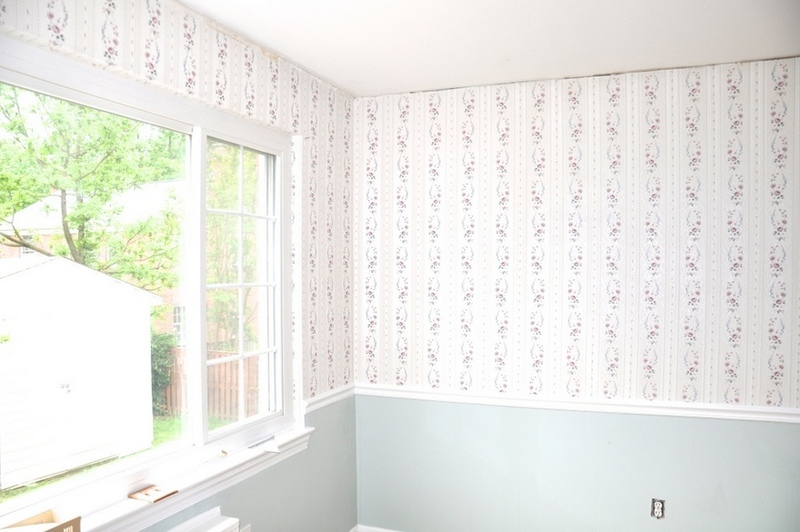 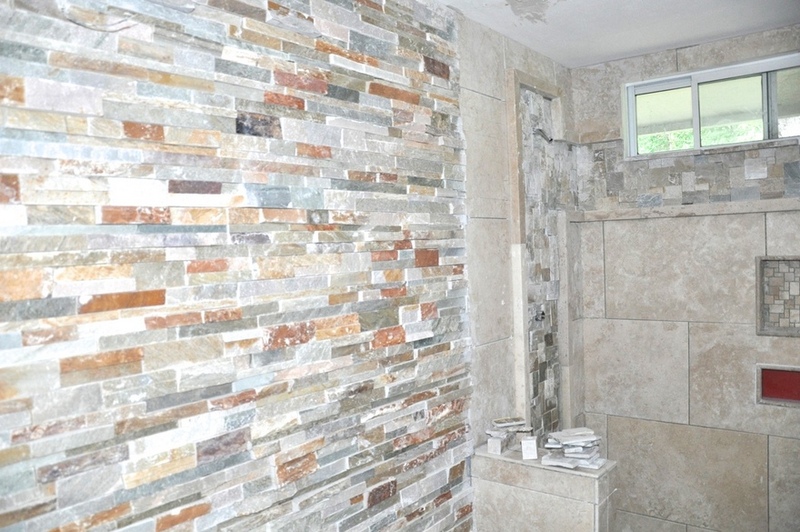 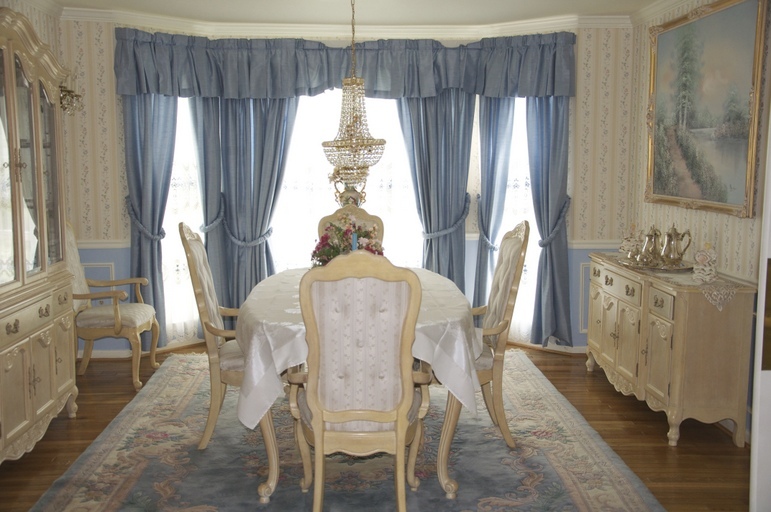 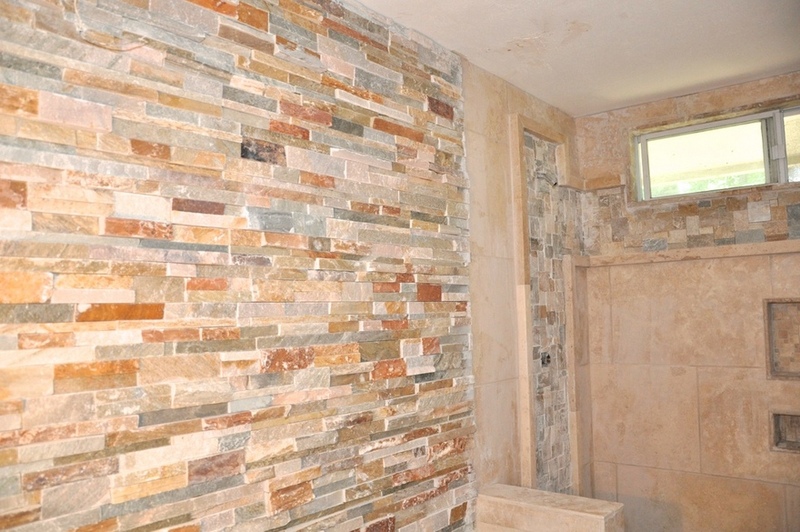 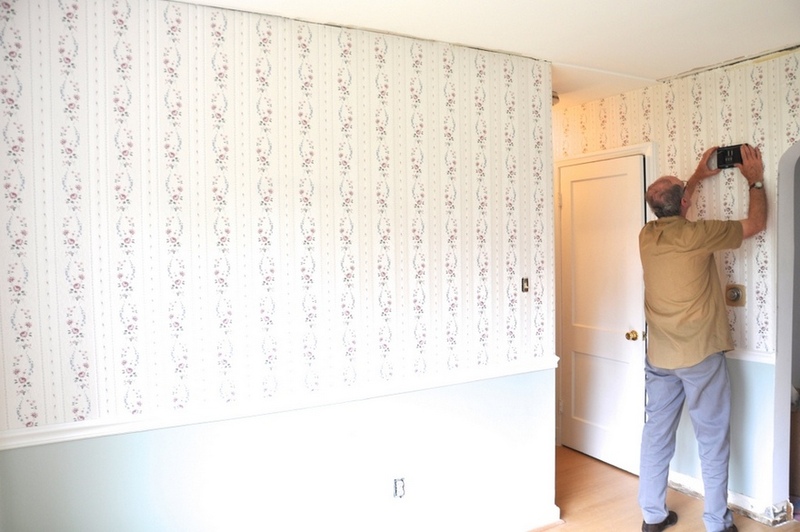 Please click on the various samples to find the right sheet vinyl for your home. 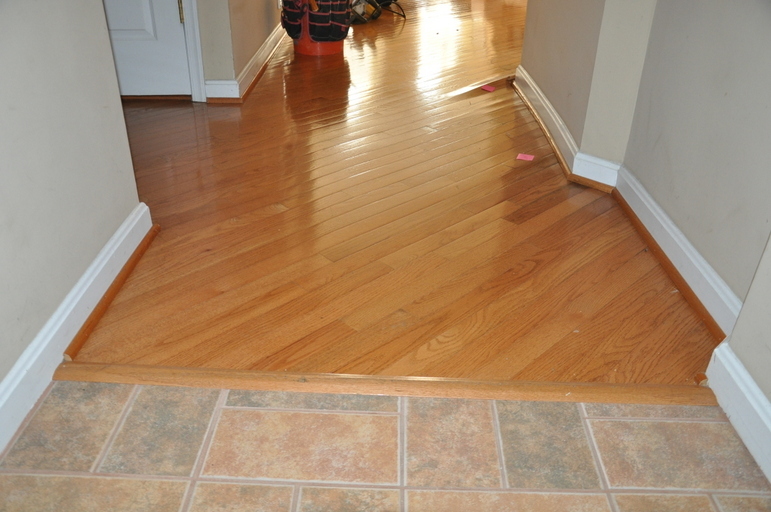 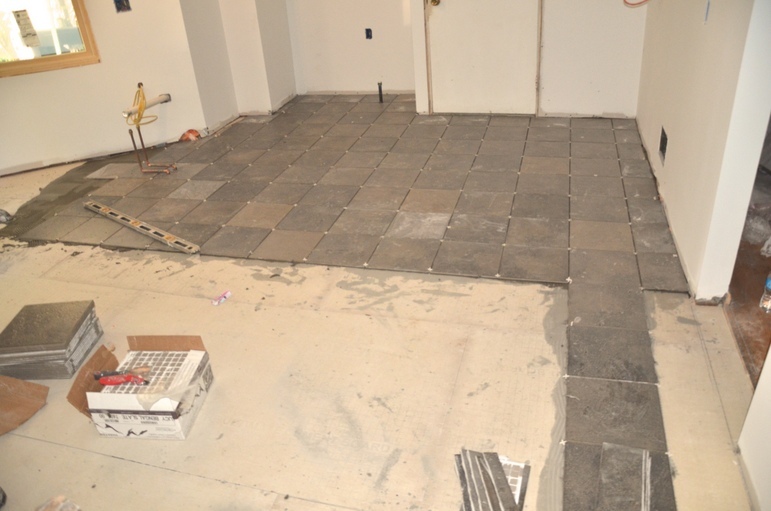 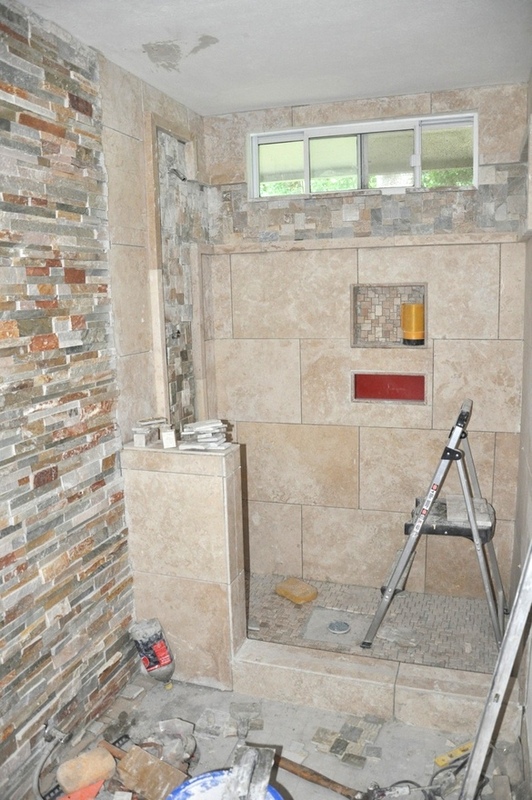 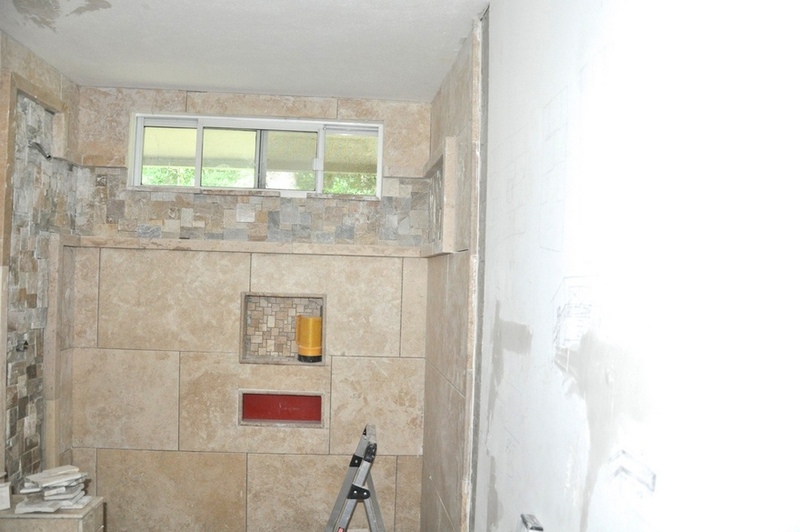 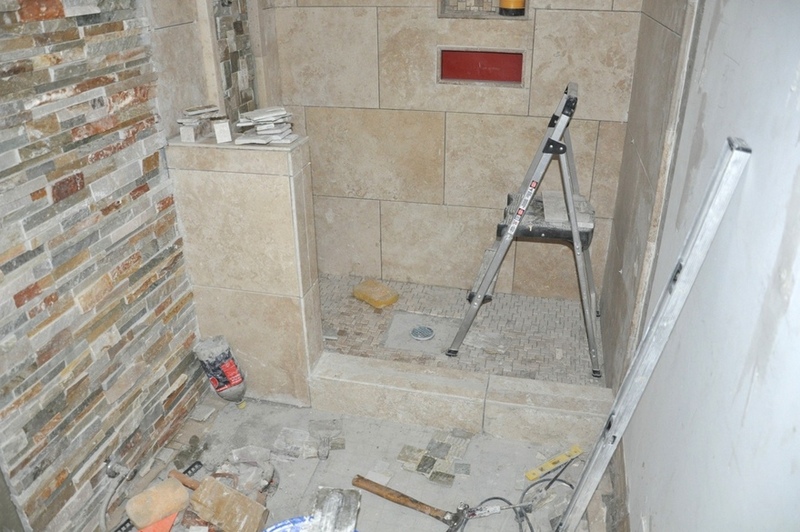 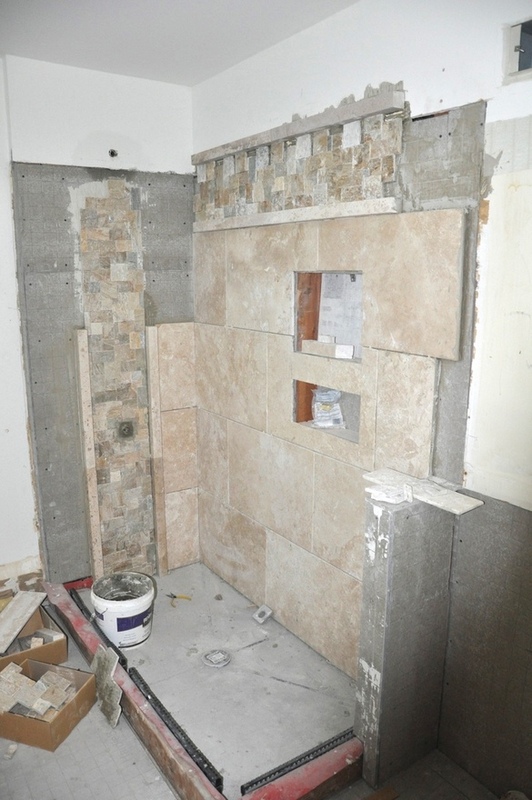 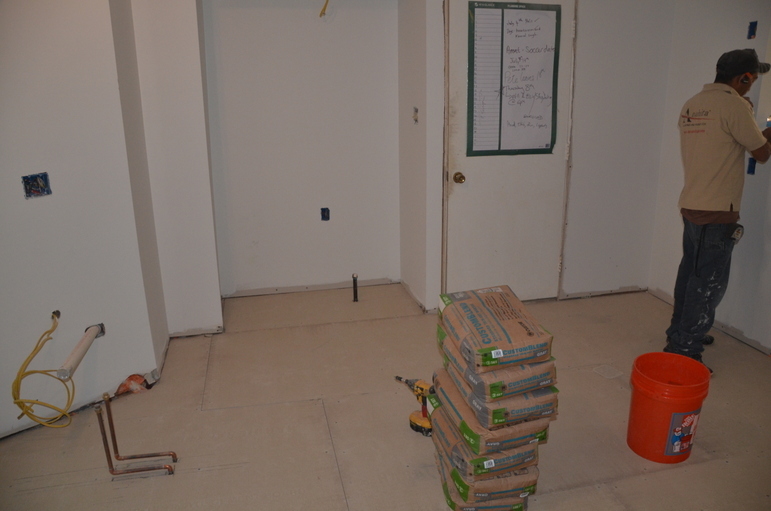 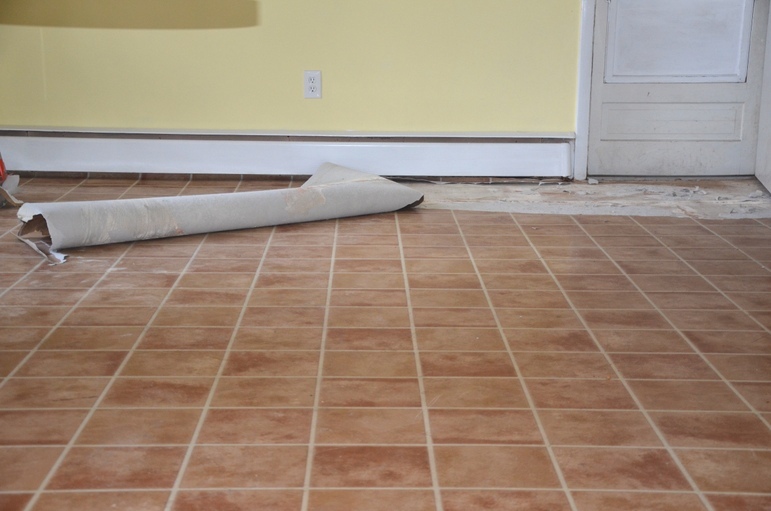 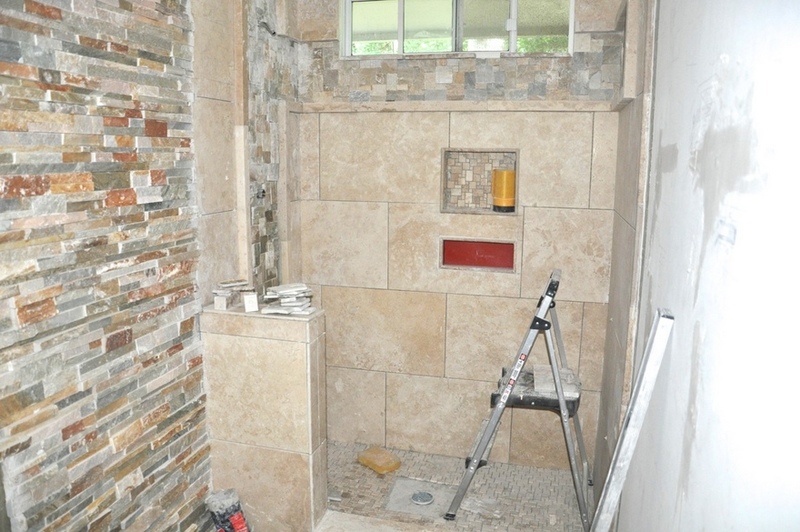 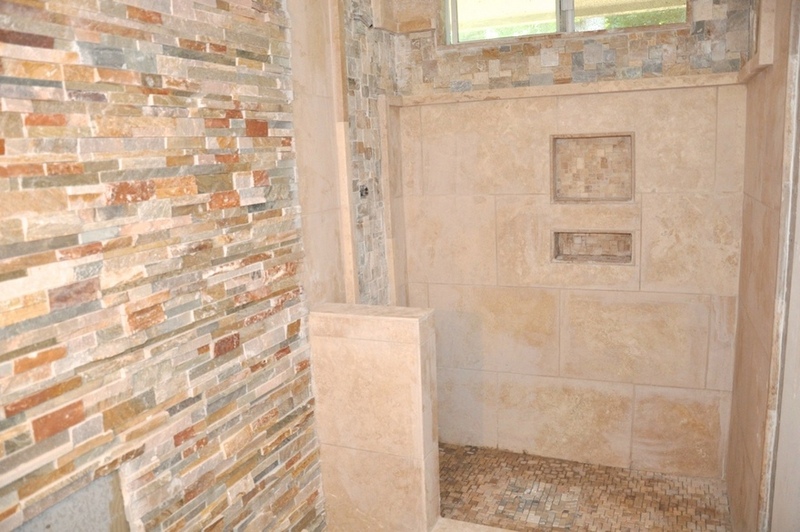 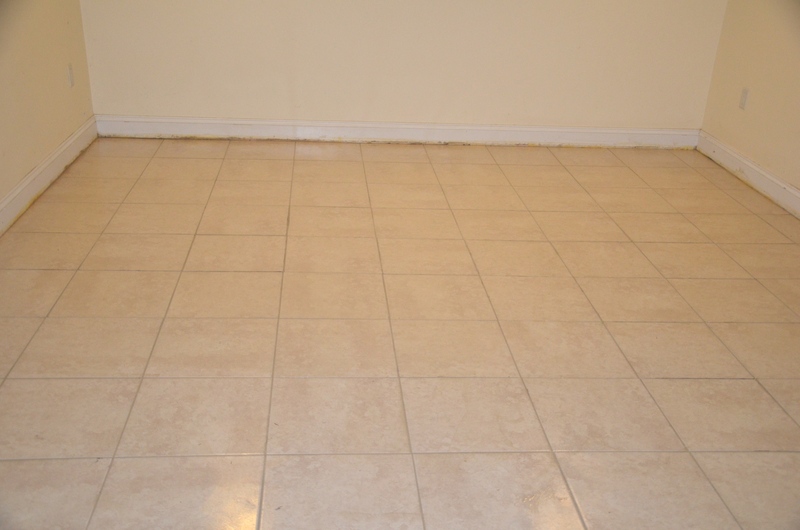 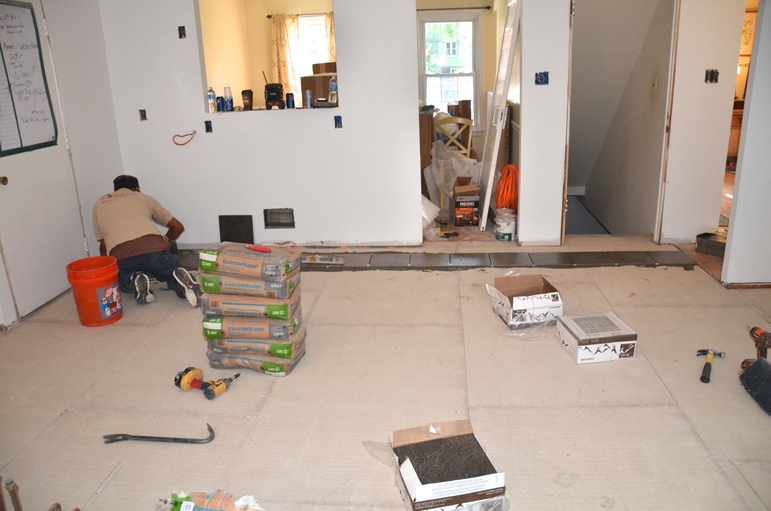 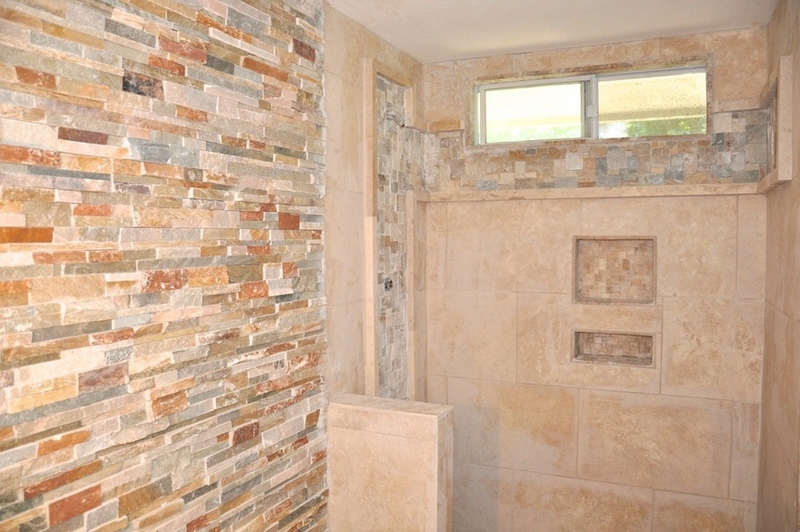 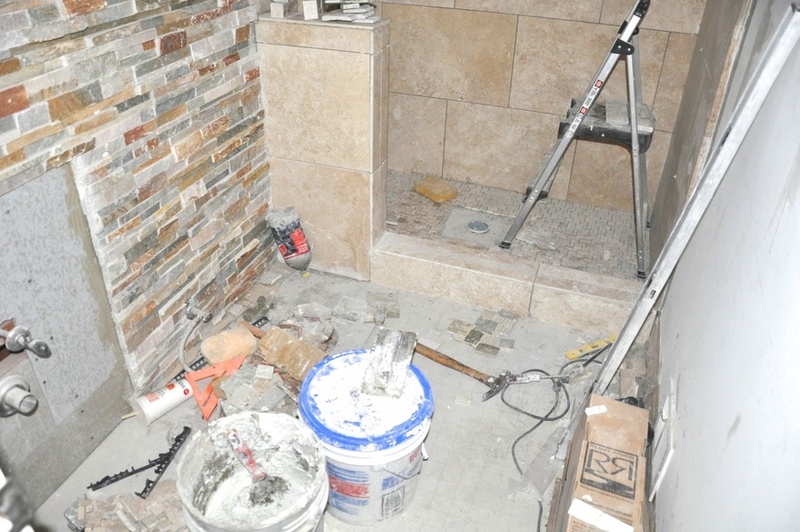 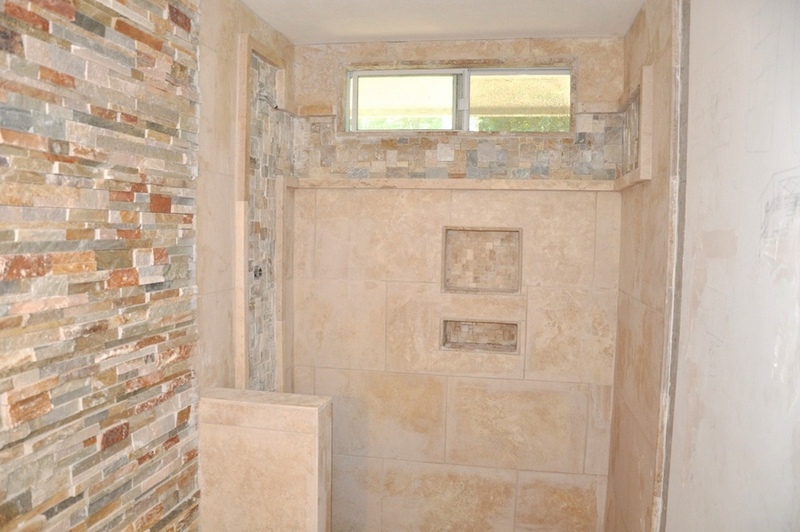 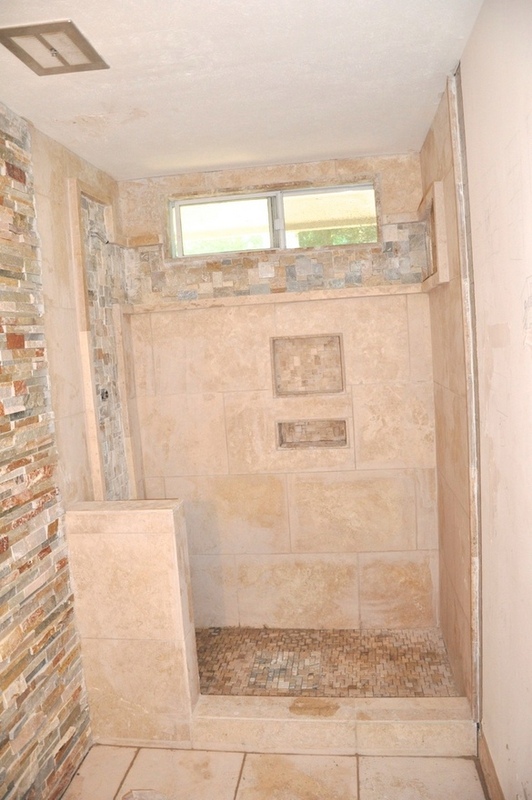 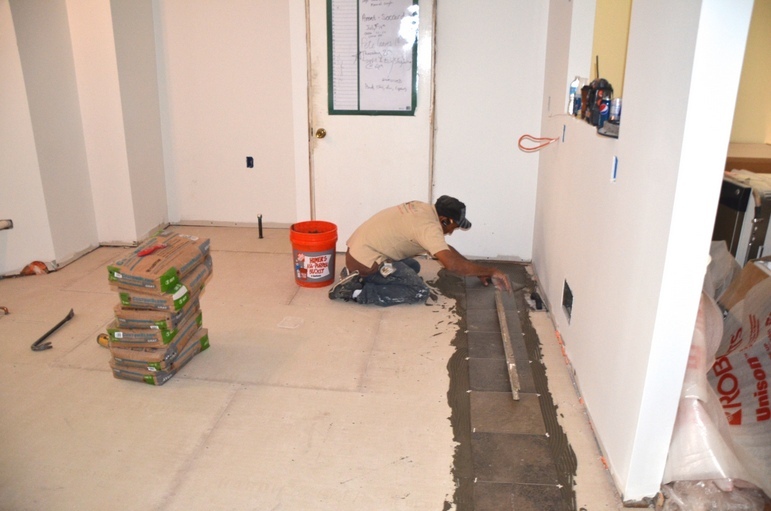 There are numerous advantages to laminate tile flooring. 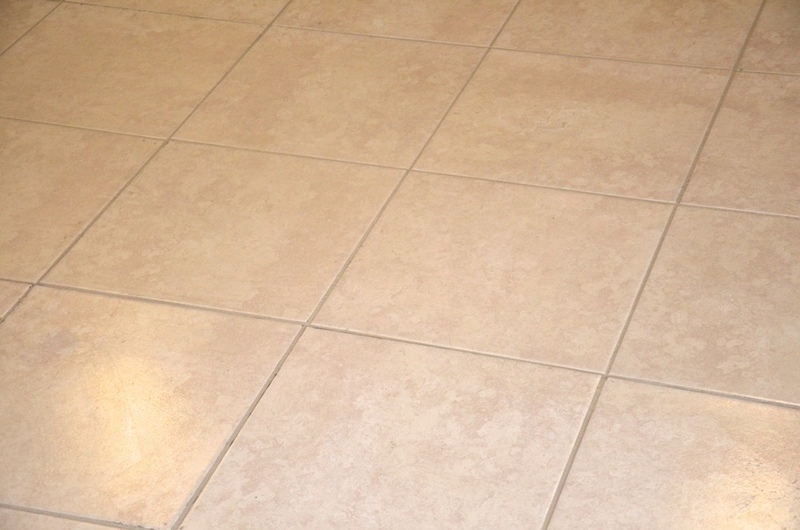 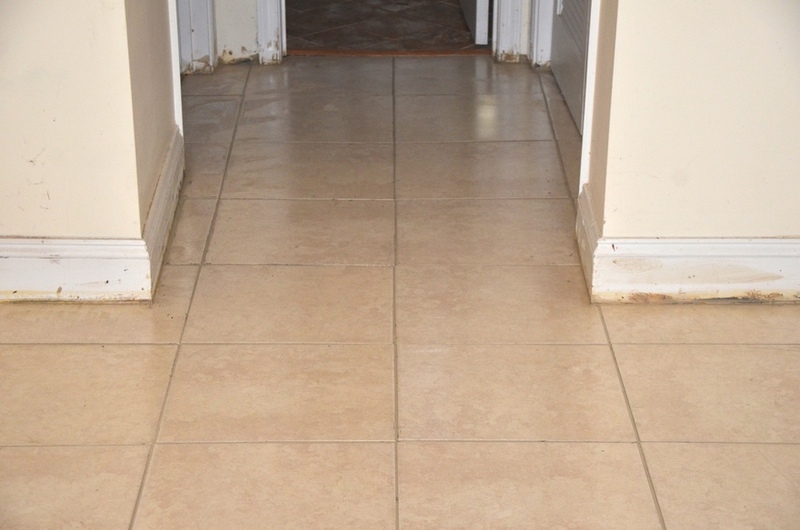 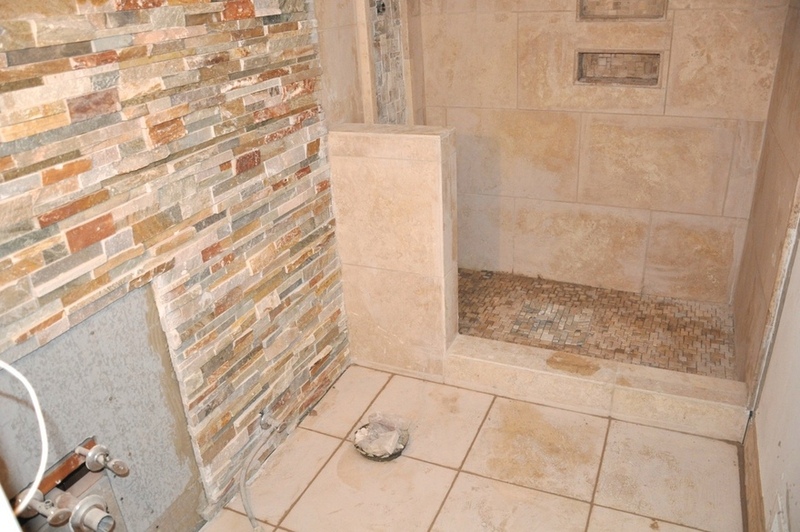 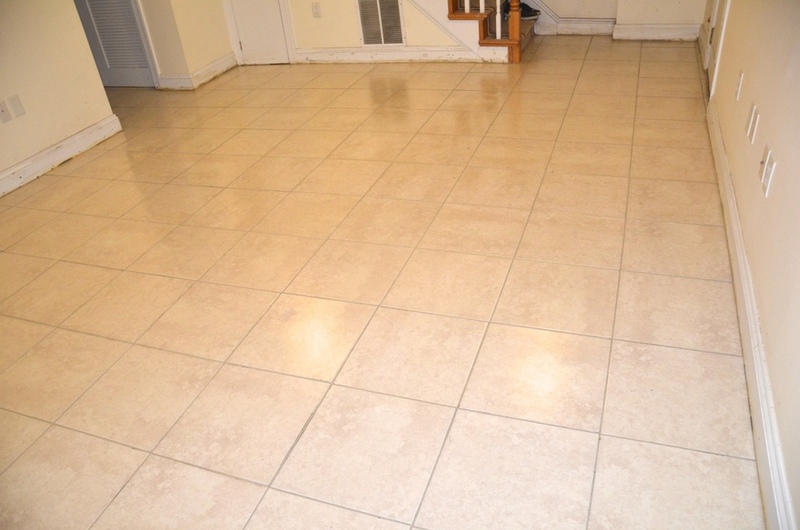 Laminate tile floors can give you a very authentic ceramic or stone tile appearance without the hassle of having to clean soiled grout joints. 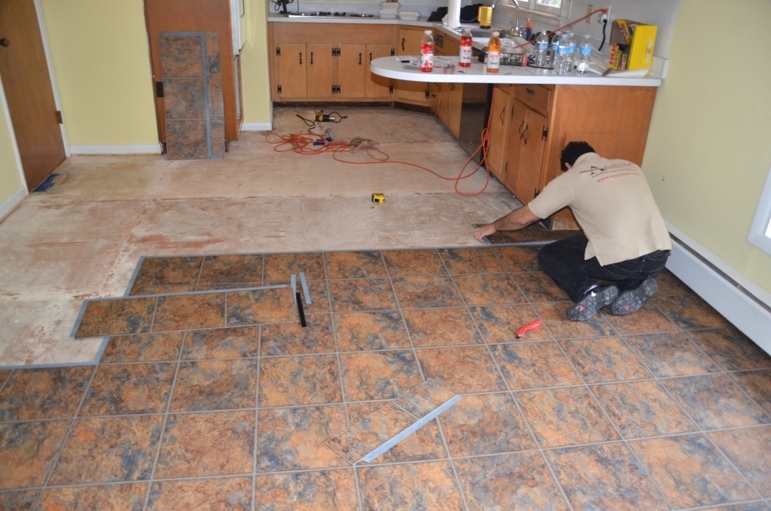 Also, because of the floating installation method, laminate tile flooring can be installed at a substantially cost effective and in a shorter amount of time than ceramic or stone tile.